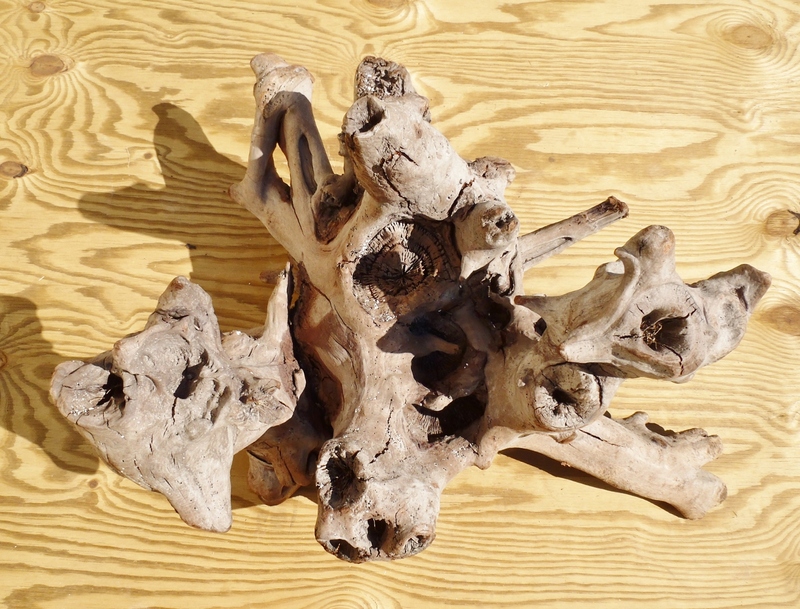 We have several New Large Pieces(PHOTO1). 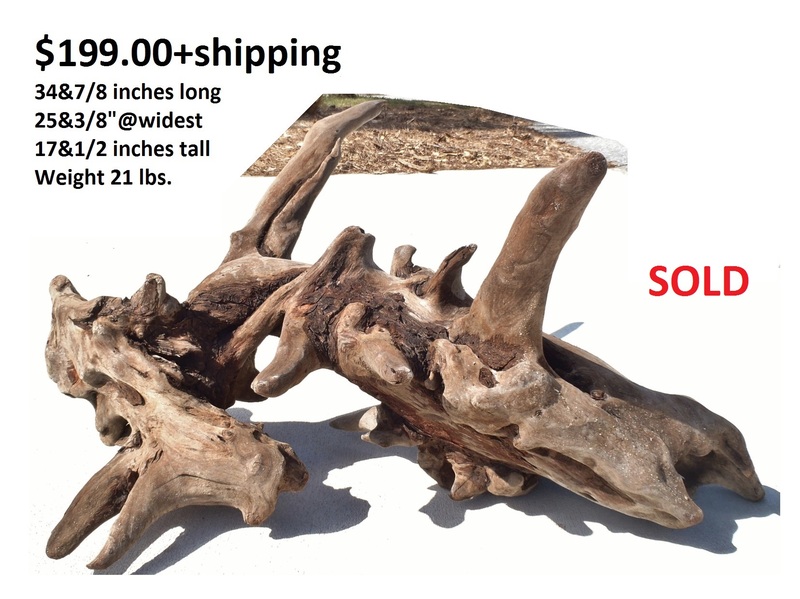 They are not yet listed below. 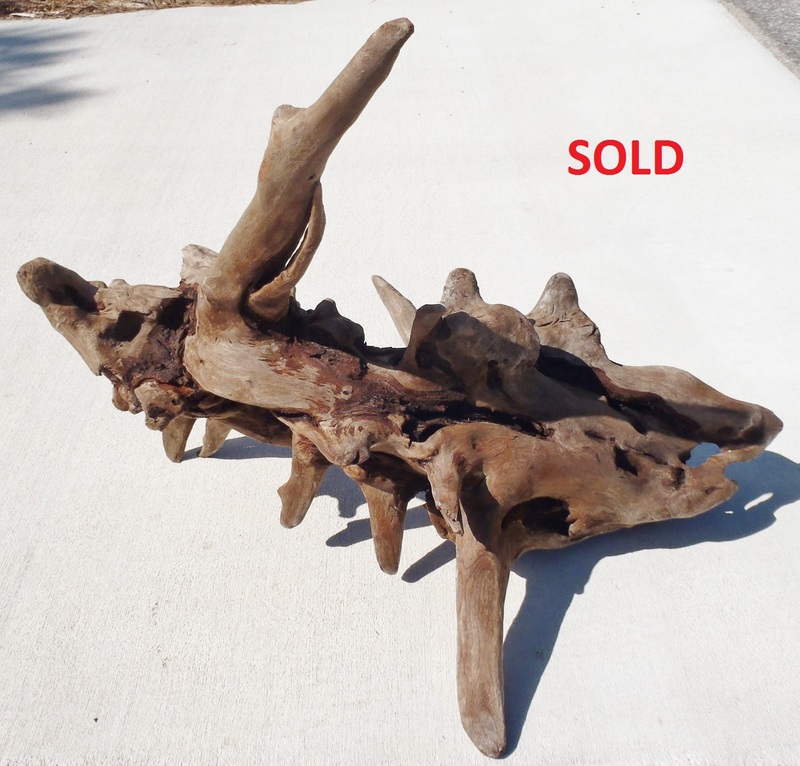 If you see one of these that you like, let us know and we can quickly get you dimensions and pricing. 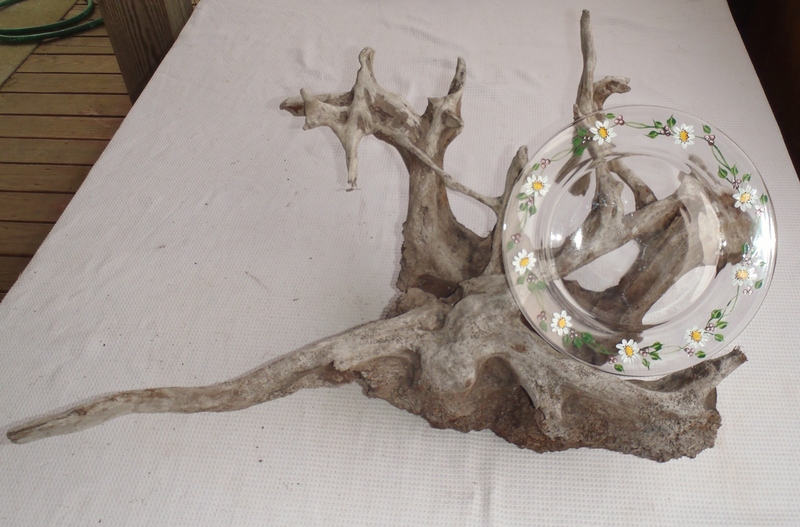 A really pretty decorative piece. 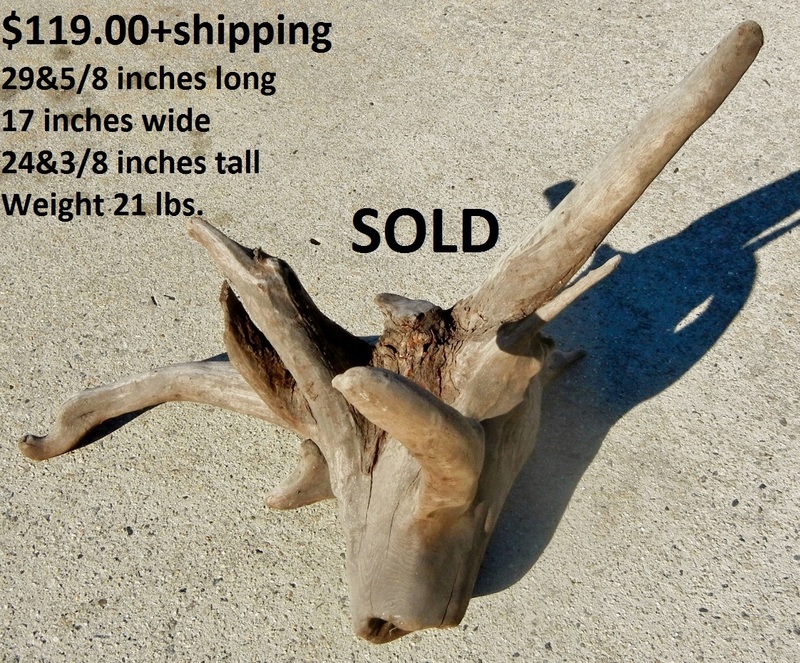 Approximate Dimensions: 33&1/8 inches long - 14&5/8 inches at widest - 26&3/8 inches tall - Weight 18&1/2 lbs. 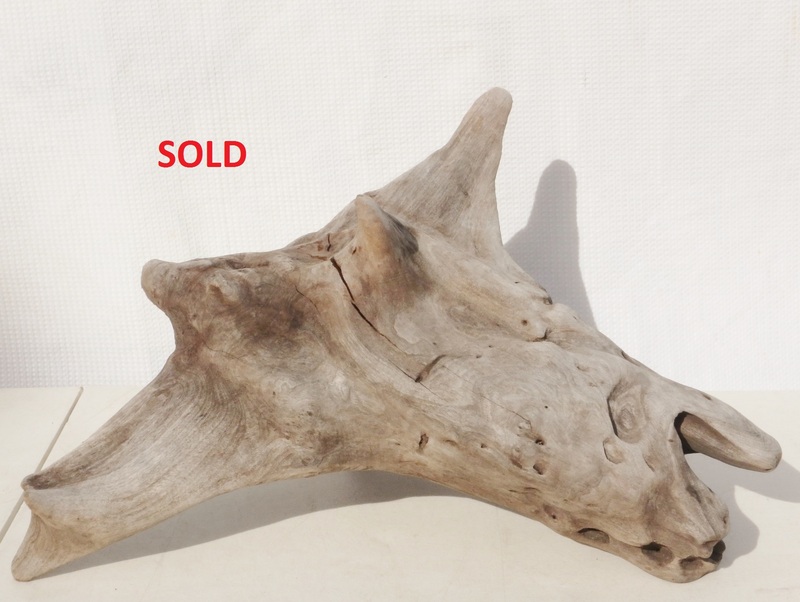 Uses: Decorative Piece. 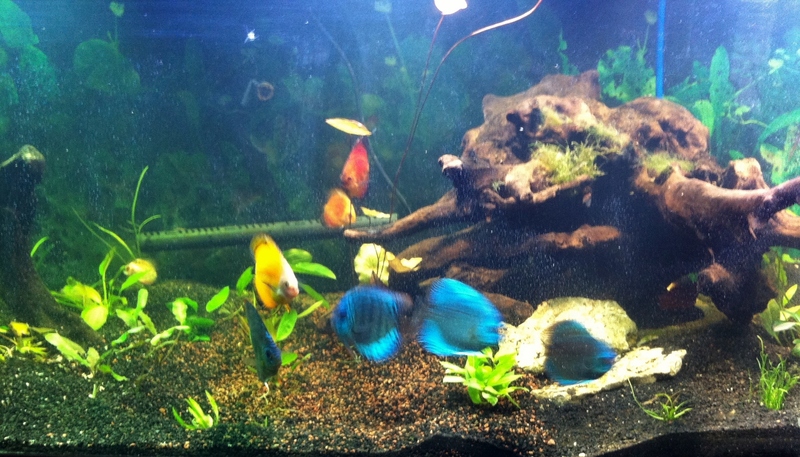 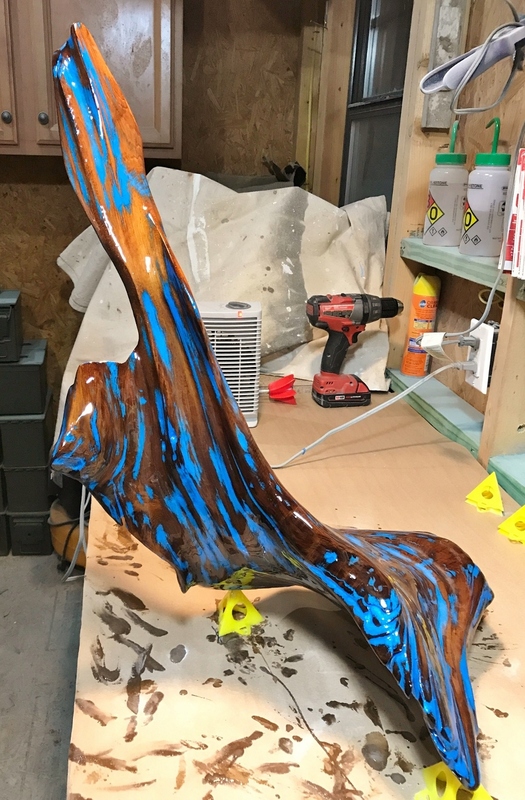 Aquarium/Terrarium Piece. 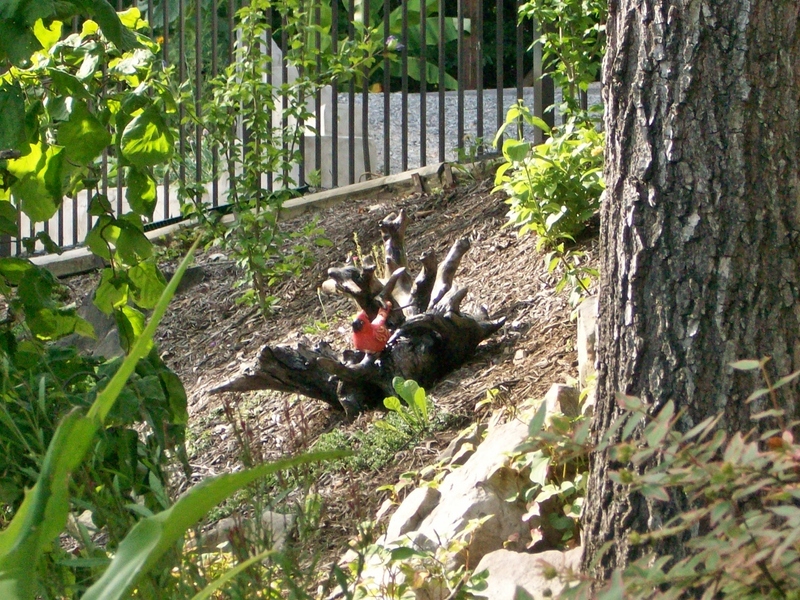 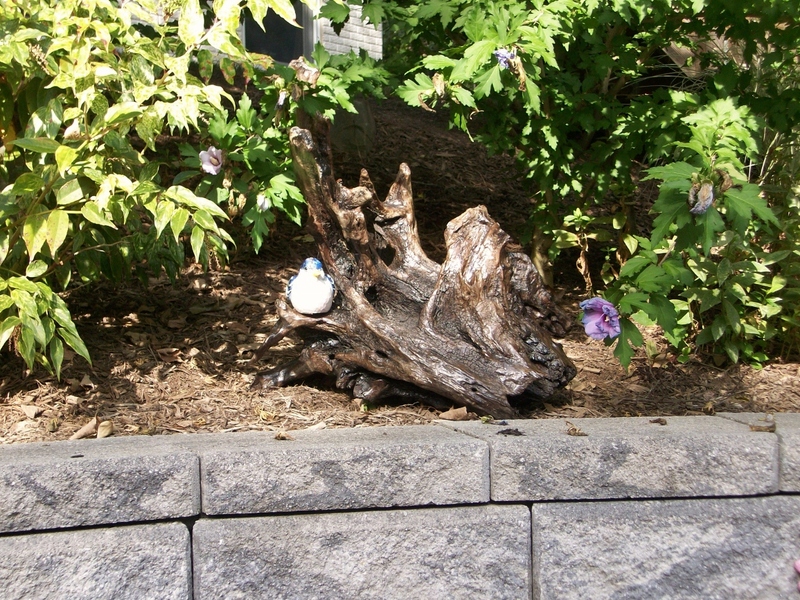 Landscaping Piece. 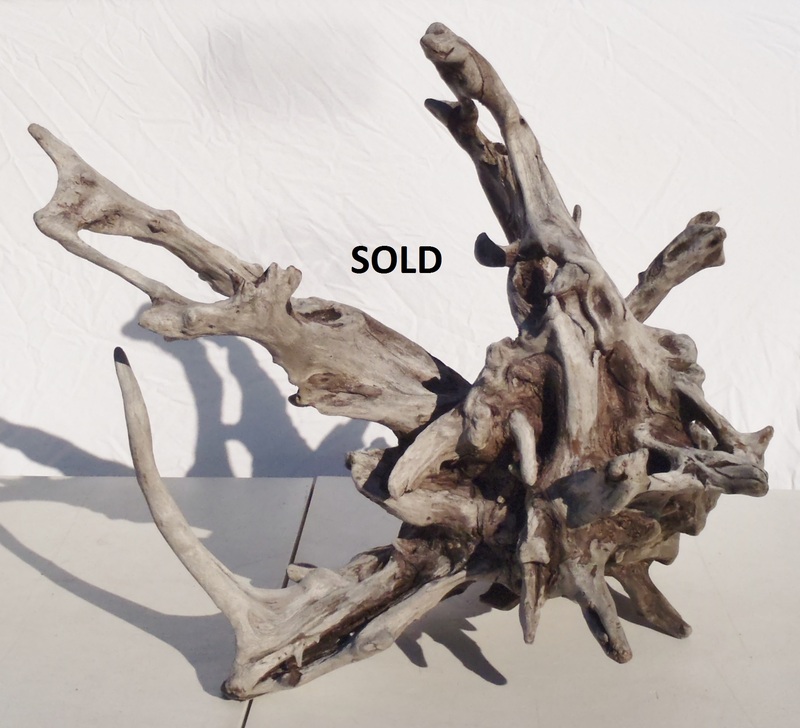 Taxidermy Piece. 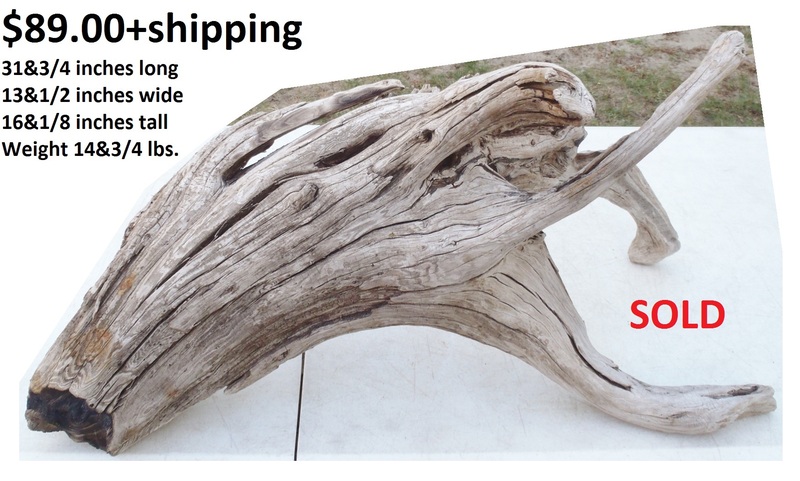 Payment: Credit card orders are processed through Pay Pal. 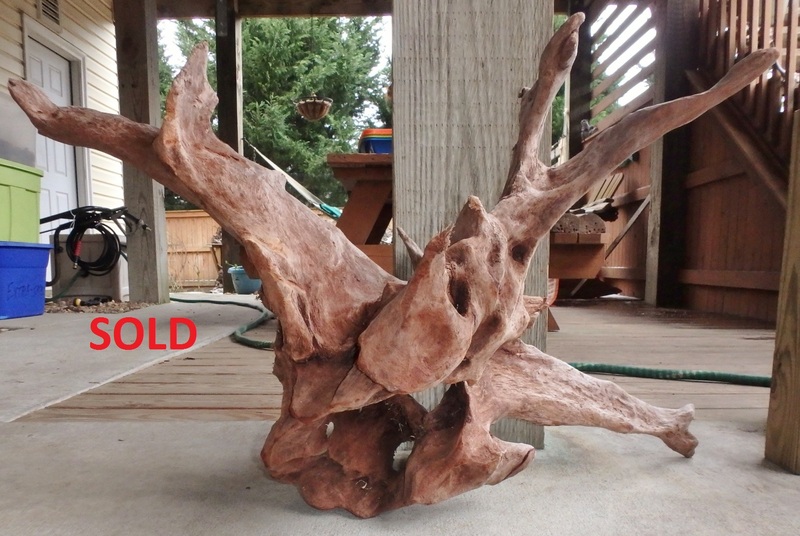 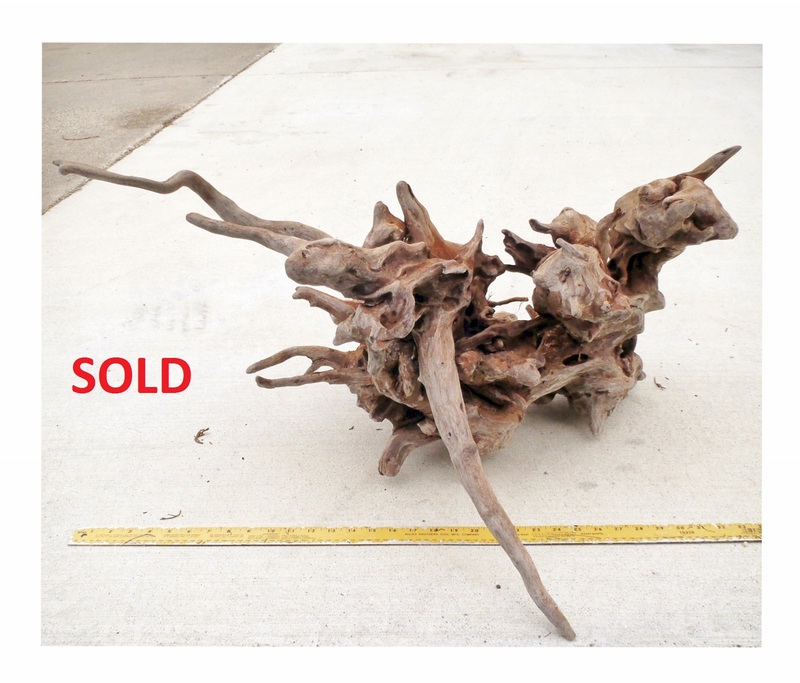 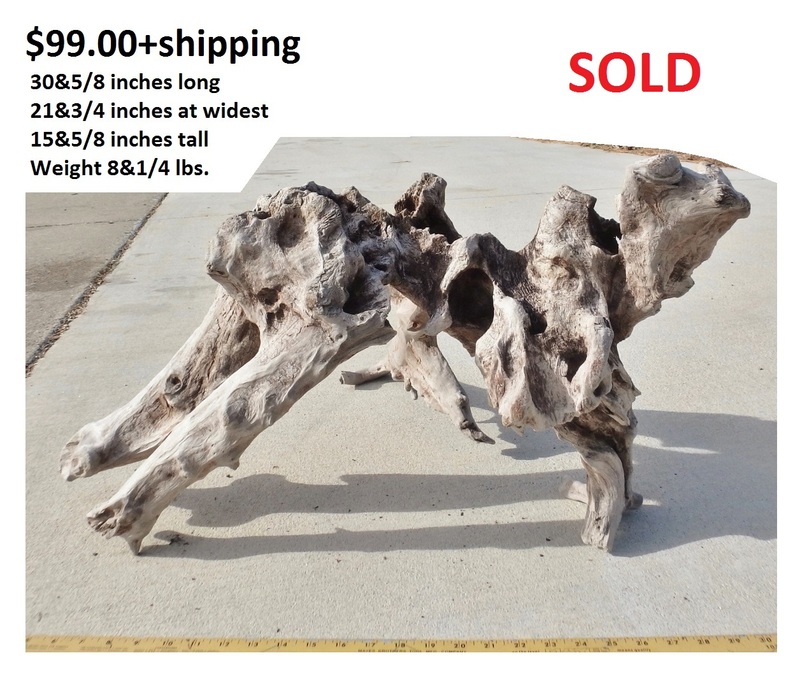 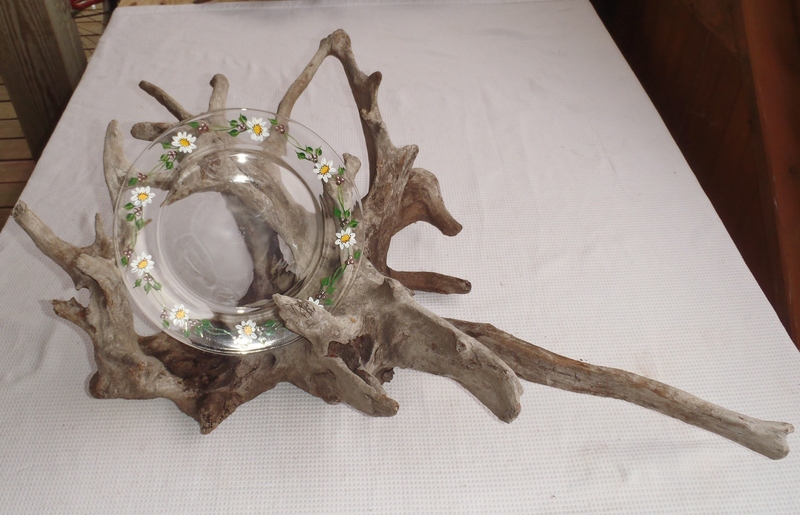 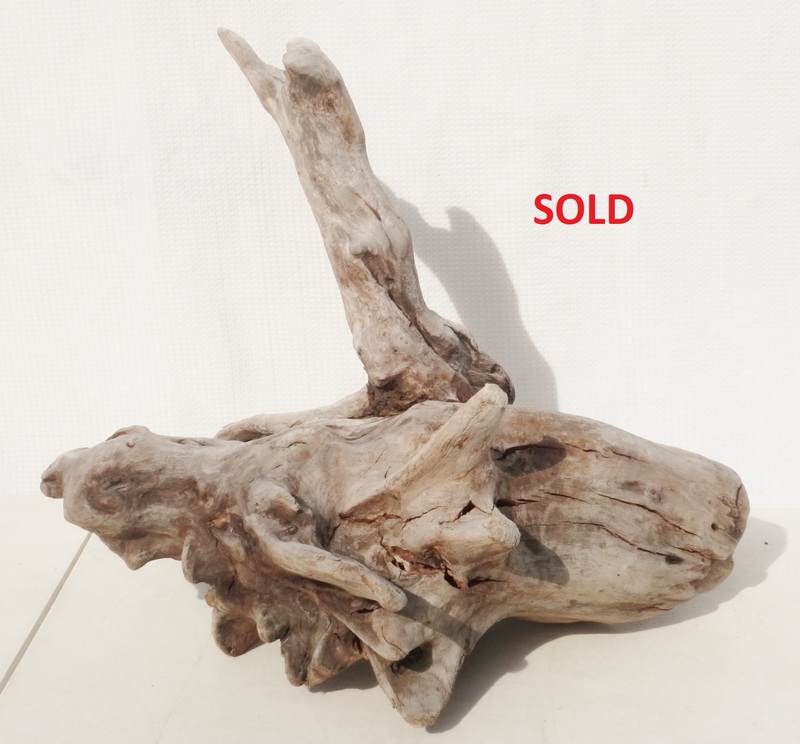 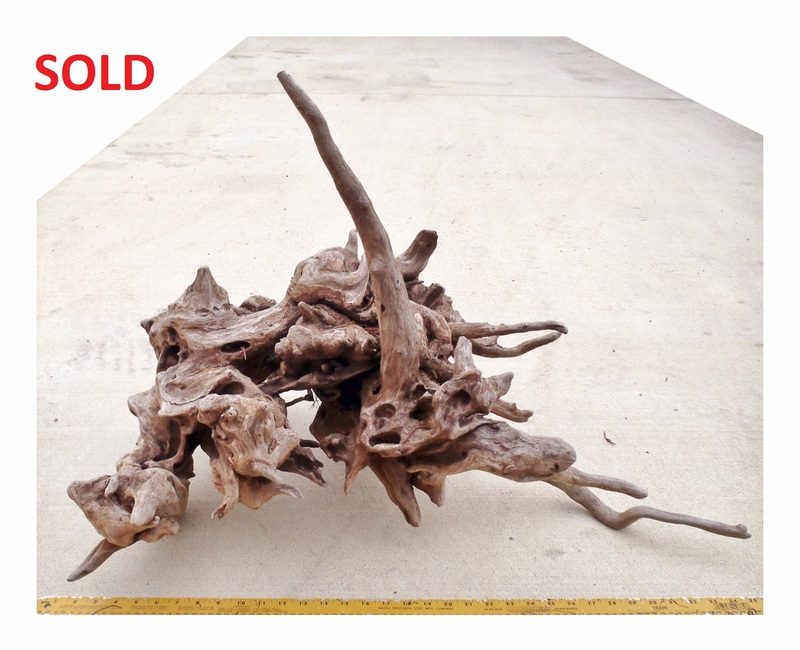 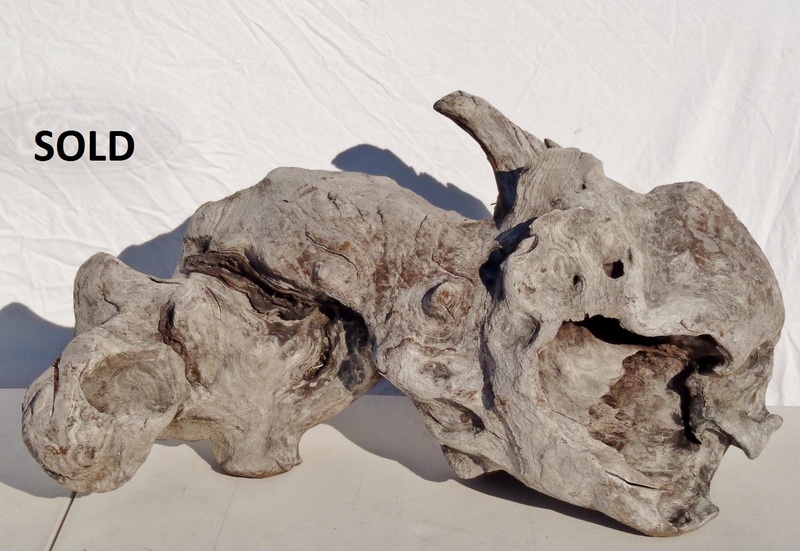 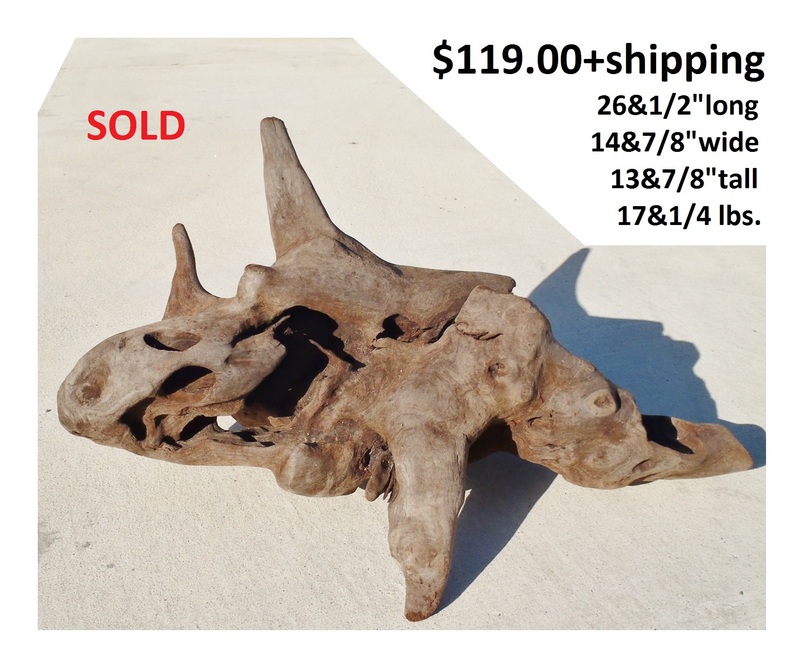 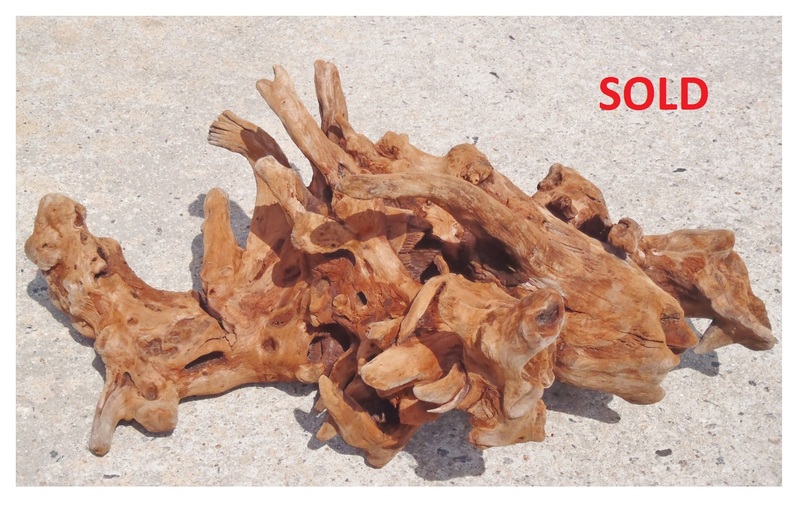 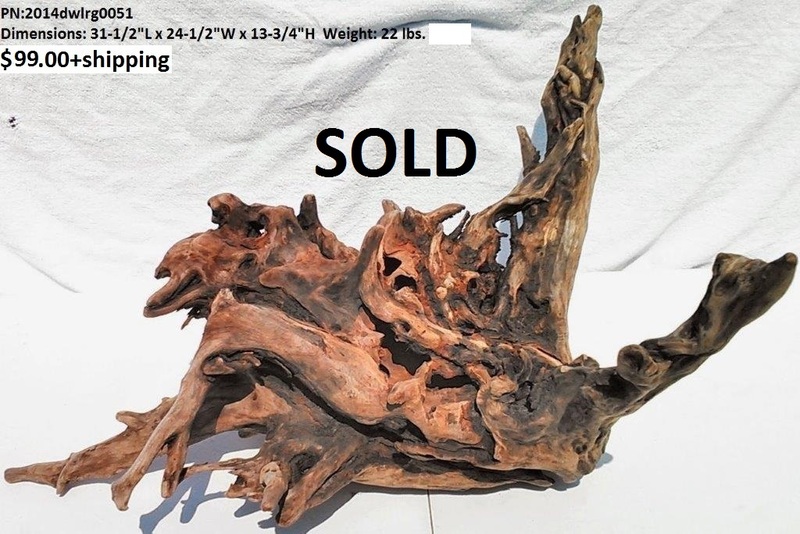 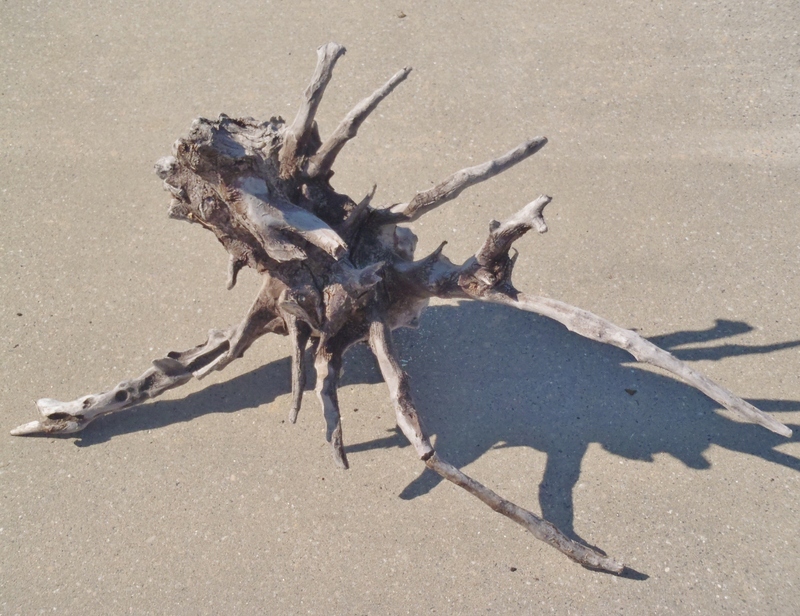 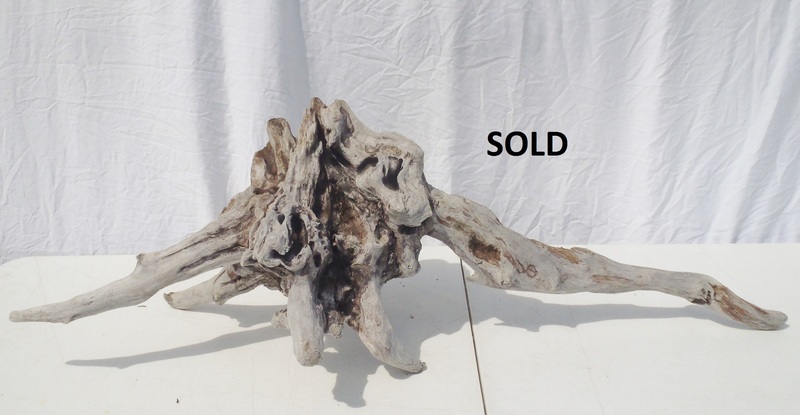 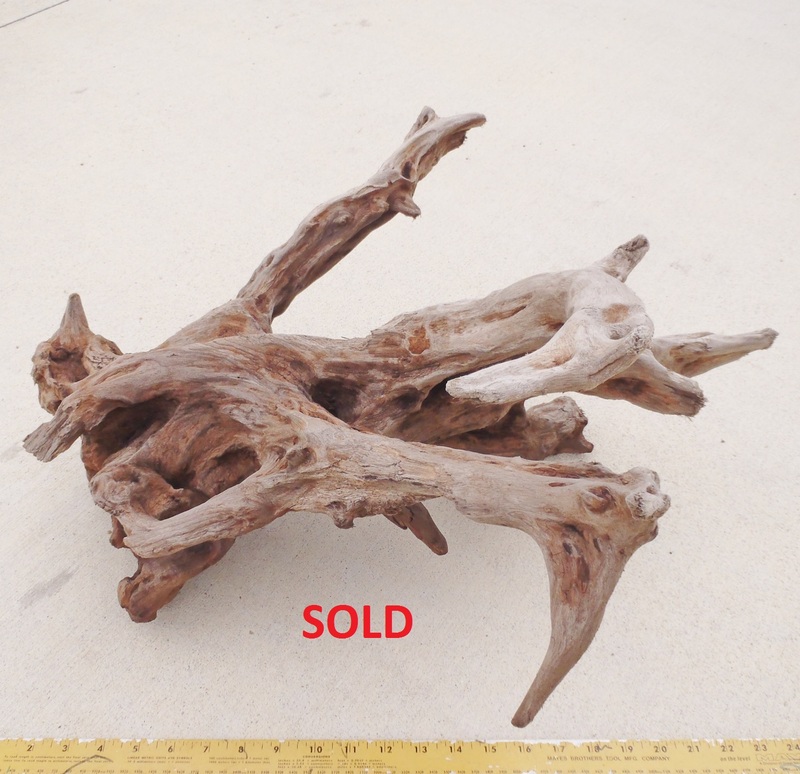 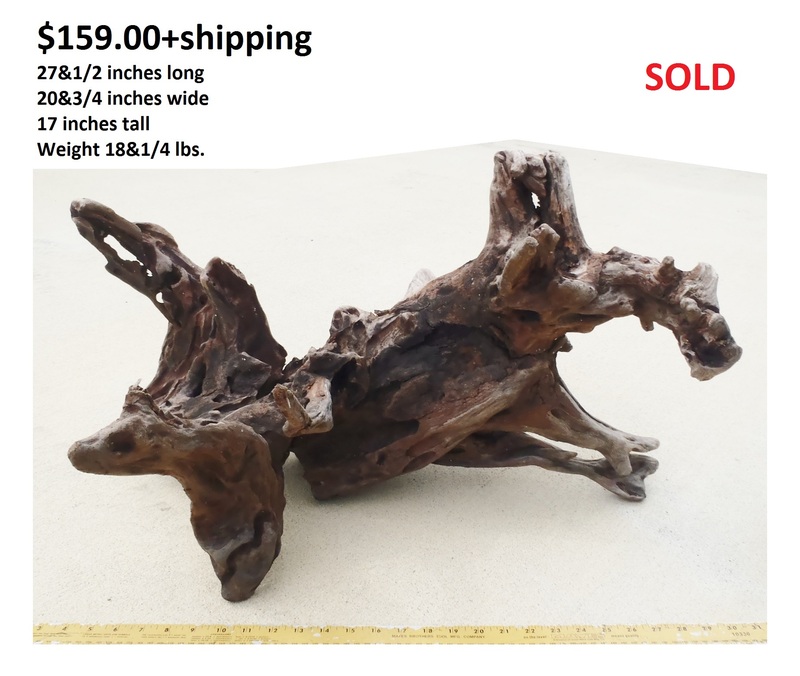 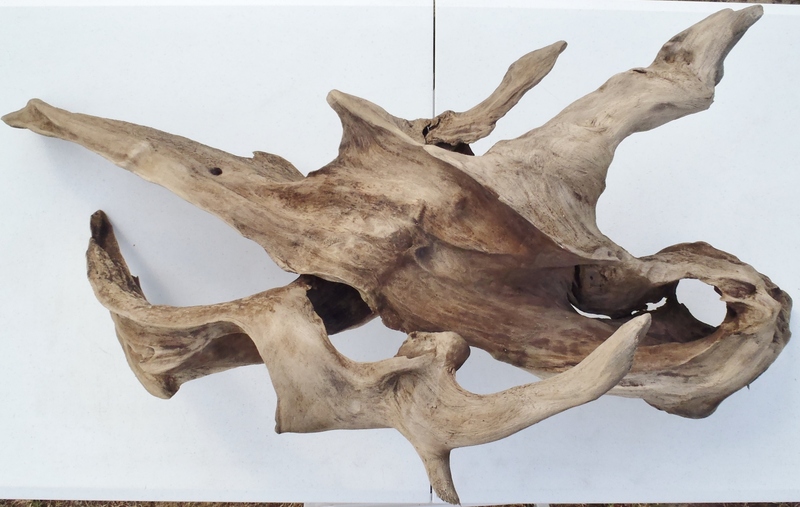 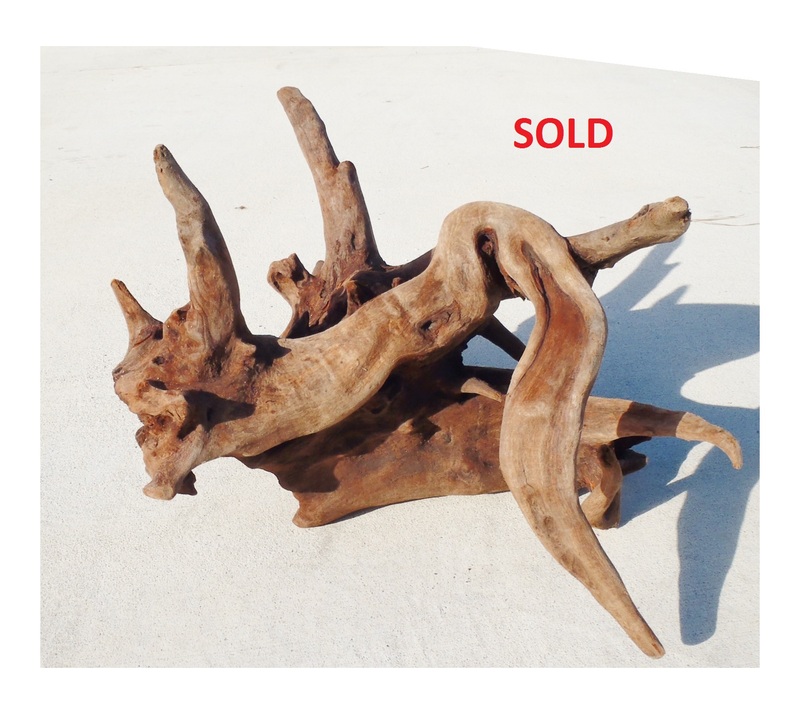 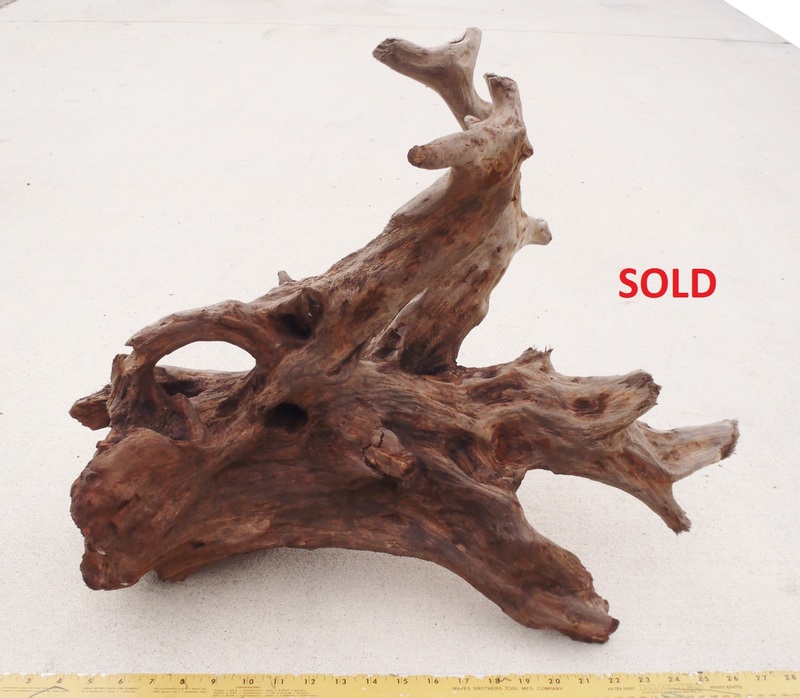 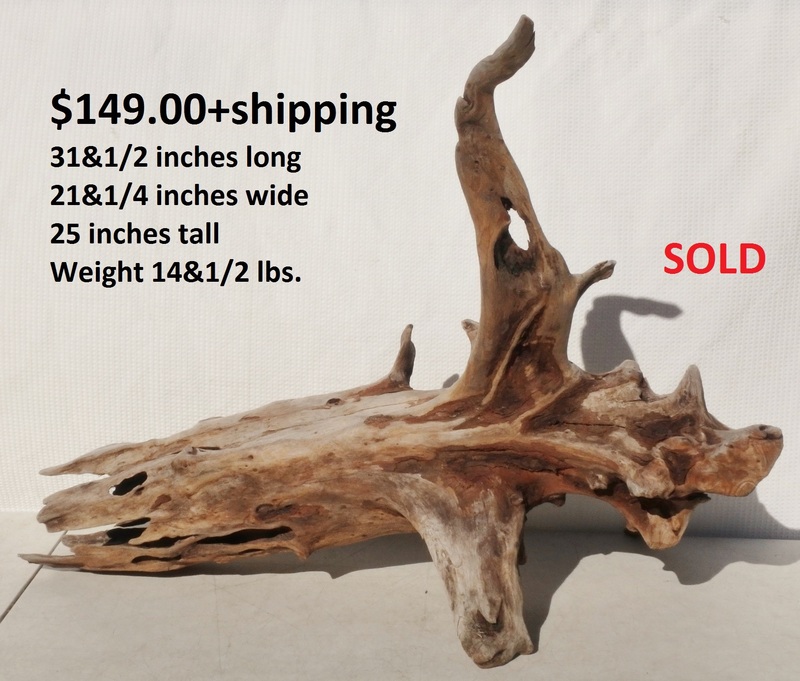 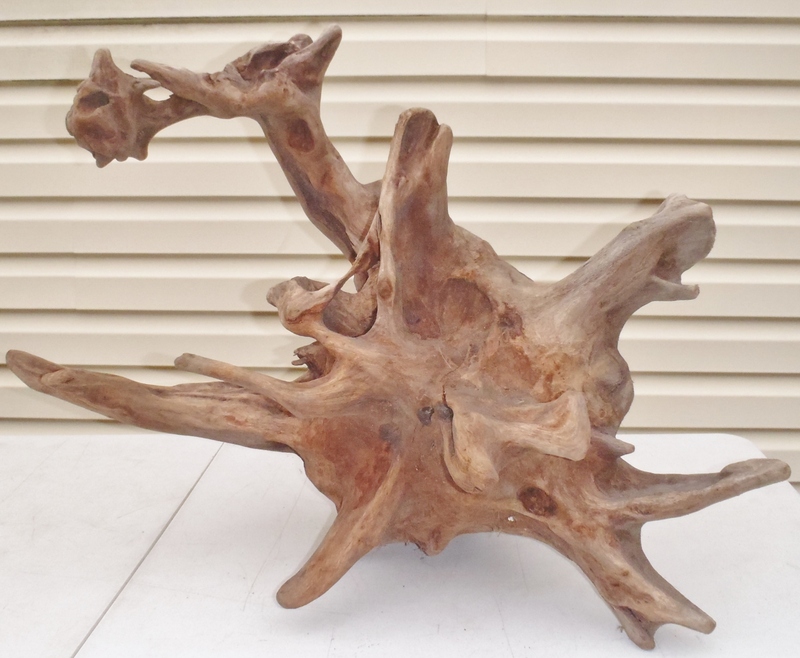 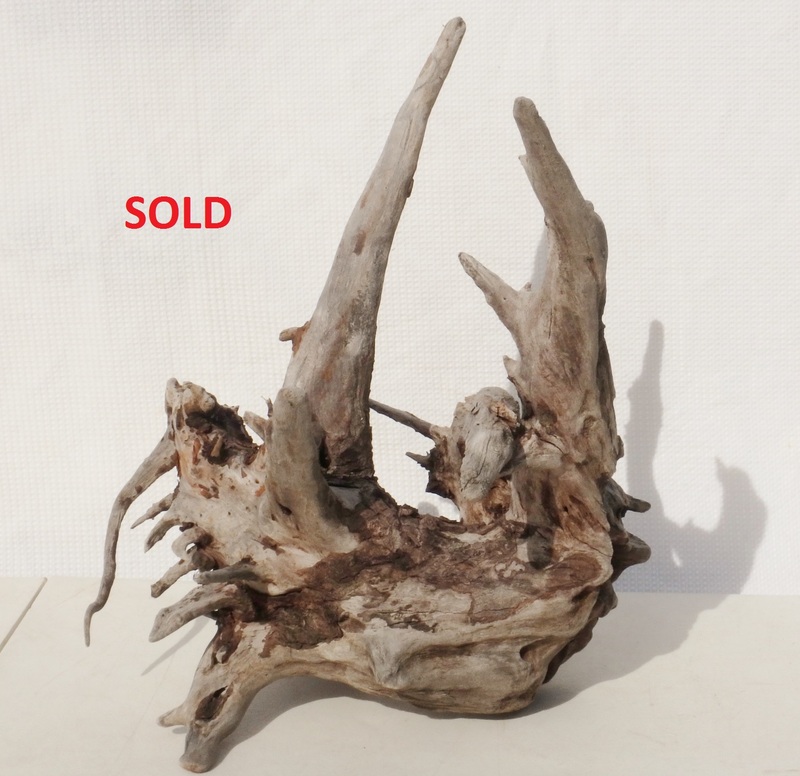 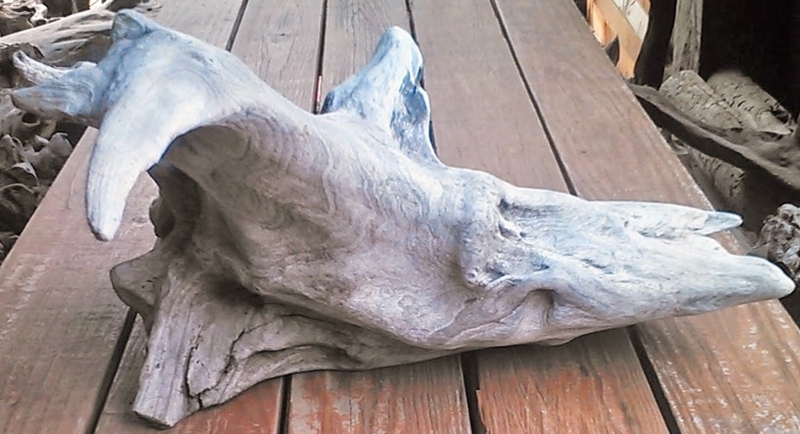 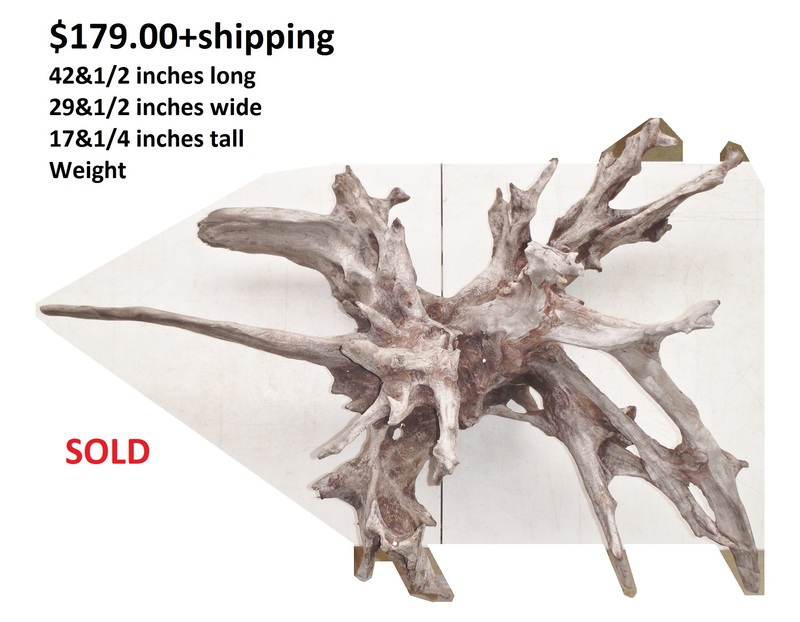 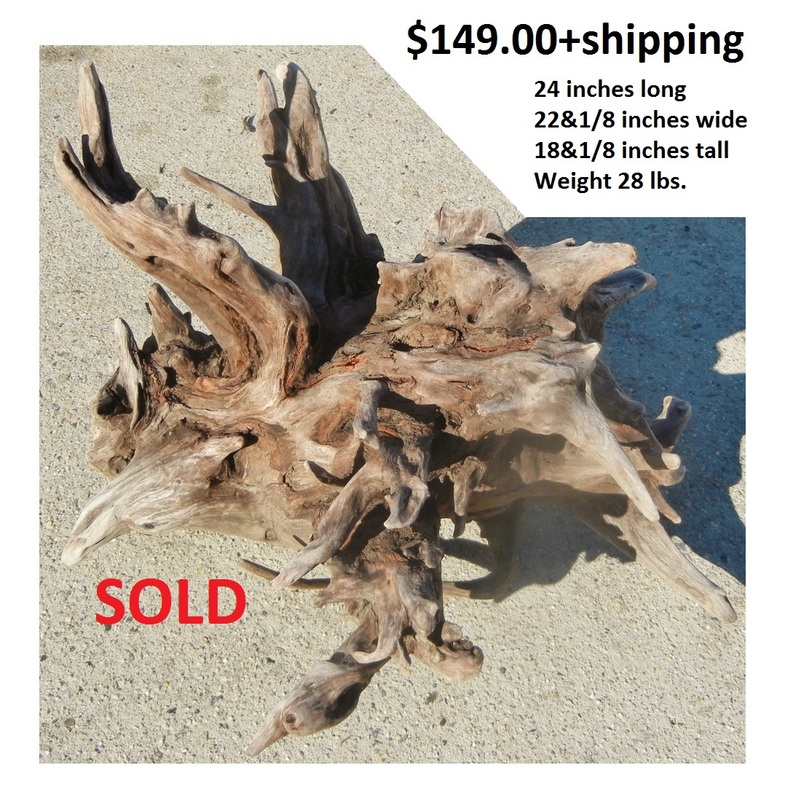 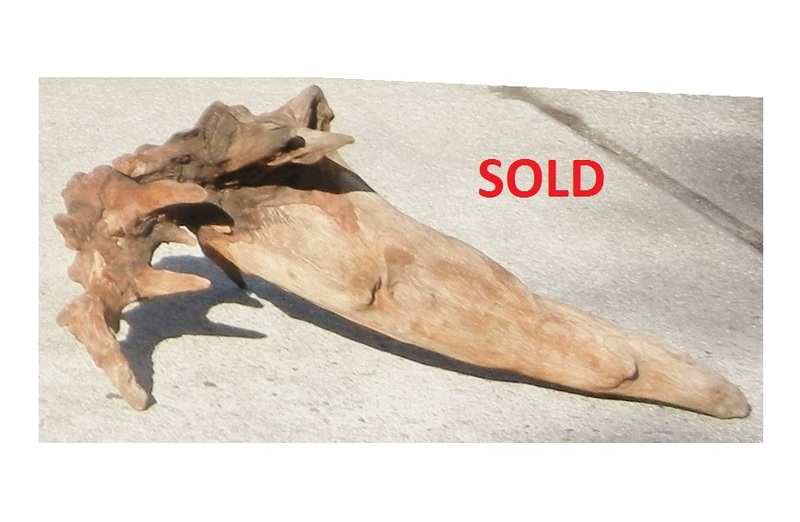 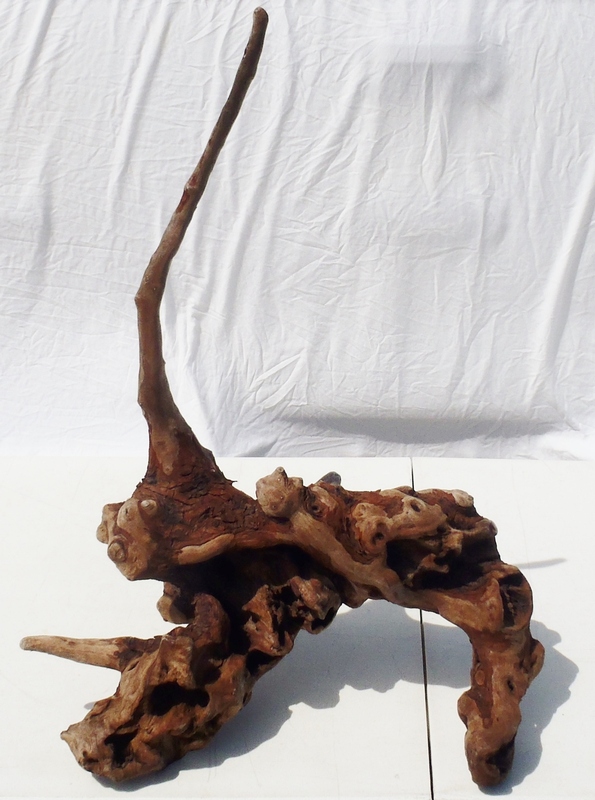 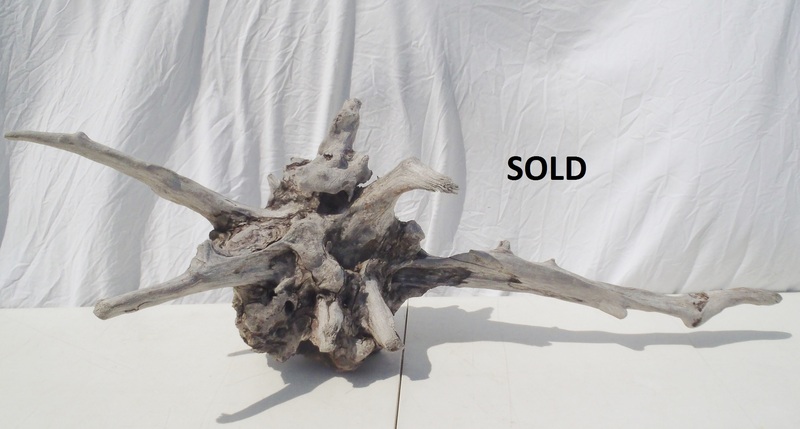 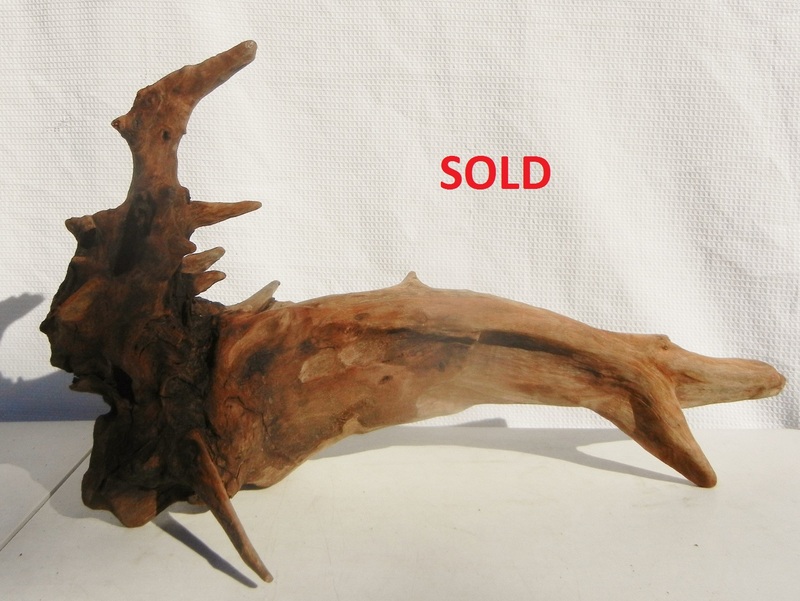 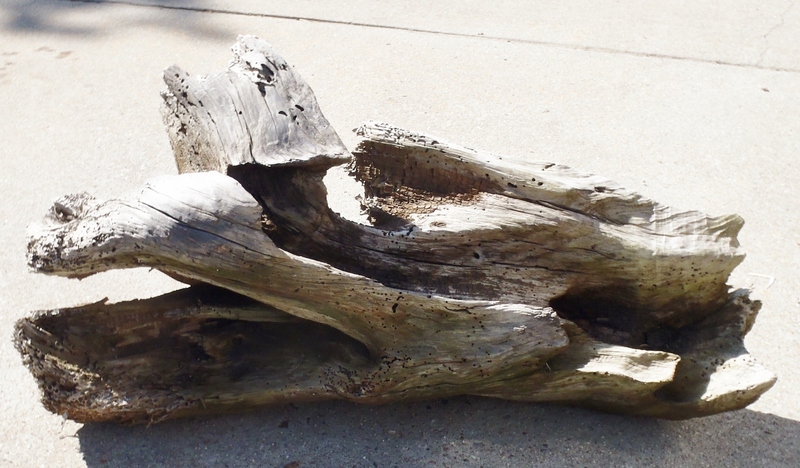 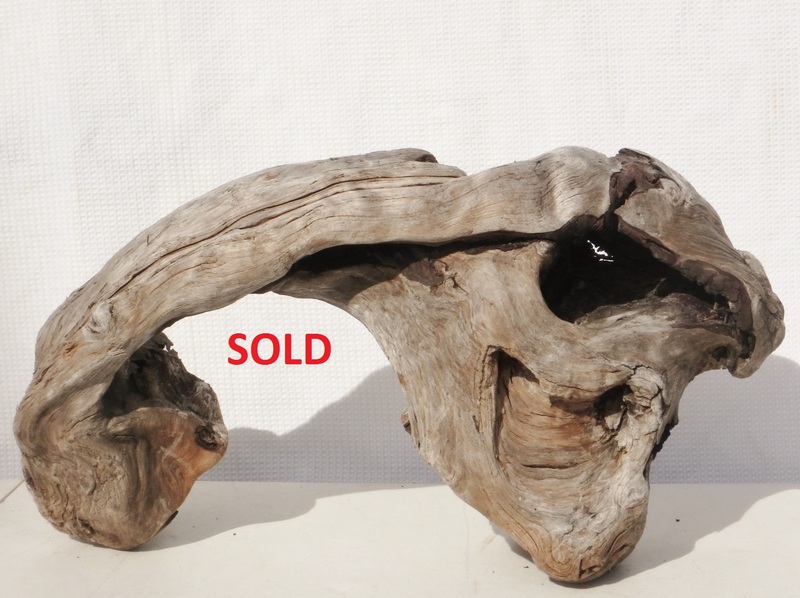 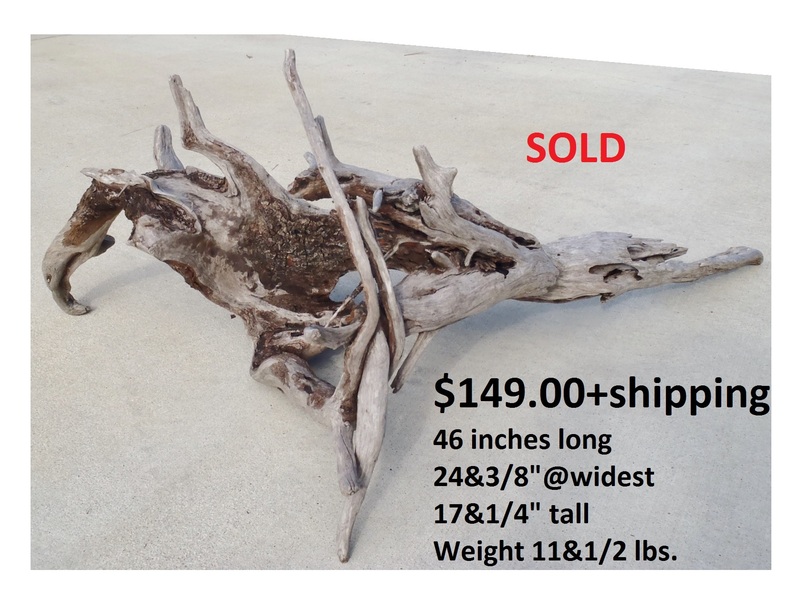 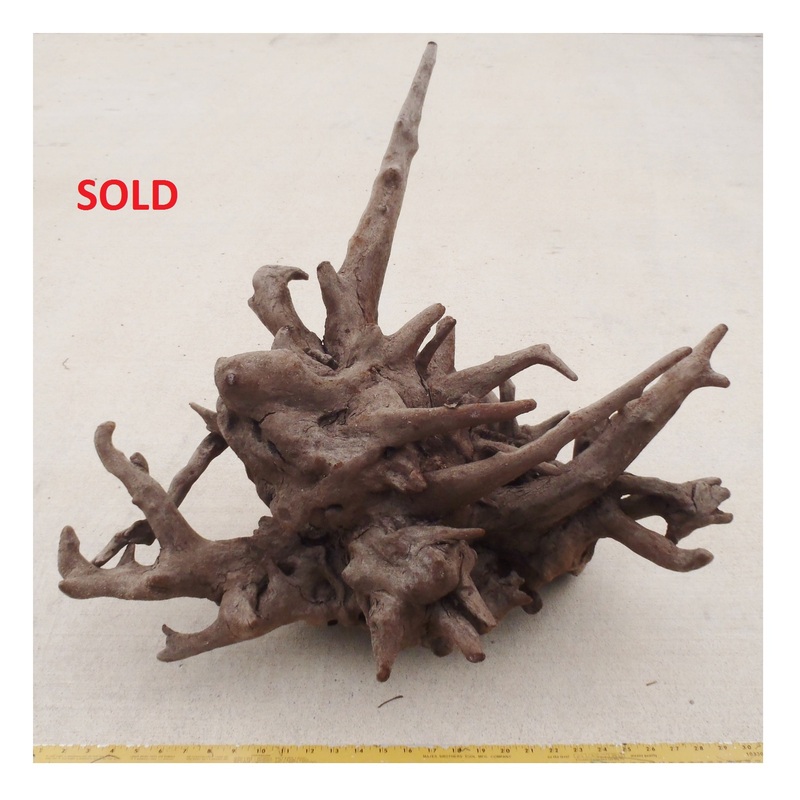 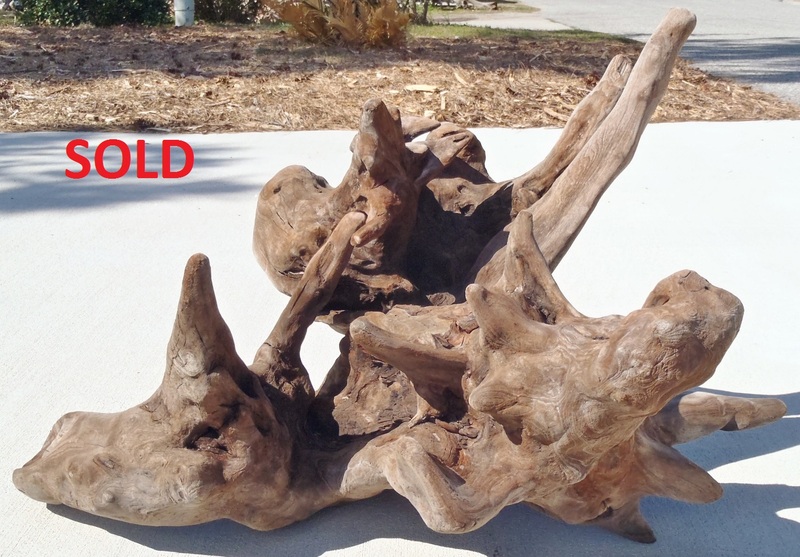 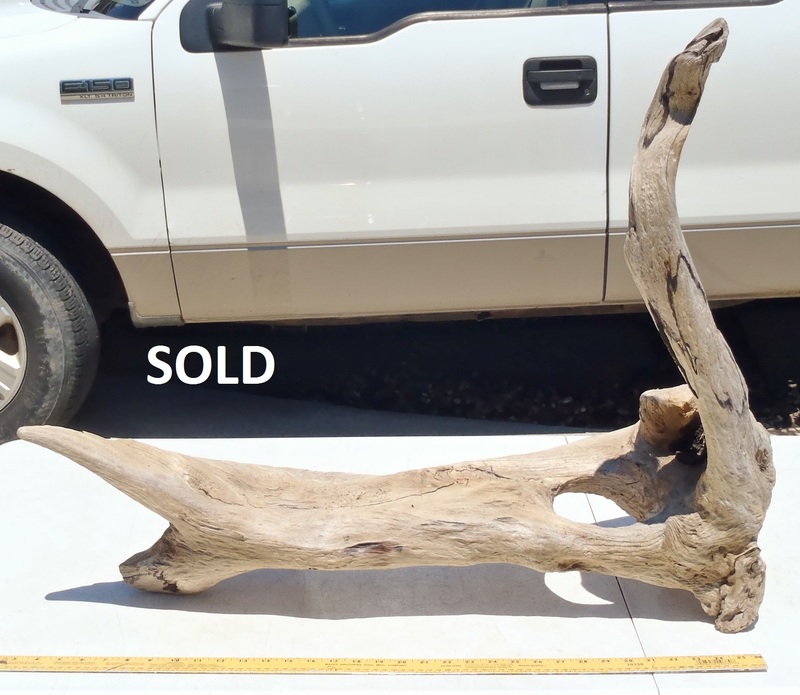 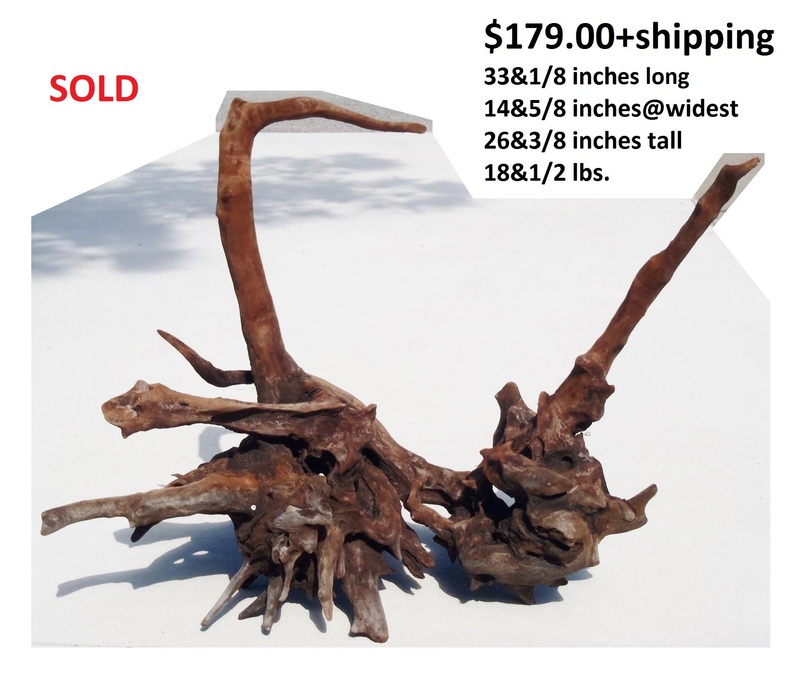 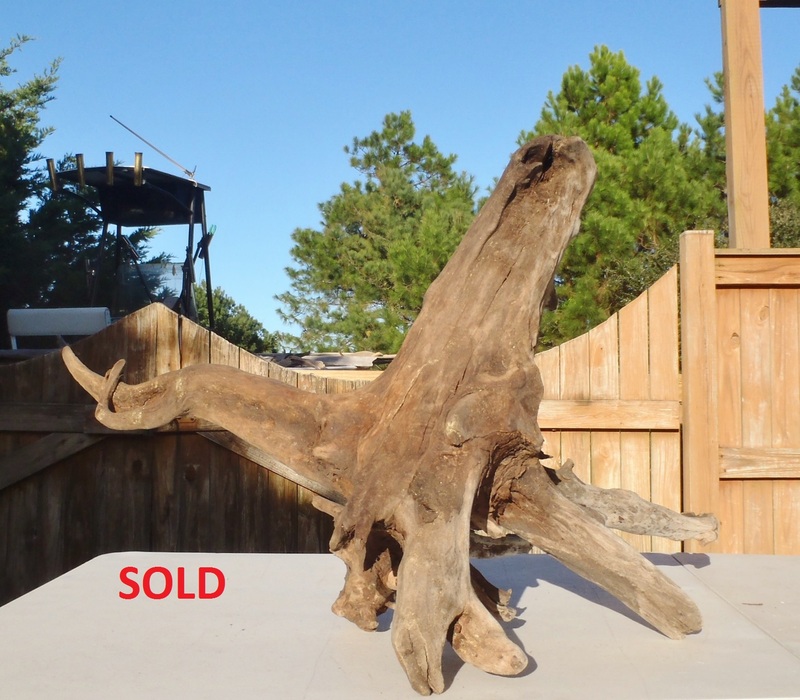 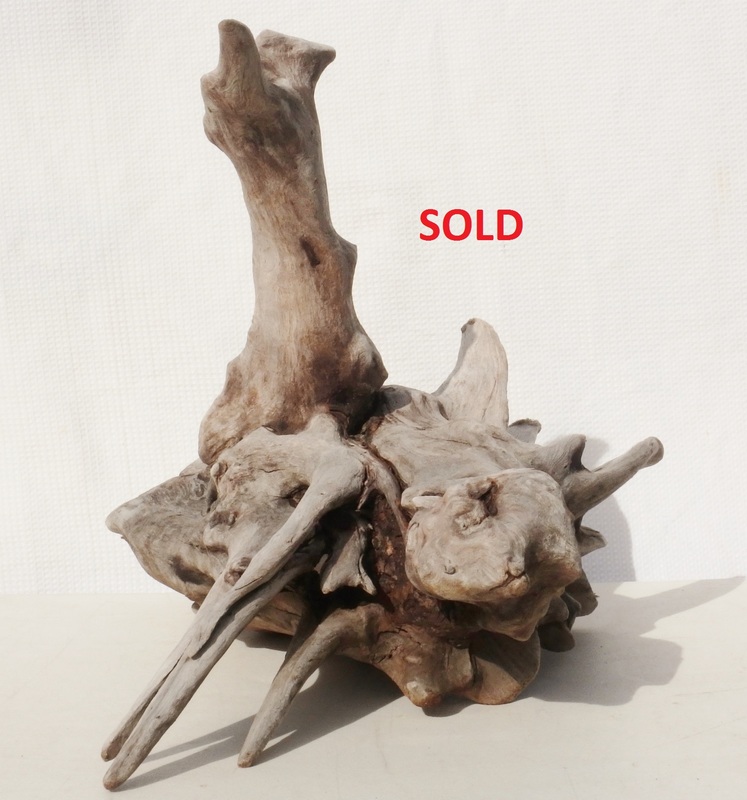 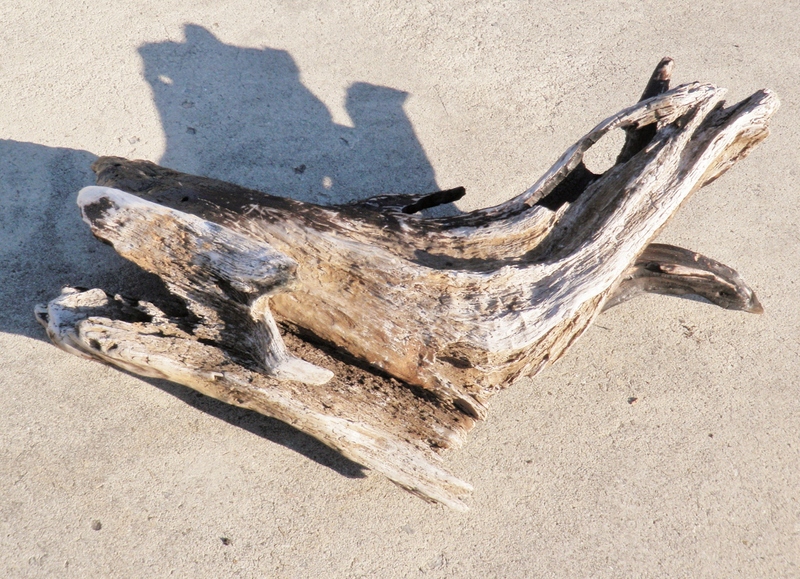 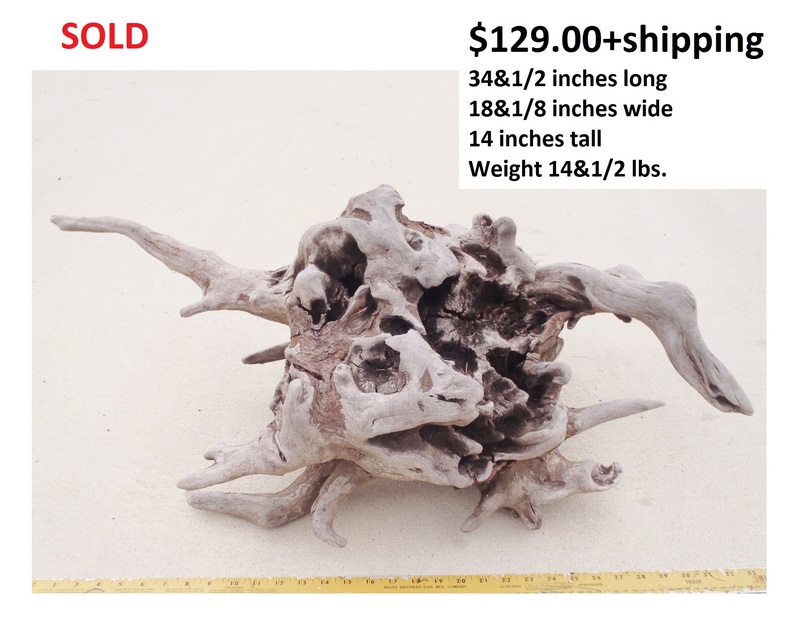 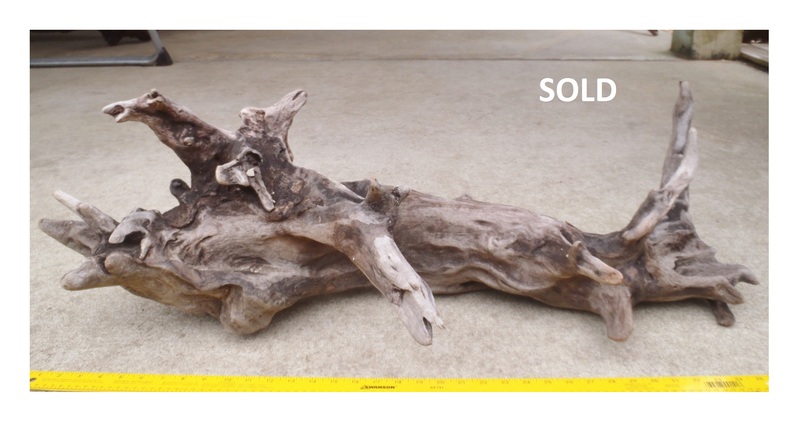 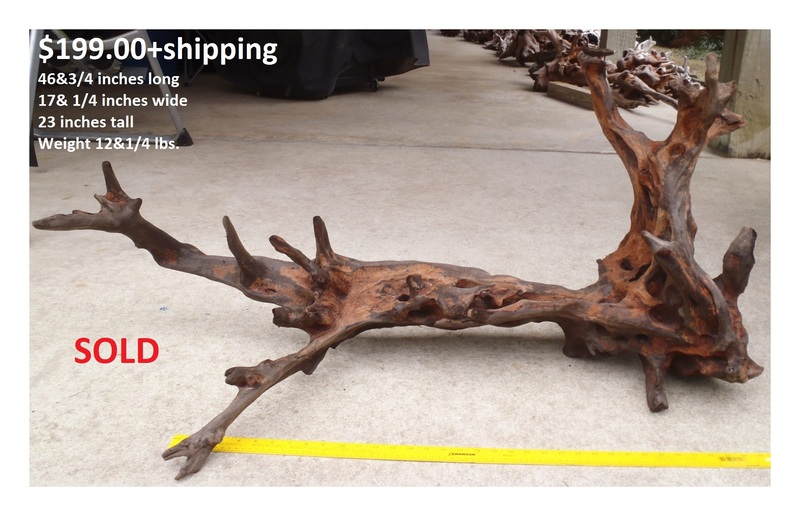 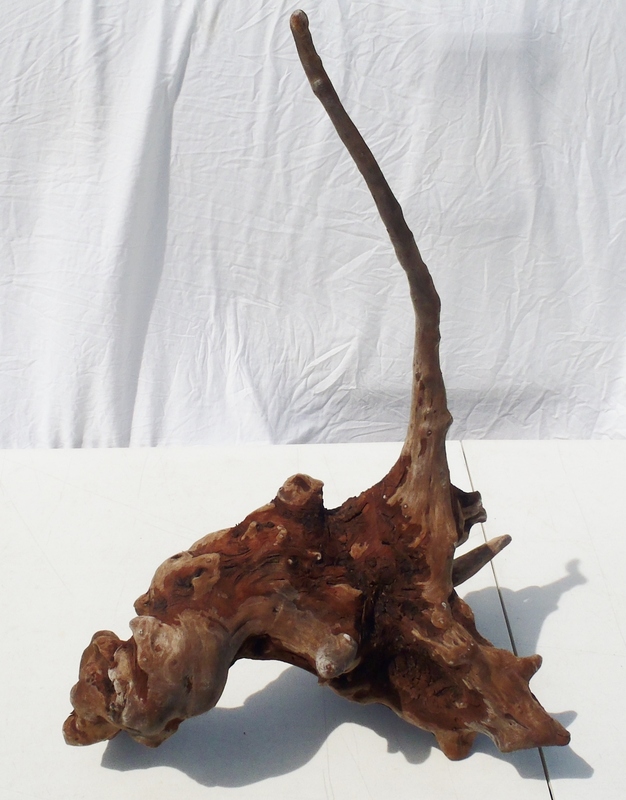 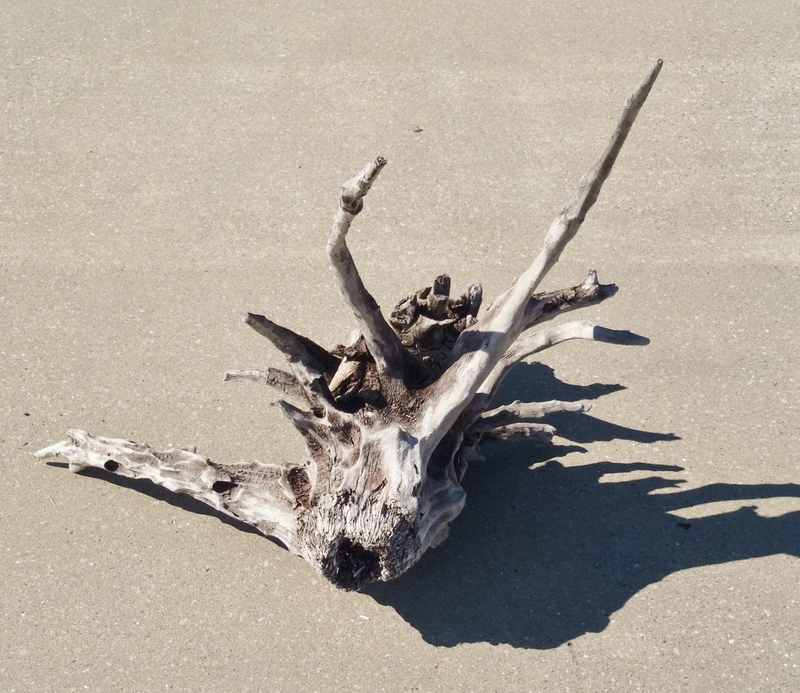 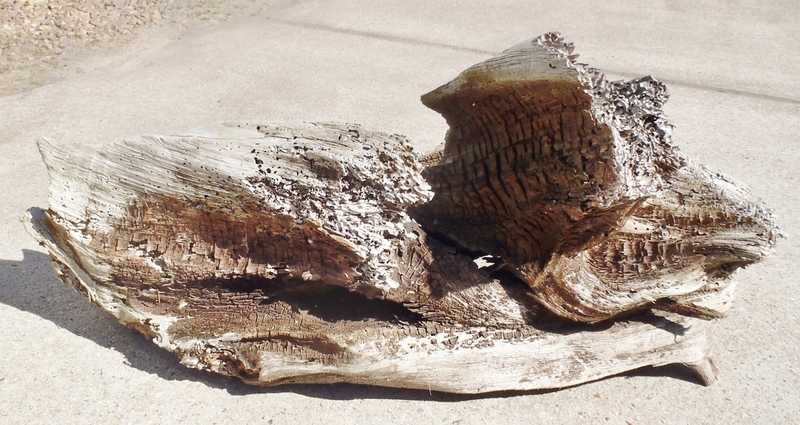 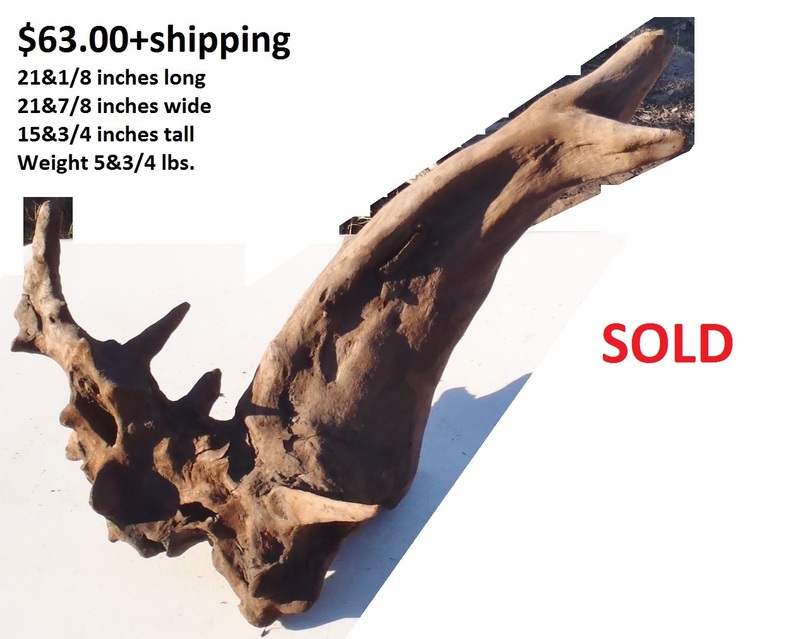 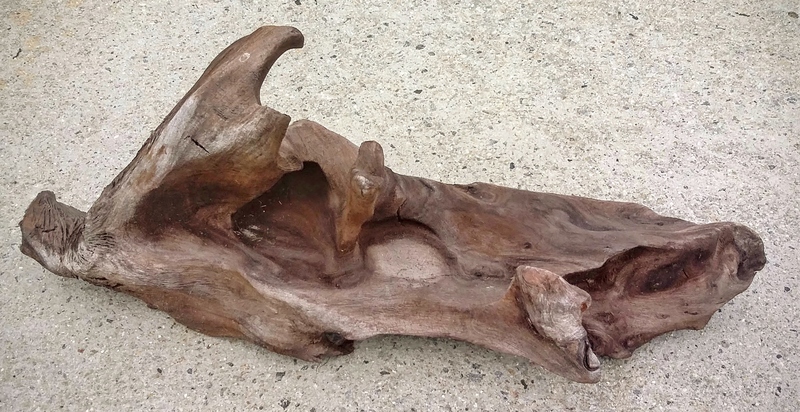 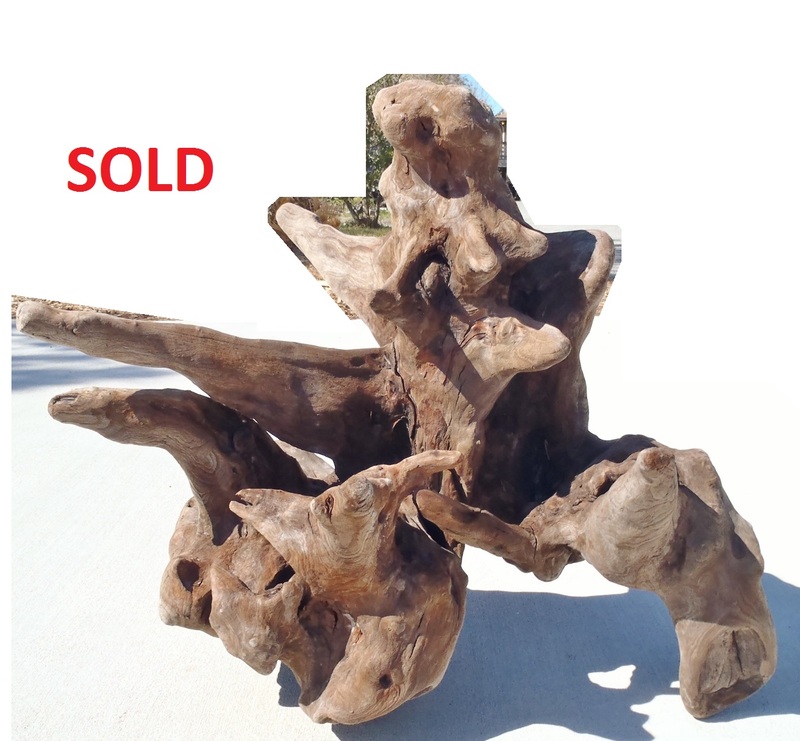 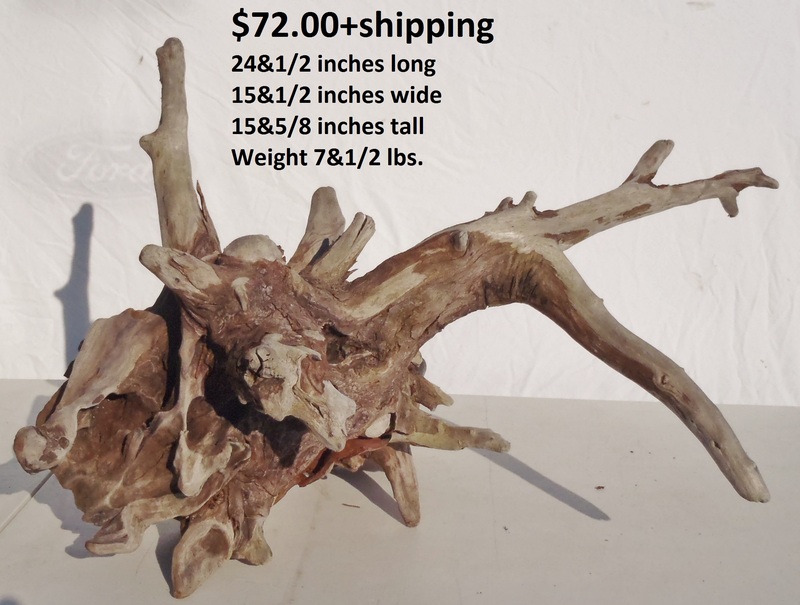 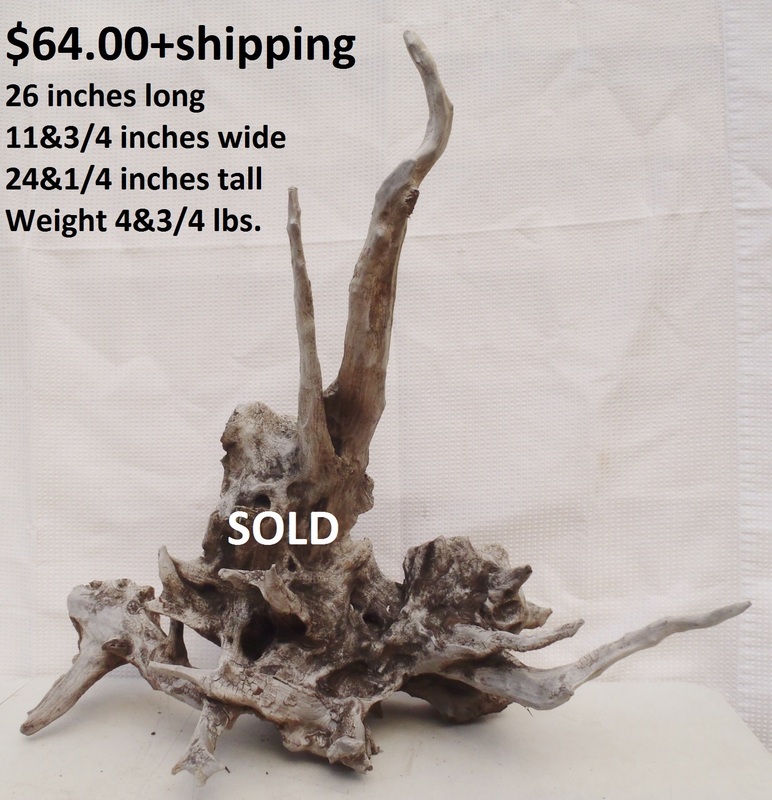 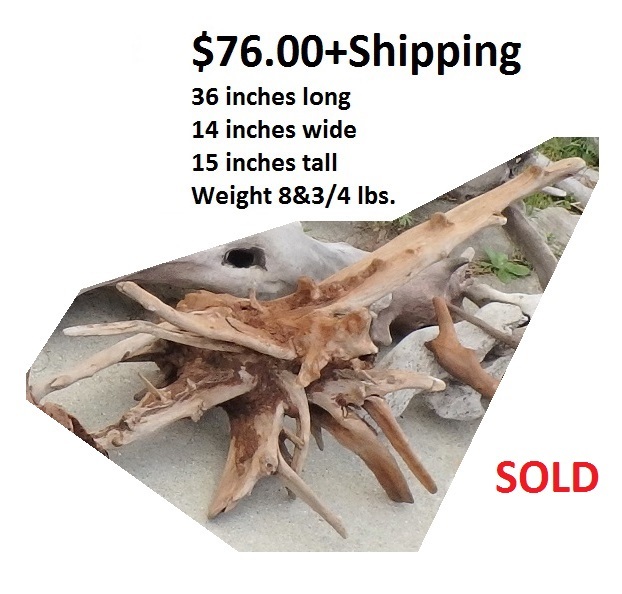 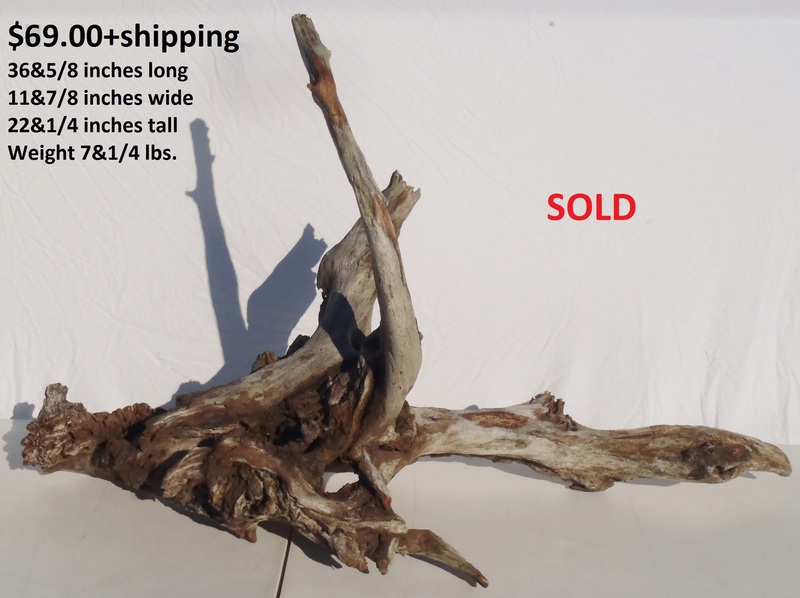 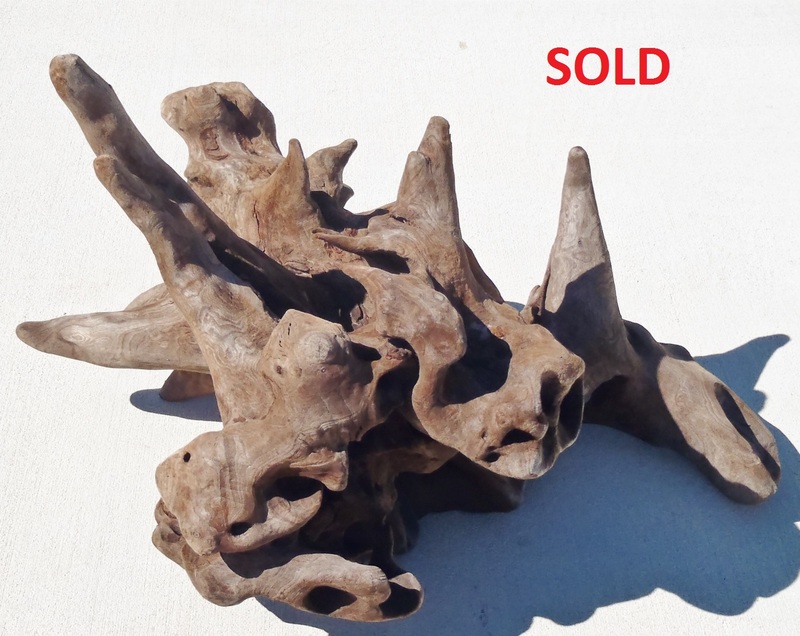 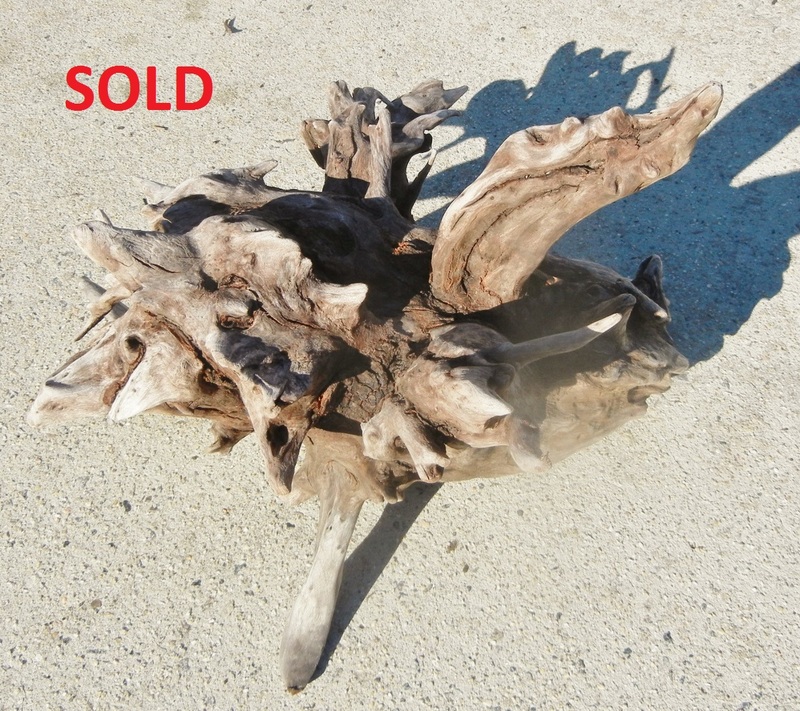 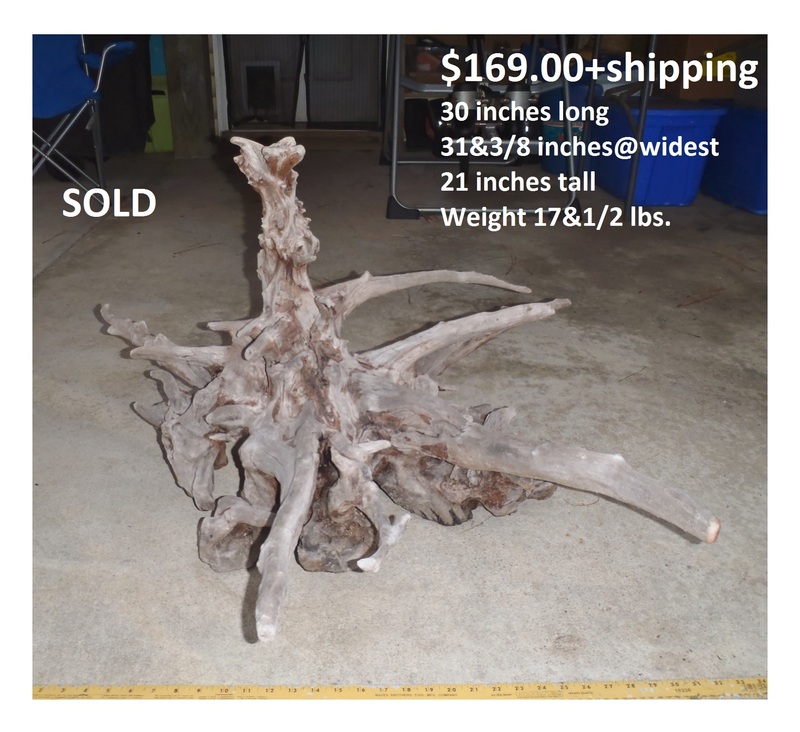 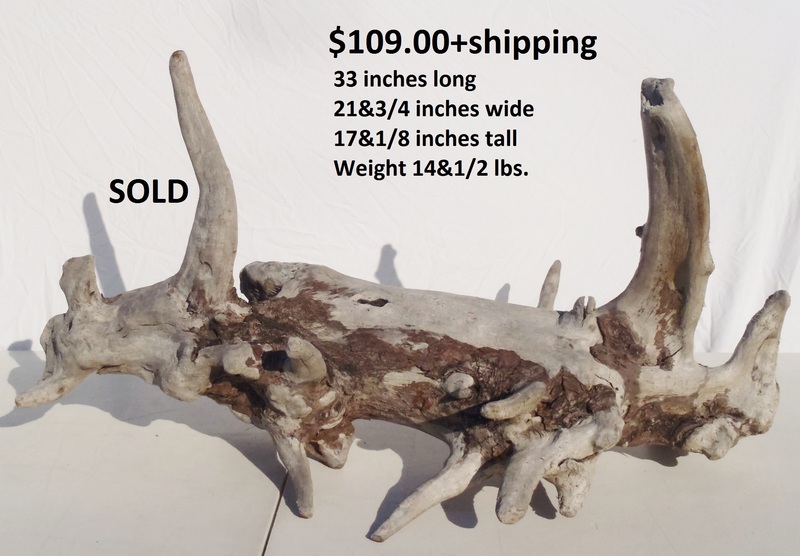 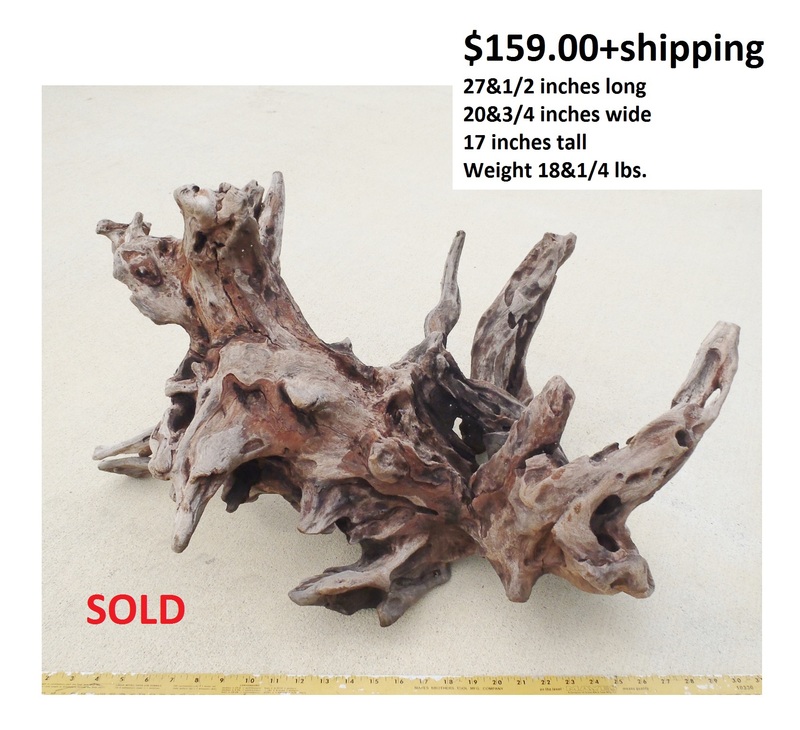 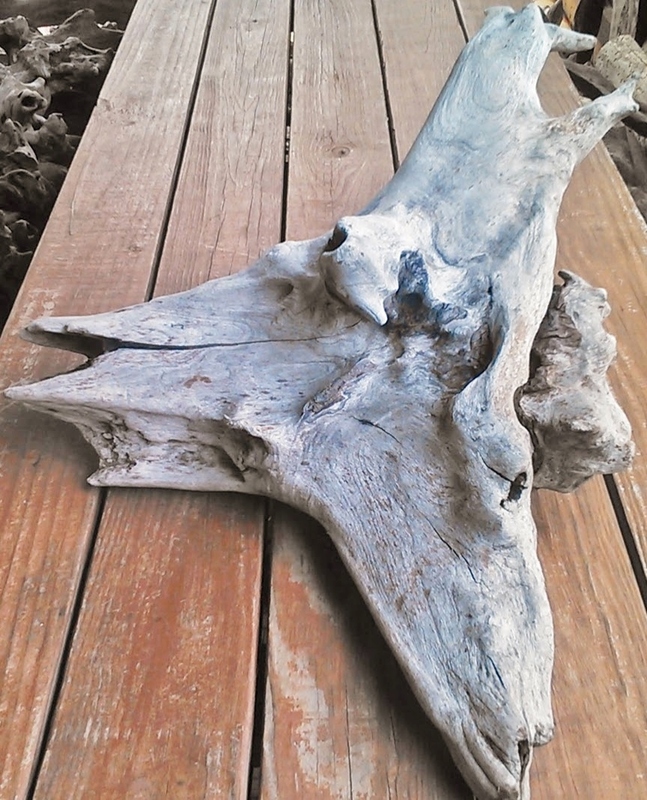 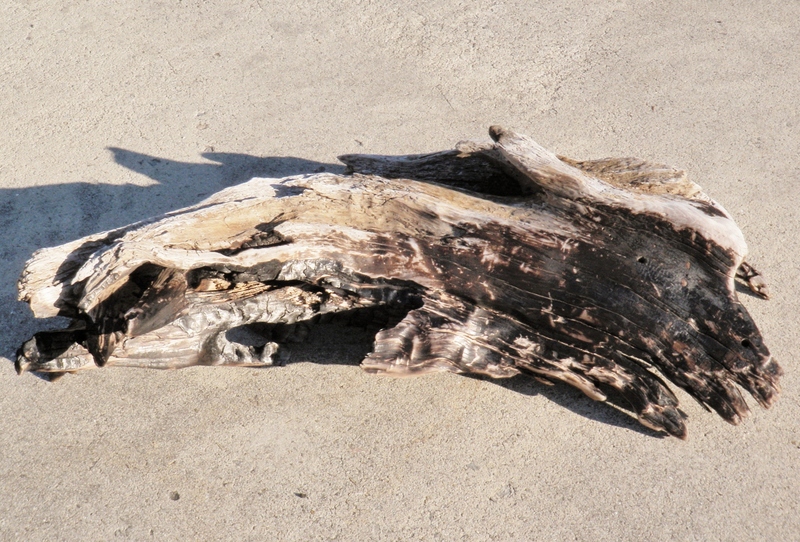 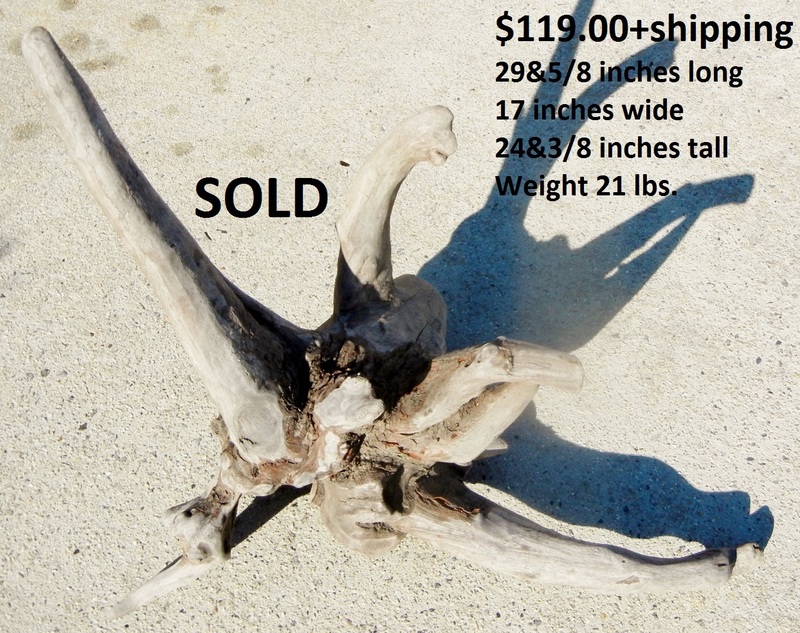 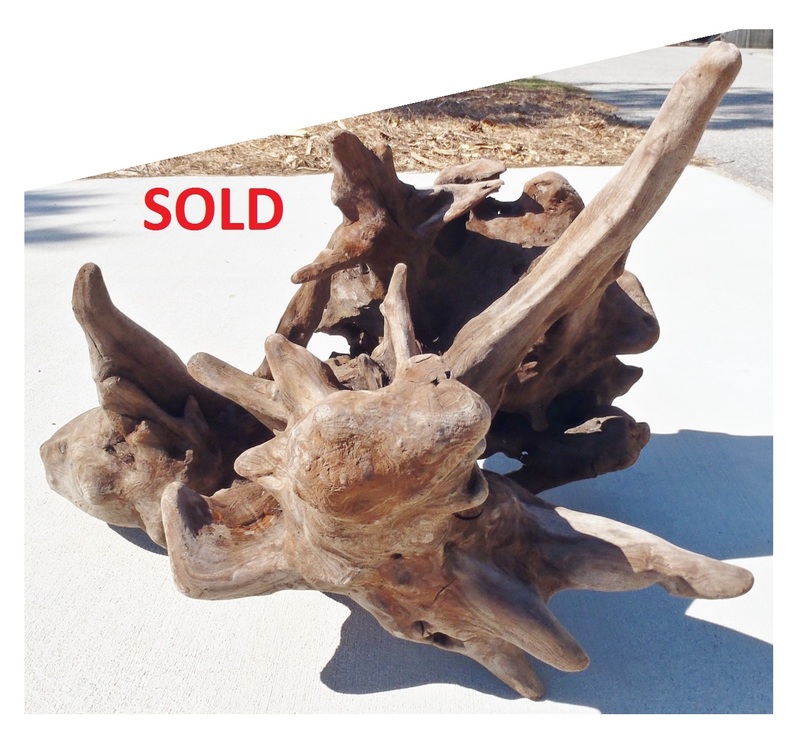 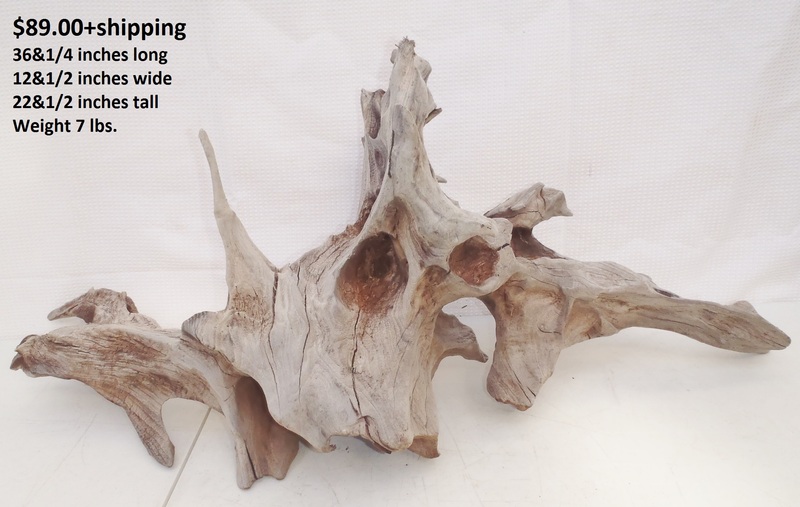 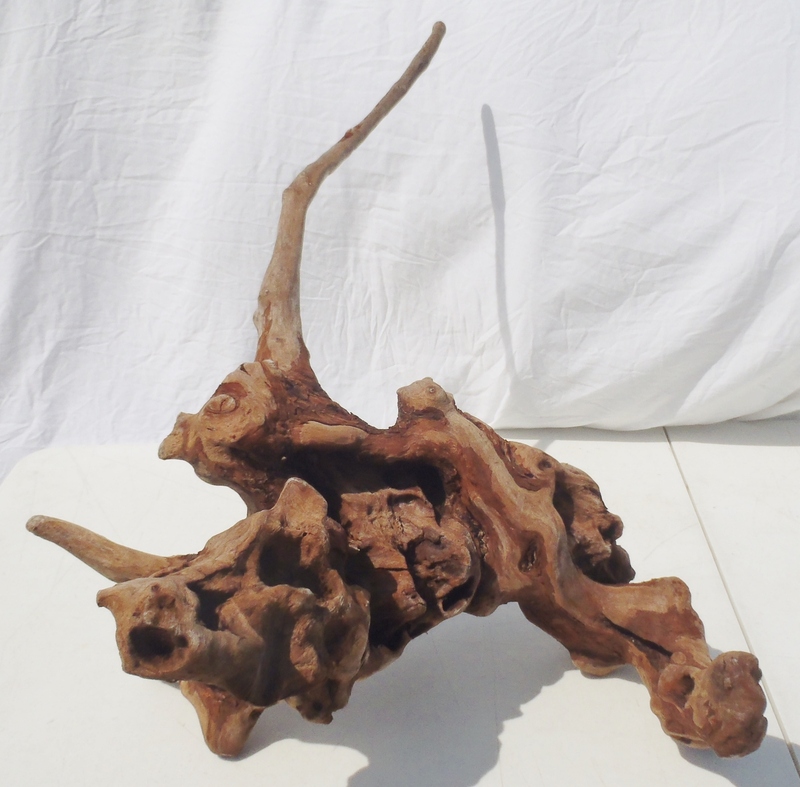 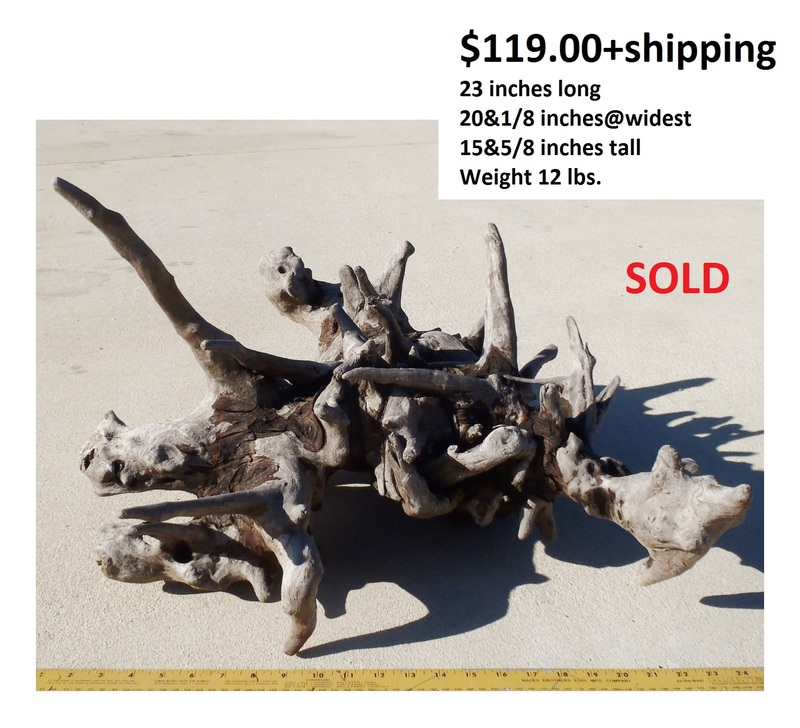 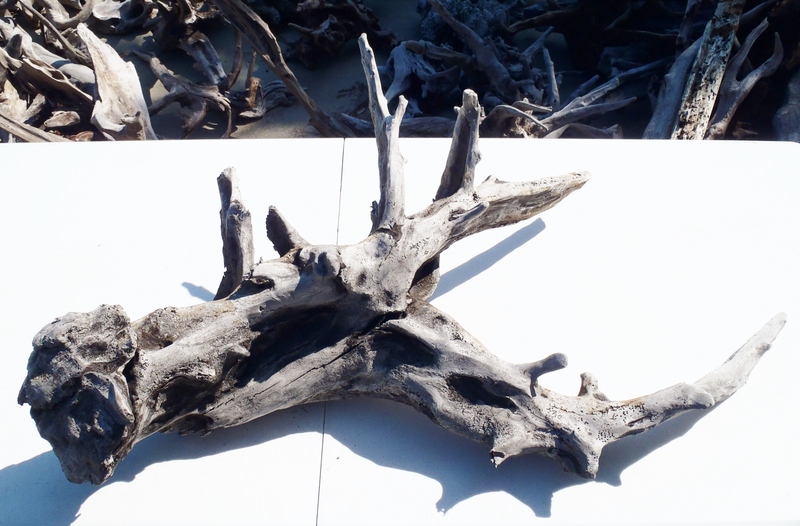 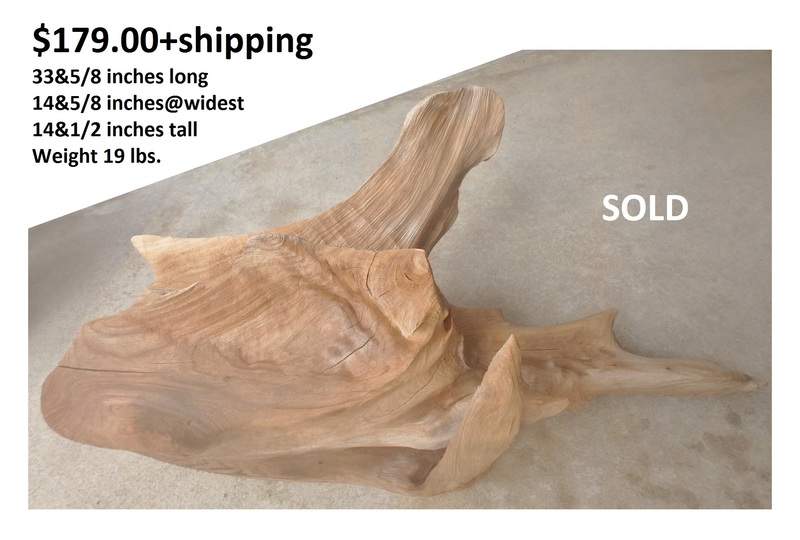 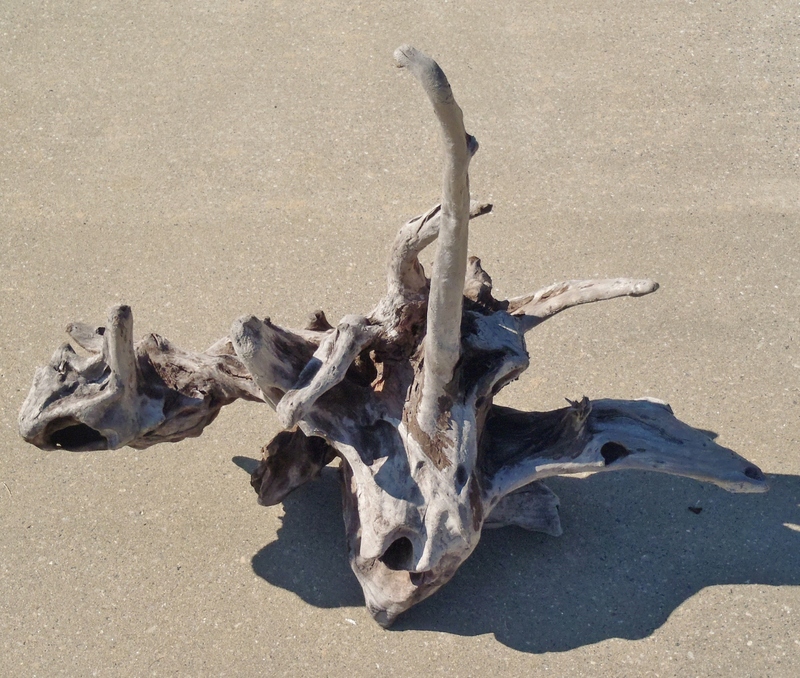 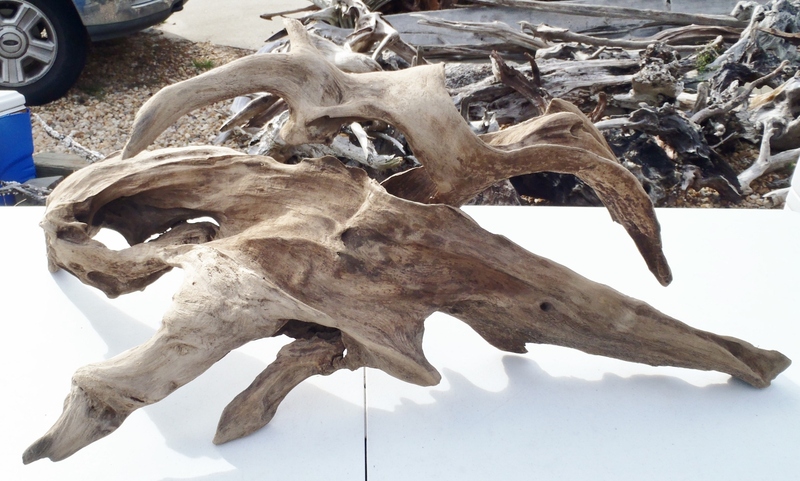 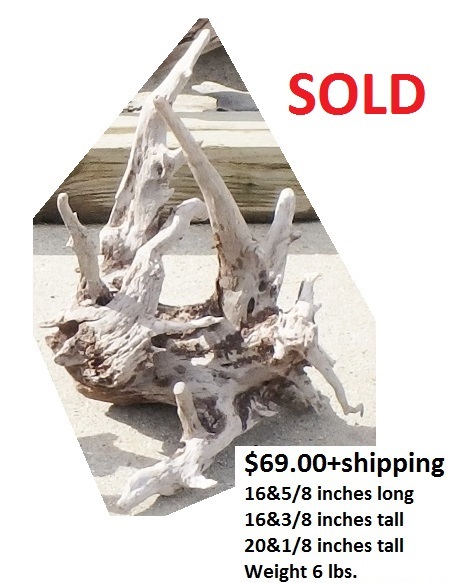 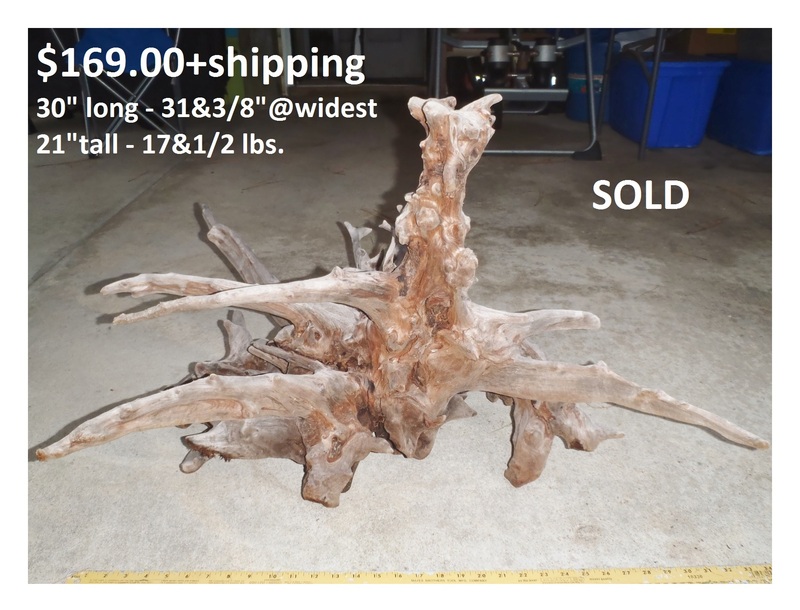 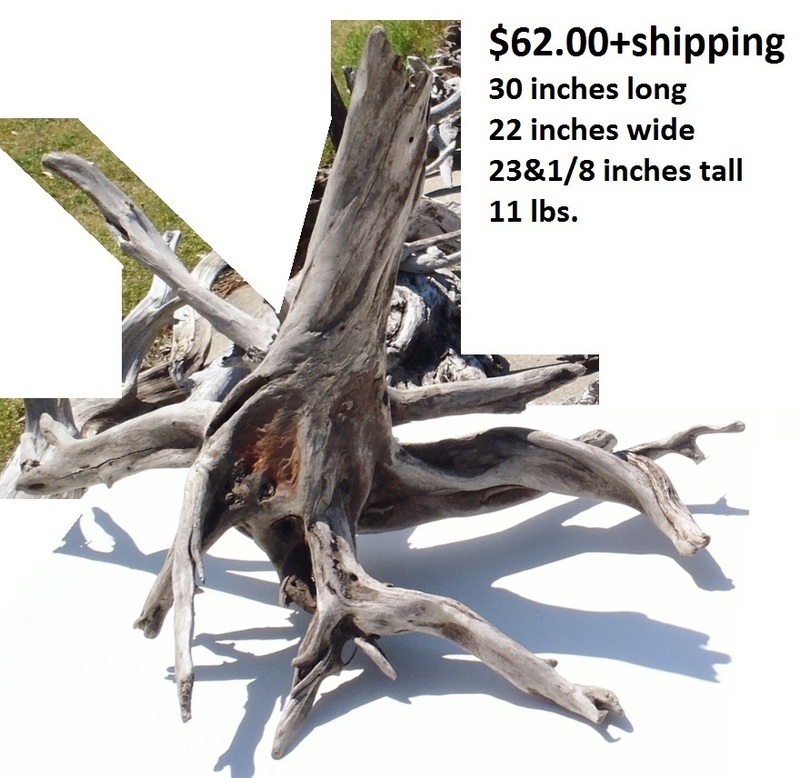 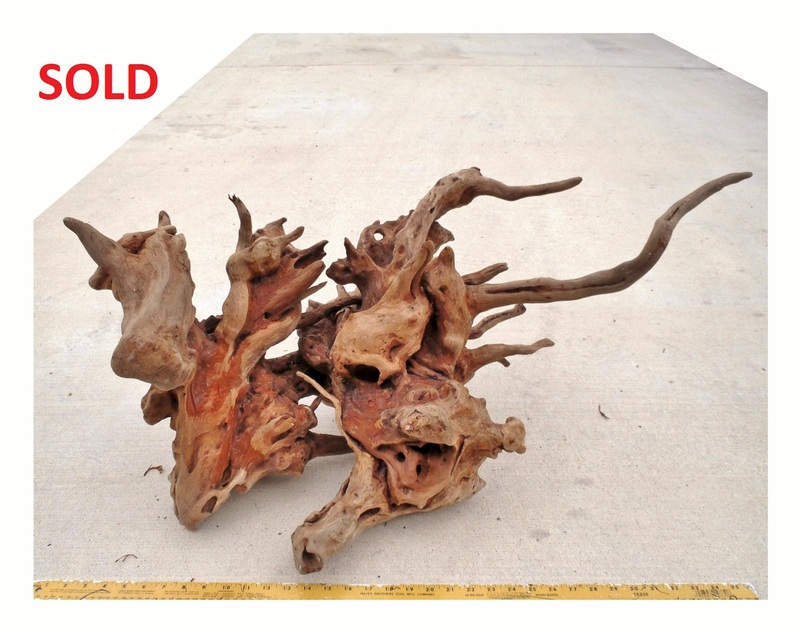 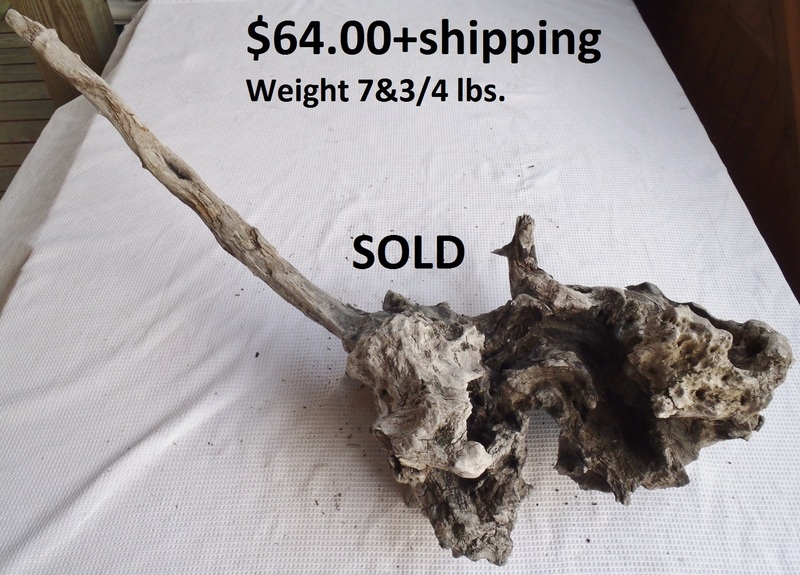 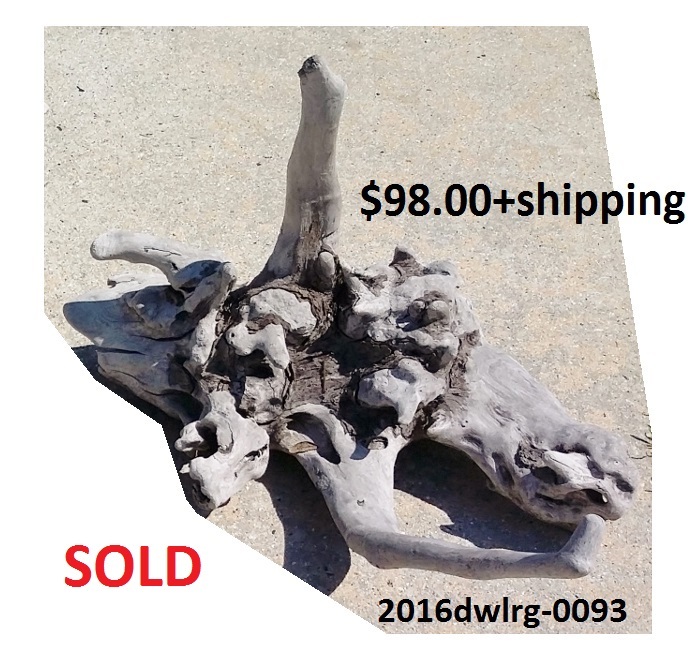 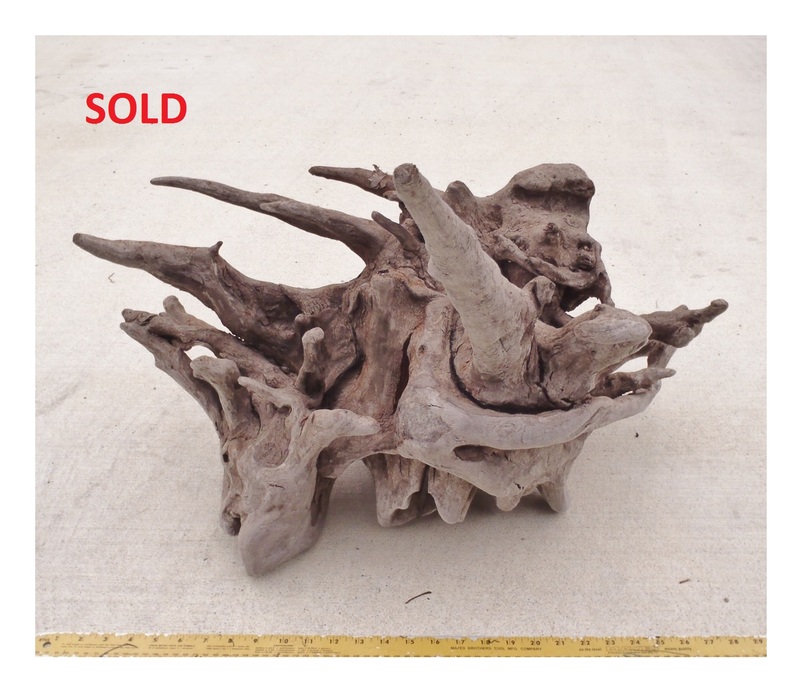 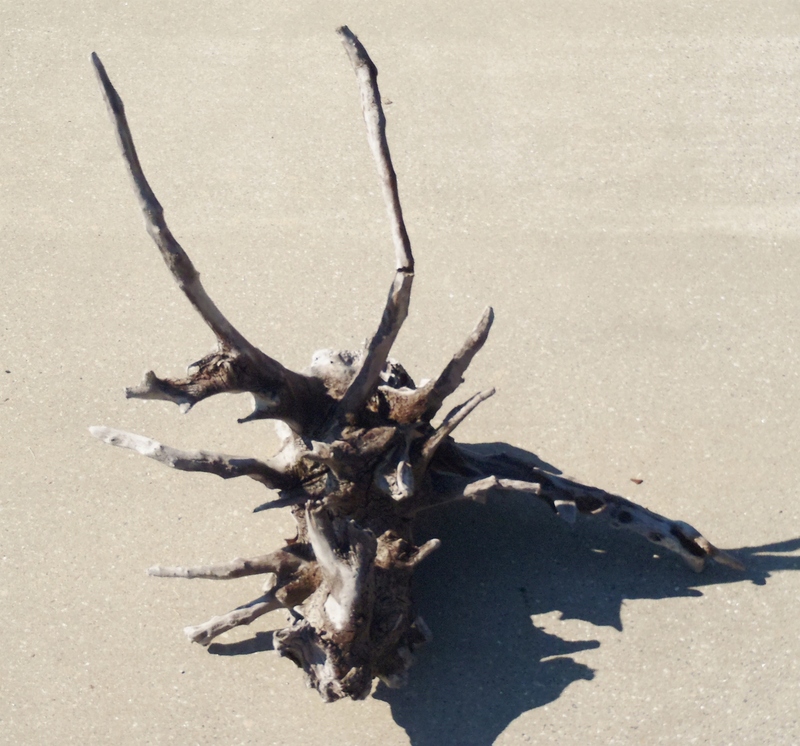 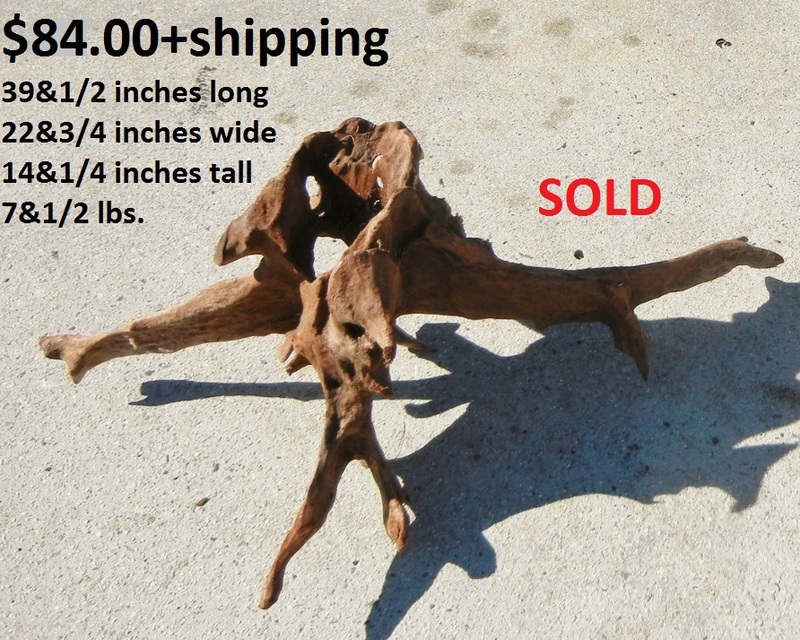 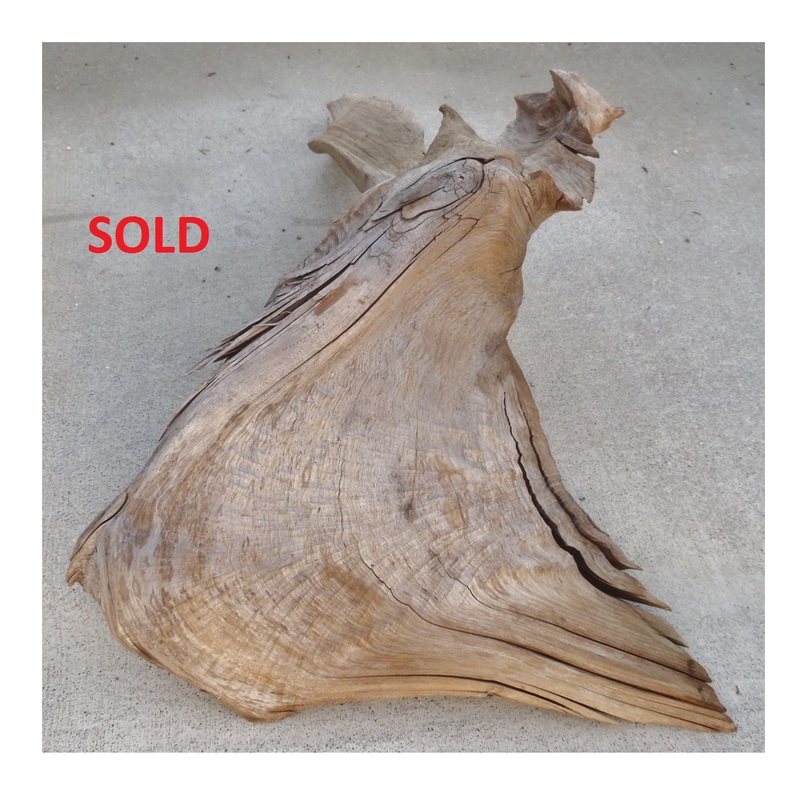 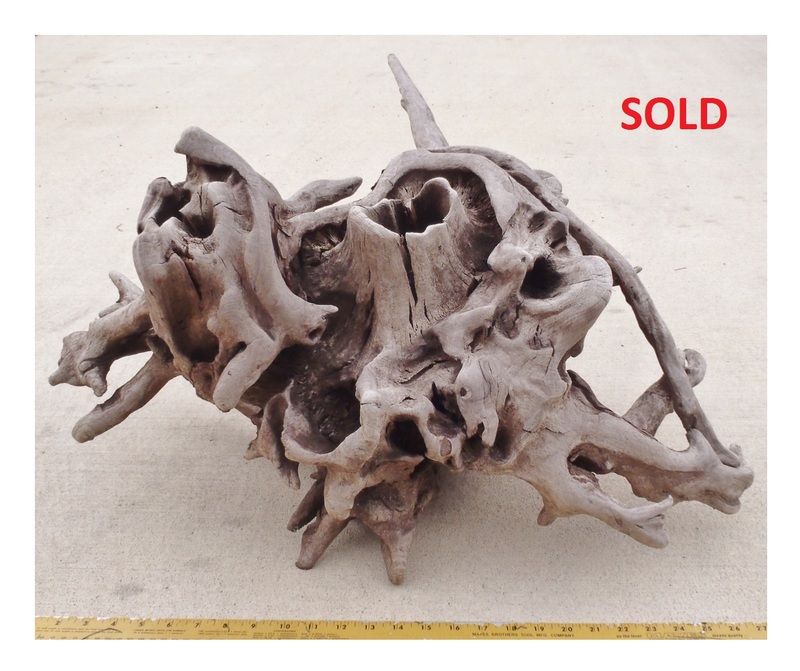 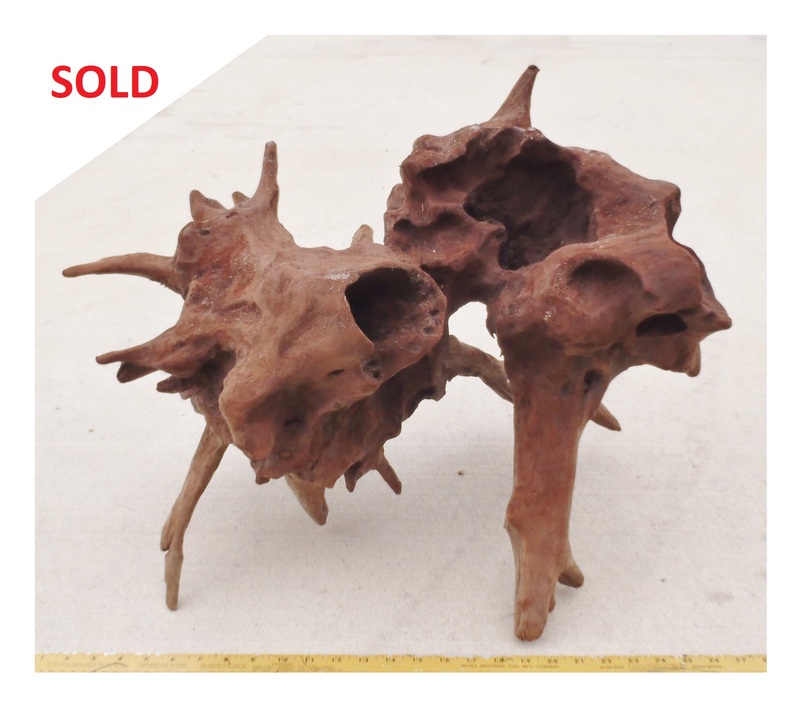 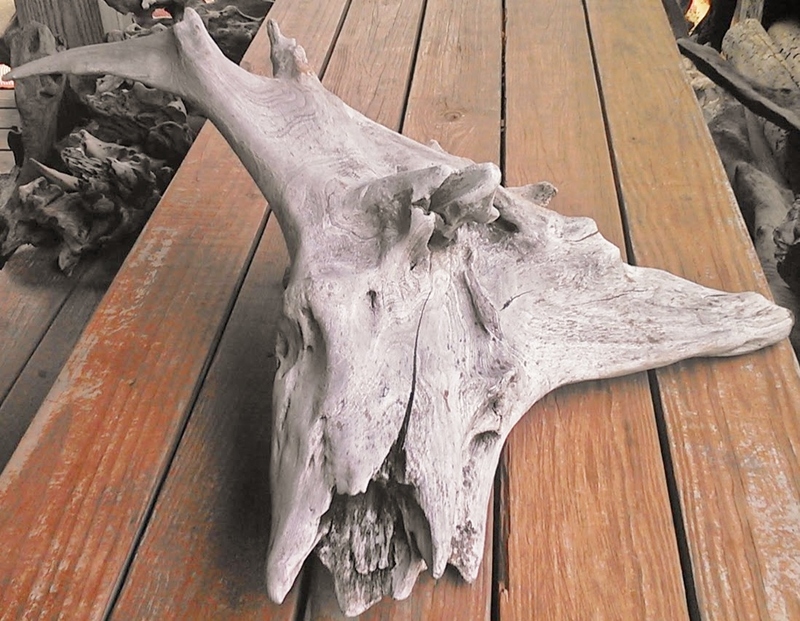 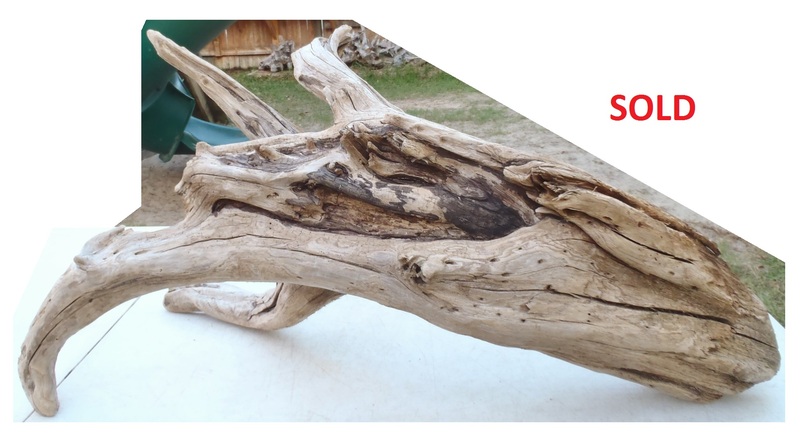 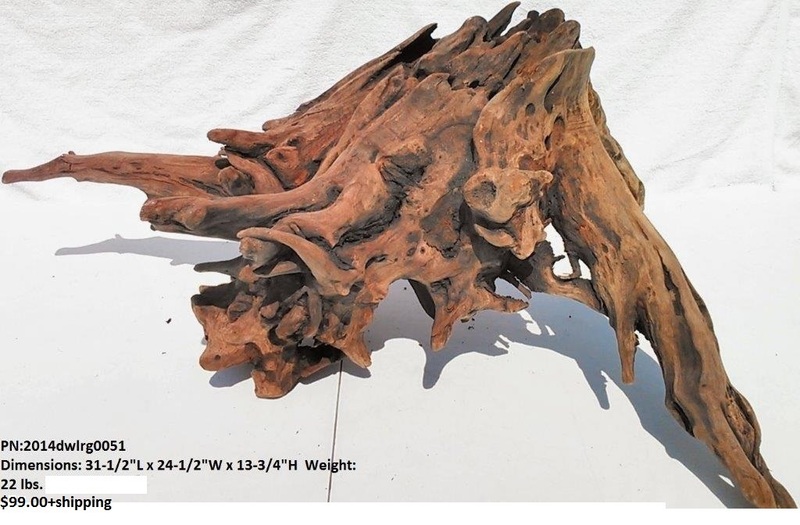 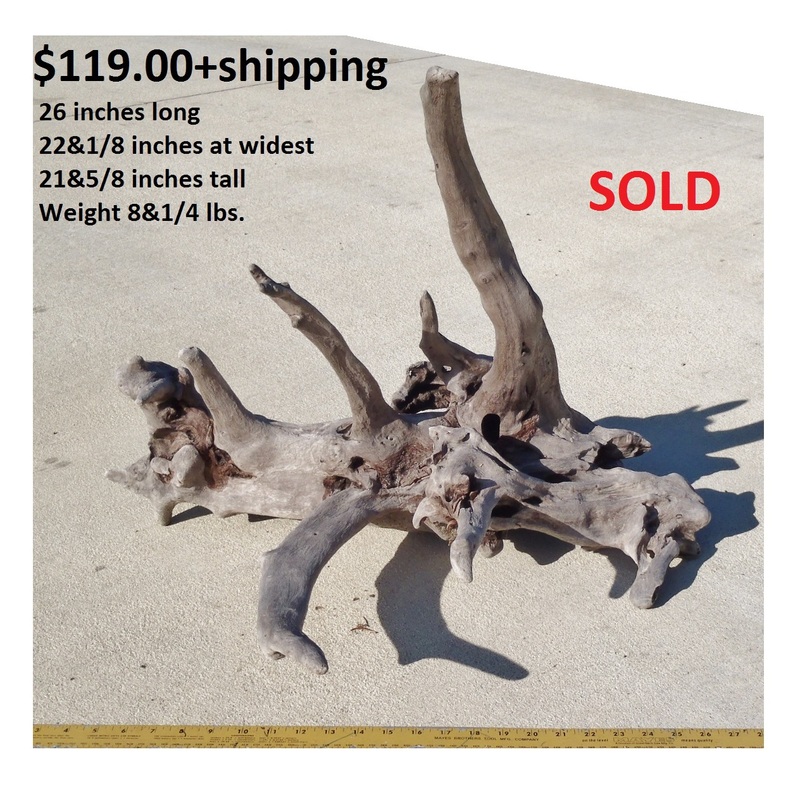 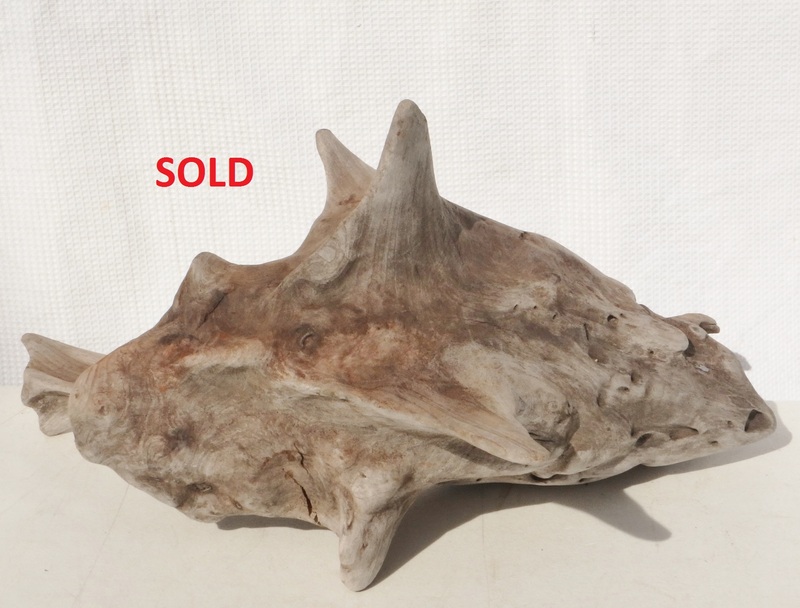 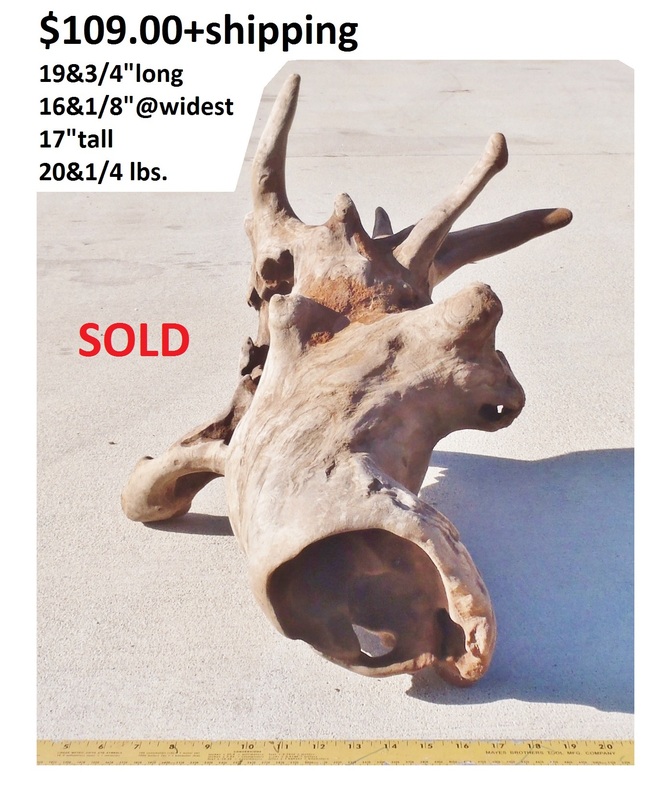 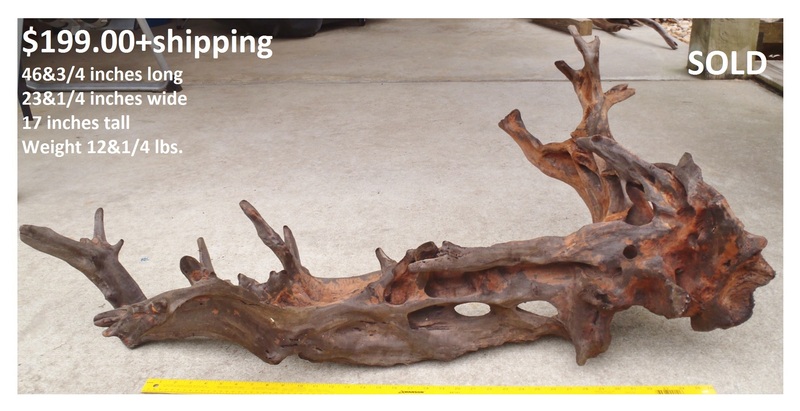 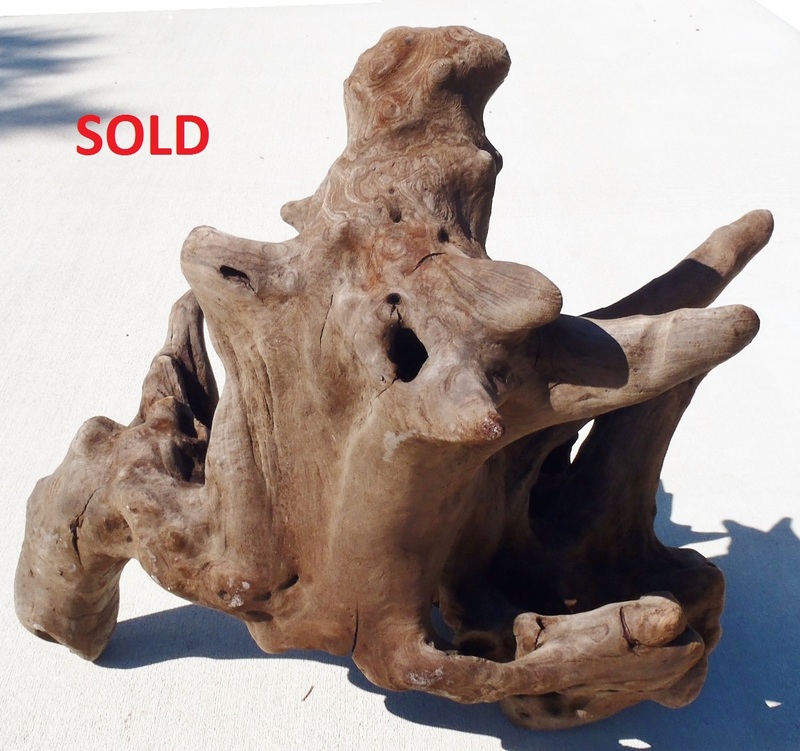 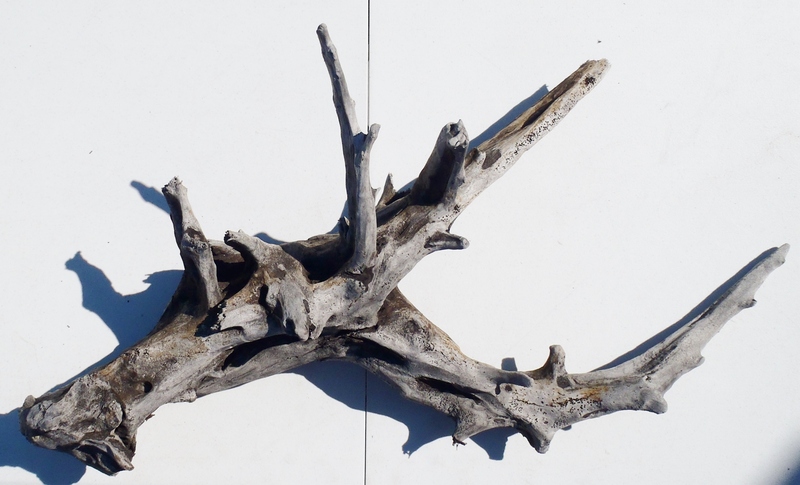 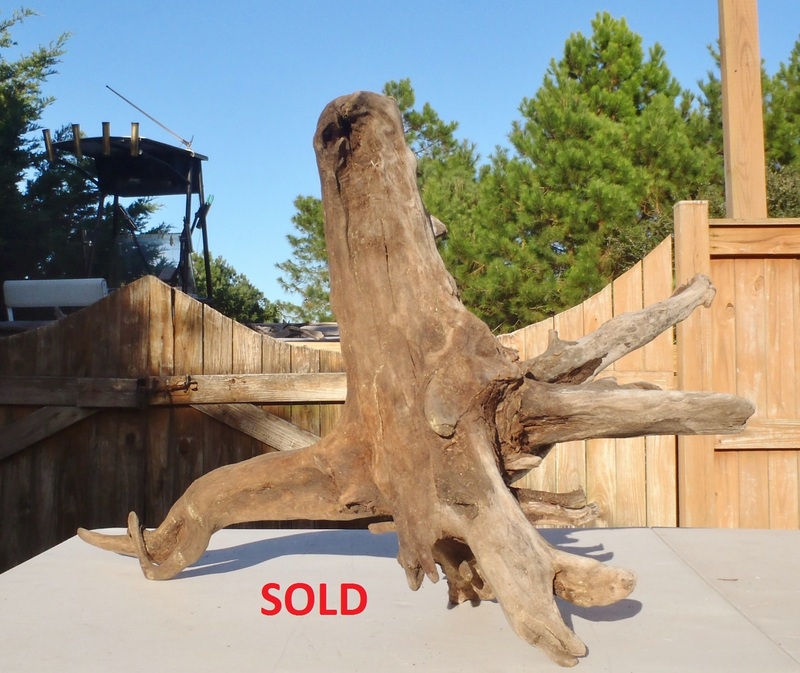 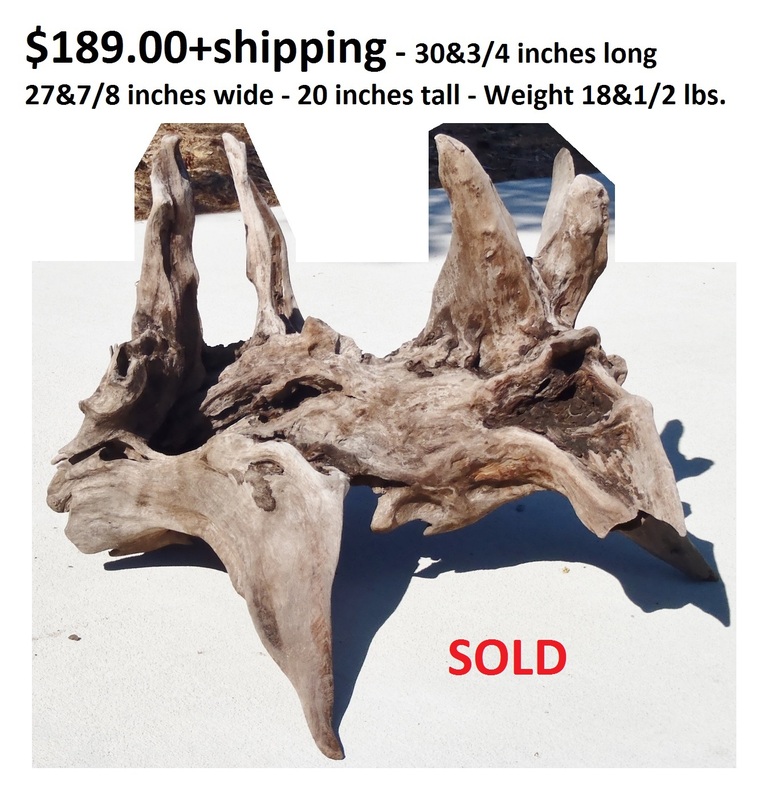 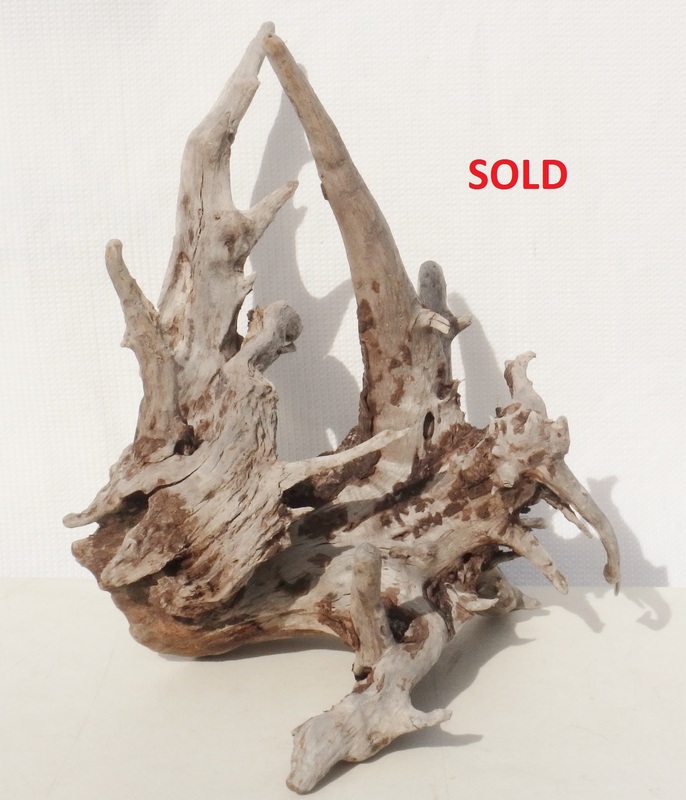 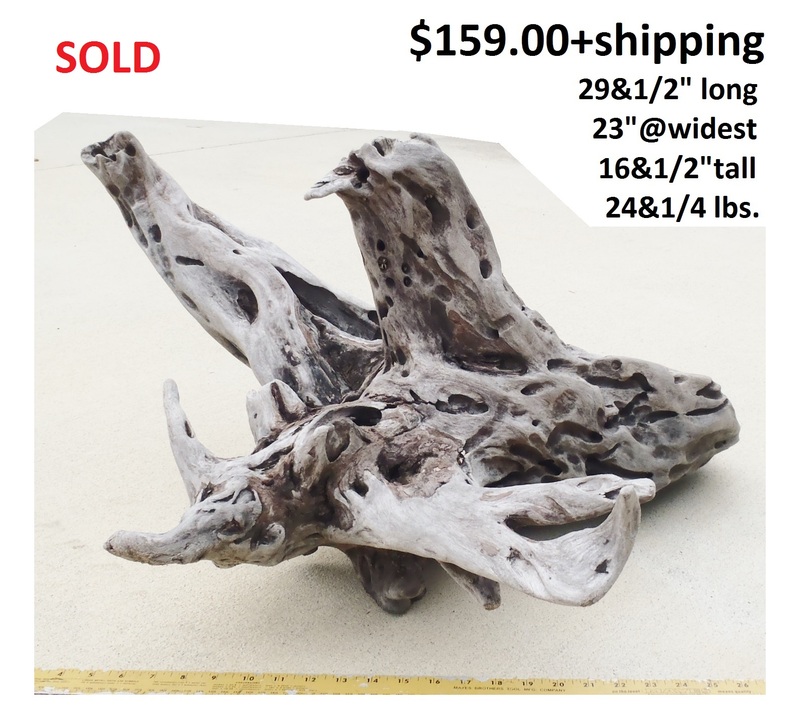 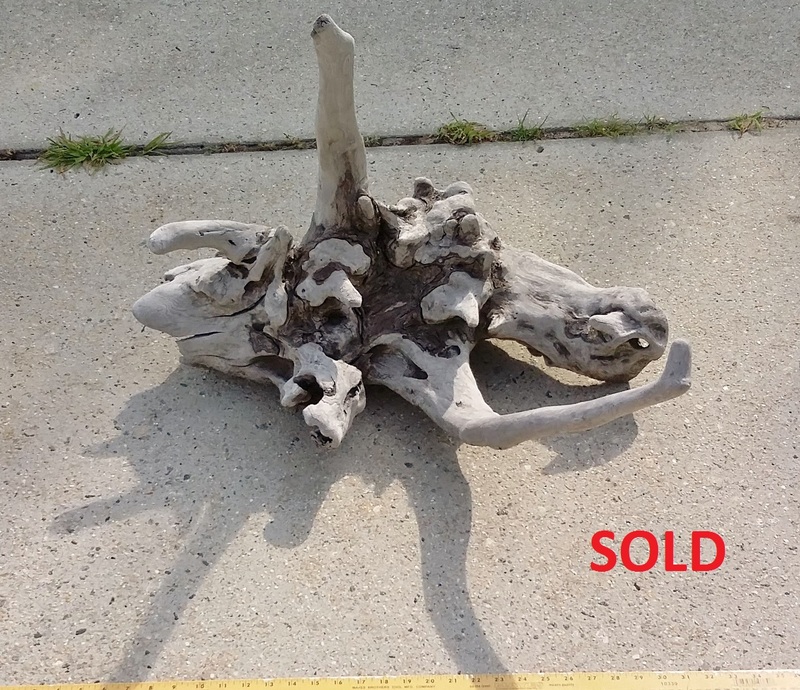 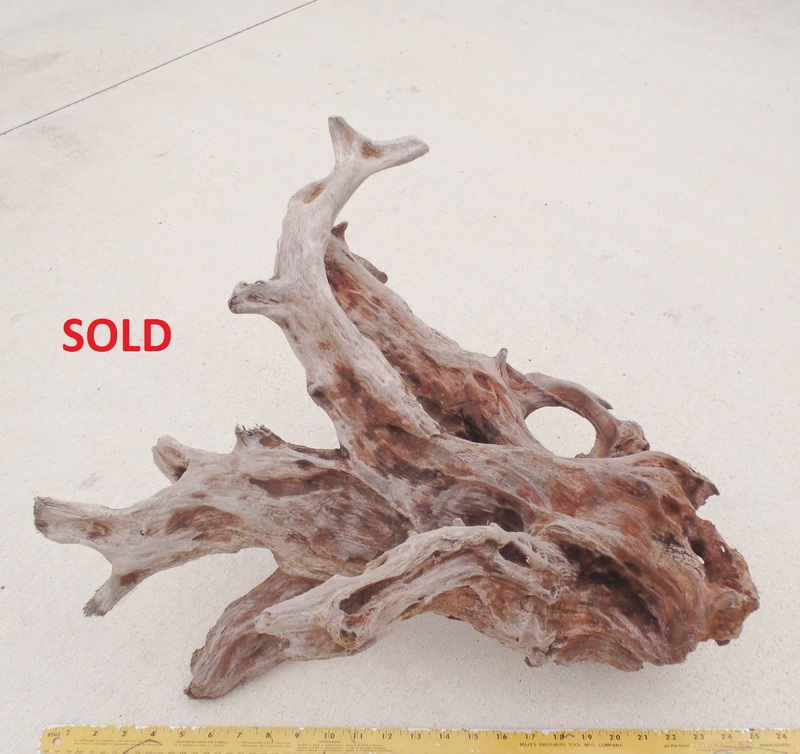 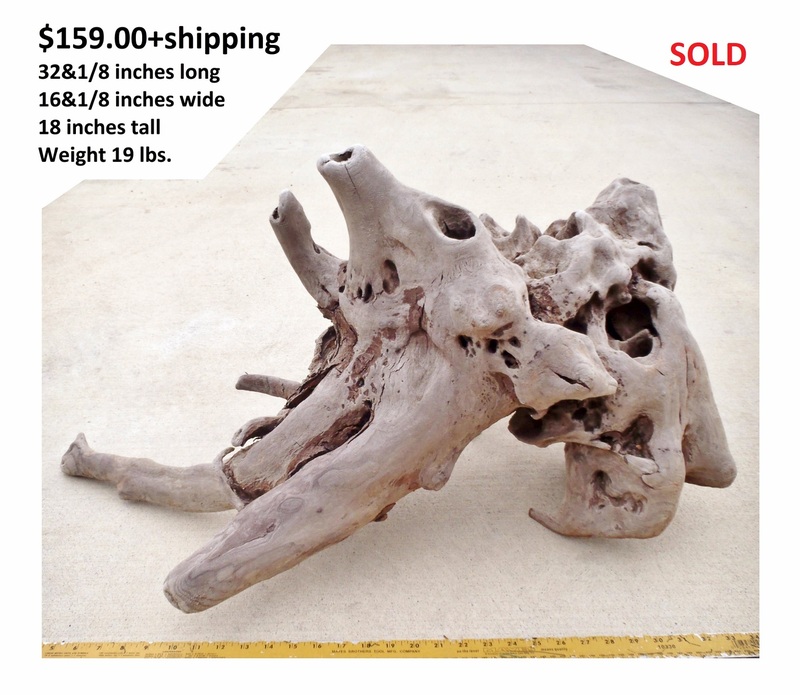 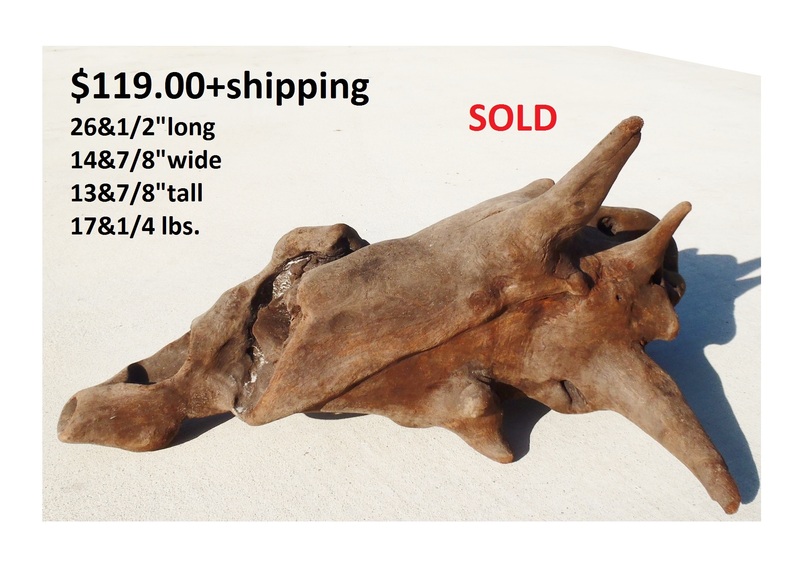 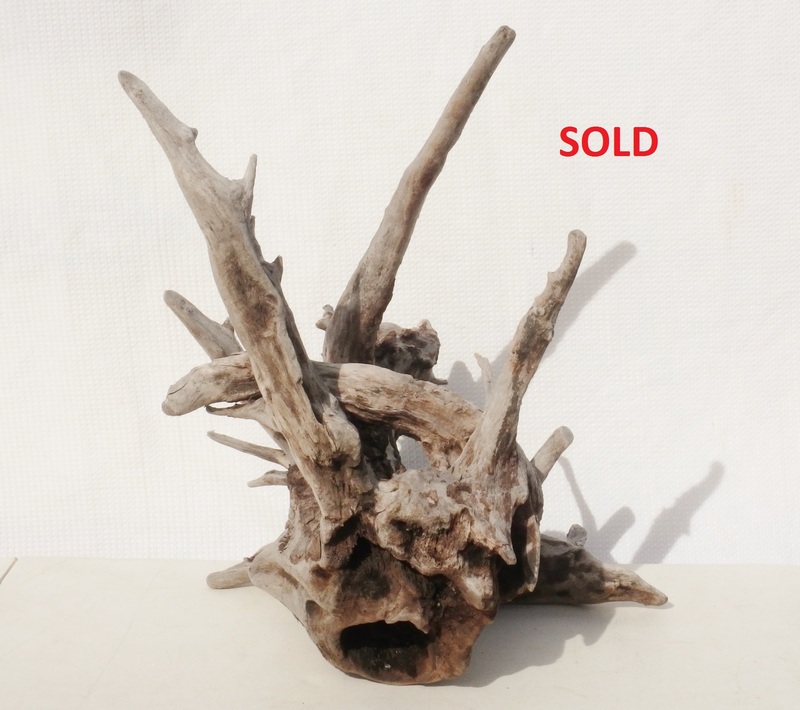 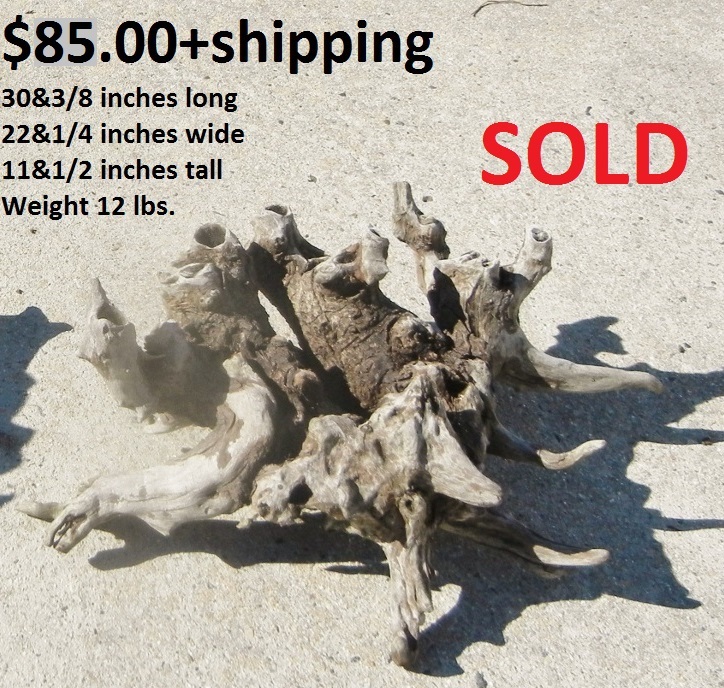 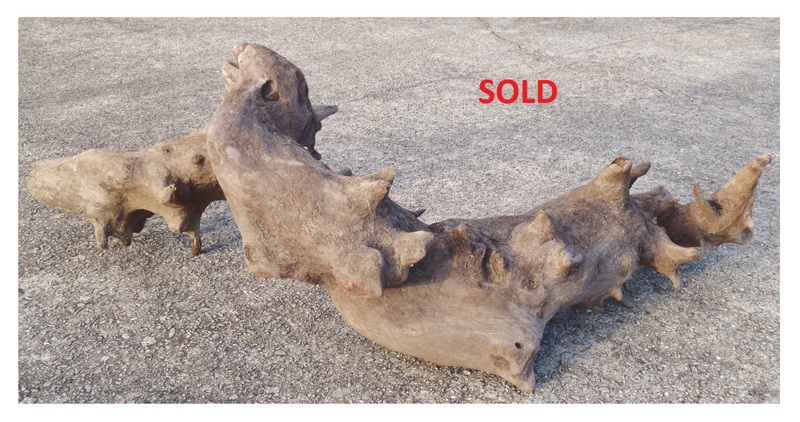 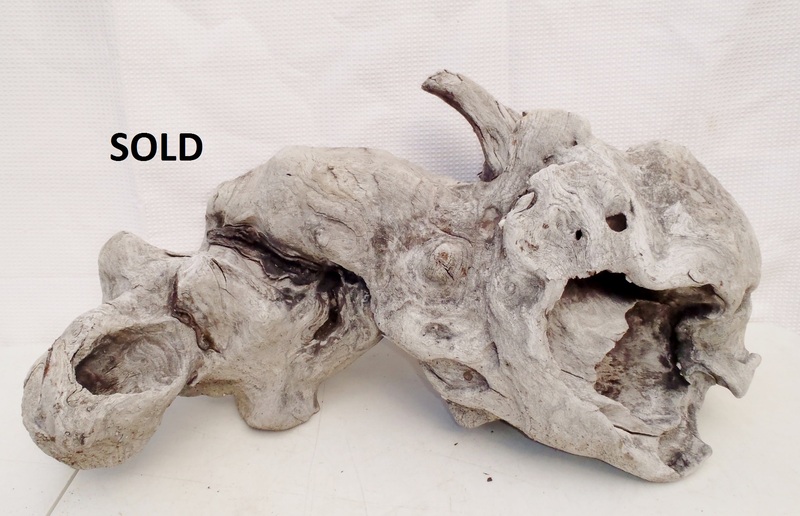 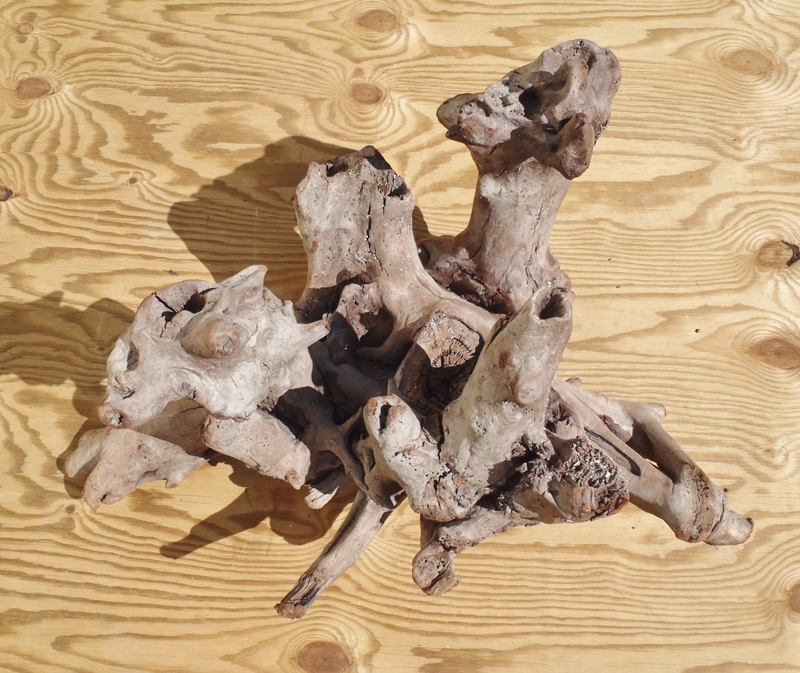 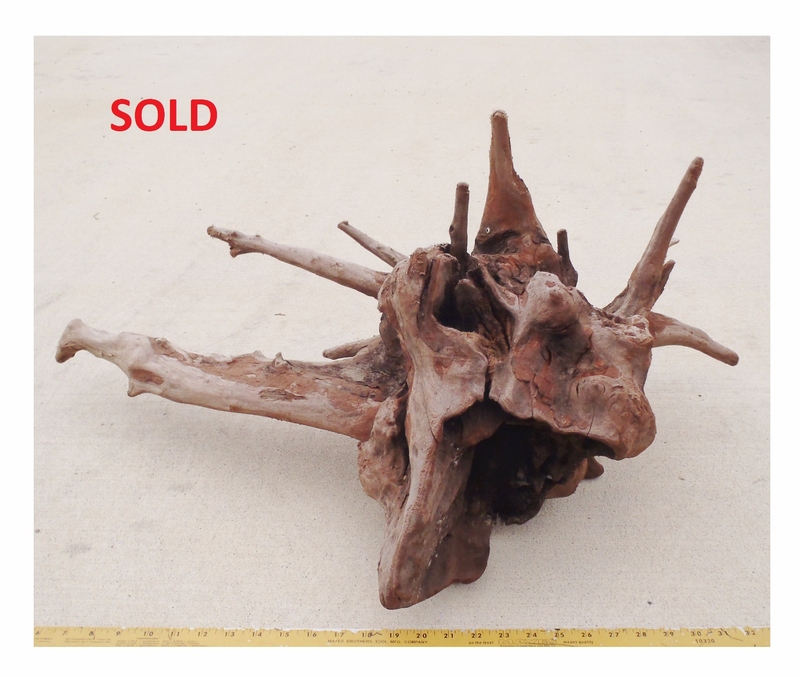 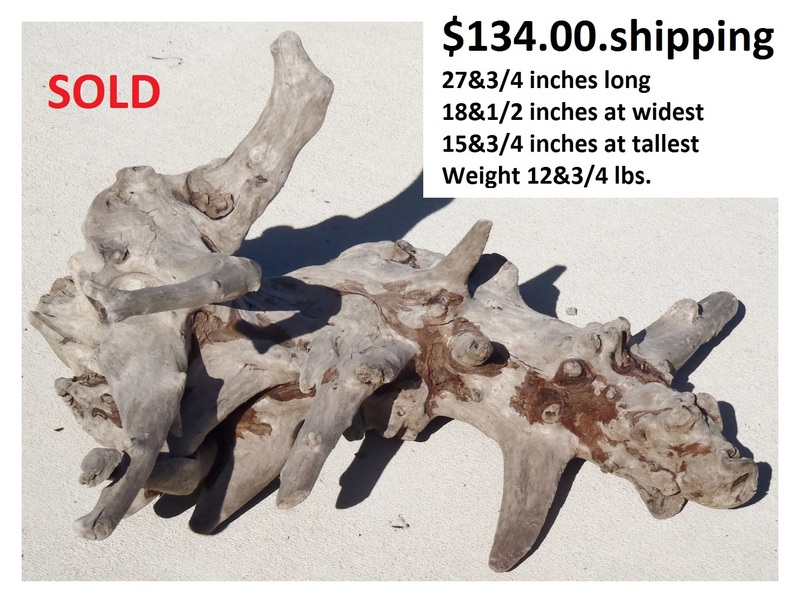 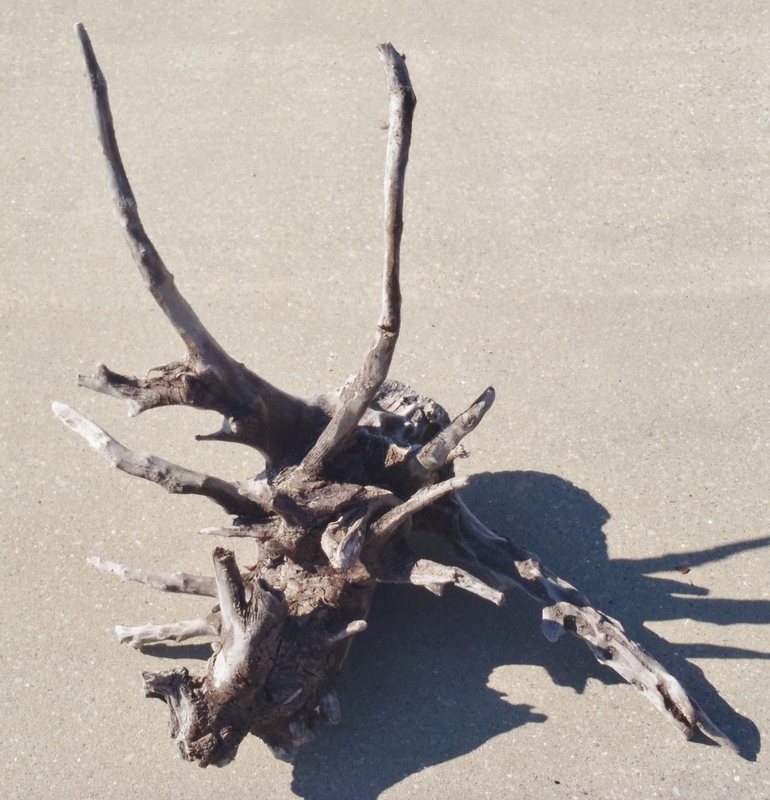 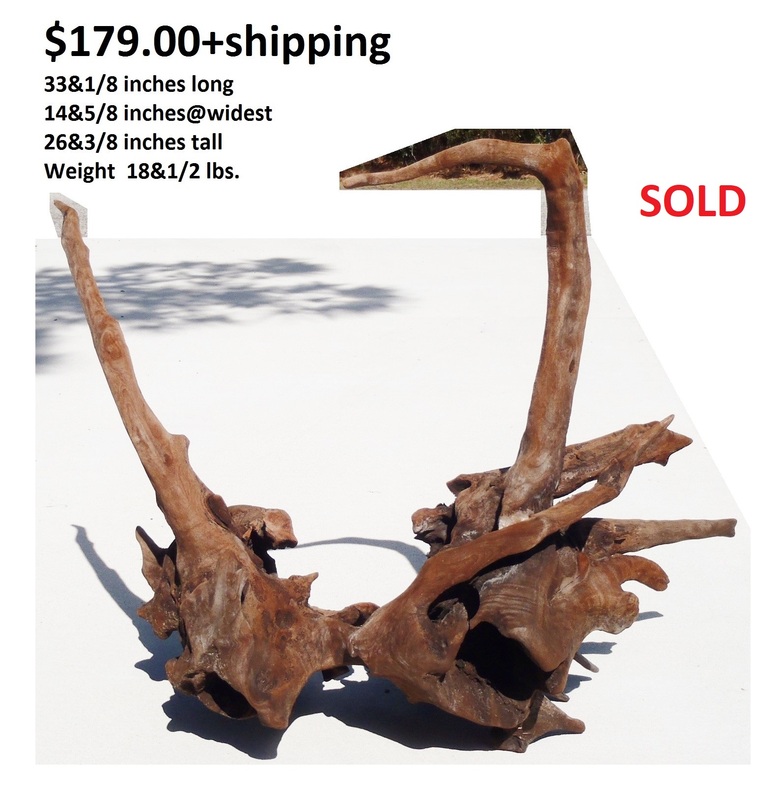 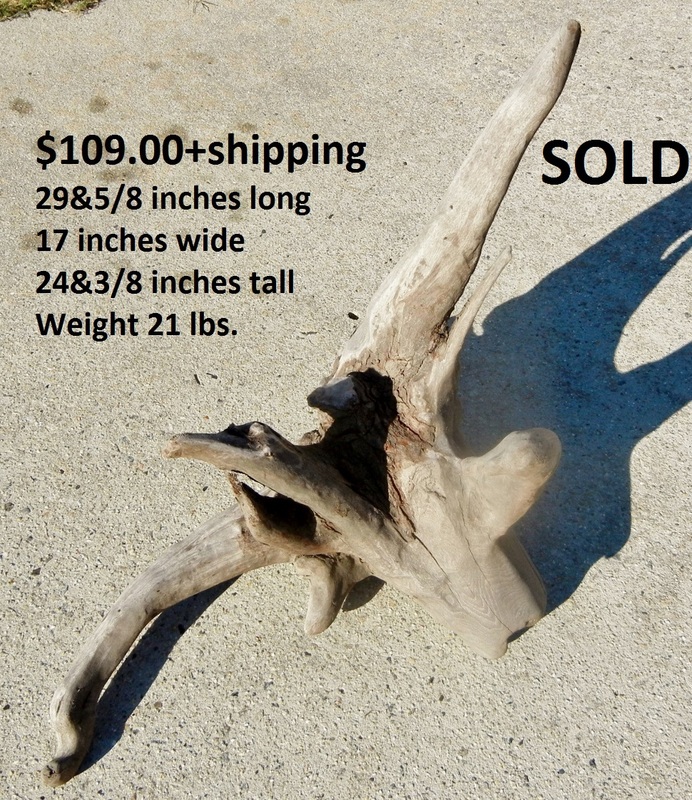 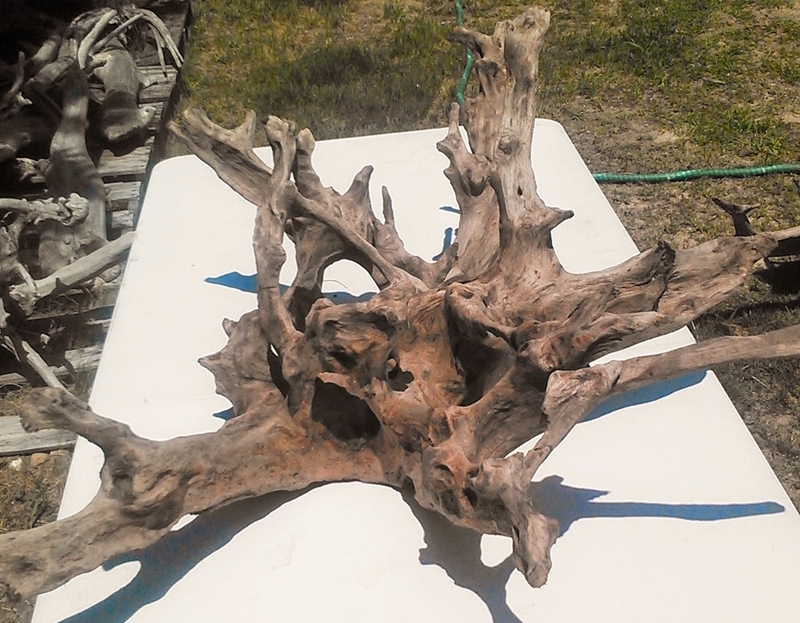 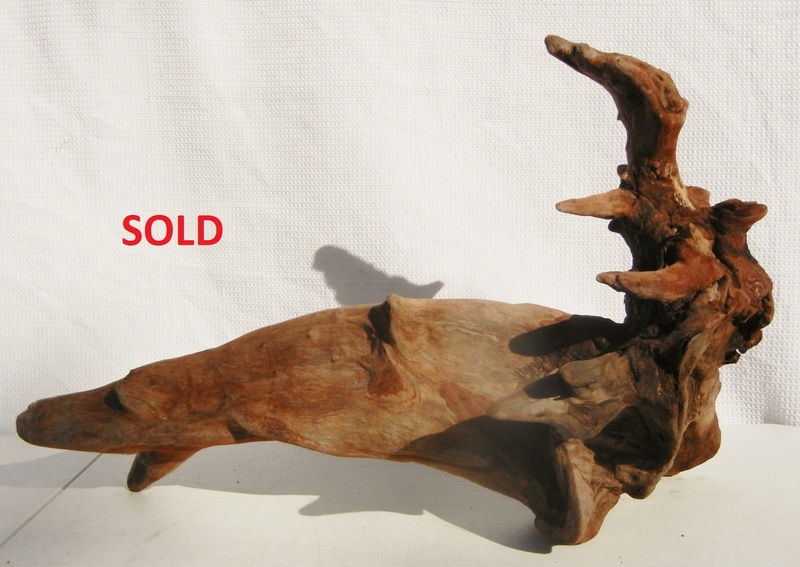 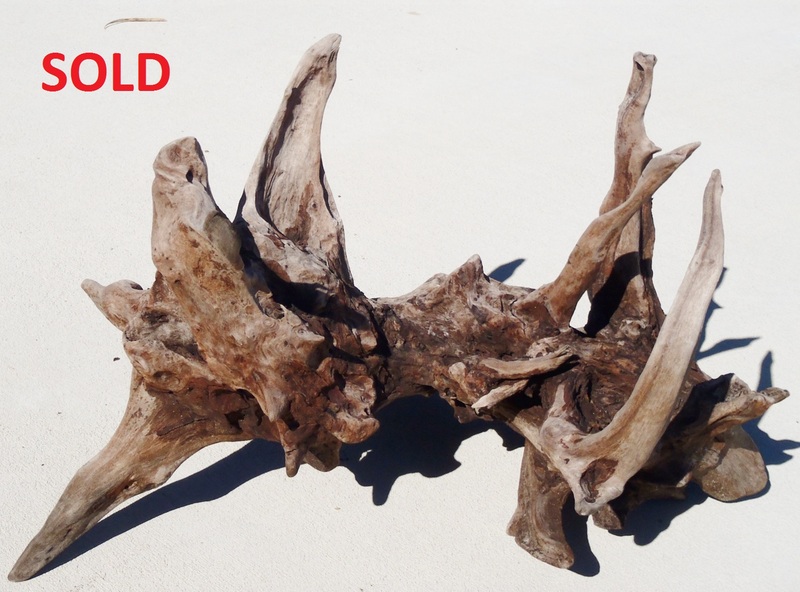 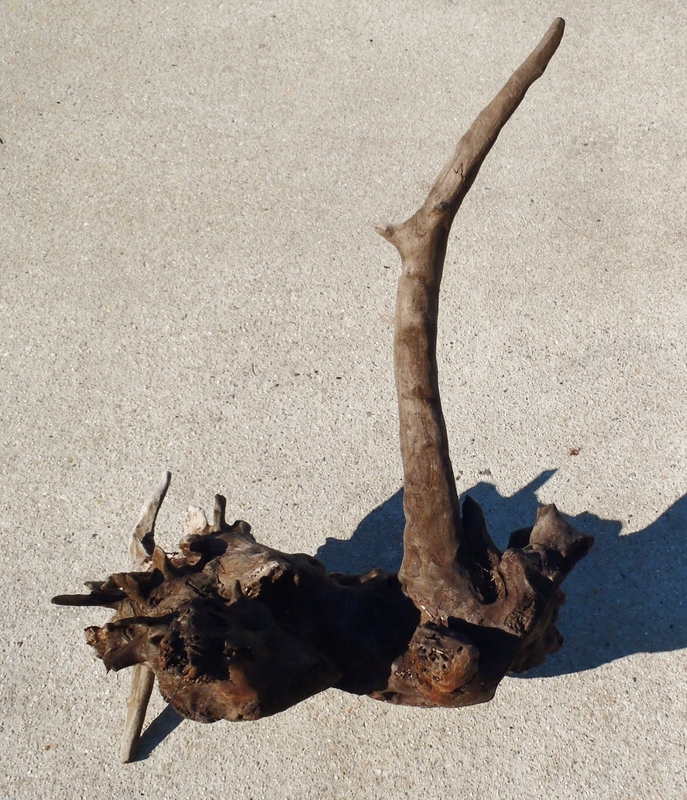 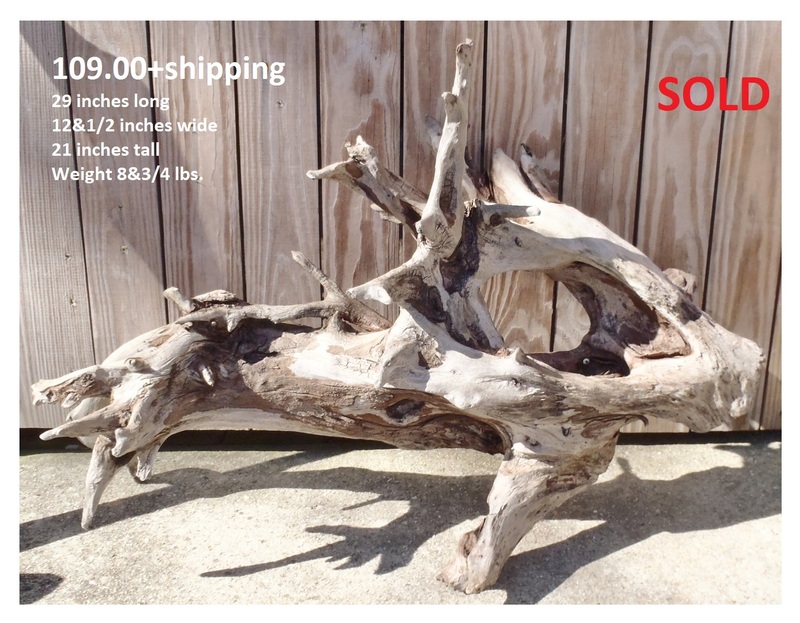 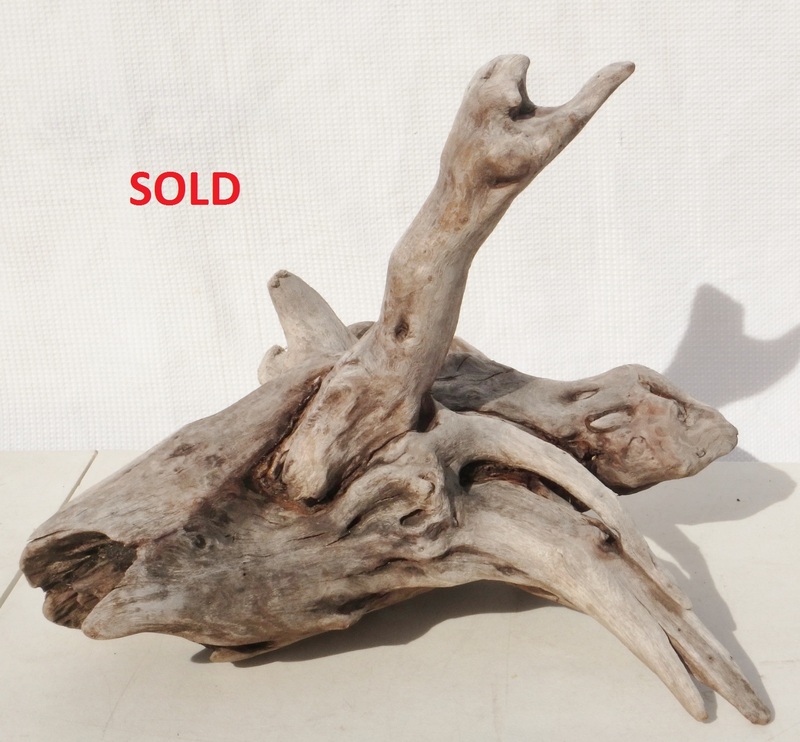 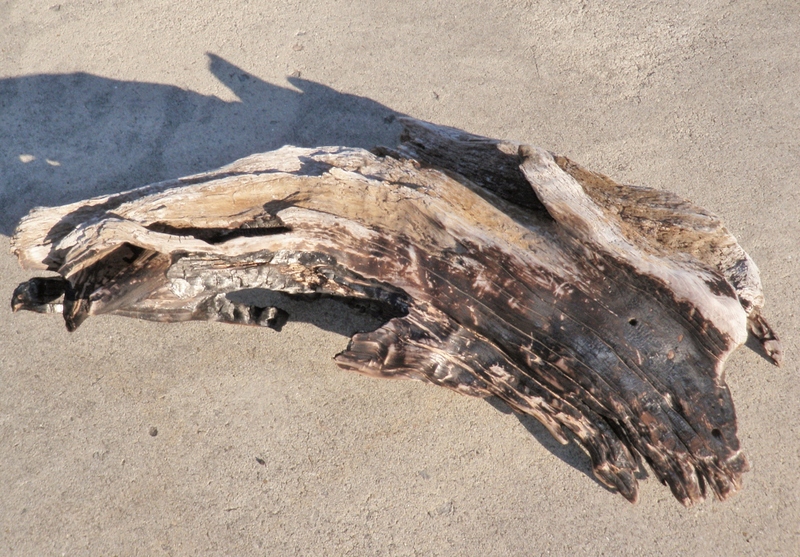 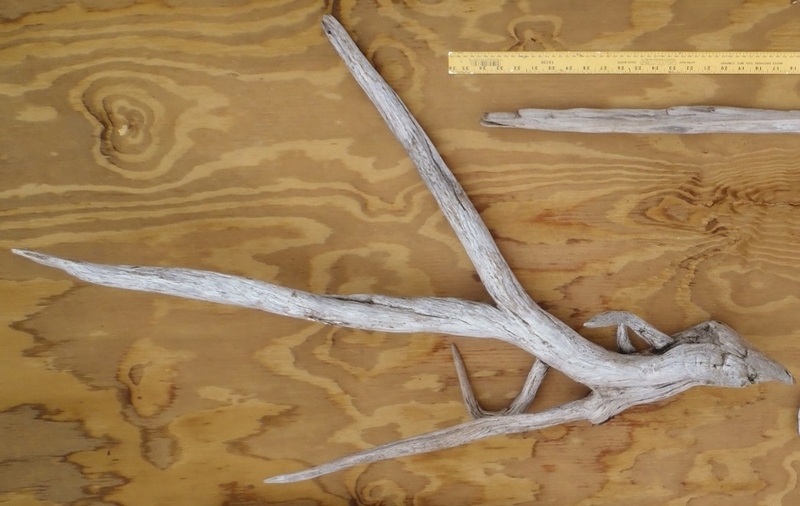 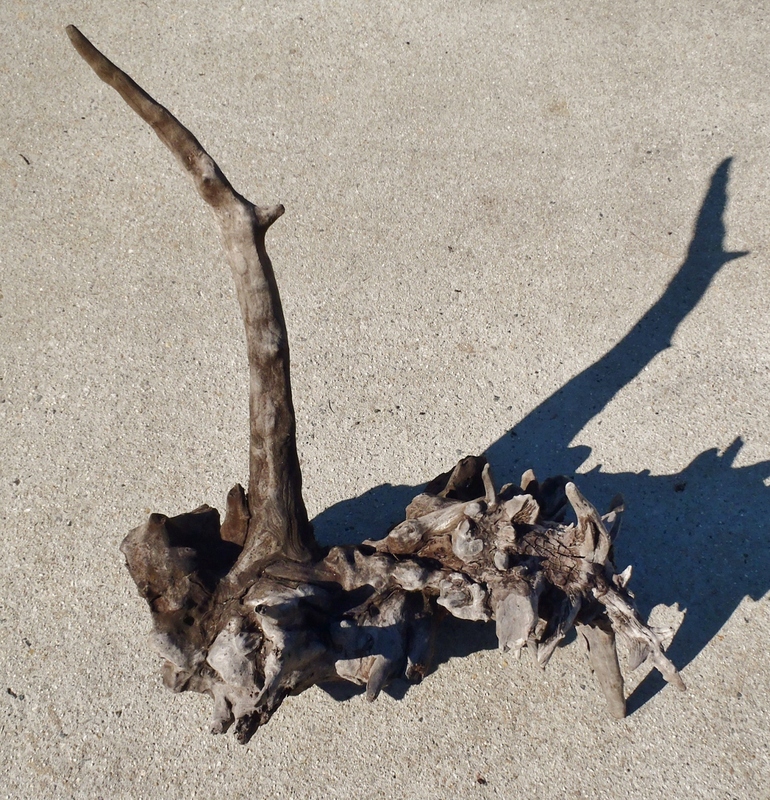 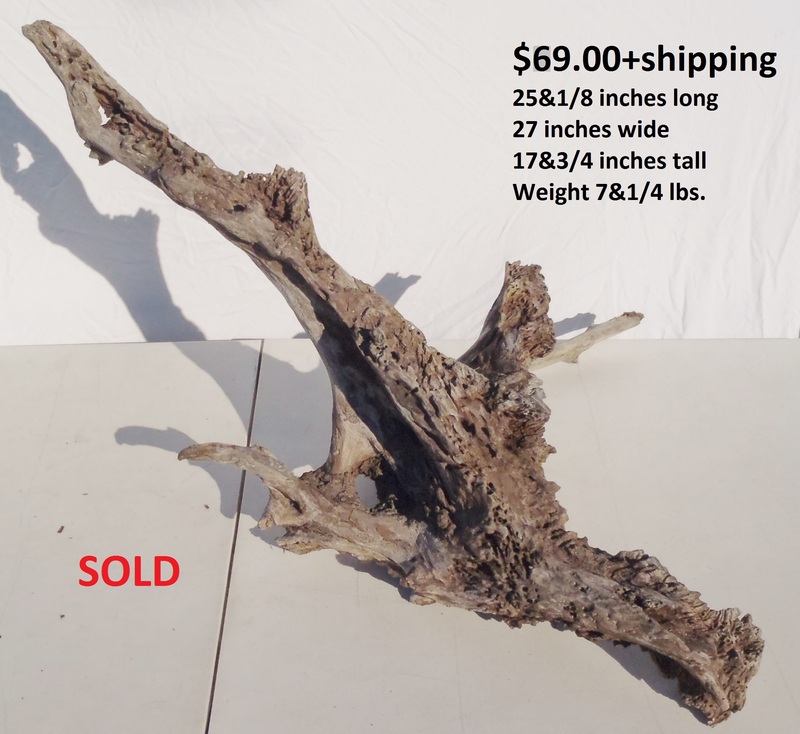 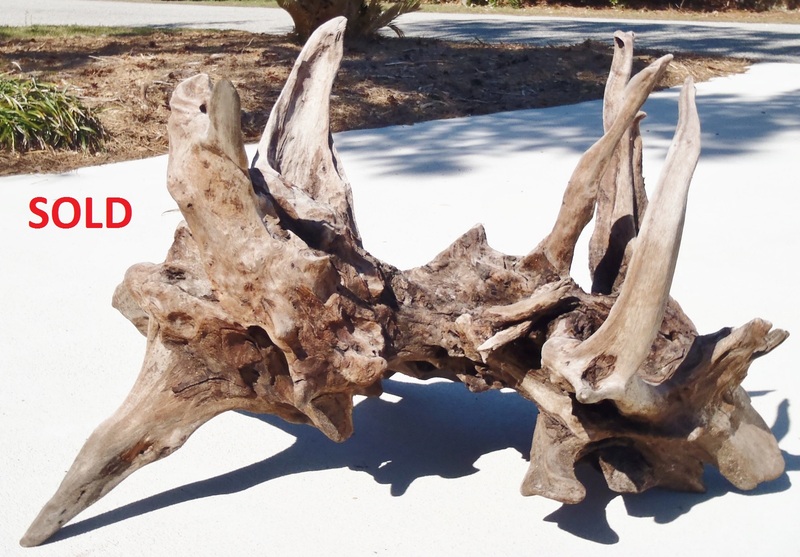 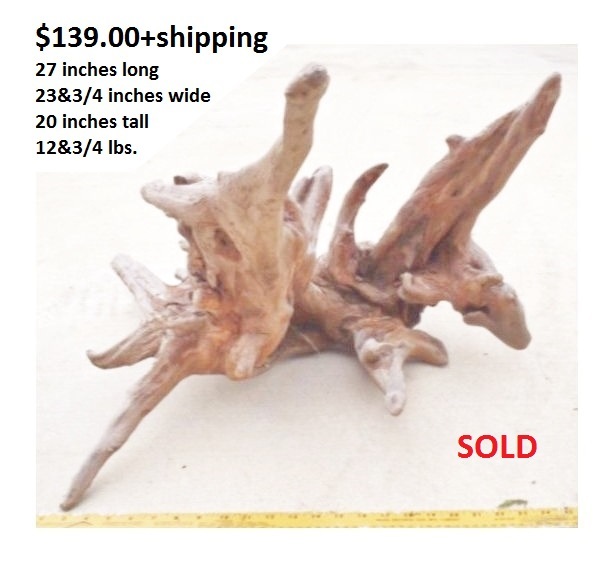 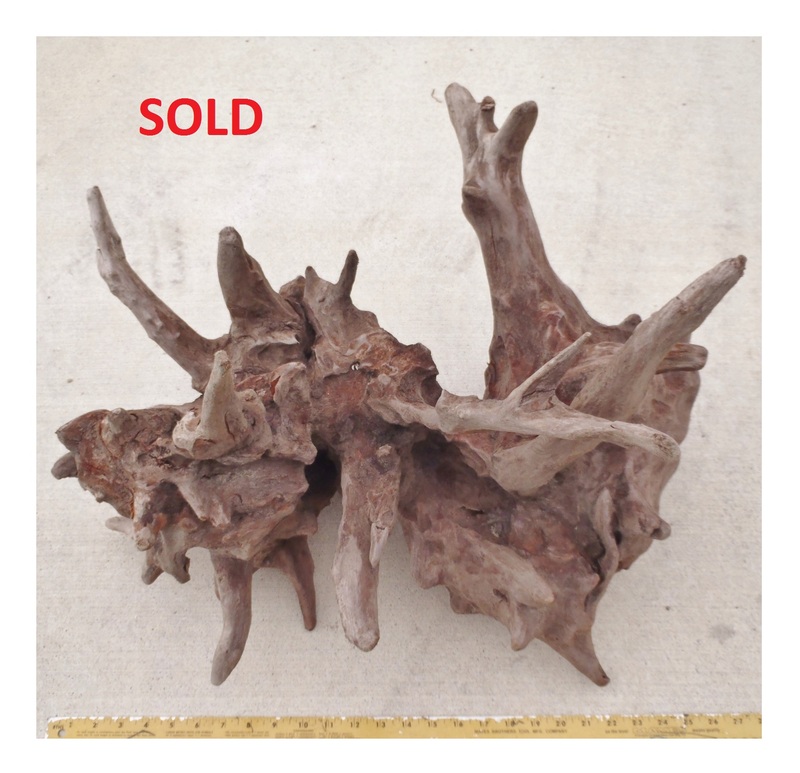 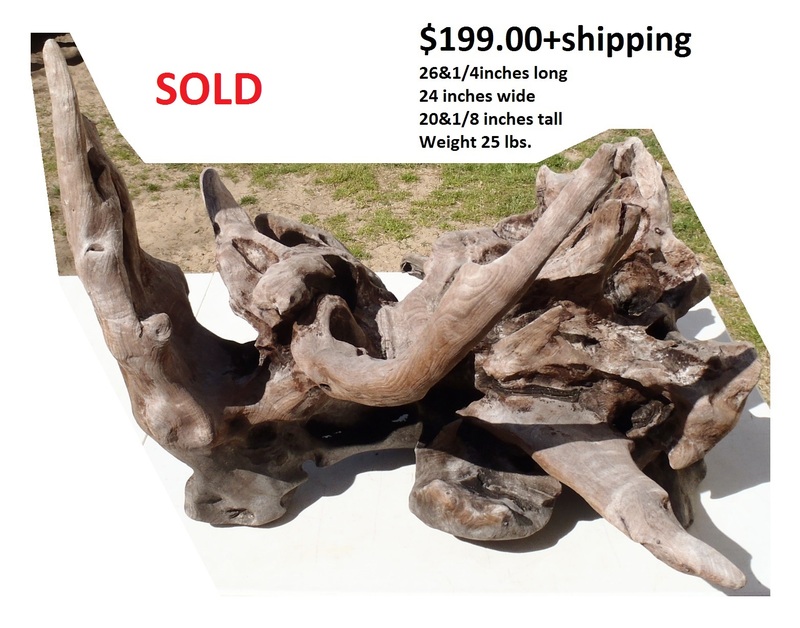 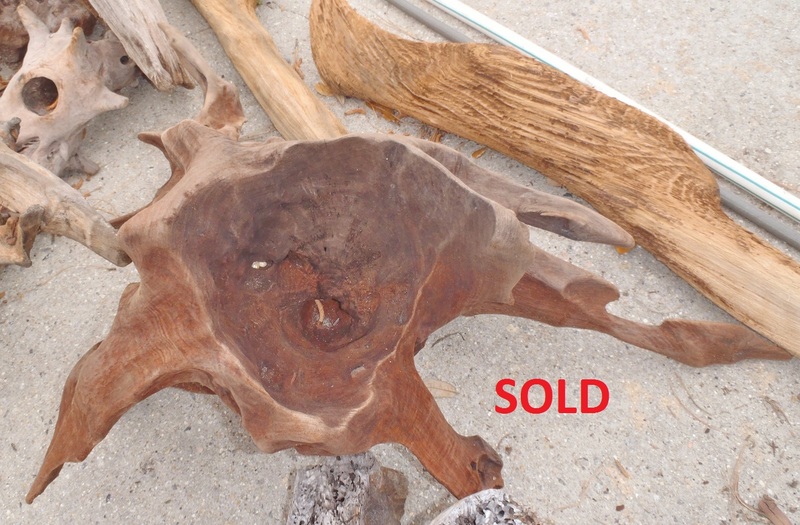 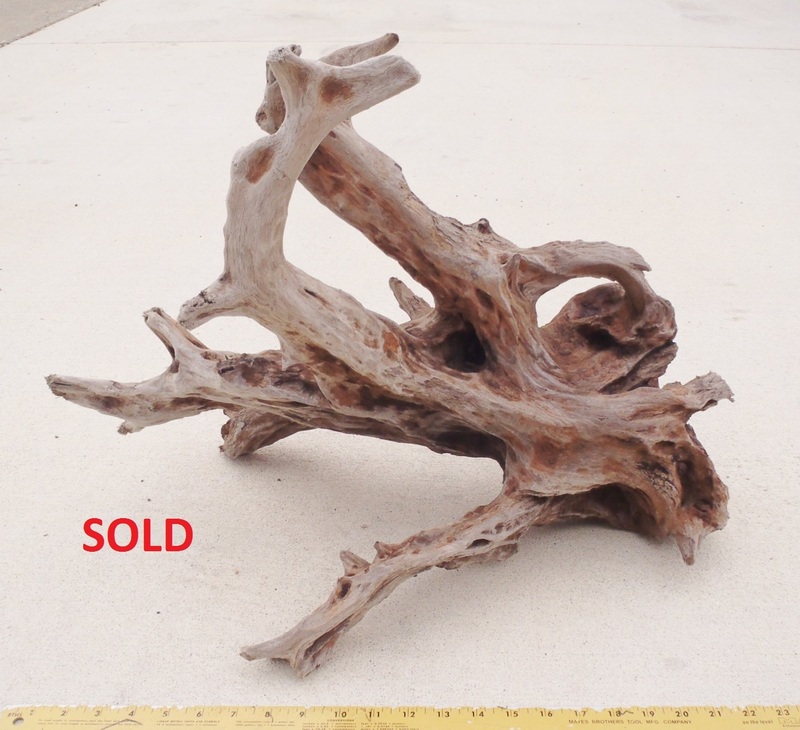 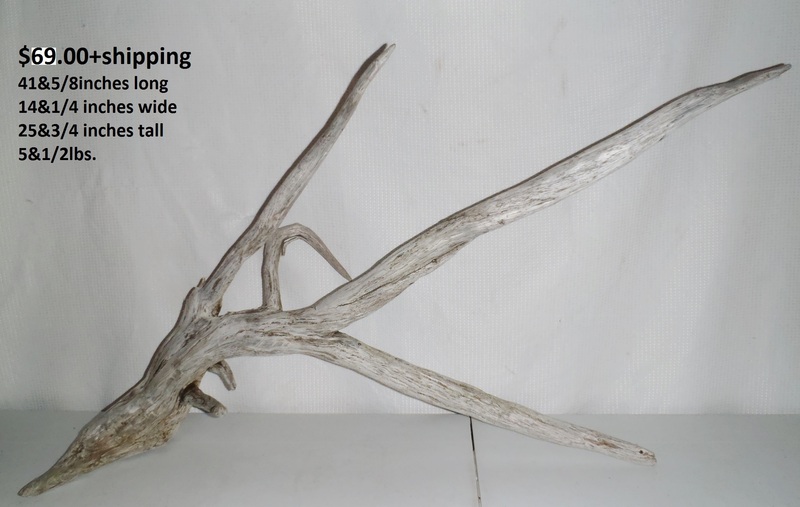 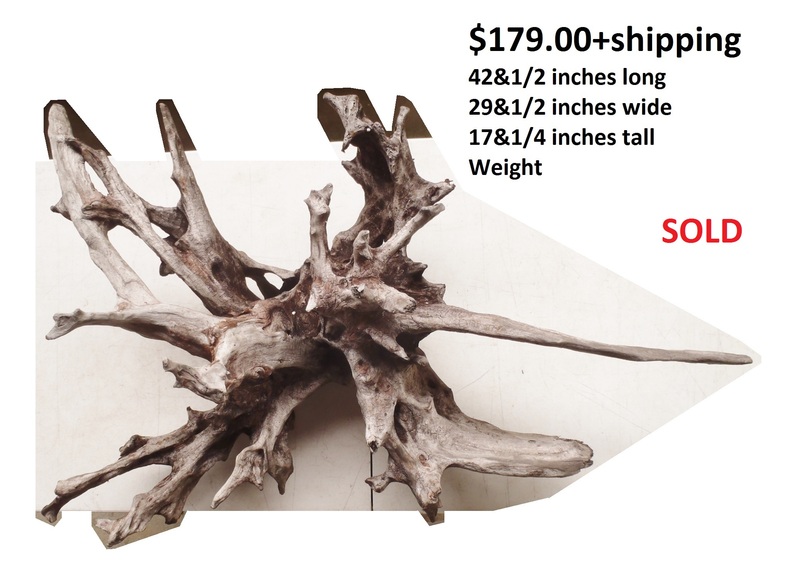 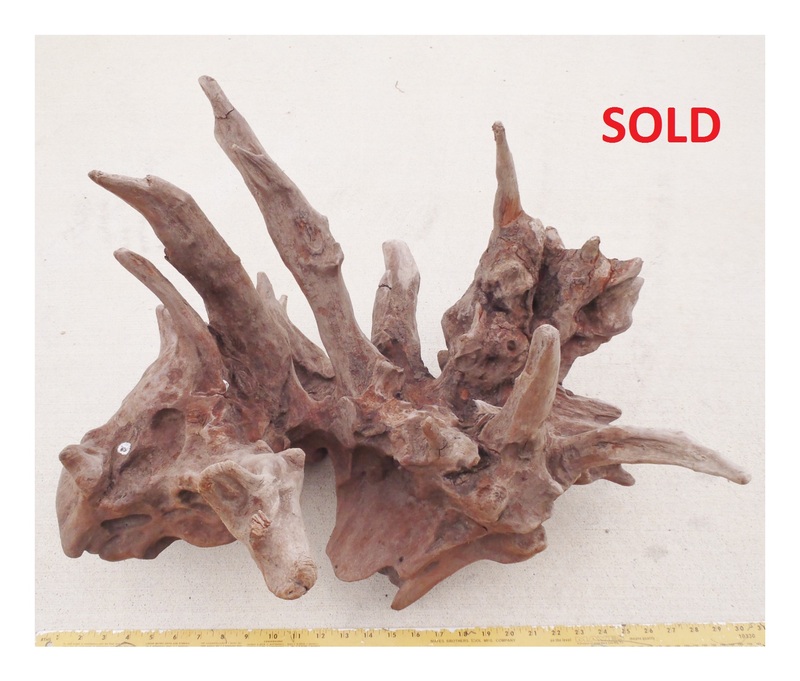 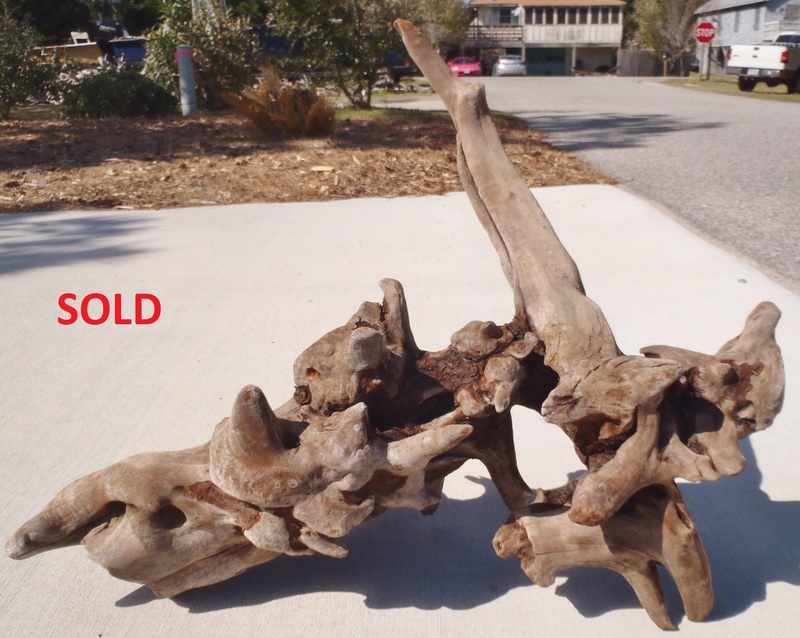 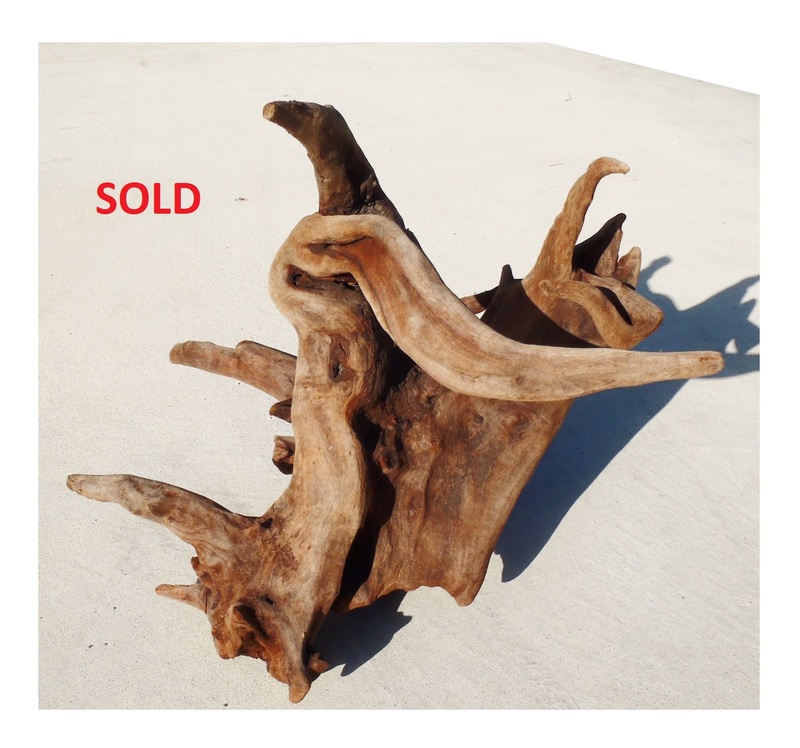 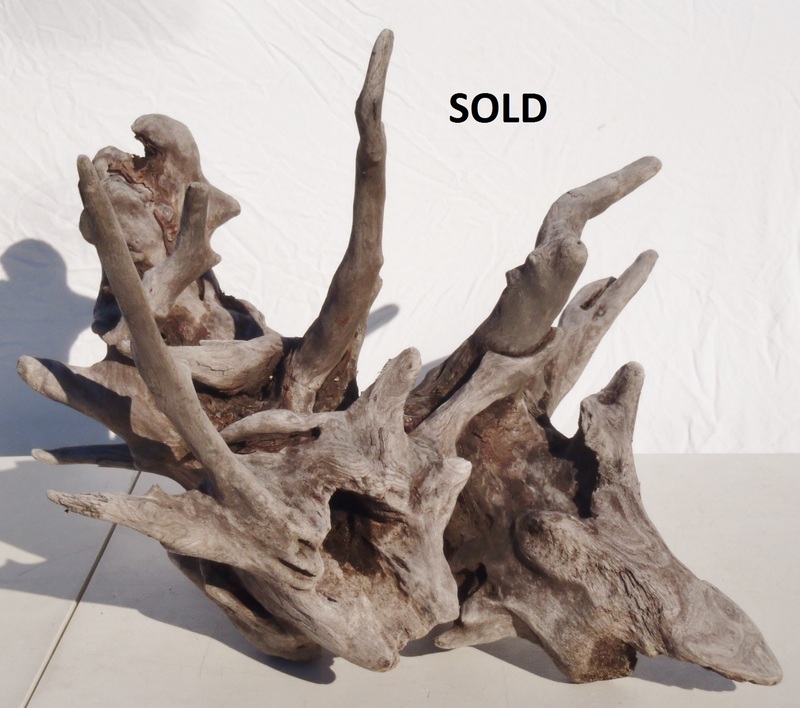 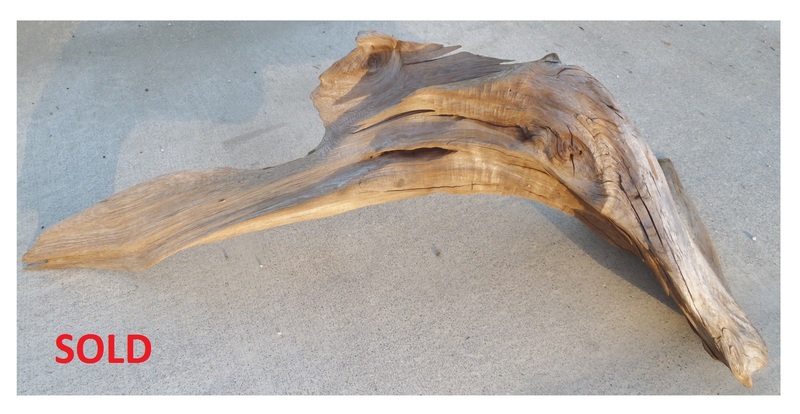 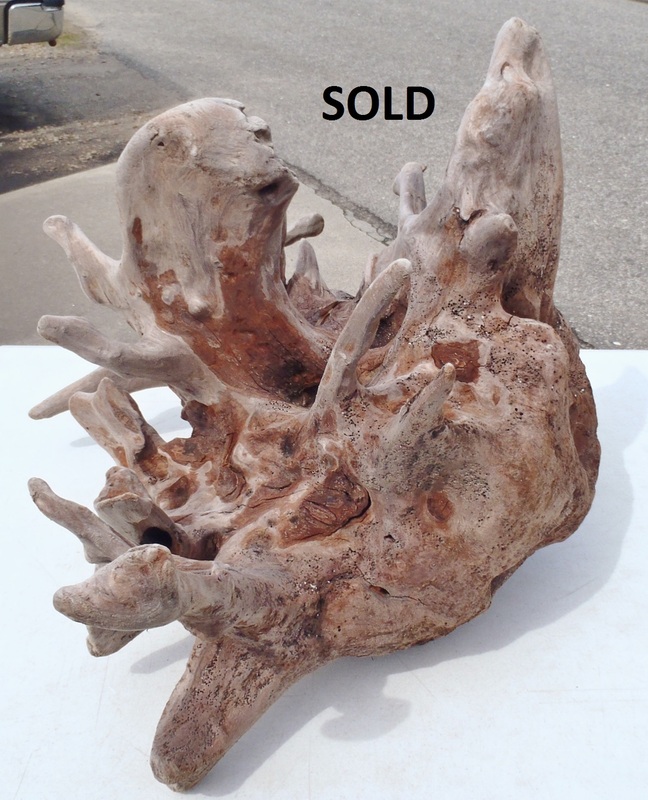 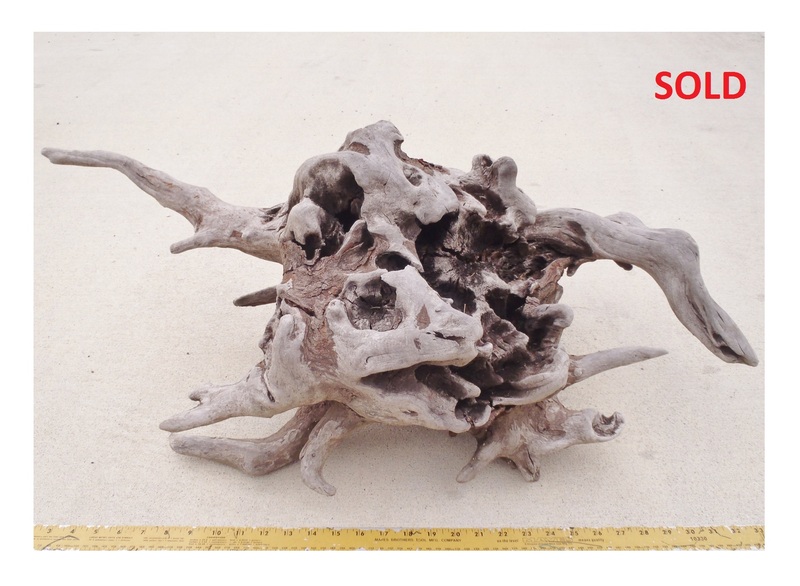 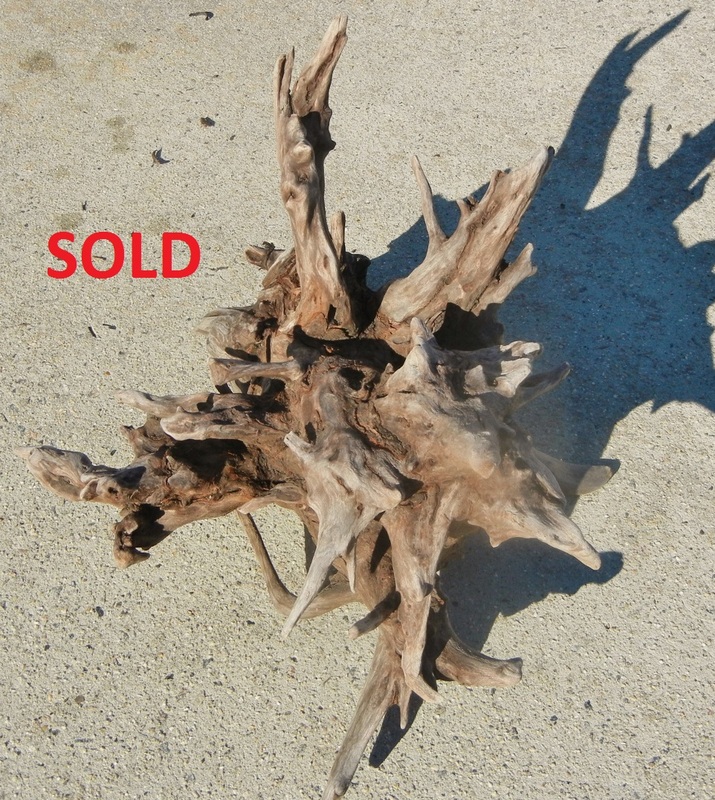 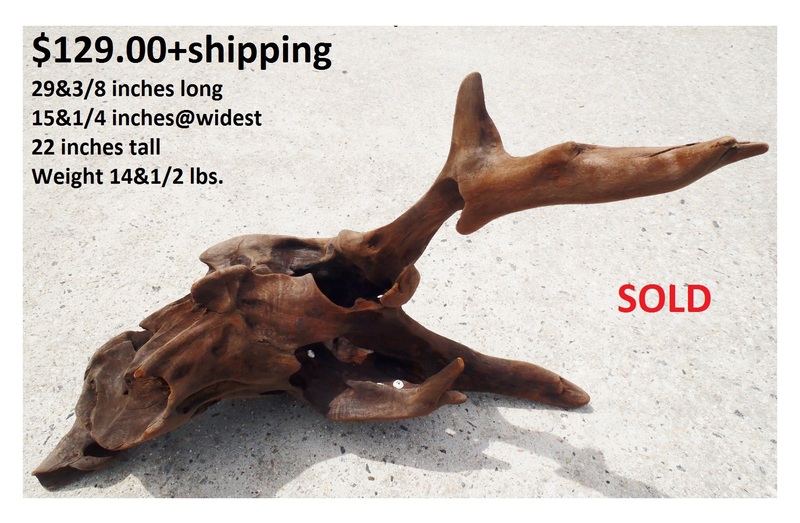 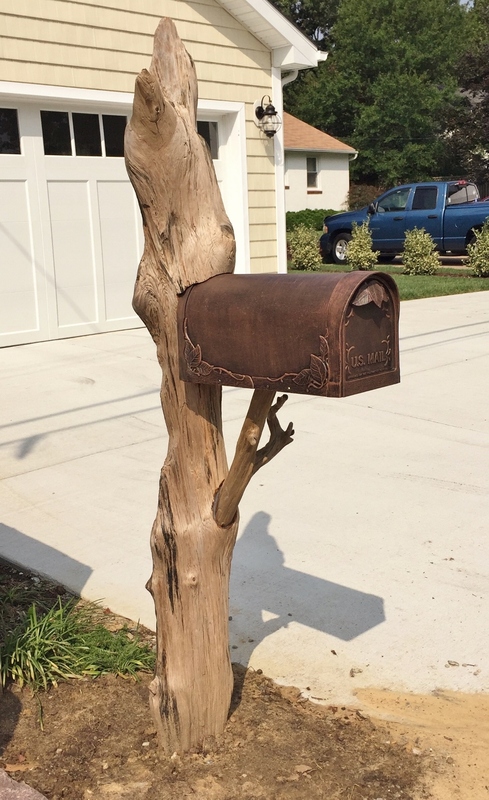 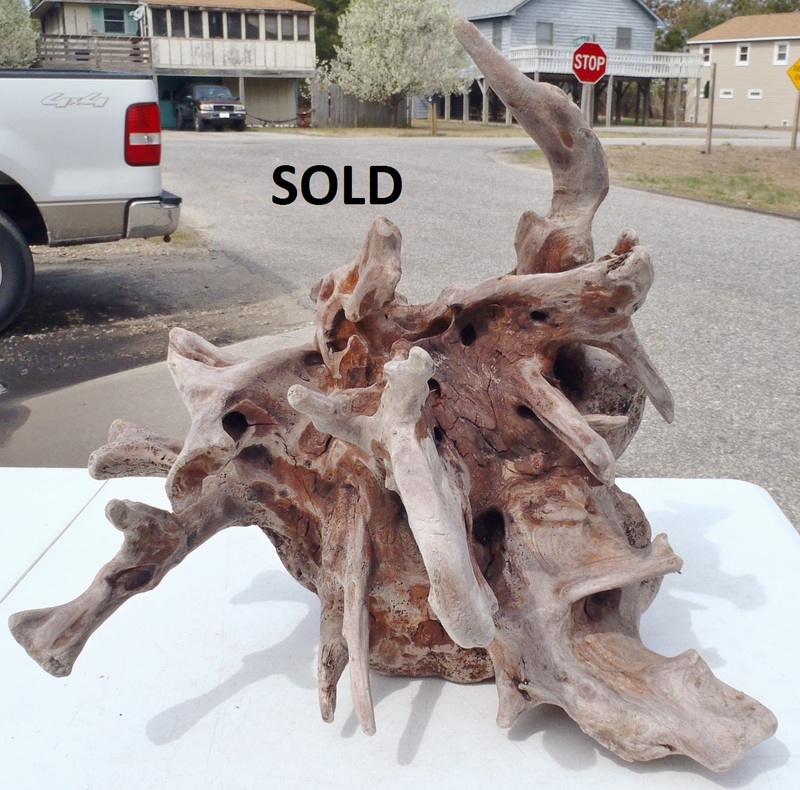 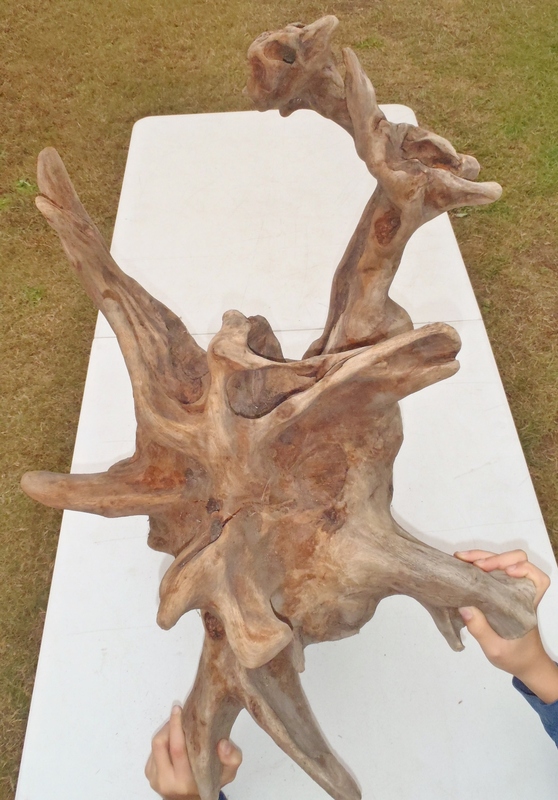 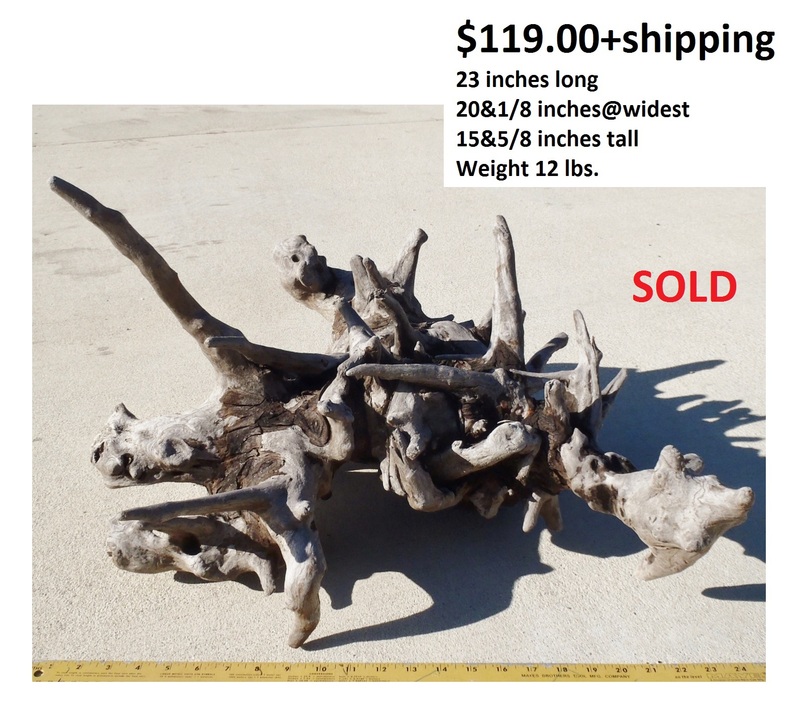 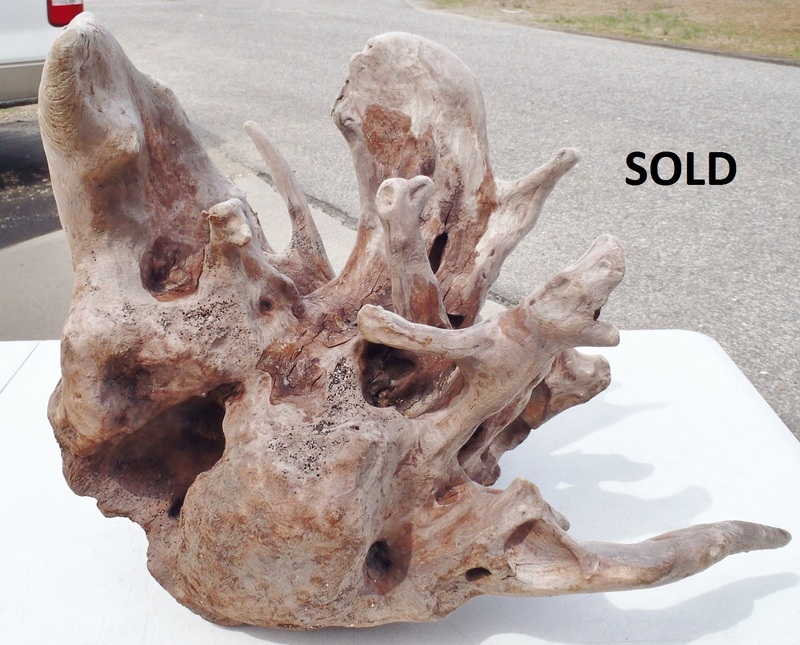 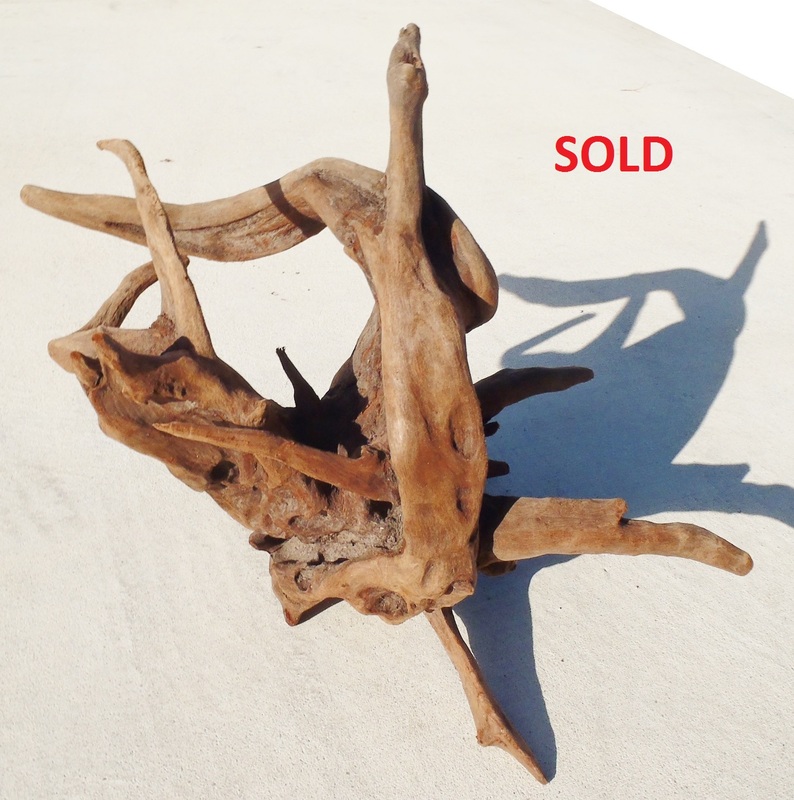 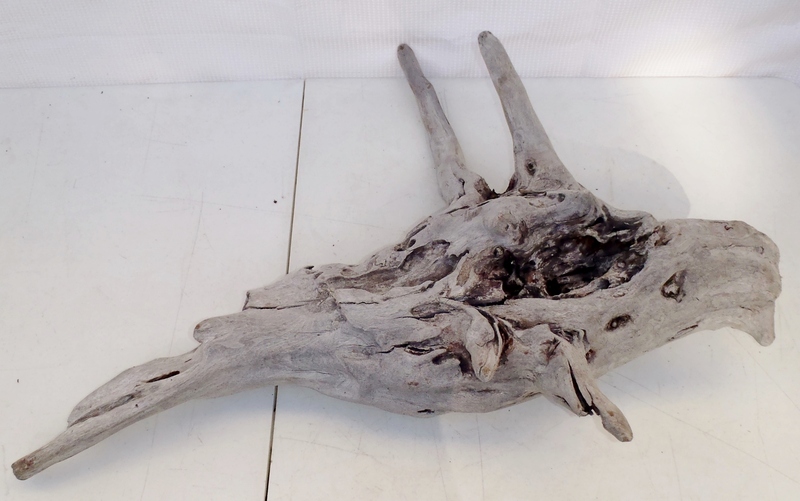 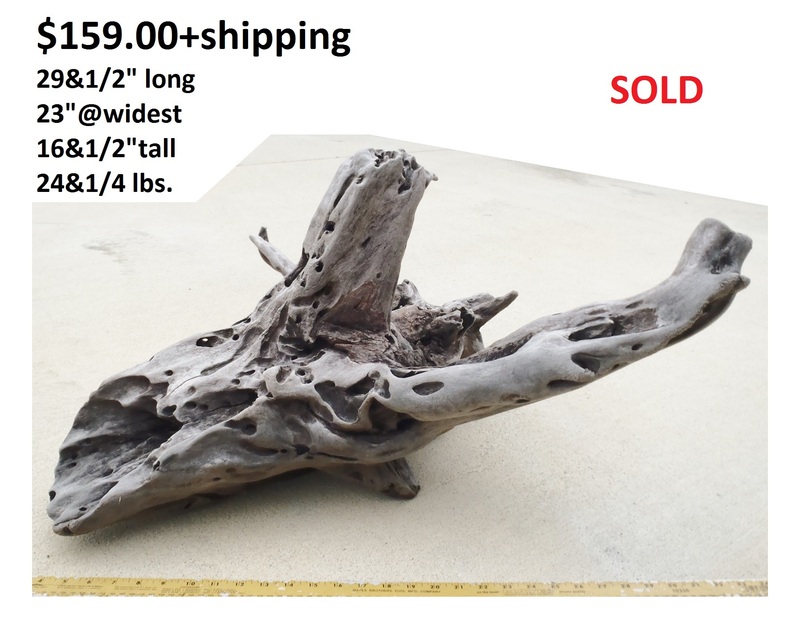 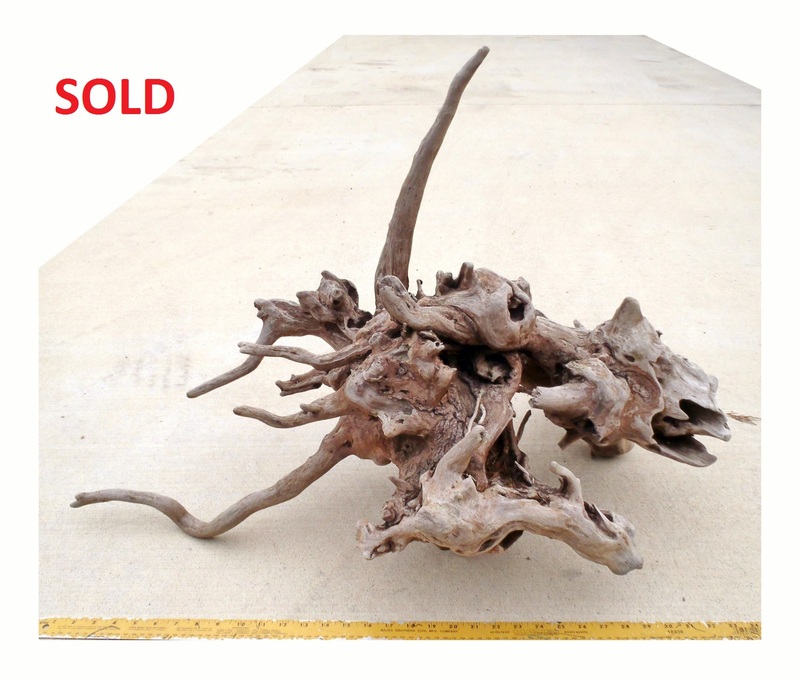 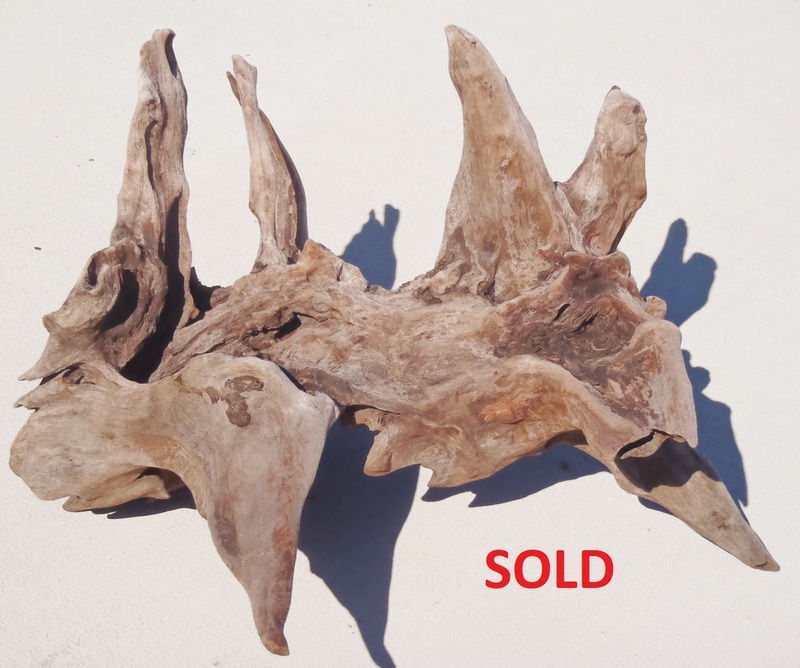 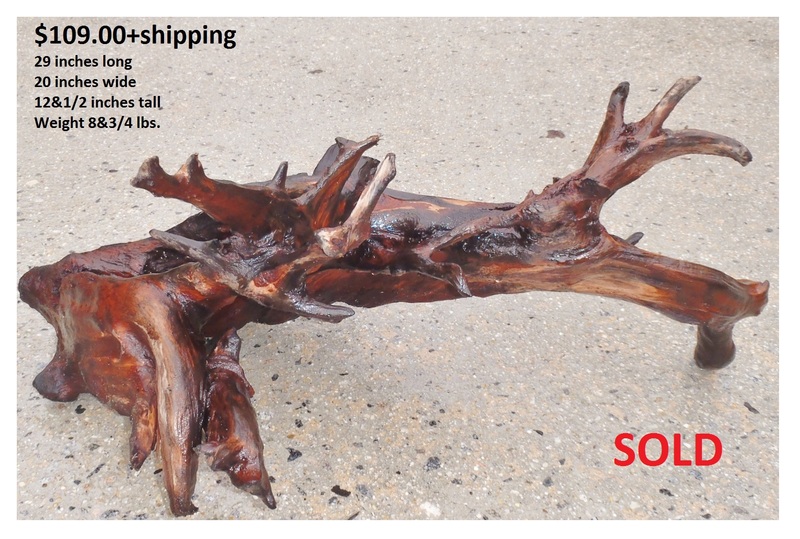 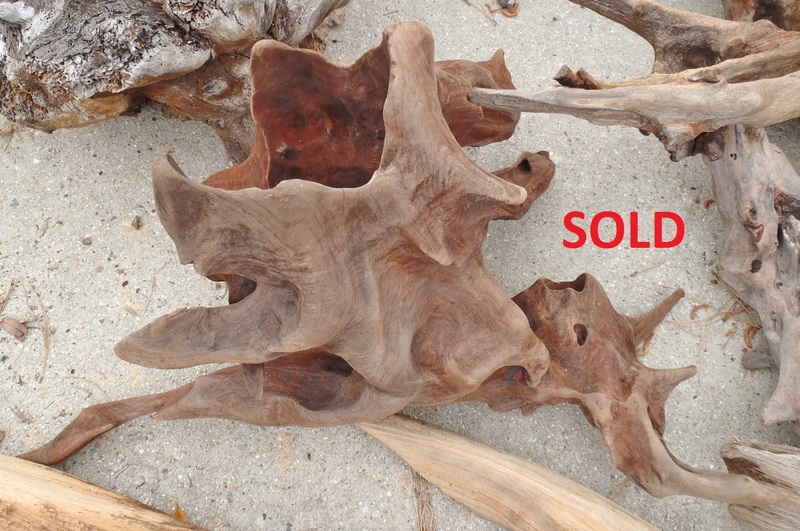 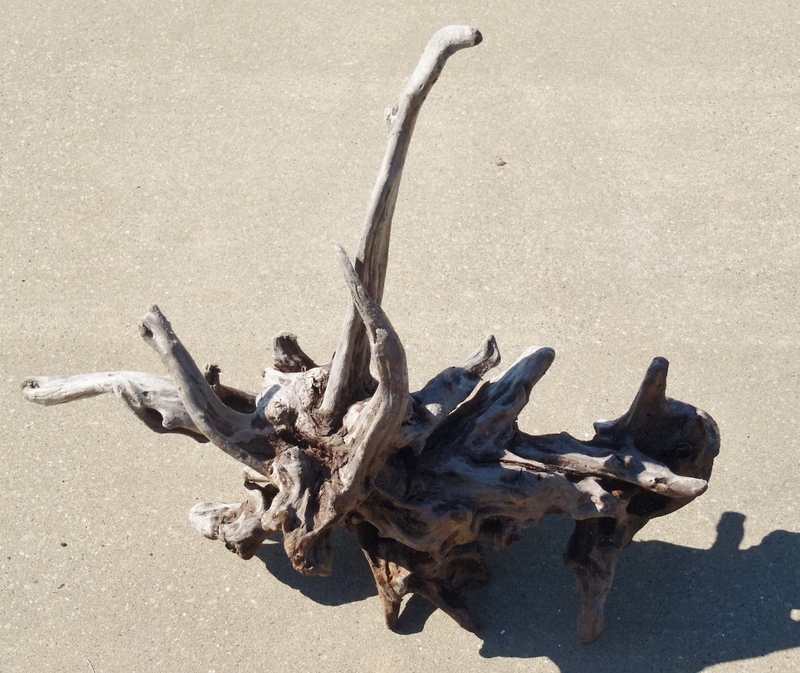 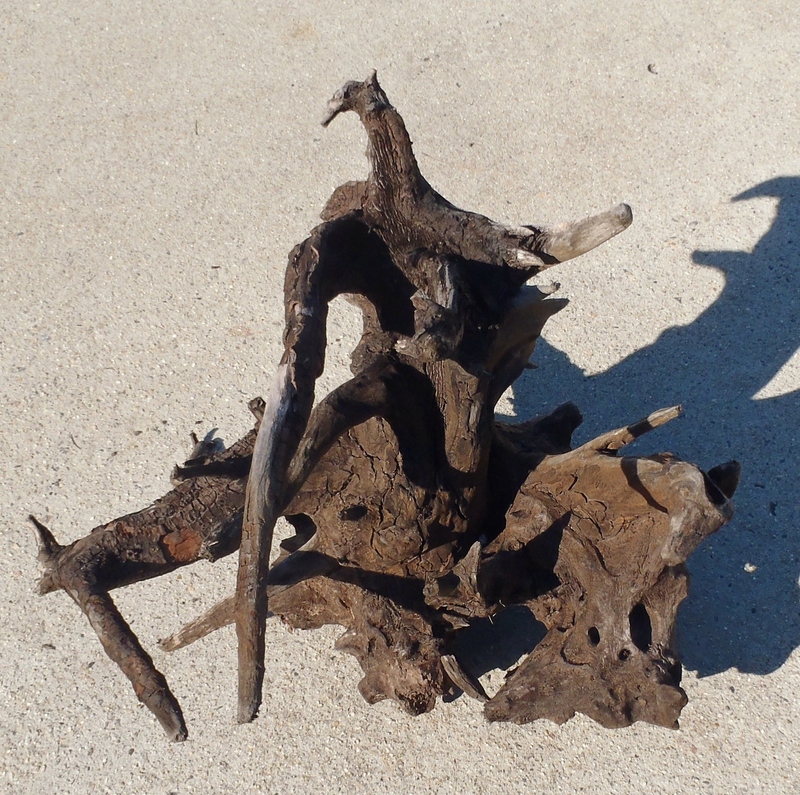 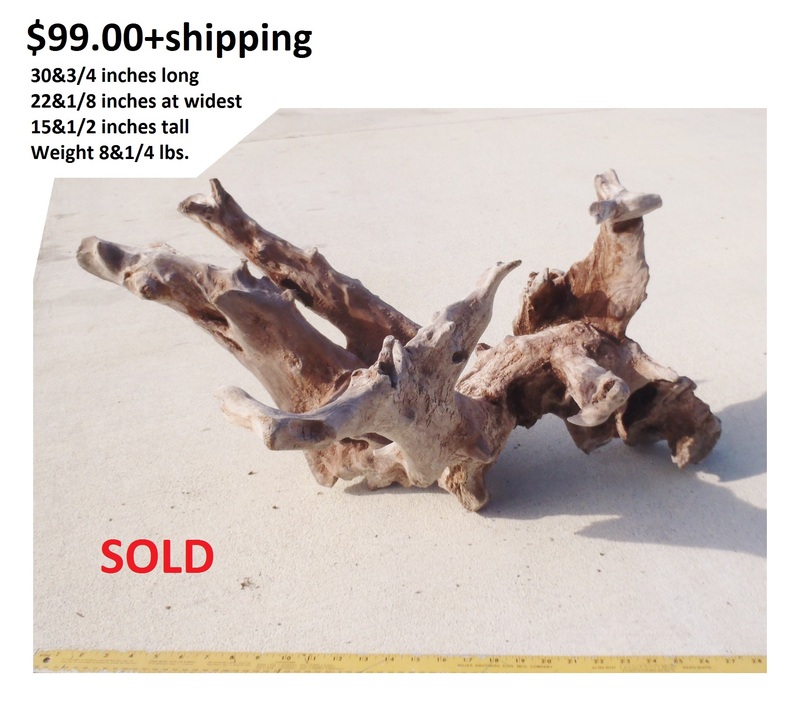 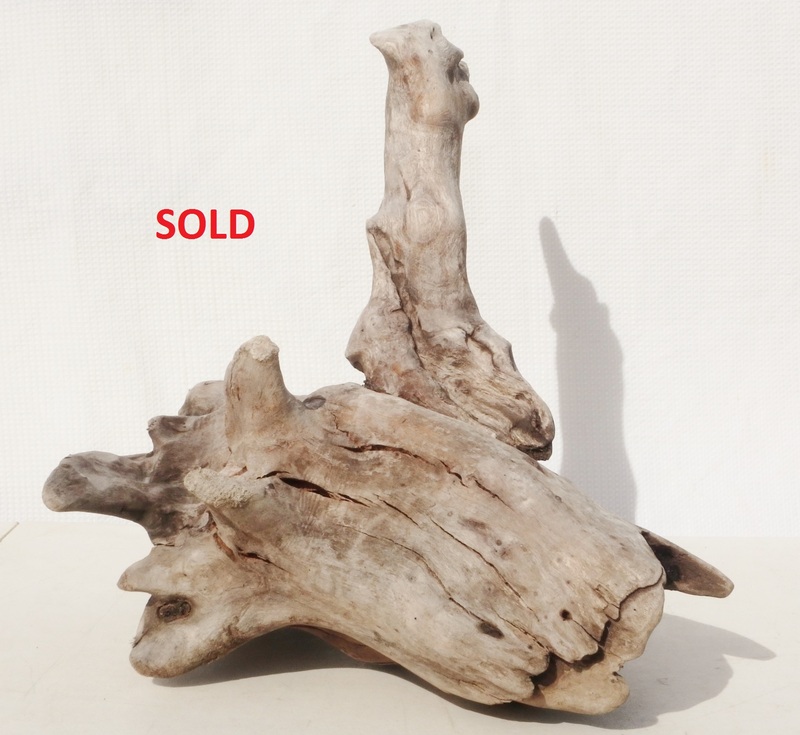 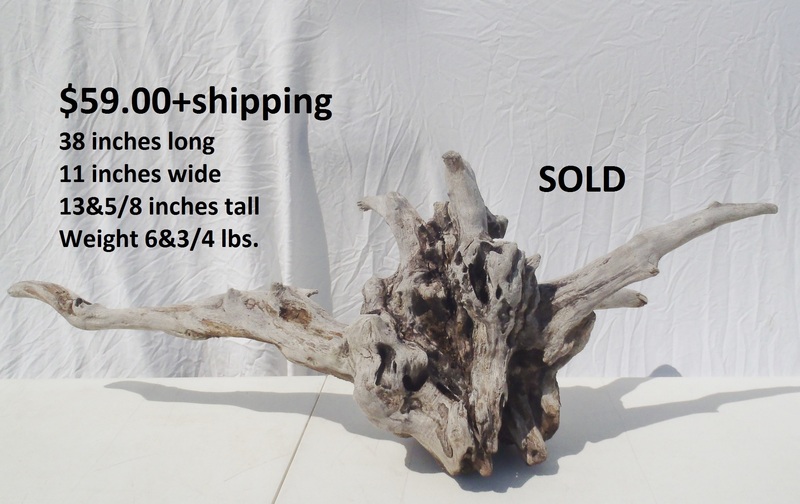 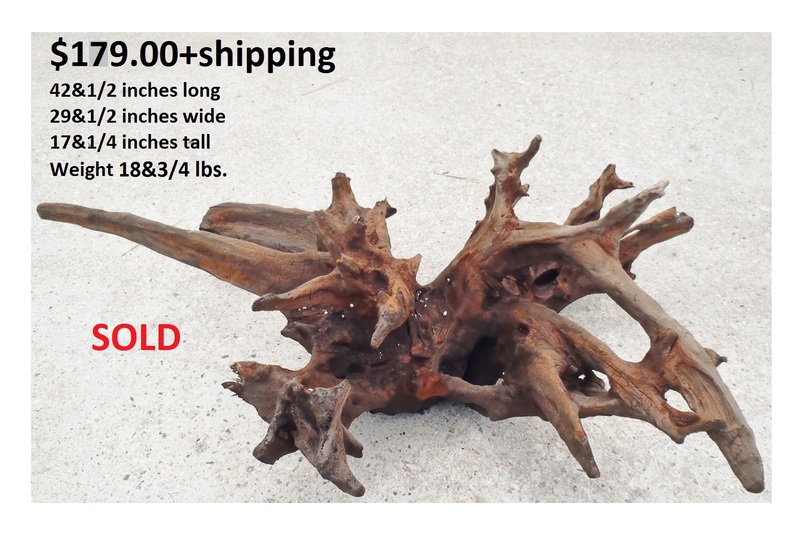 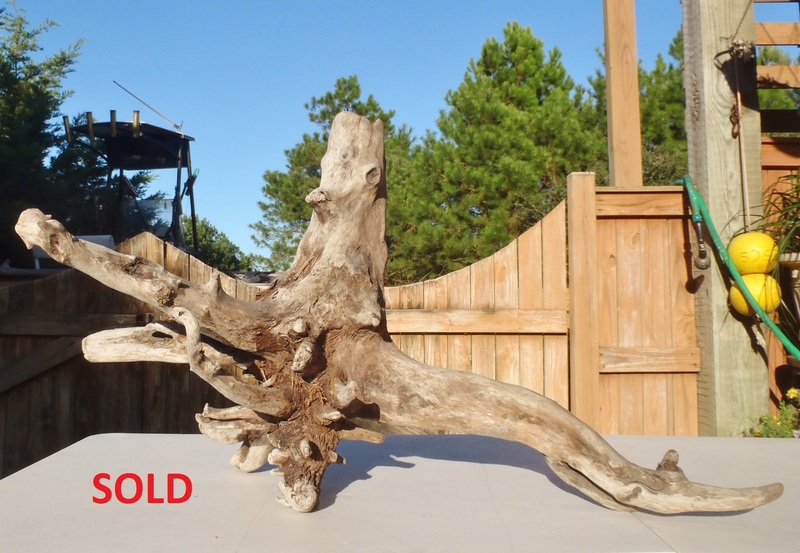 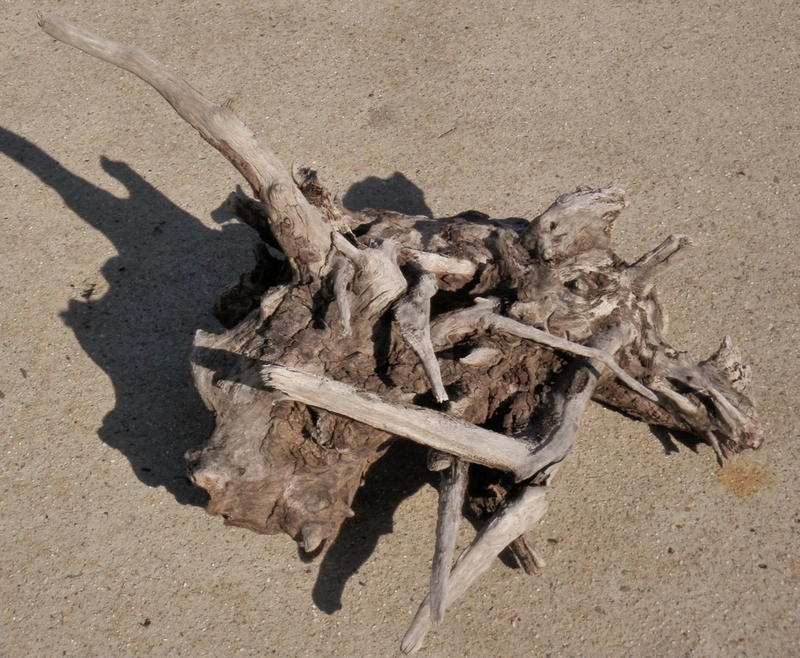 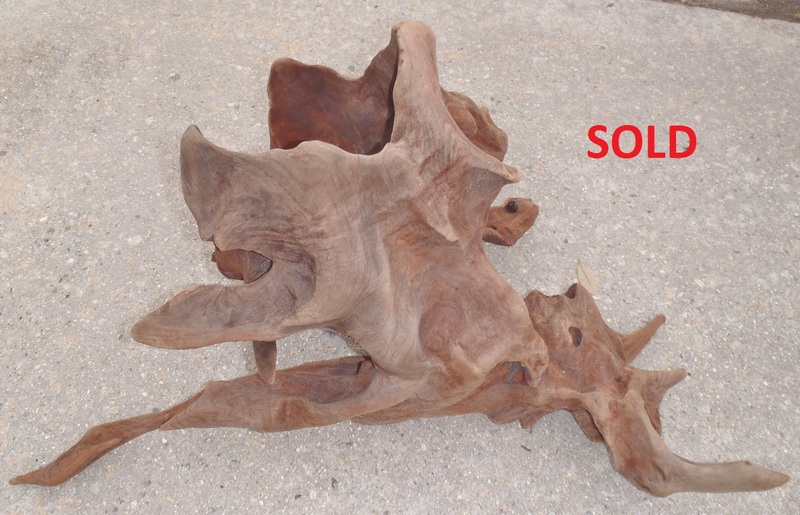 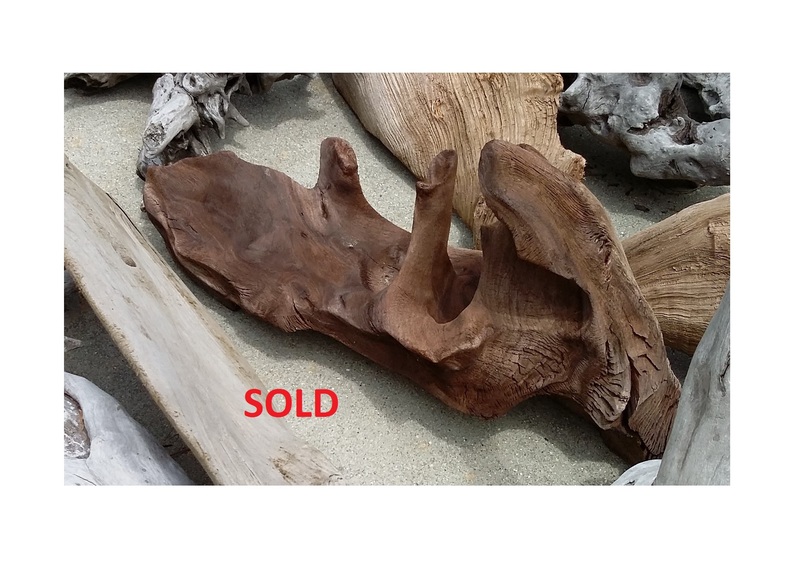 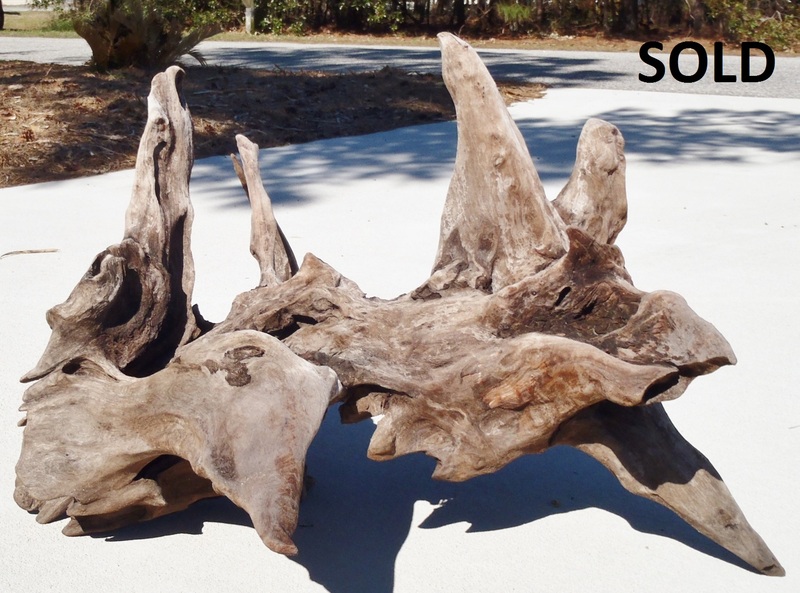 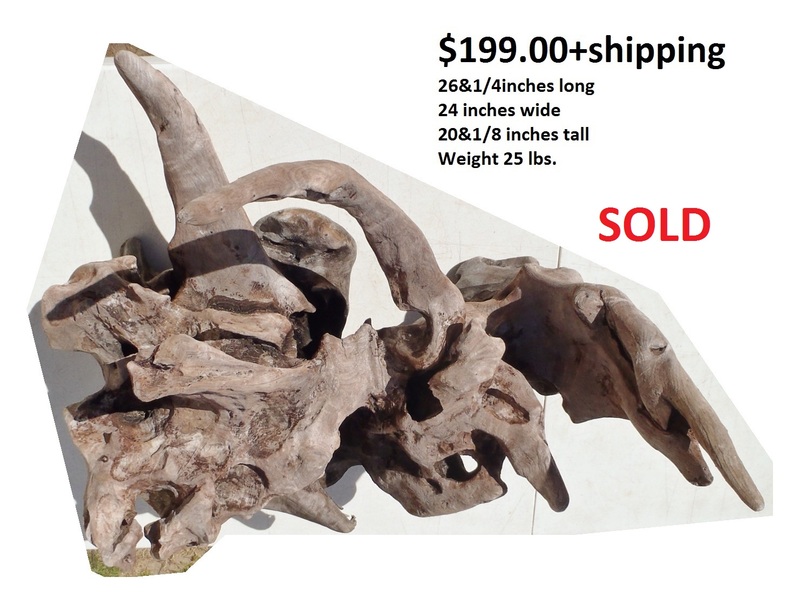 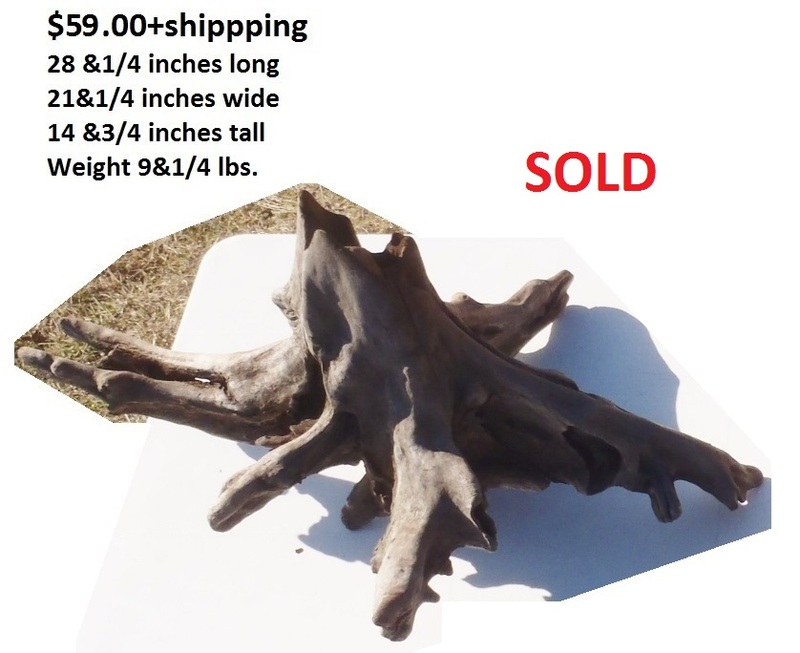 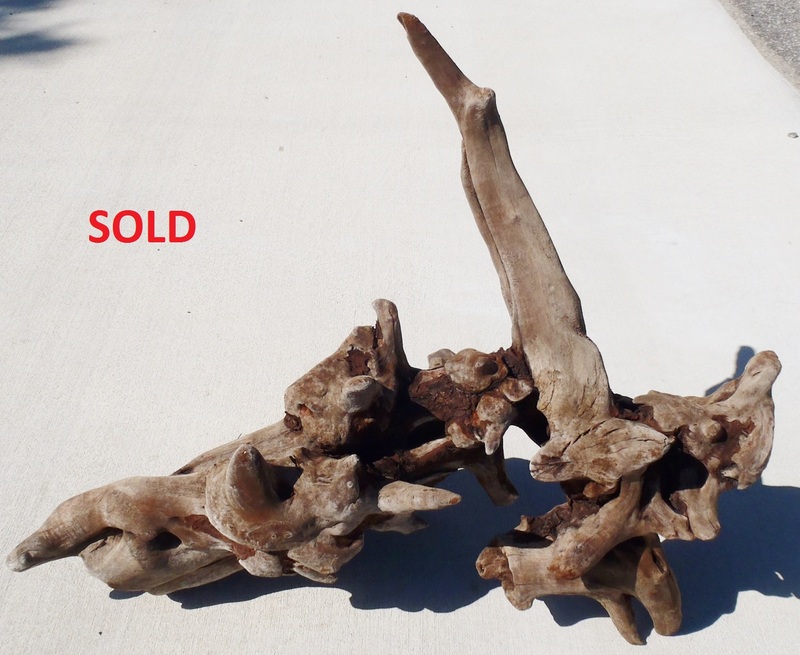 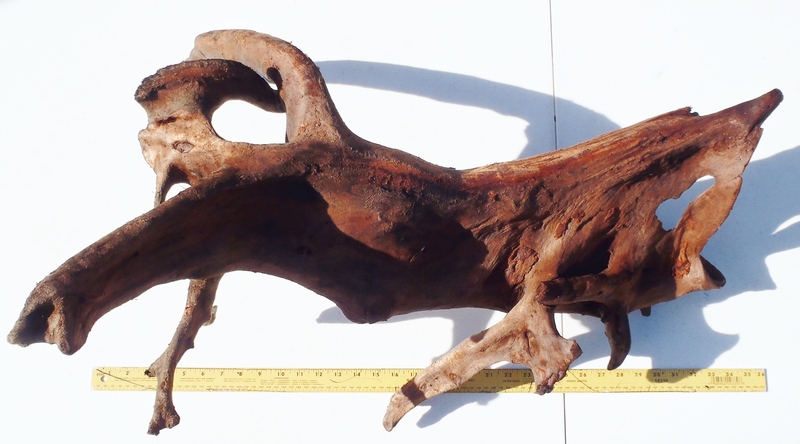 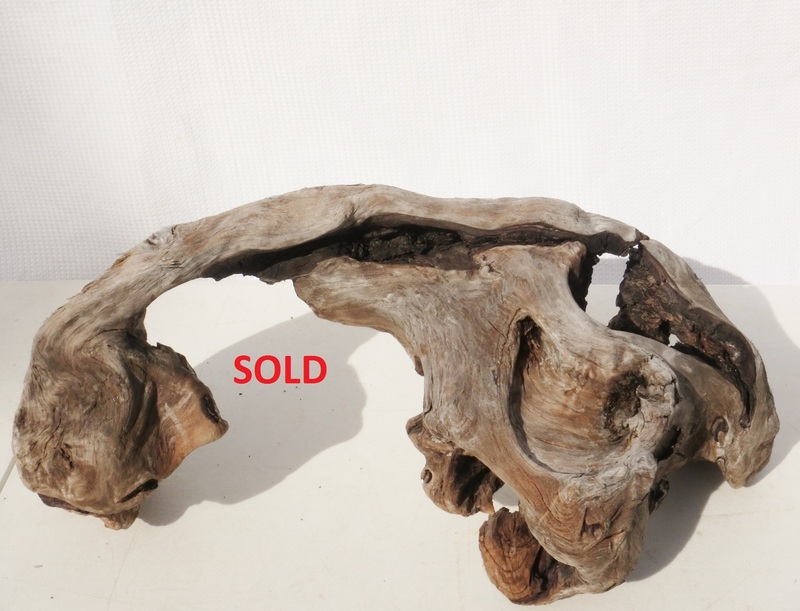 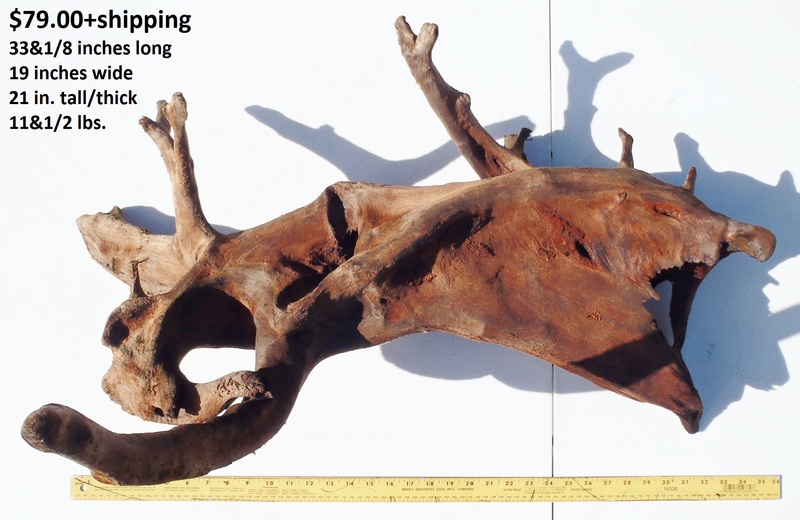 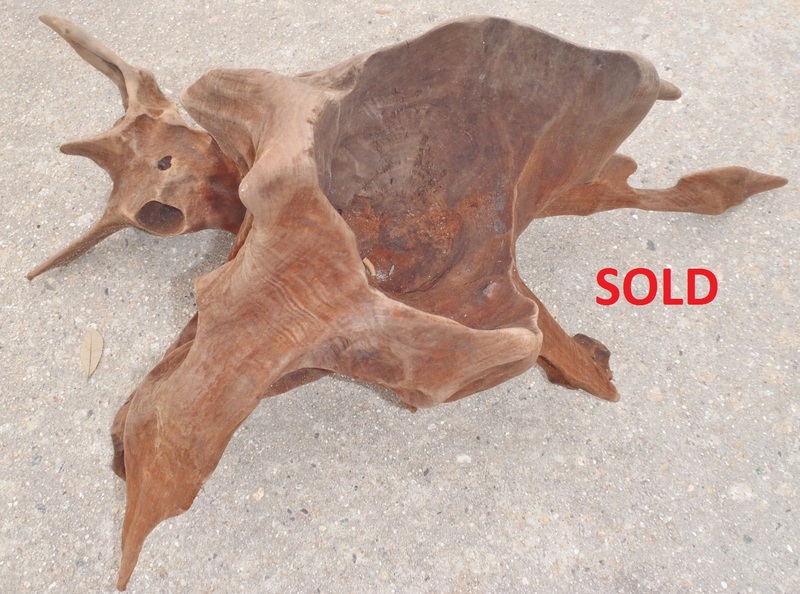 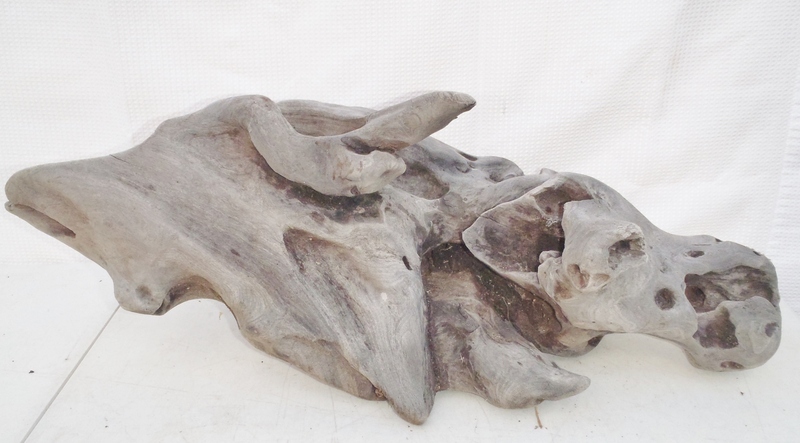 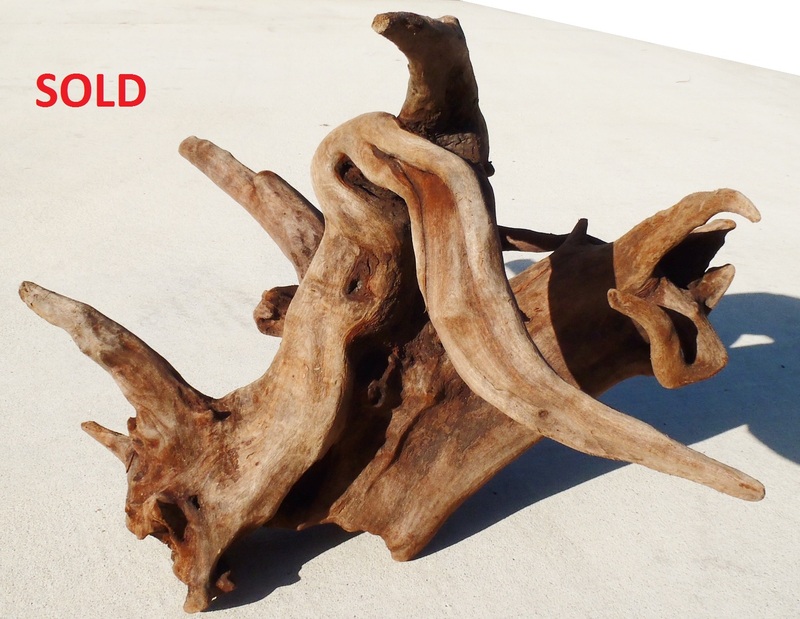 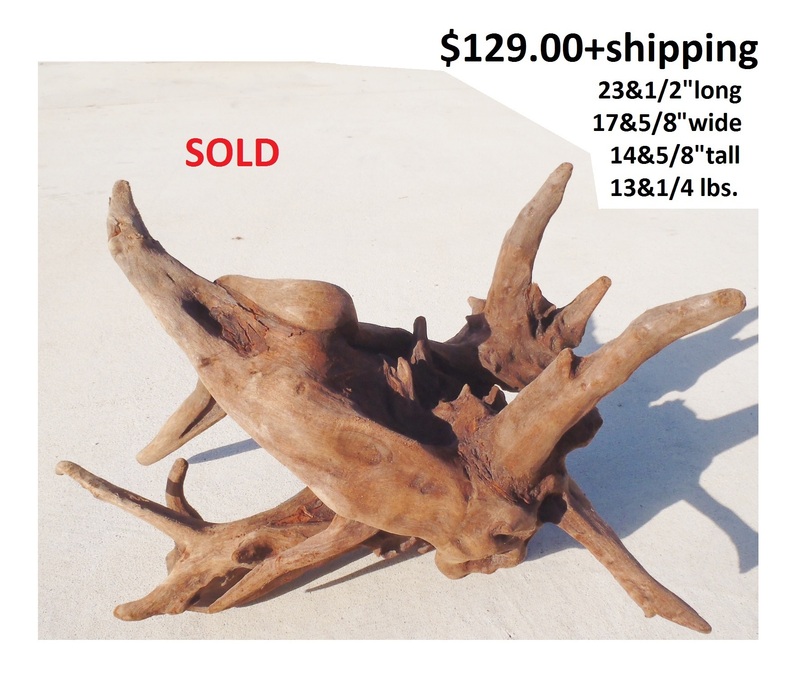 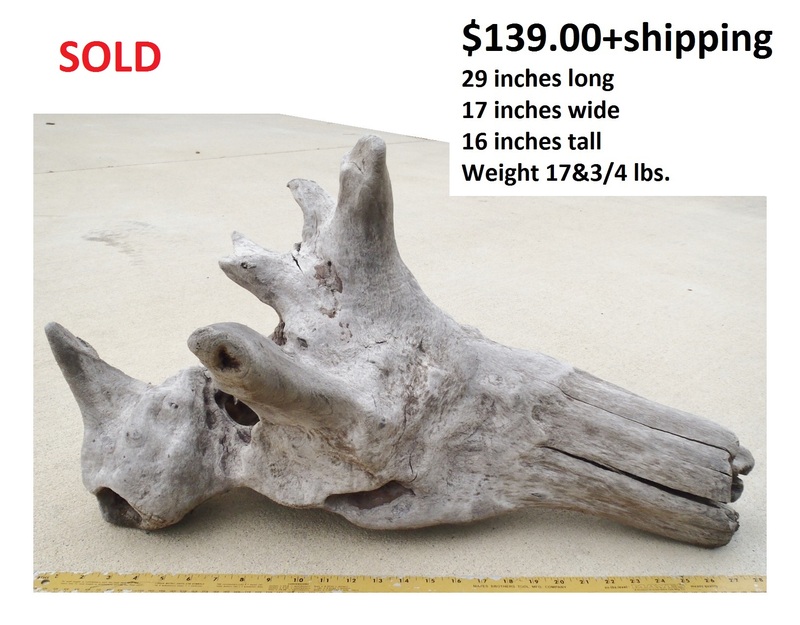 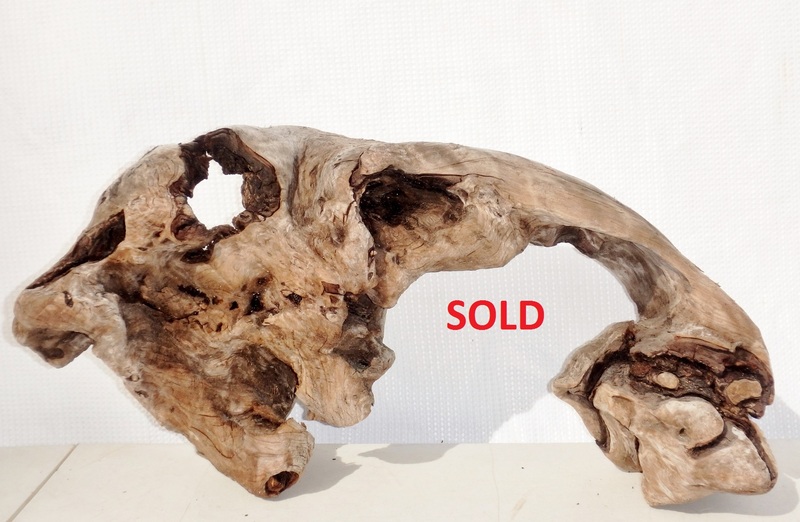 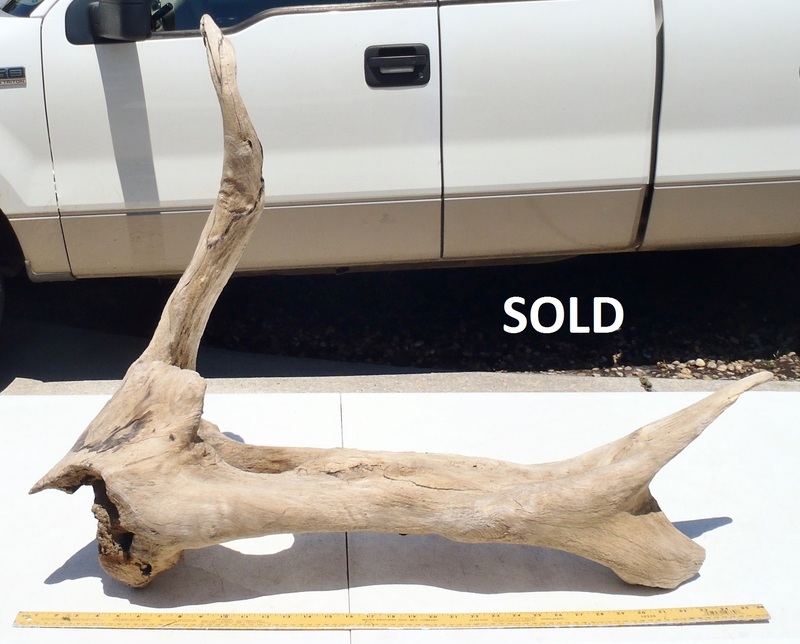 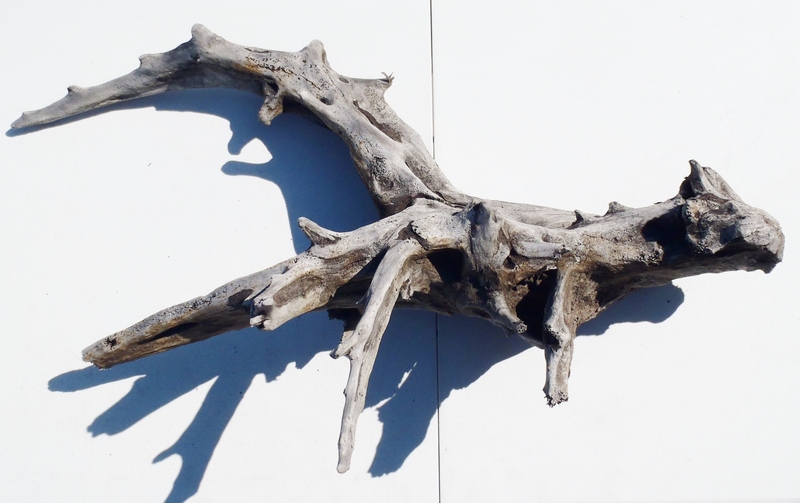 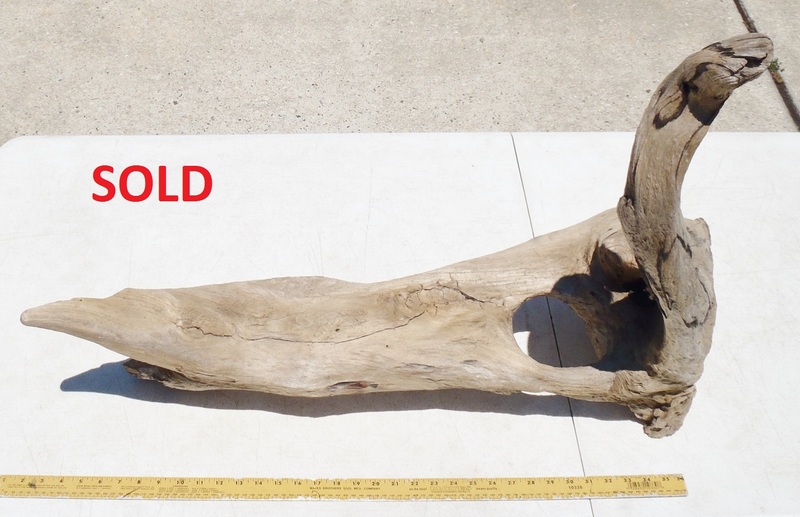 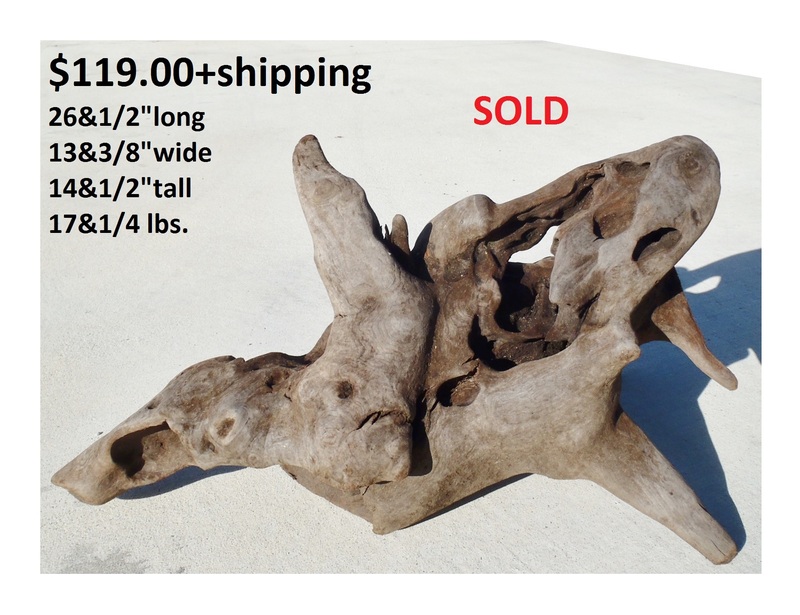 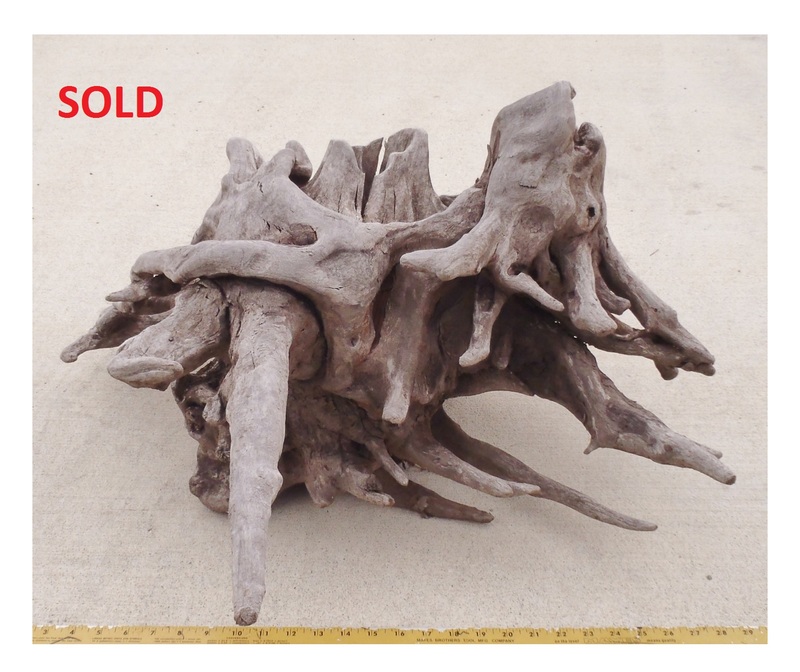 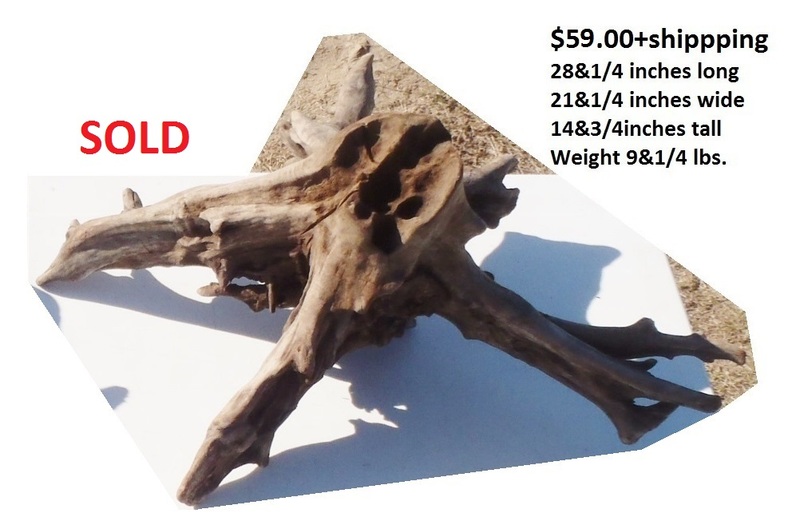 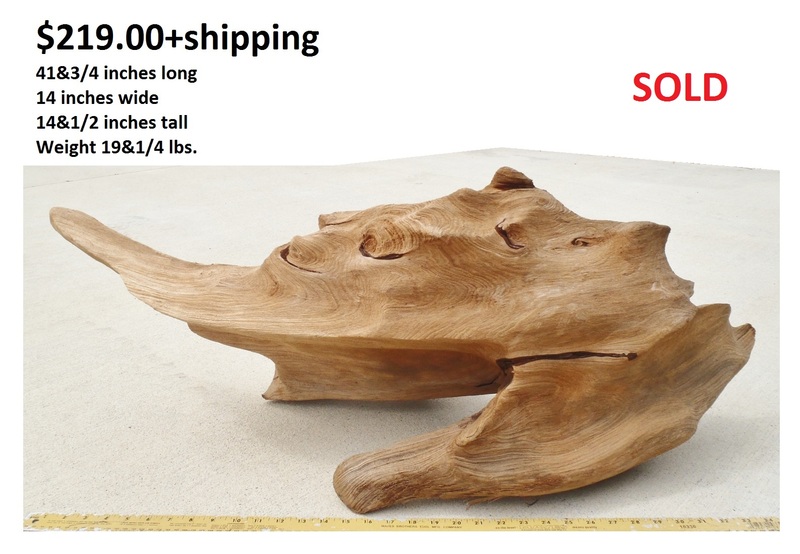 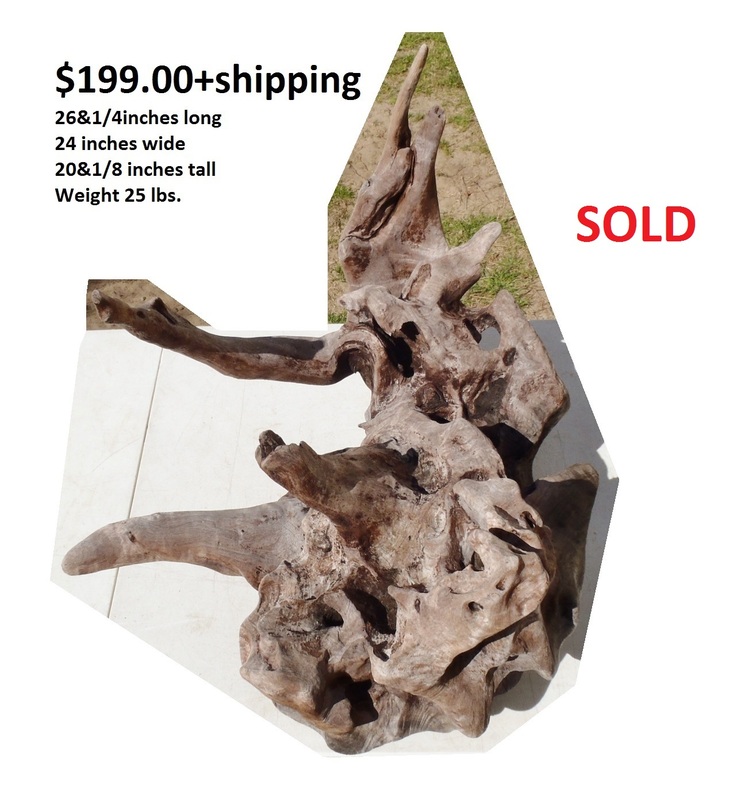 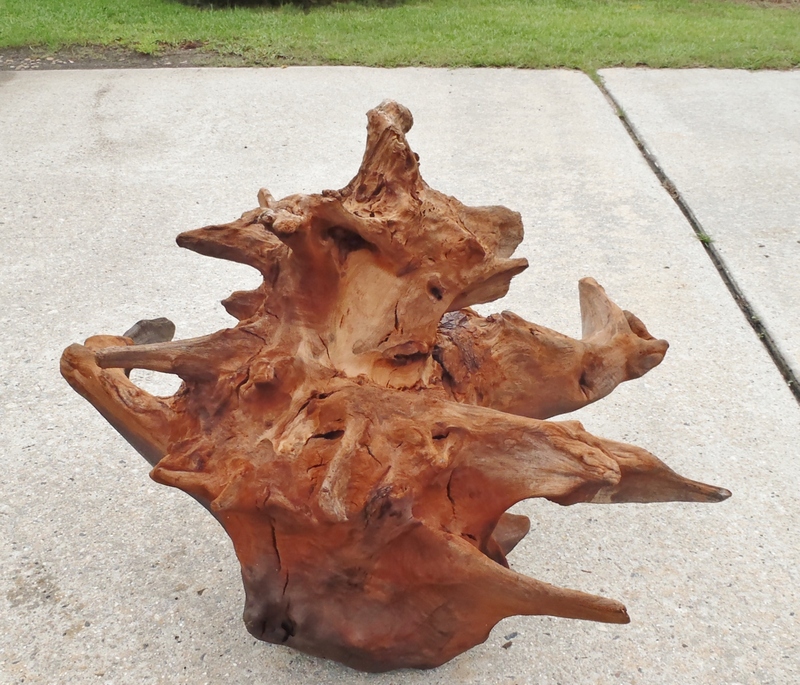 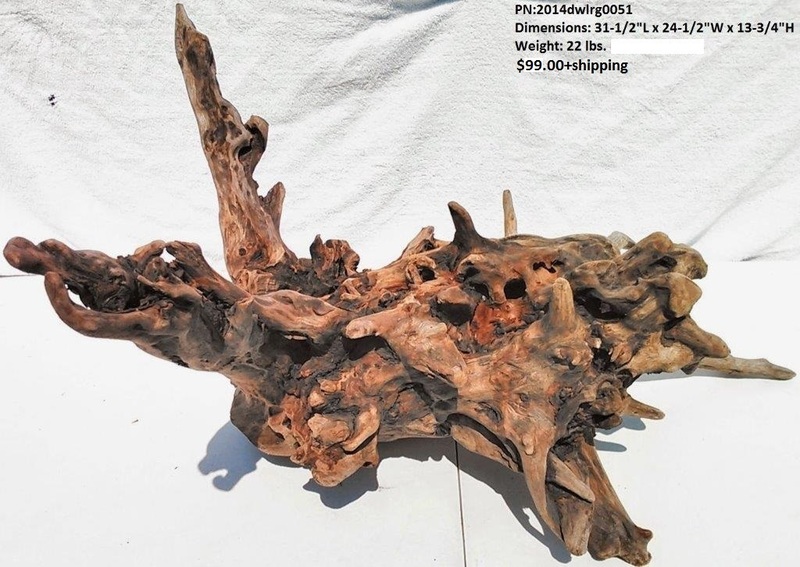 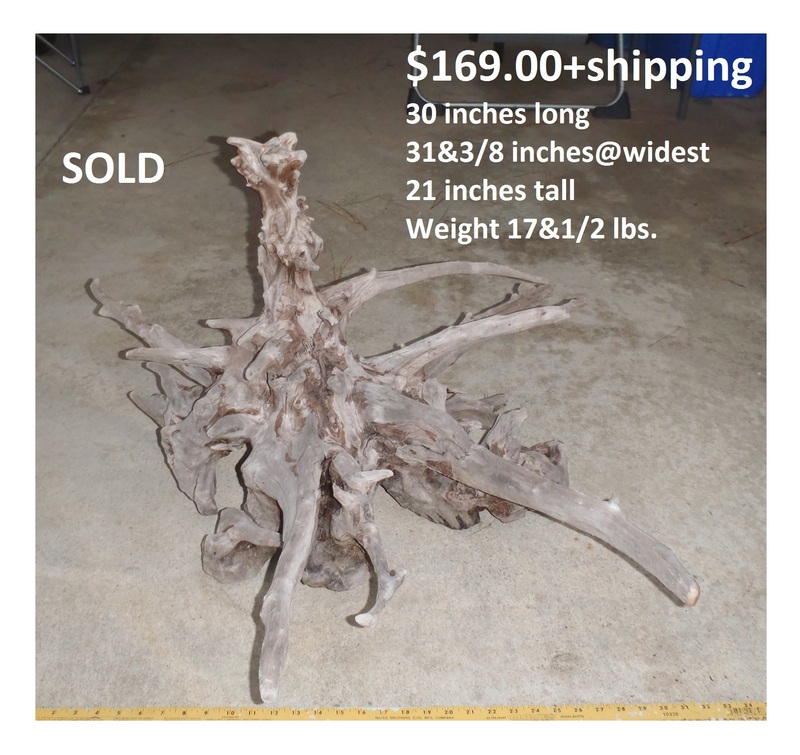 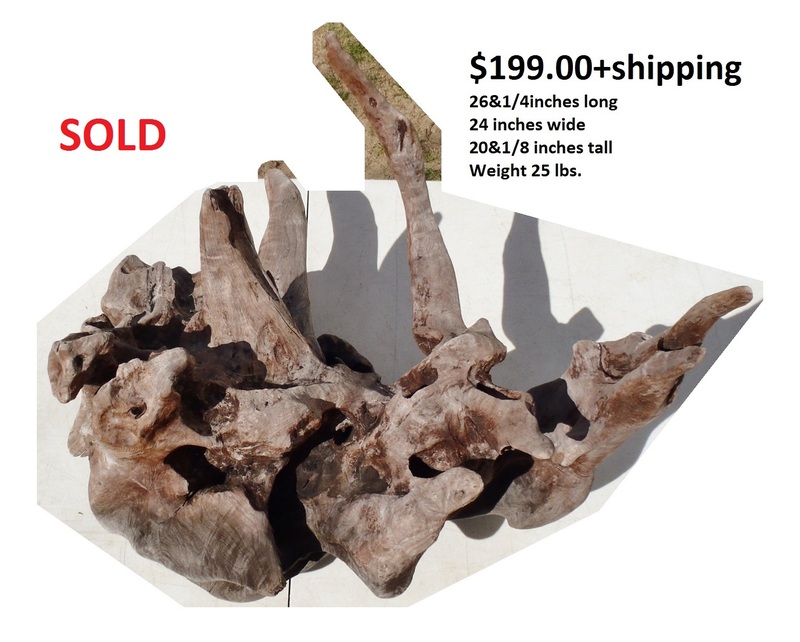 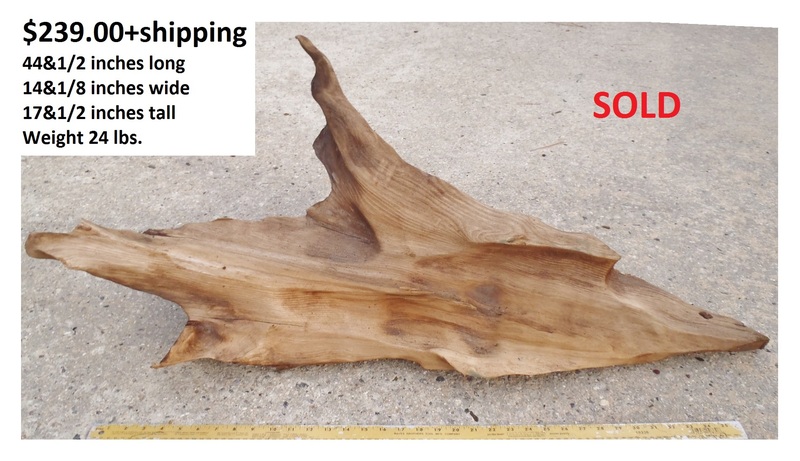 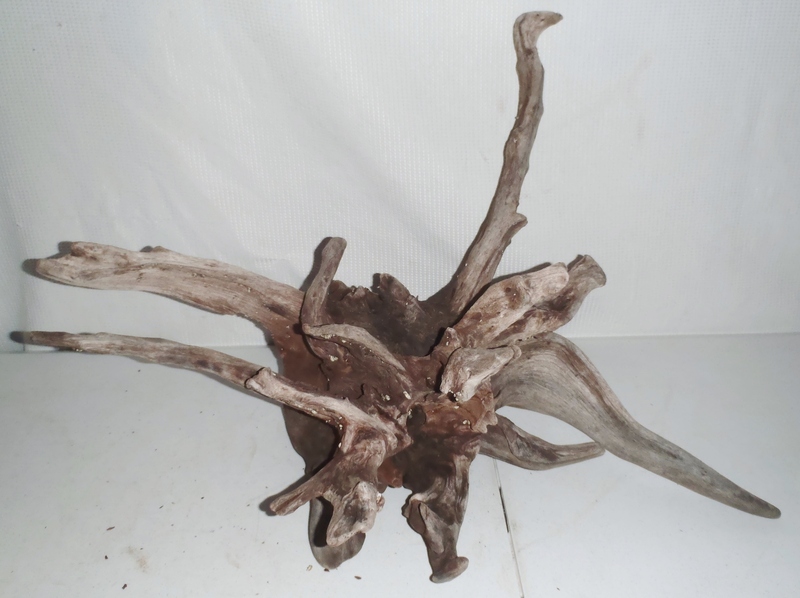 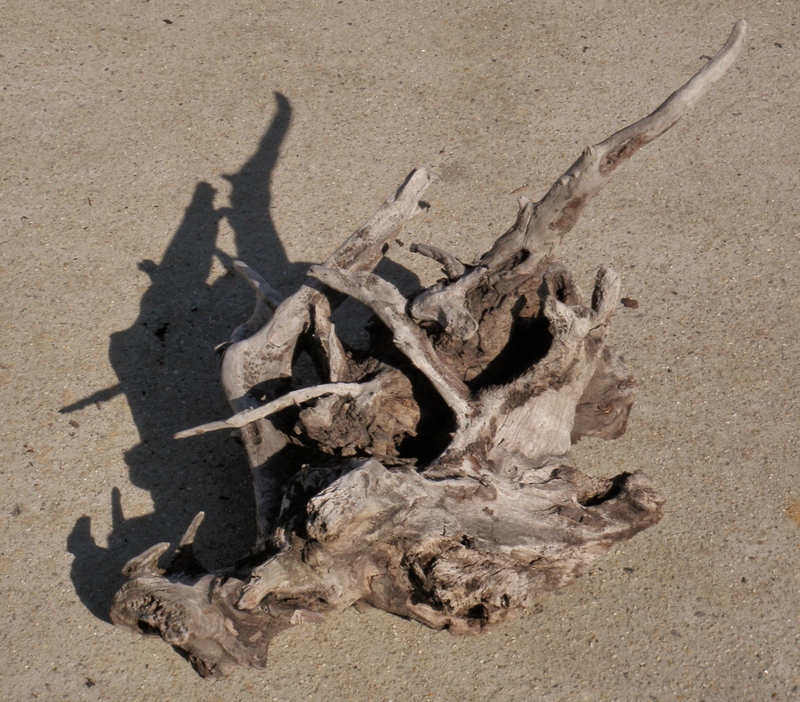 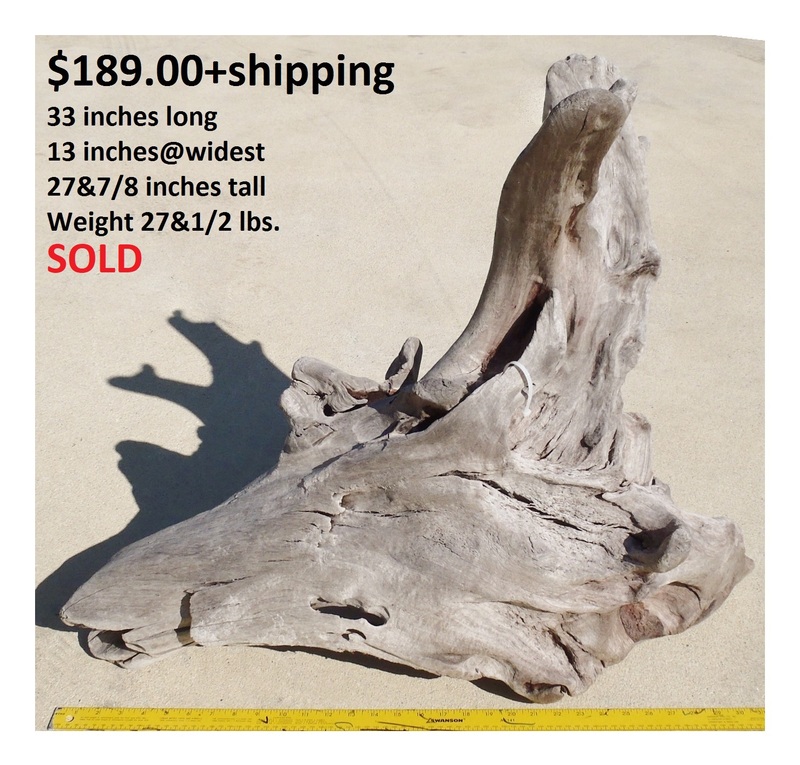 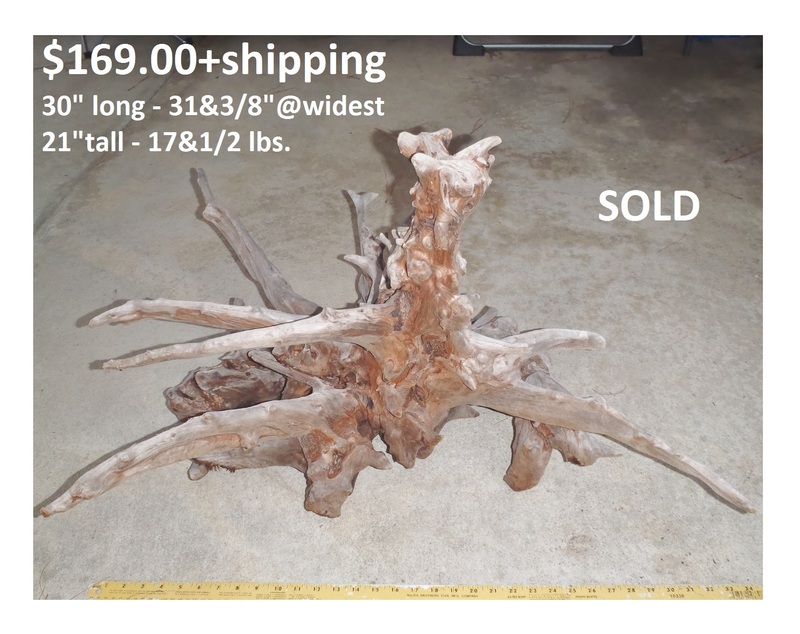 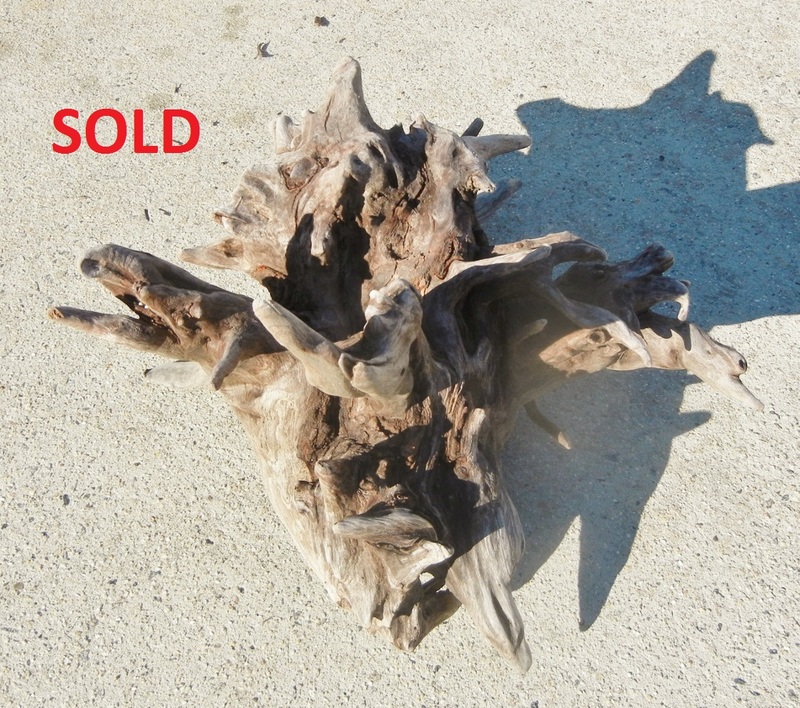 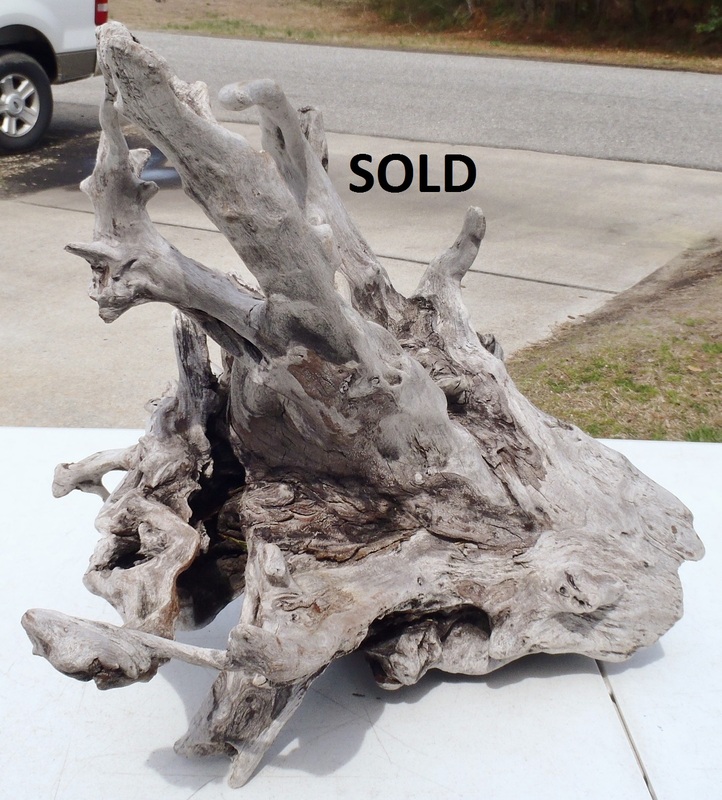 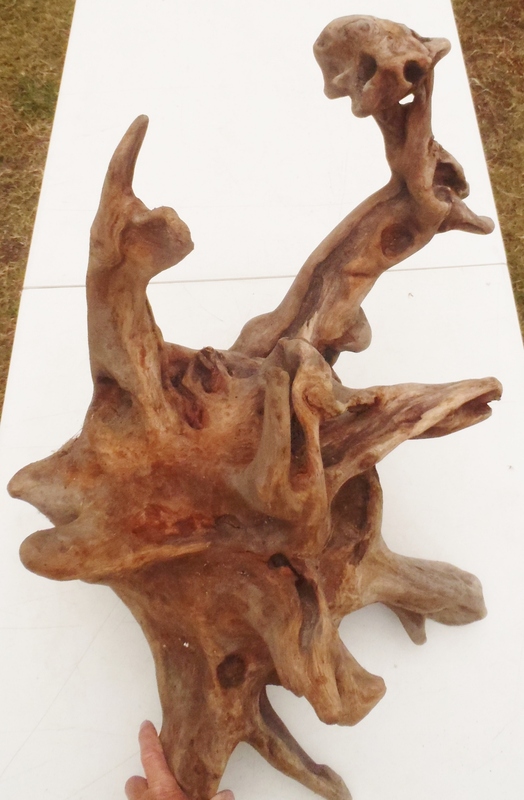 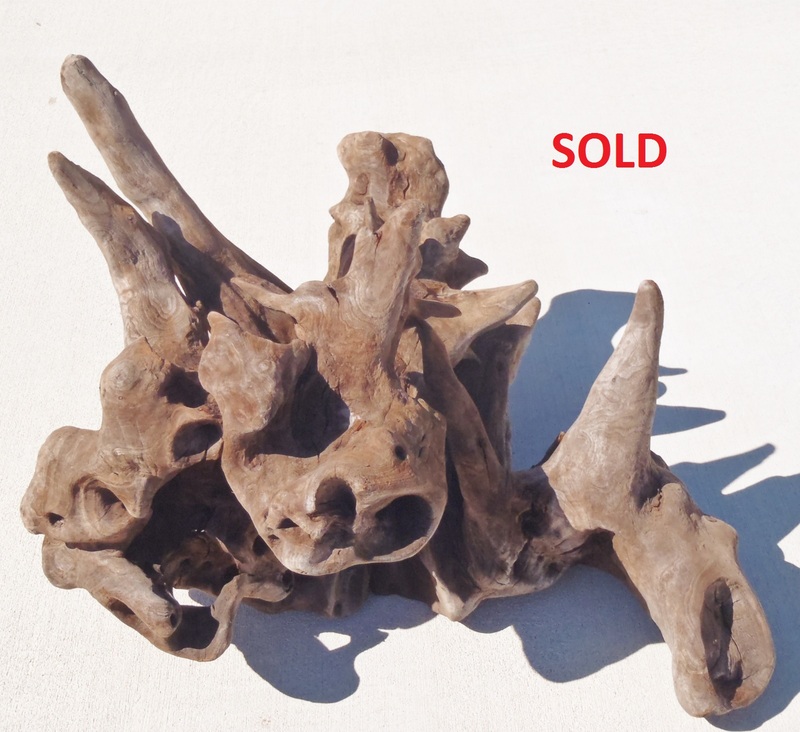 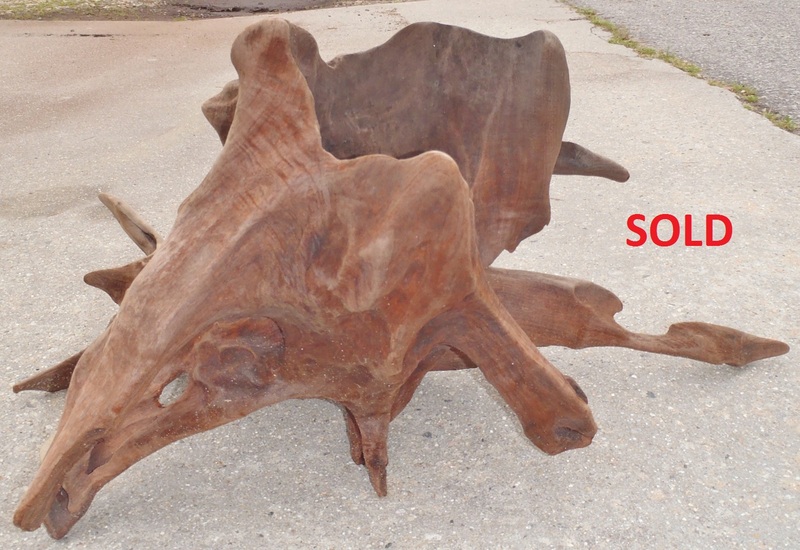 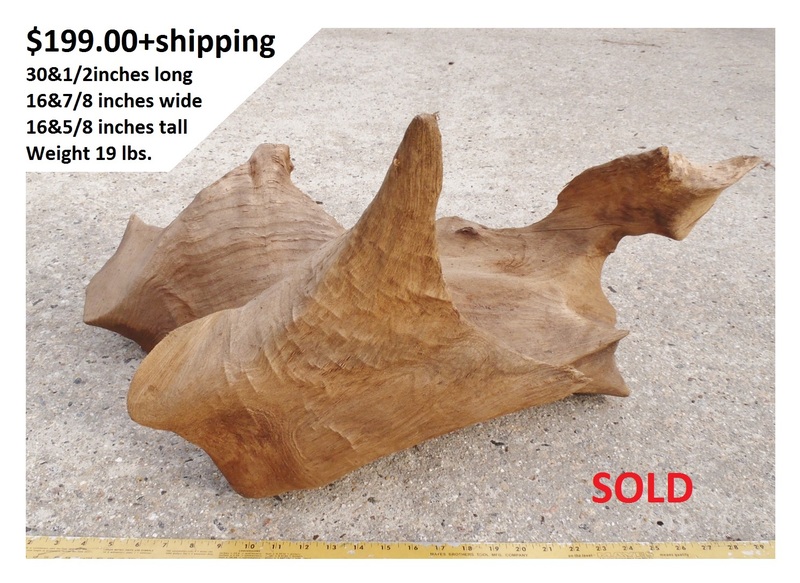 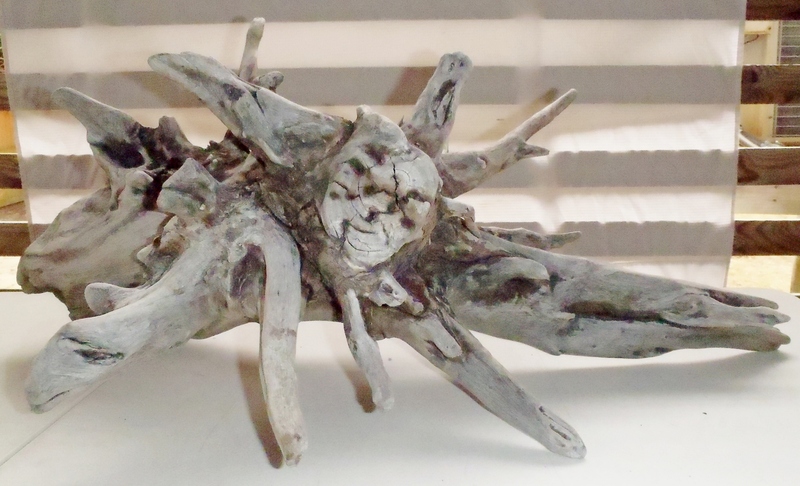 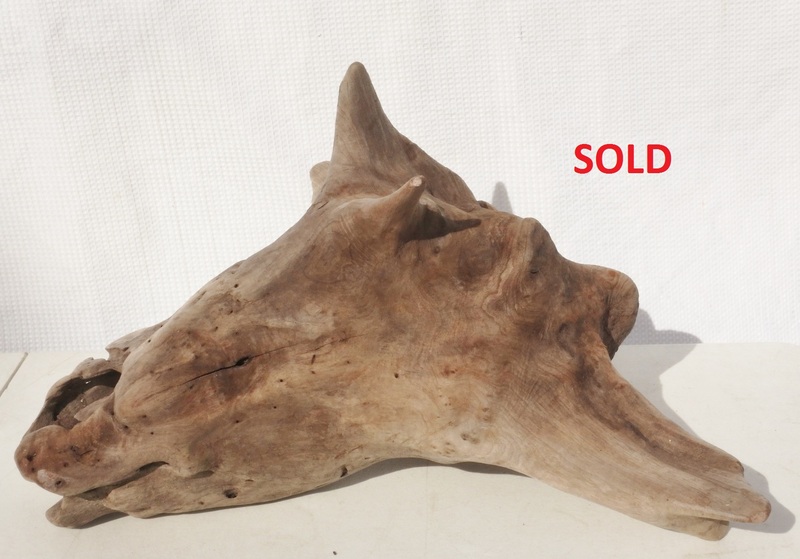 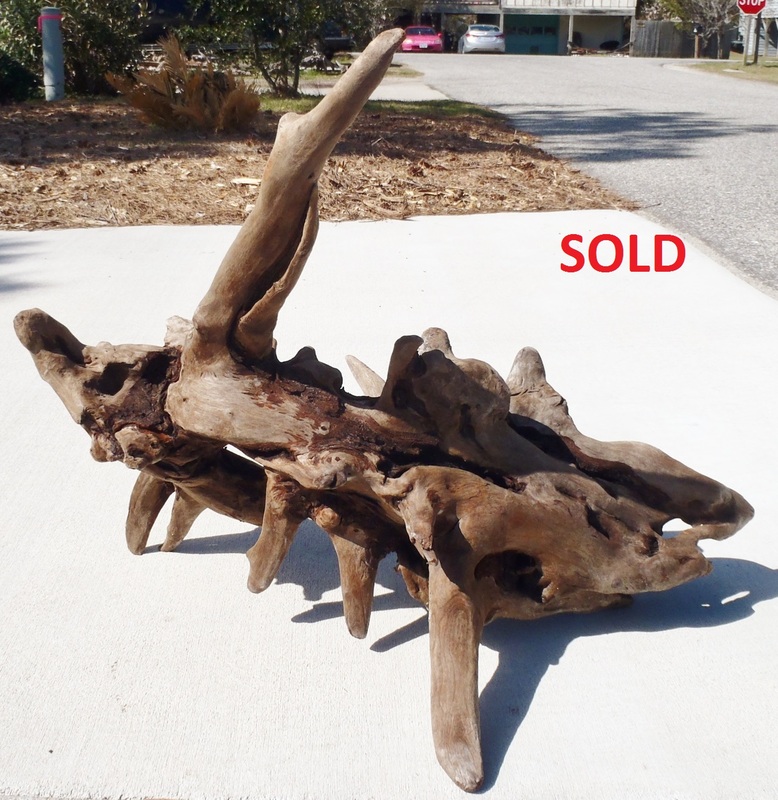 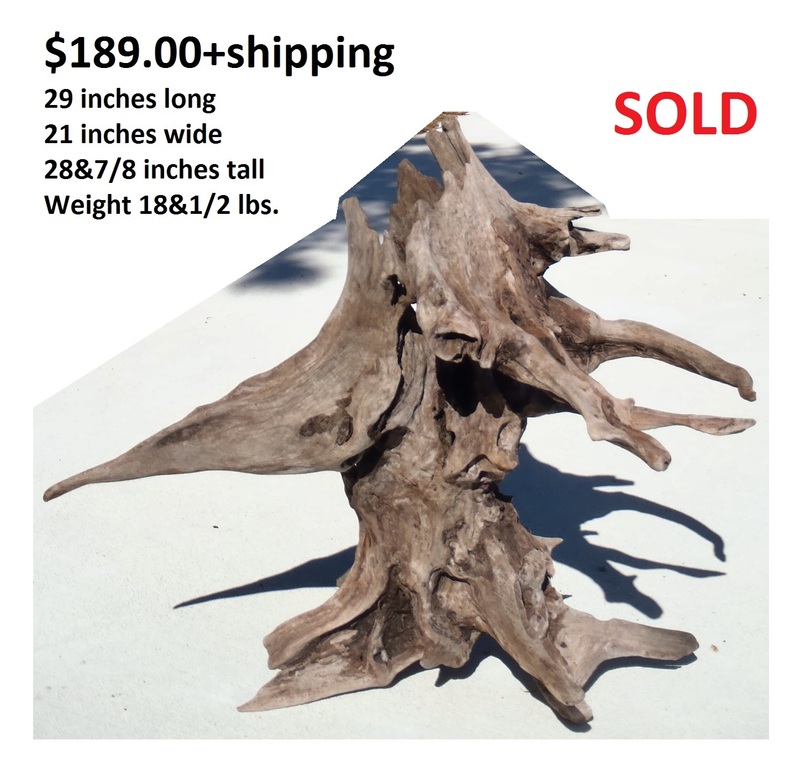 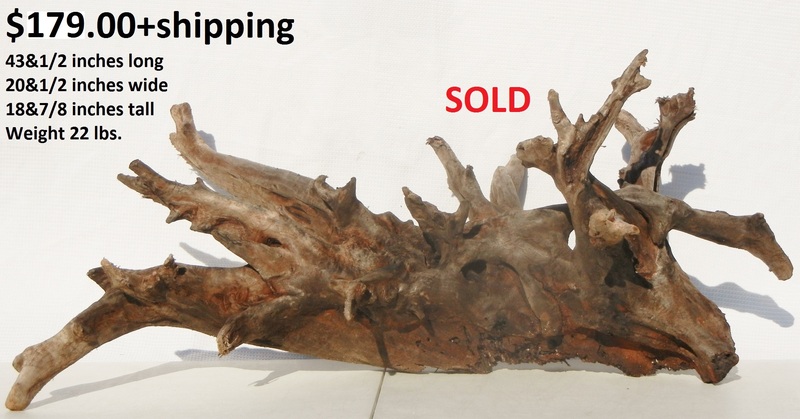 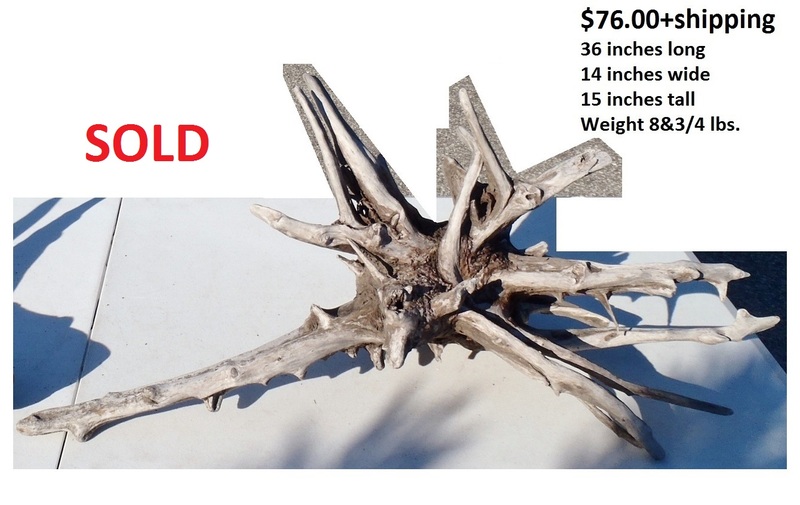 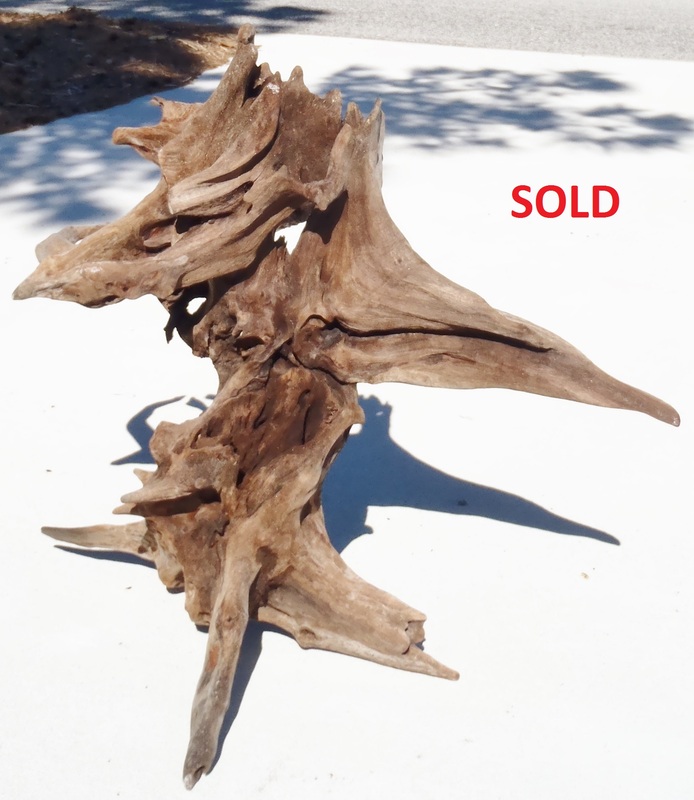 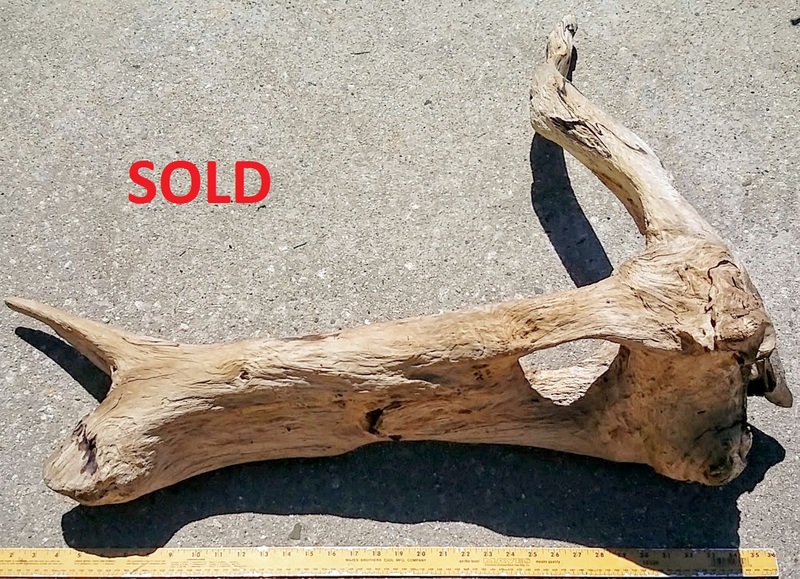 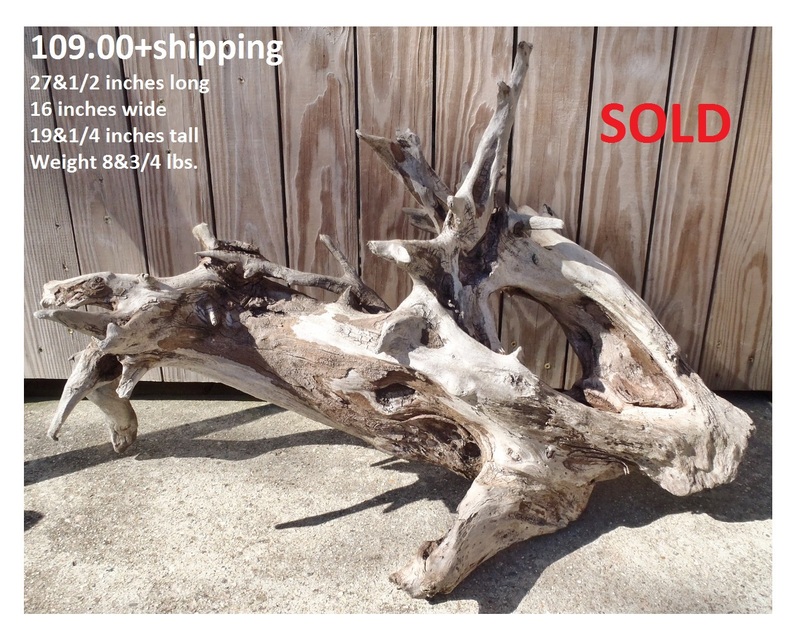 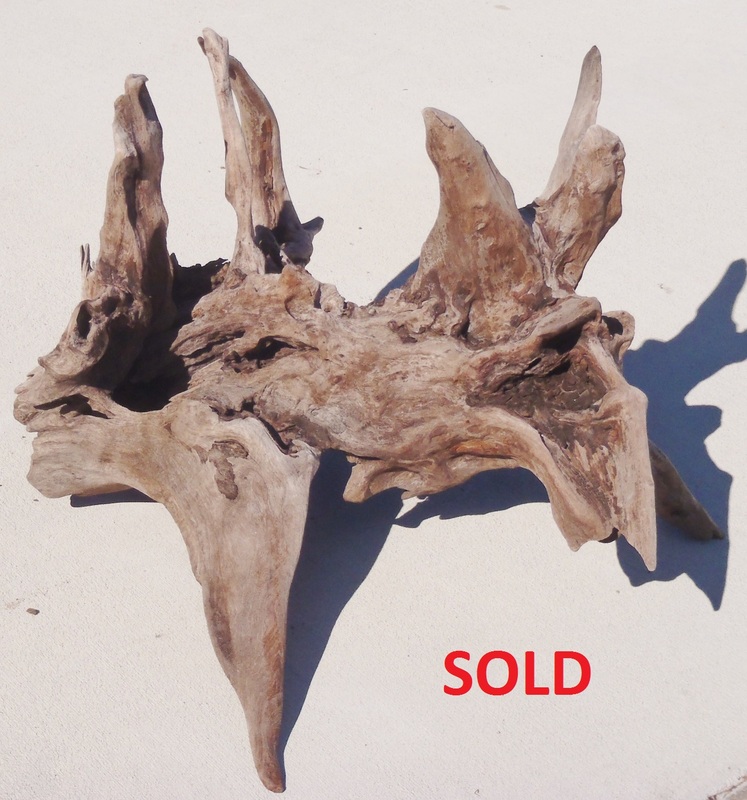 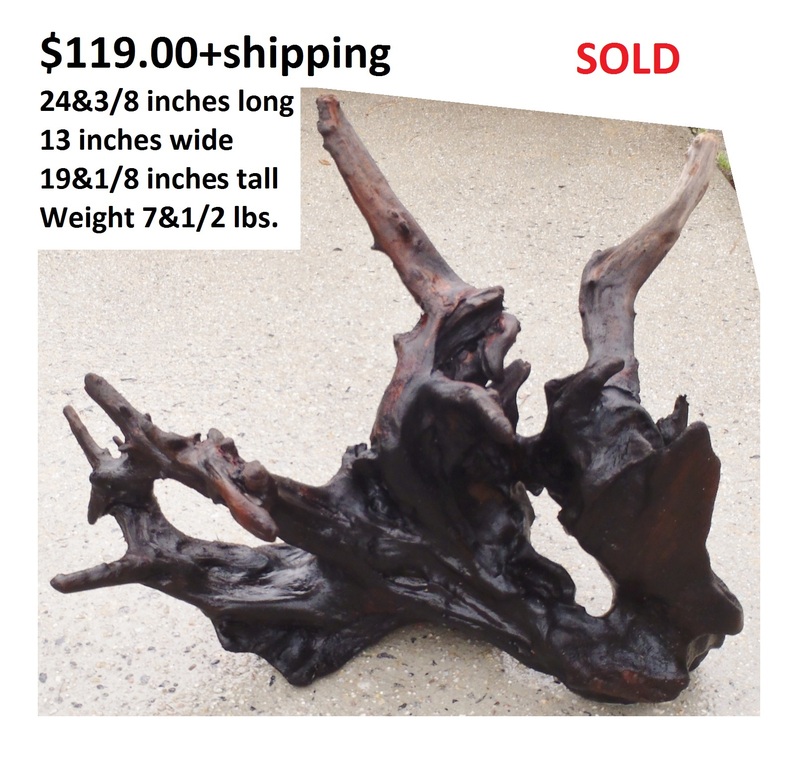 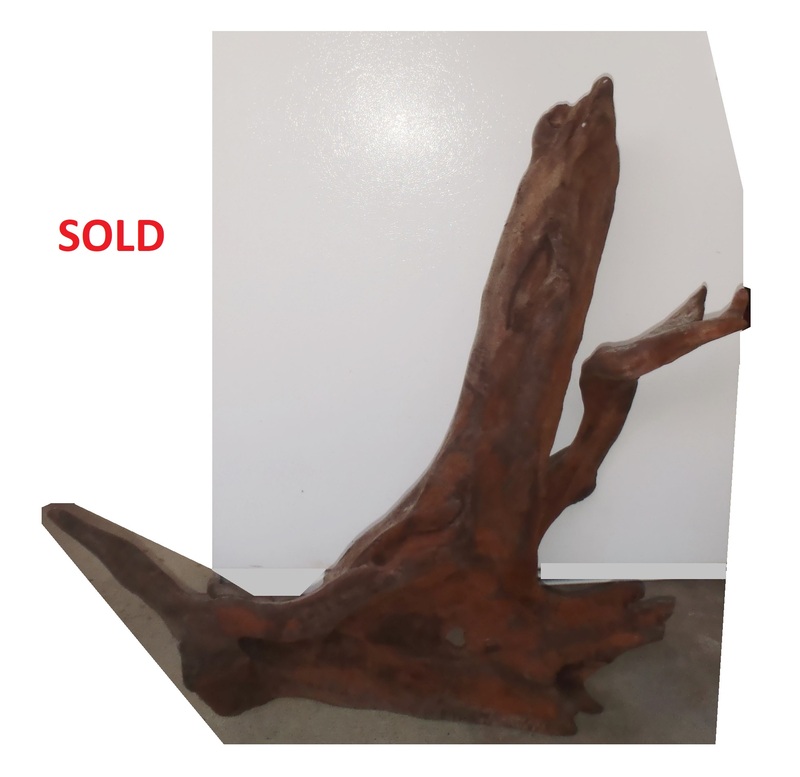 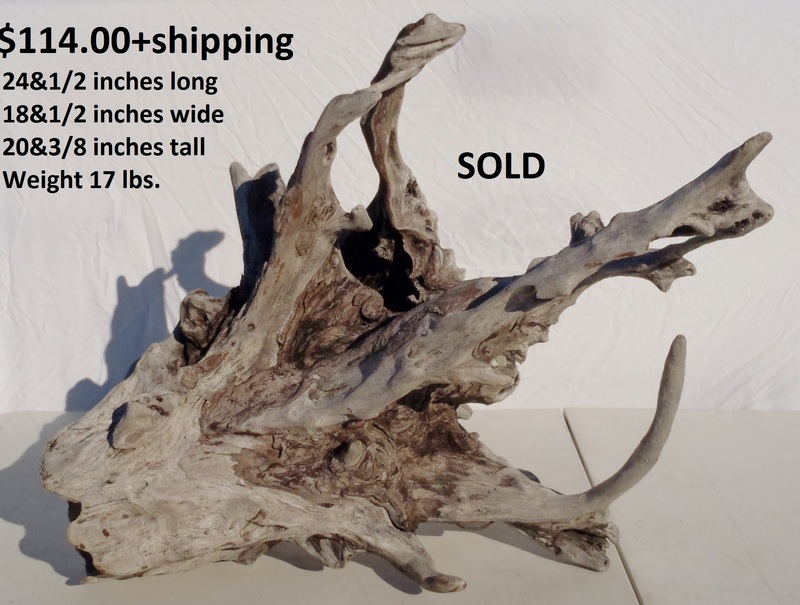 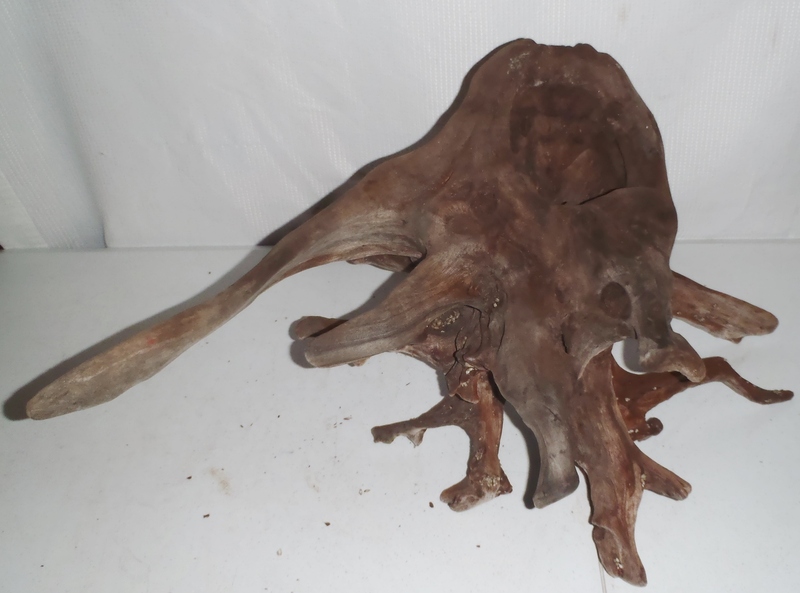 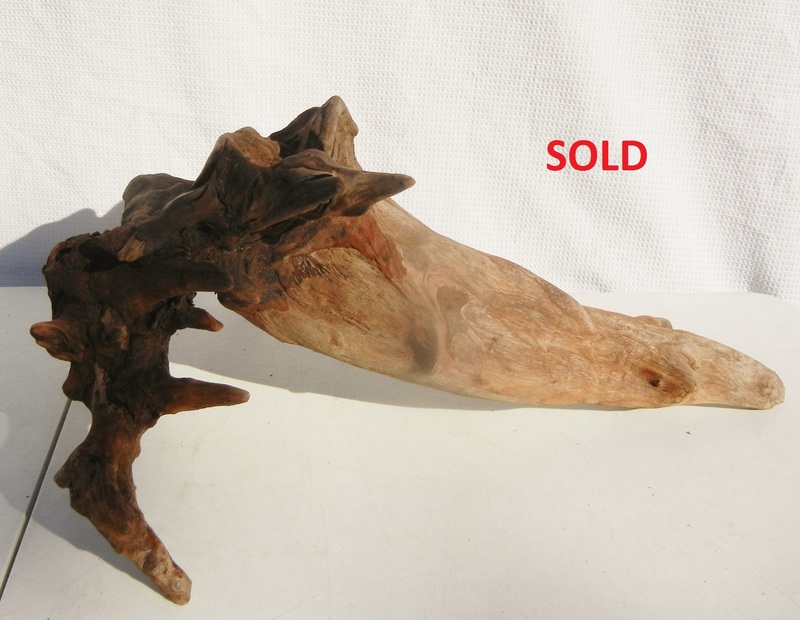 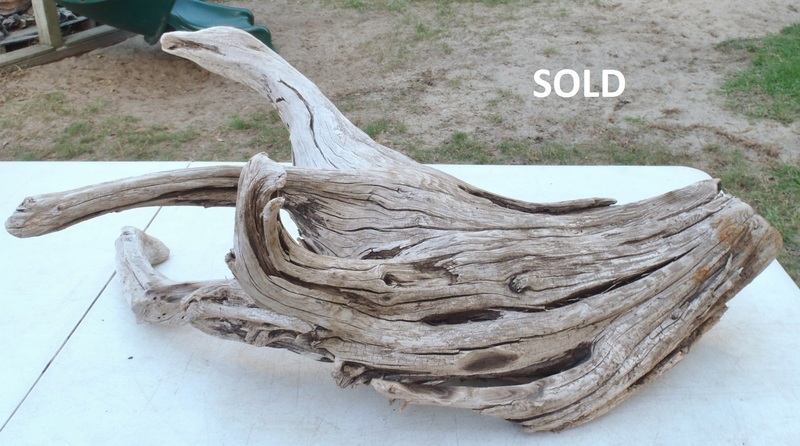 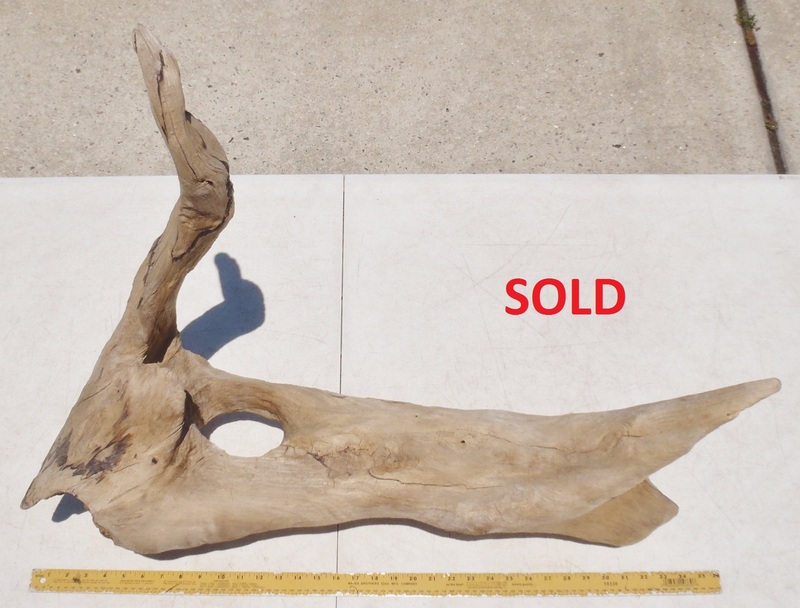 If you e-mail(getdriftwood@obxdriftwood.com) the piece/pieces of wood that you want, we will send a Pay Pal invoice to your e-mail address that will easily prompt you through the secure Pay Pal payment process. 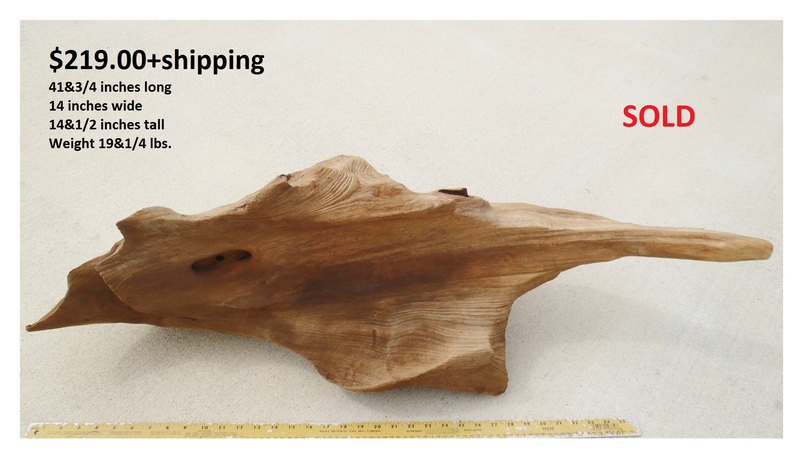 We accept checks(once it clears-wood ships). 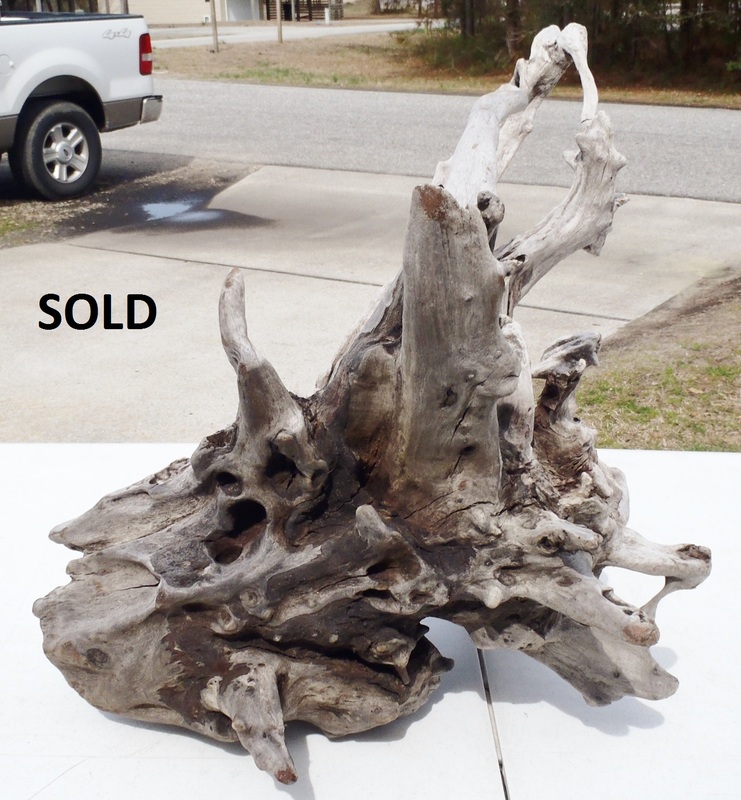 Checks are to be made out and sent to: Beach Bum Fishing/ 1816 Seminole Street/ Kill Devil Hills, North Carolina 27948. 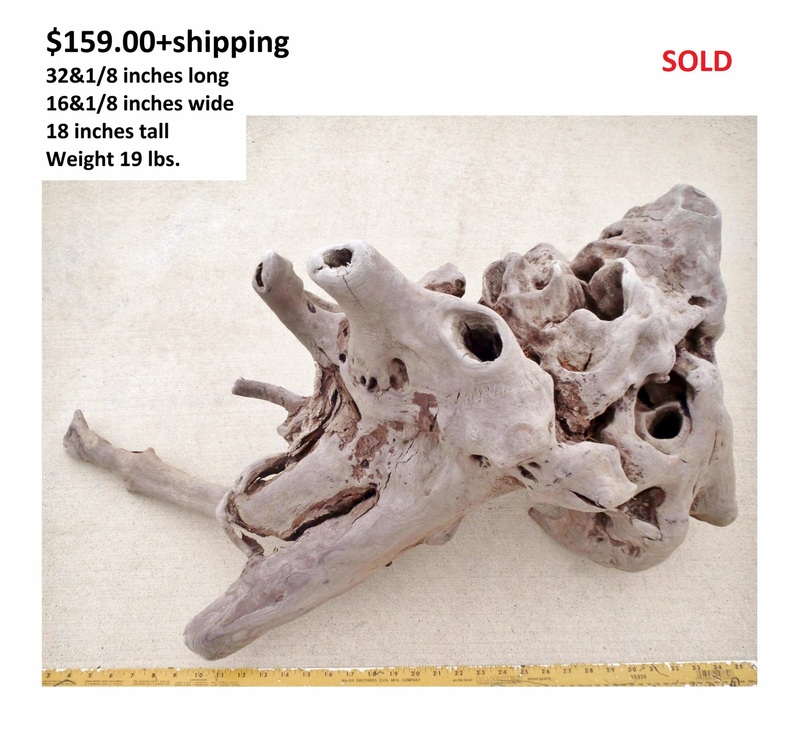 Sales Tax applies for in state internet orders and retail pick-ups. 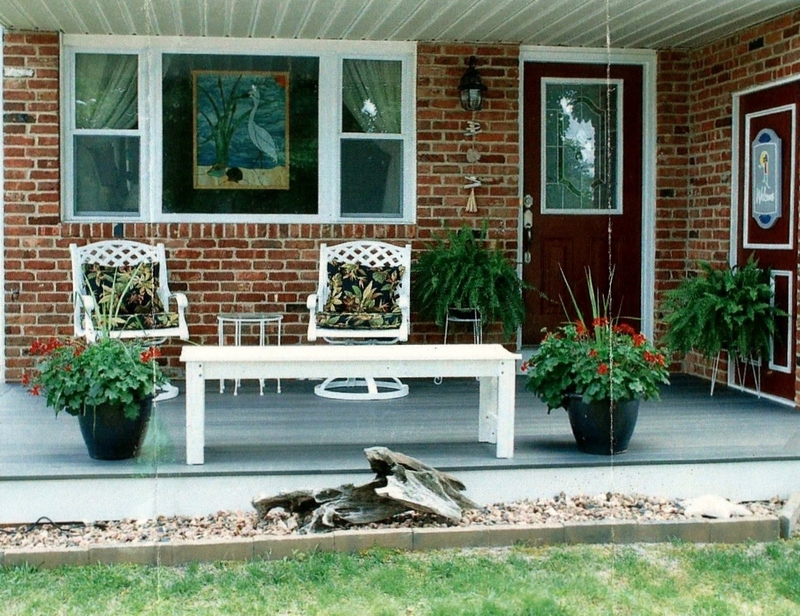 We can always be reached for any questions at (252) 449-0232. 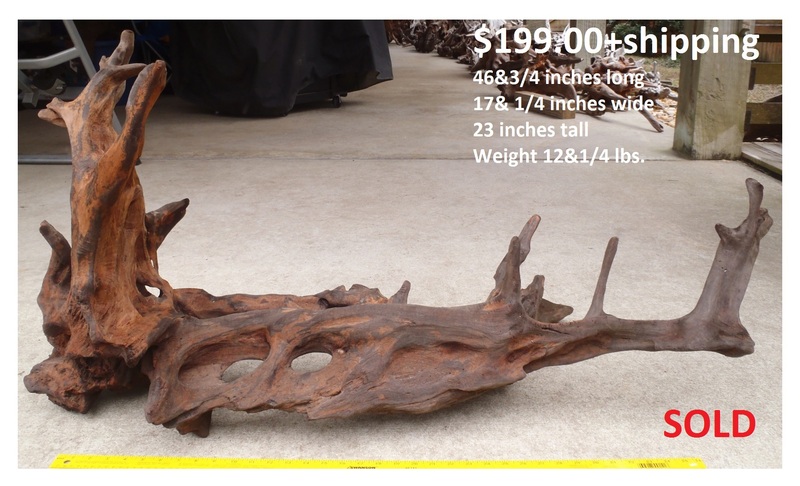 A low lying really large decorative piece. 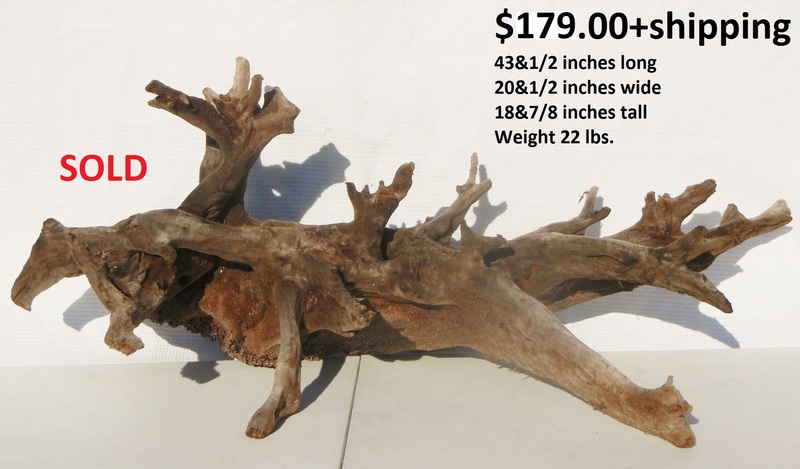 Approximate Dimensions: 66&1/8 inches long - 21&3/4 inches at widest - 15&7/8 inches tall - Weight 37 lbs. 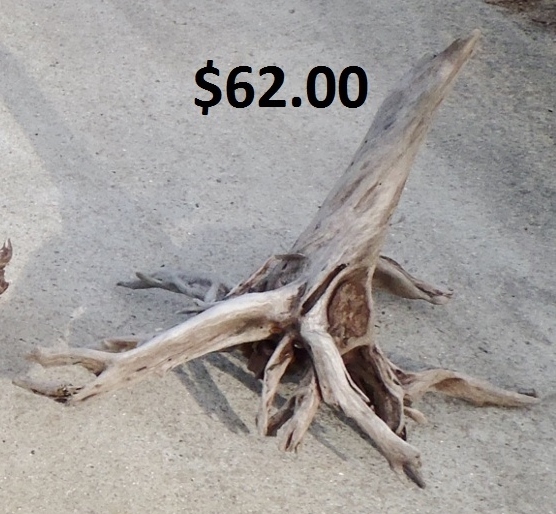 Uses: Decorative Piece. 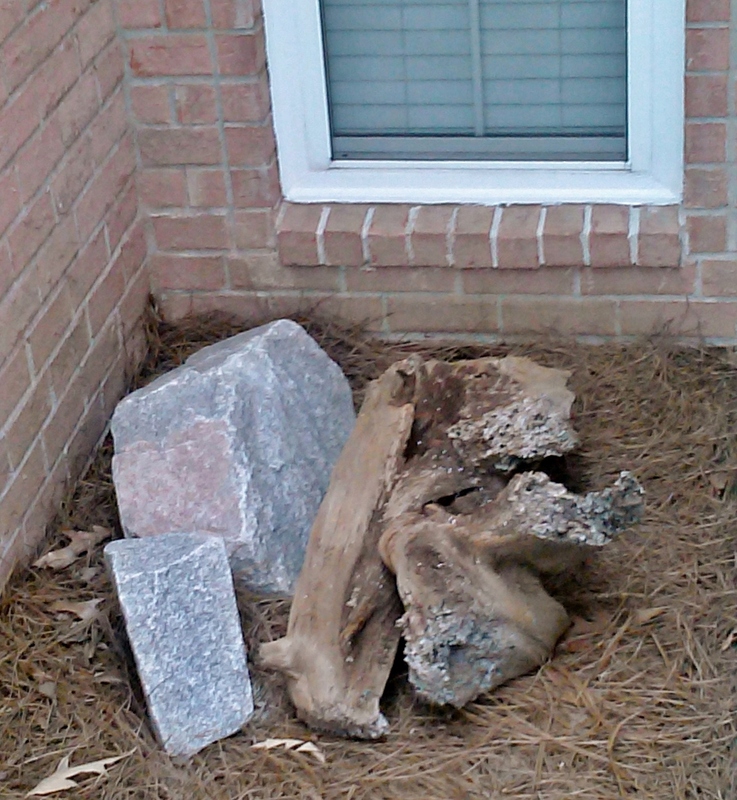 Landscaping Piece. 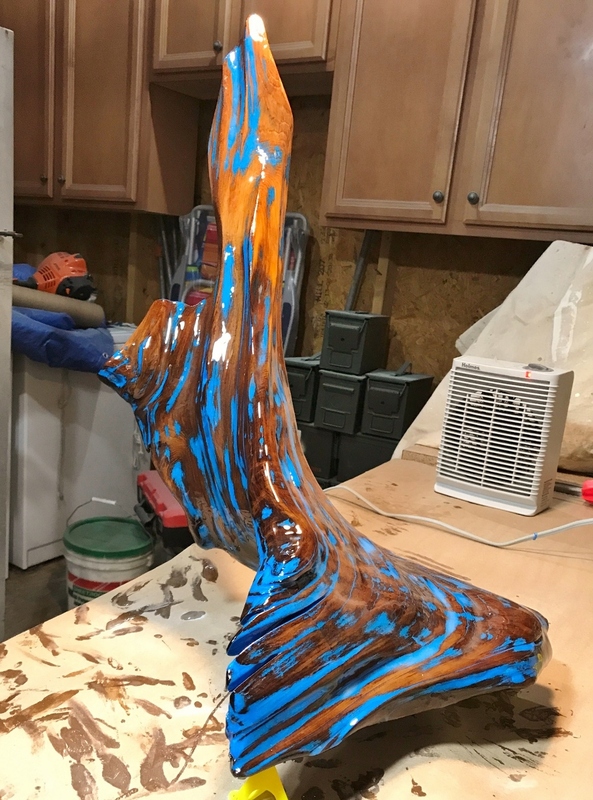 Aquarium/Terrarium Piece. 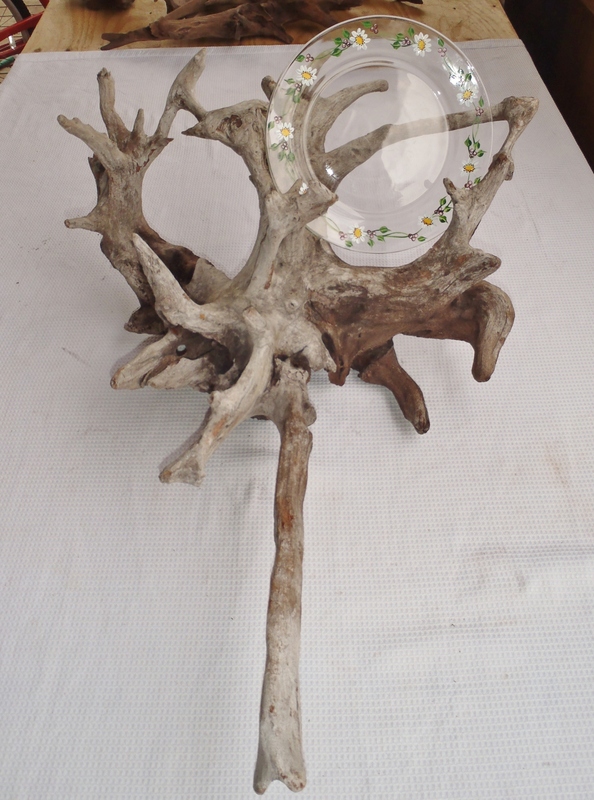 Taxidermy Piece. 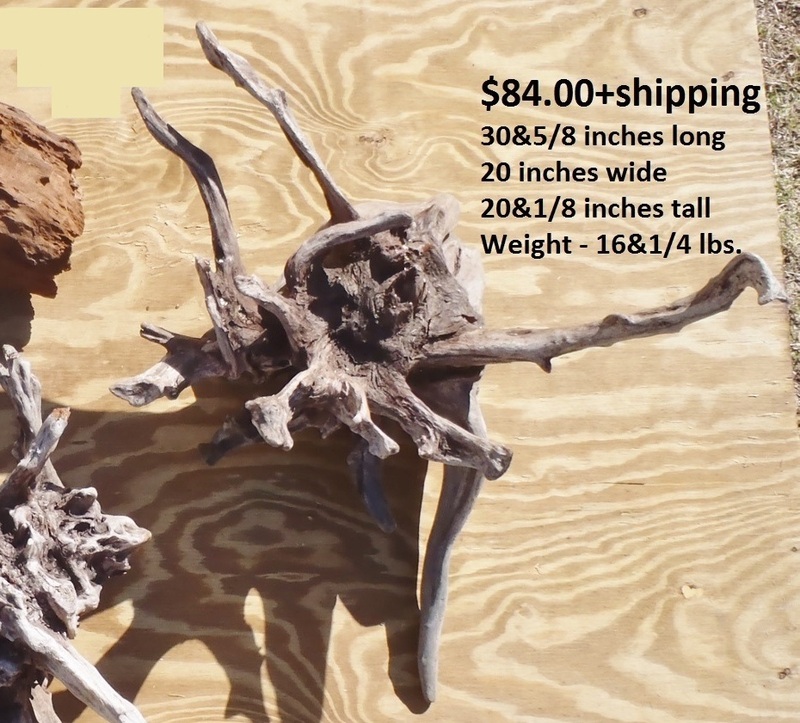 Approximate Dimensions: 59&1/4 inches long - 30&1/4 inches at widest - 17&3/4 inches tall - Weight 25 lbs. 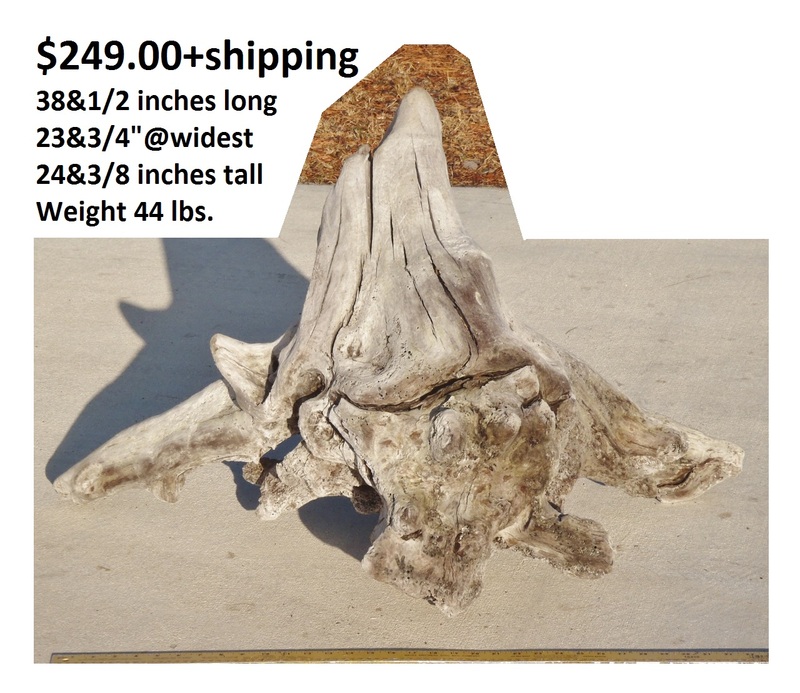 A Super-Stud larger Large landscaping piece. 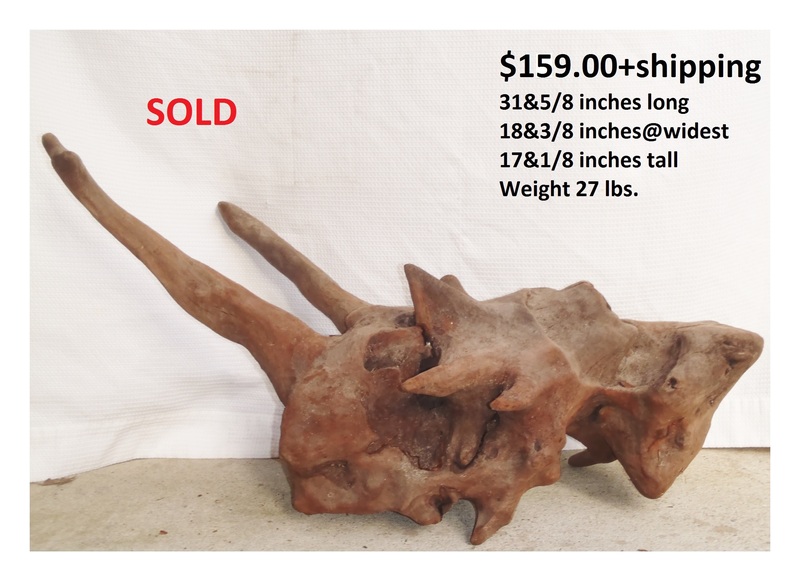 Approximate Dimensions: 38&1/2 inches long - 23&3/4 inches at widest - 24&3/8 inches tall - Weight 44 lbs. 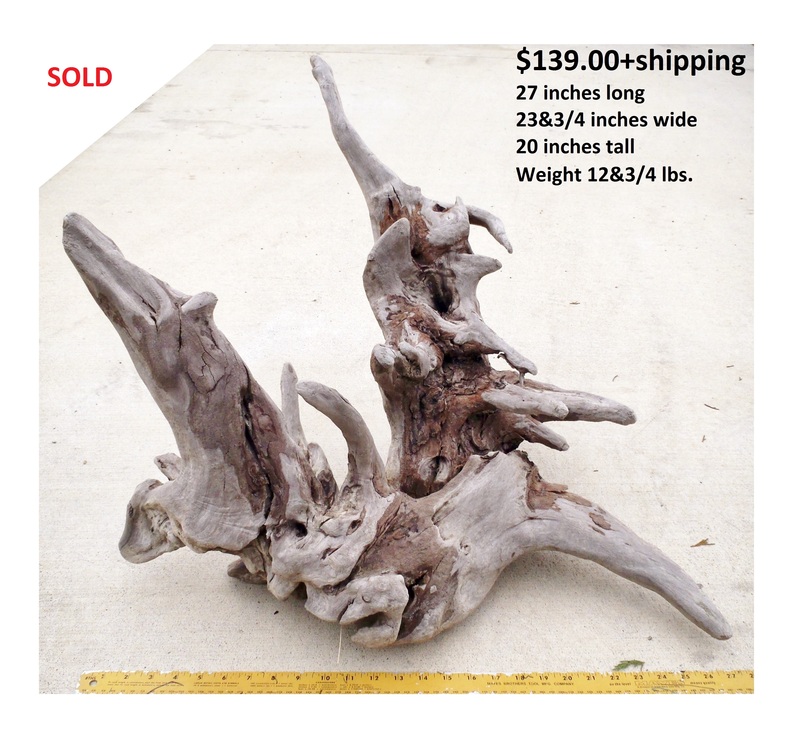 Uses: Decorative Piece. 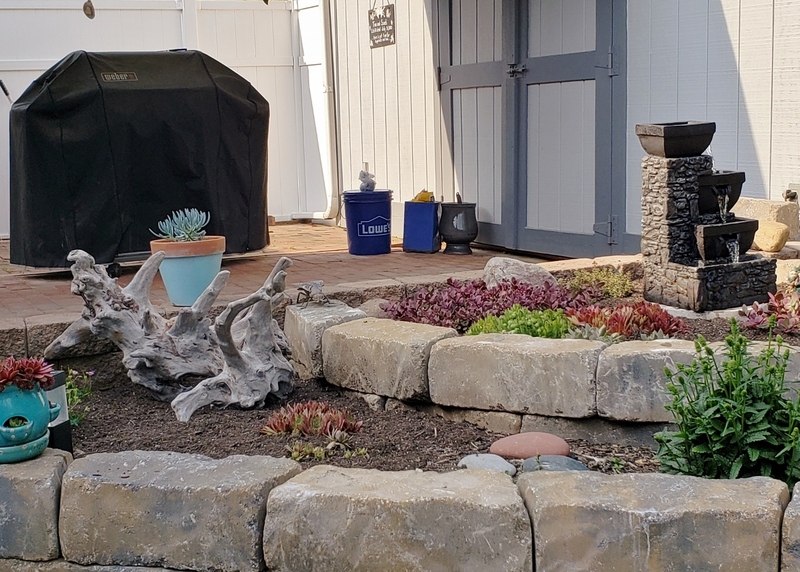 Landscaping Piece. 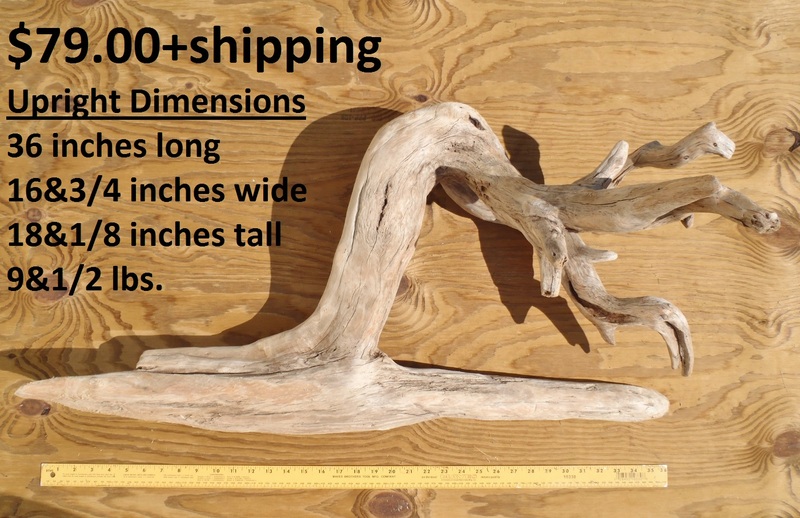 Approximate Dimensions: __ inches long - __ inches at widest - __ inches tall - Weight __ lbs. 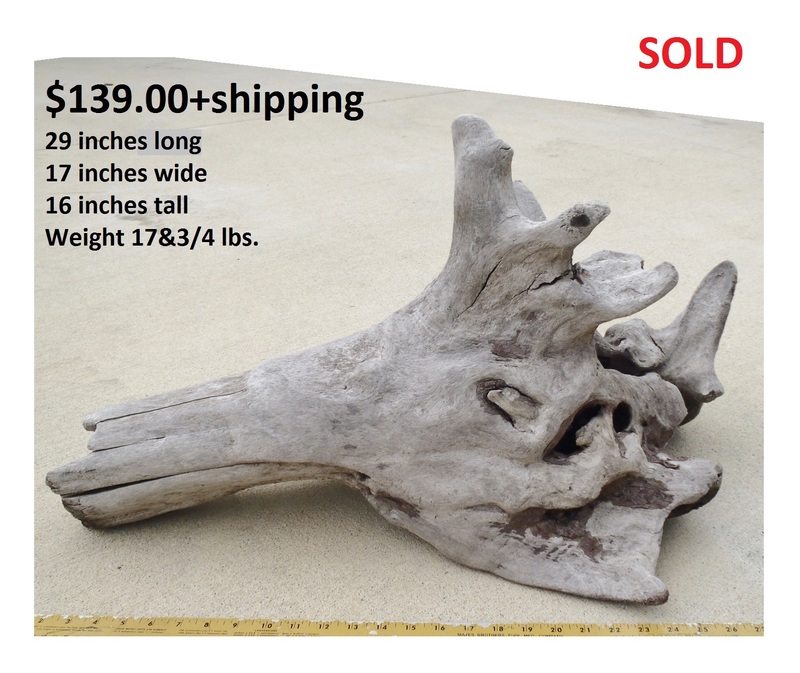 Uses: Decorative Piece. 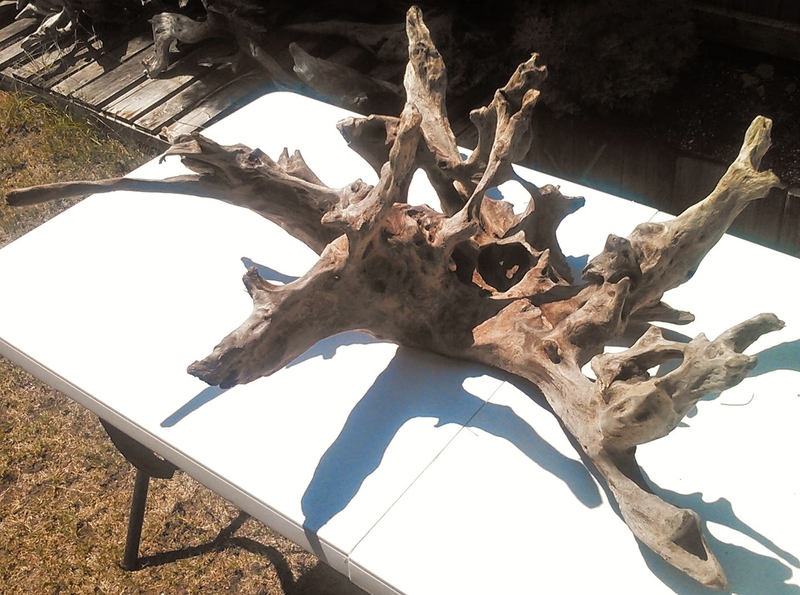 Planter Piece. 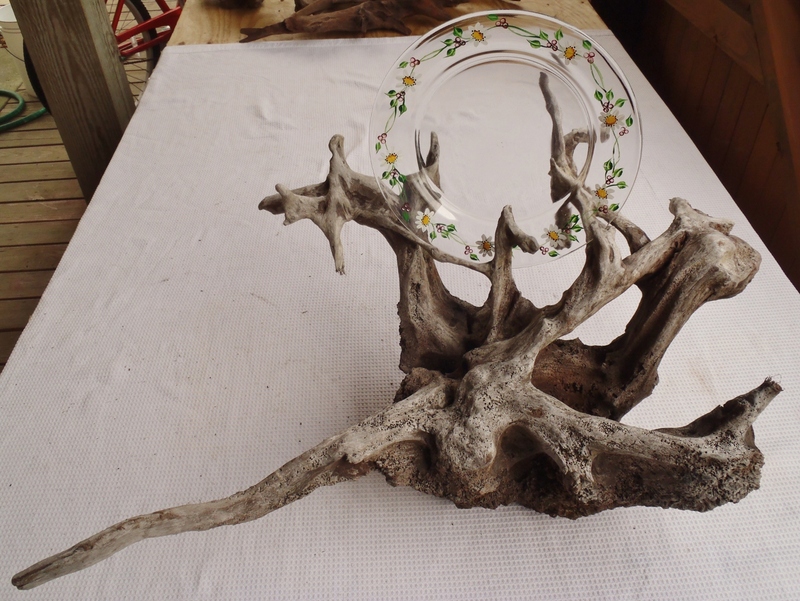 Aquarium/Terrarium Piece. 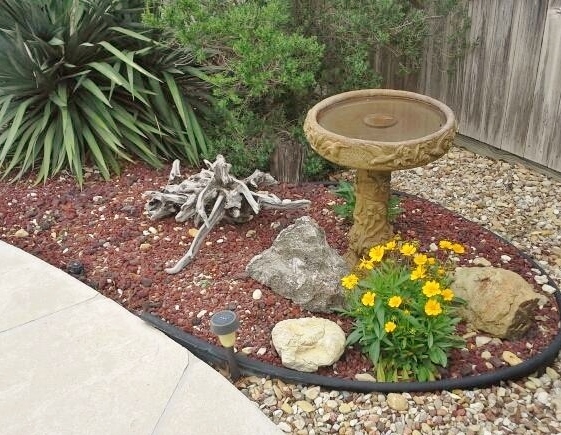 Landscaping Piece. 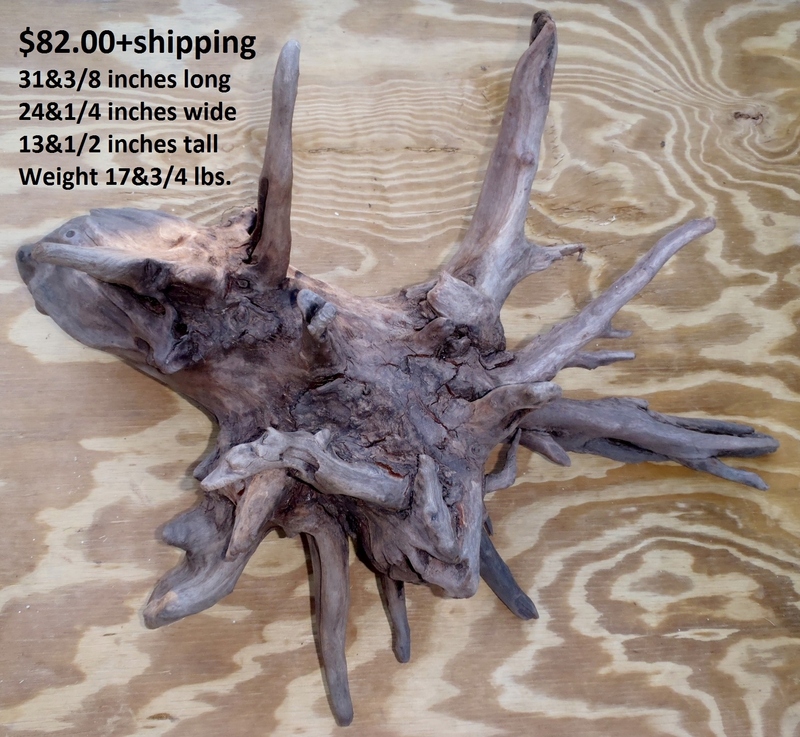 Taxidermy Piece. 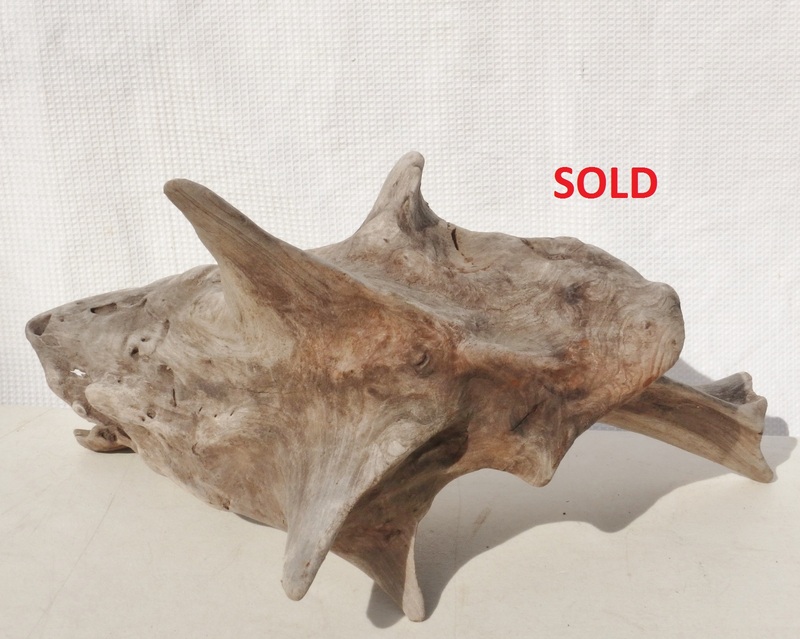 And another great decorative fishy looking piece. 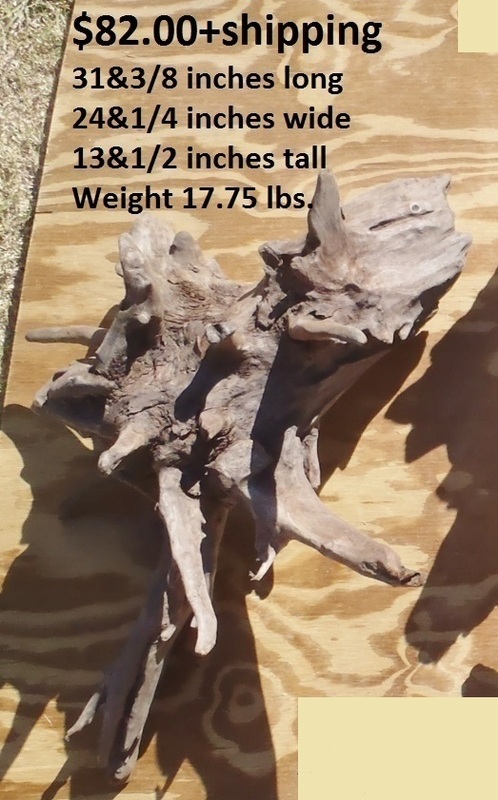 Approximate Dimensions PHOTO#1(Propped Position): 27&1/2 inches long - 16 inches at widest - 19&1/4 inches tall - Weight 8&3/4 lbs. 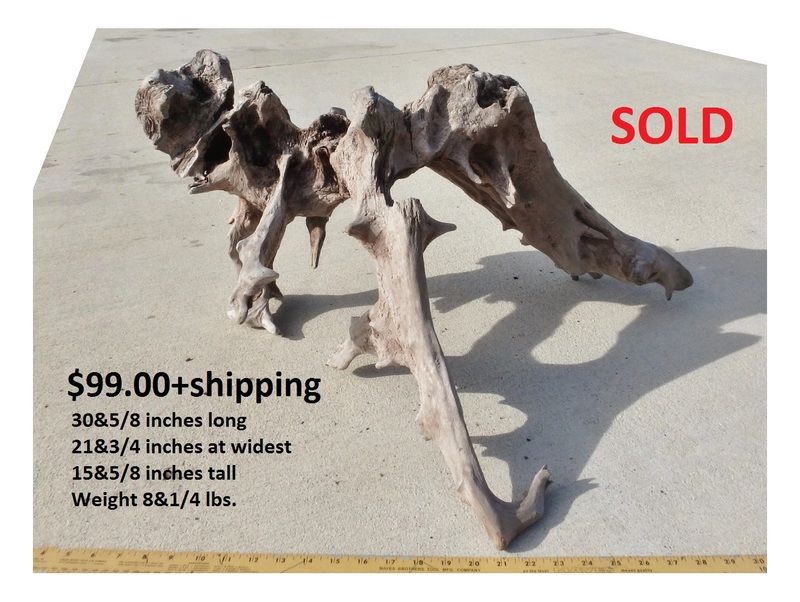 Approximate Dimensions PHOTO#2(Propped Position): 29 inches long - 12&1/2 inches at widest - 21 inches tall - Weight 8&3/4 lbs. 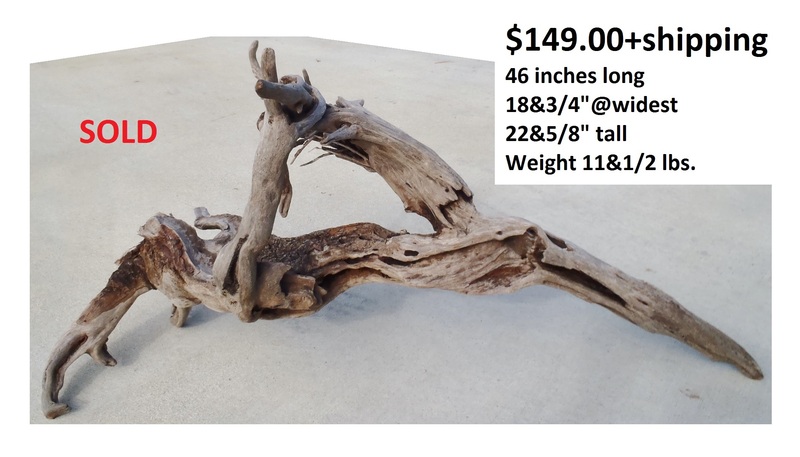 Approximate Dimensions PHOTOS#3, #4, & #5(Natural Position): 29 inches long - 20 inches at widest - 12&1/2 inches tall - Weight 8&3/4 lbs. 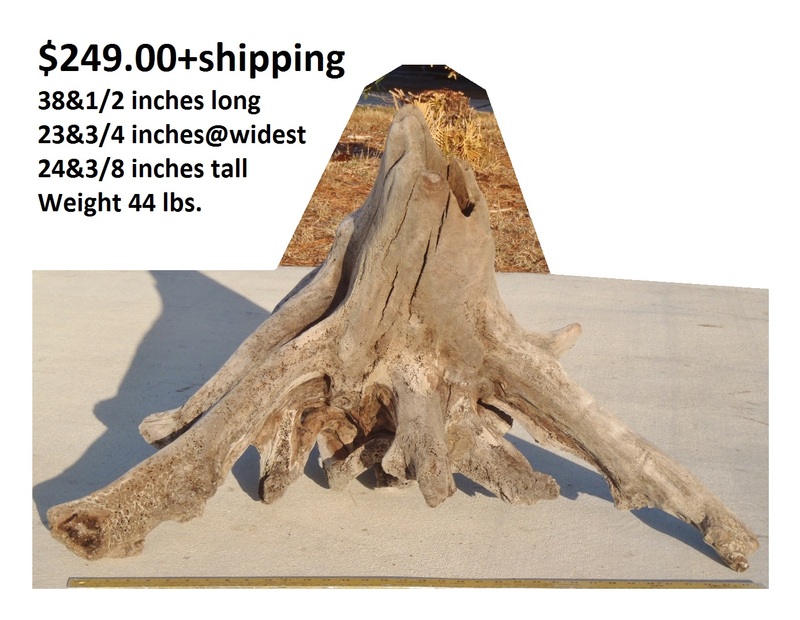 A super heavy/duty stump piece. 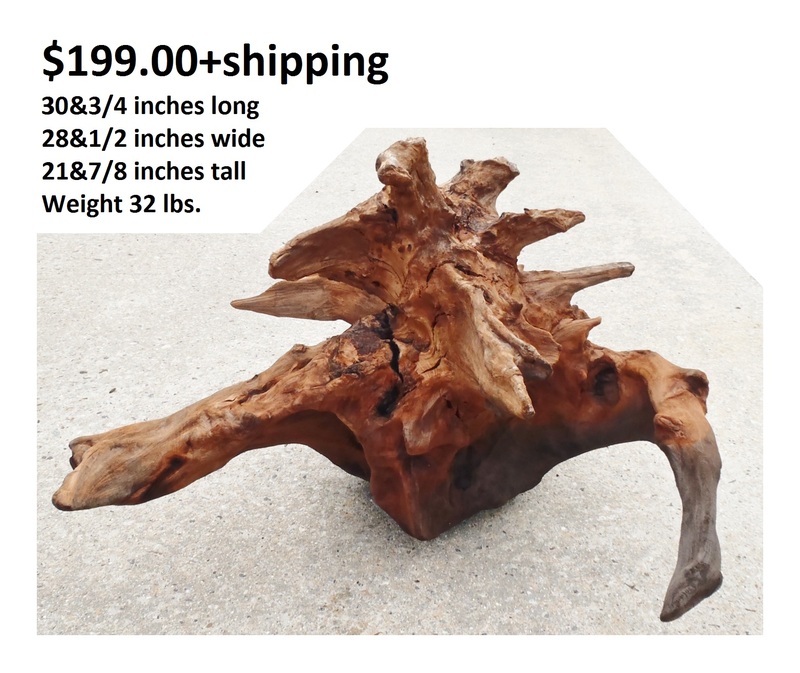 Will add dimensions when we get a chance. 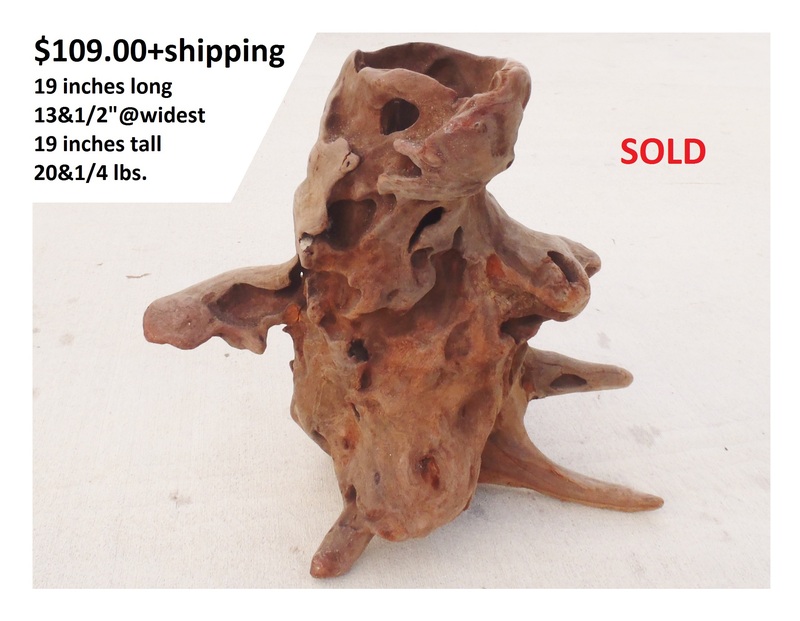 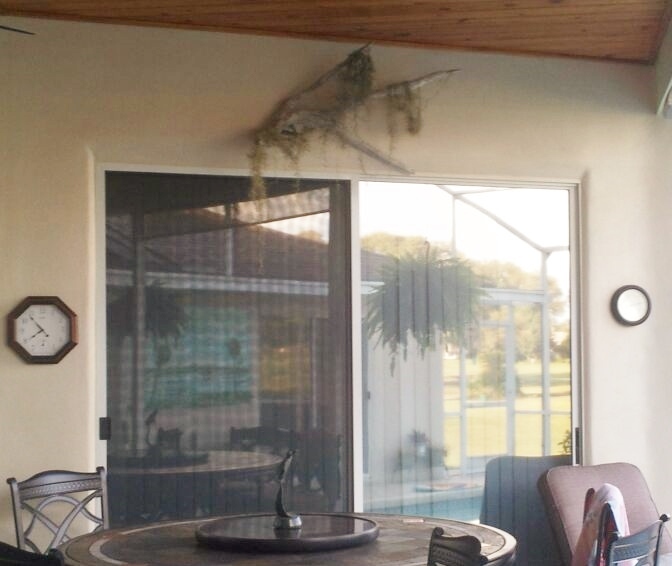 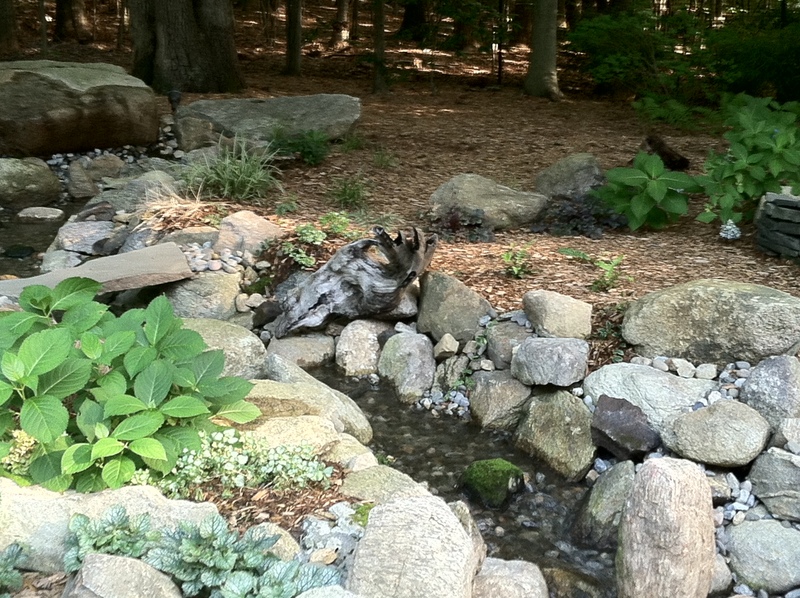 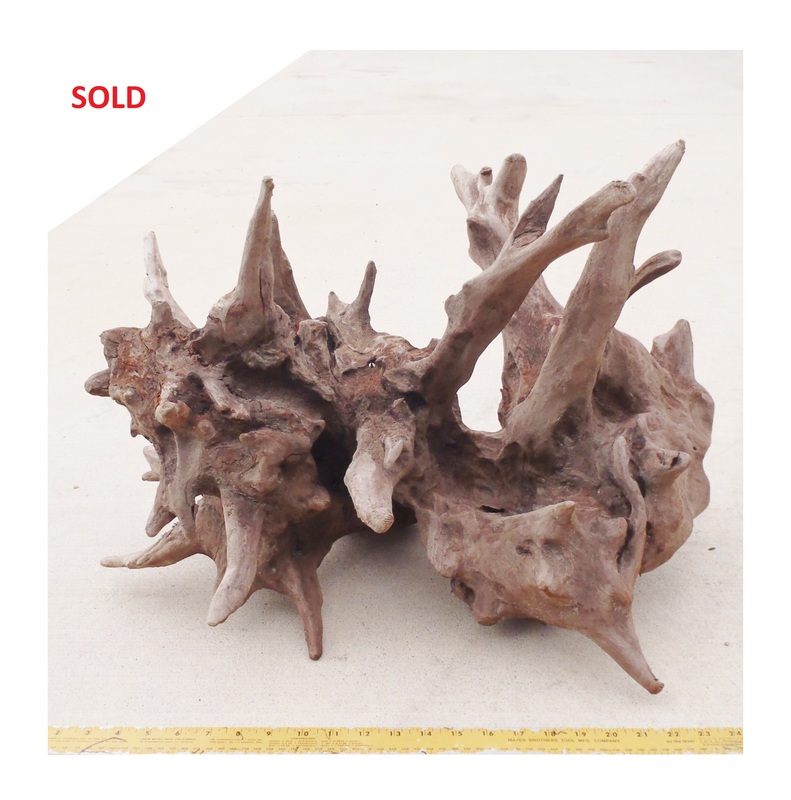 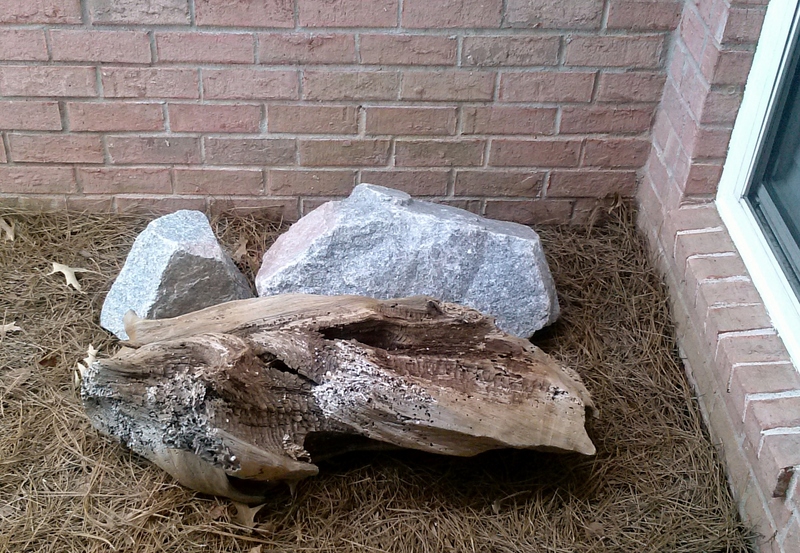 A heavy-duty weathered decorative piece. 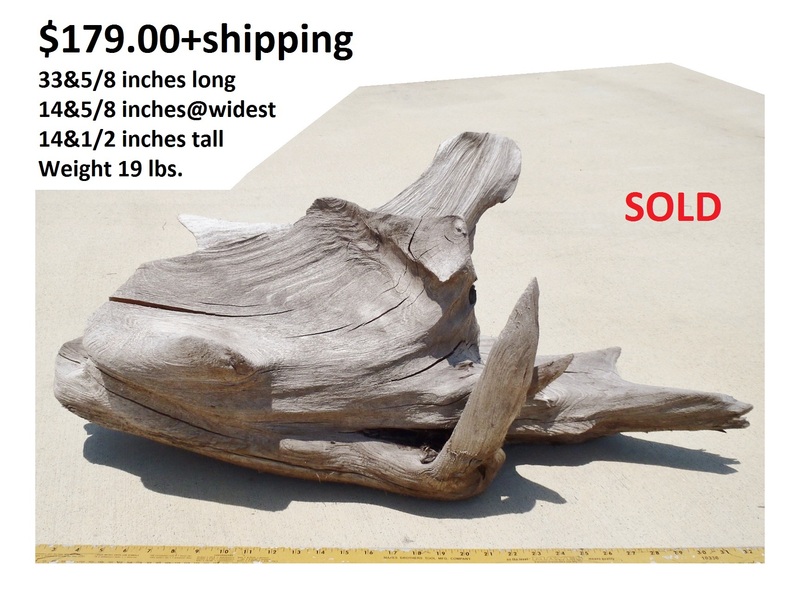 Approximate Dimensions: 29 inches long - 17 inches at widest - 16 inches tall - Weight 17&3/4 lbs. 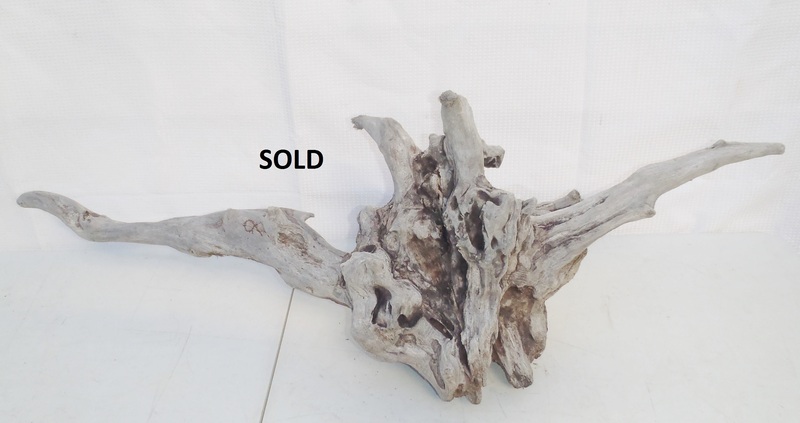 Uses: Decorative Piece. 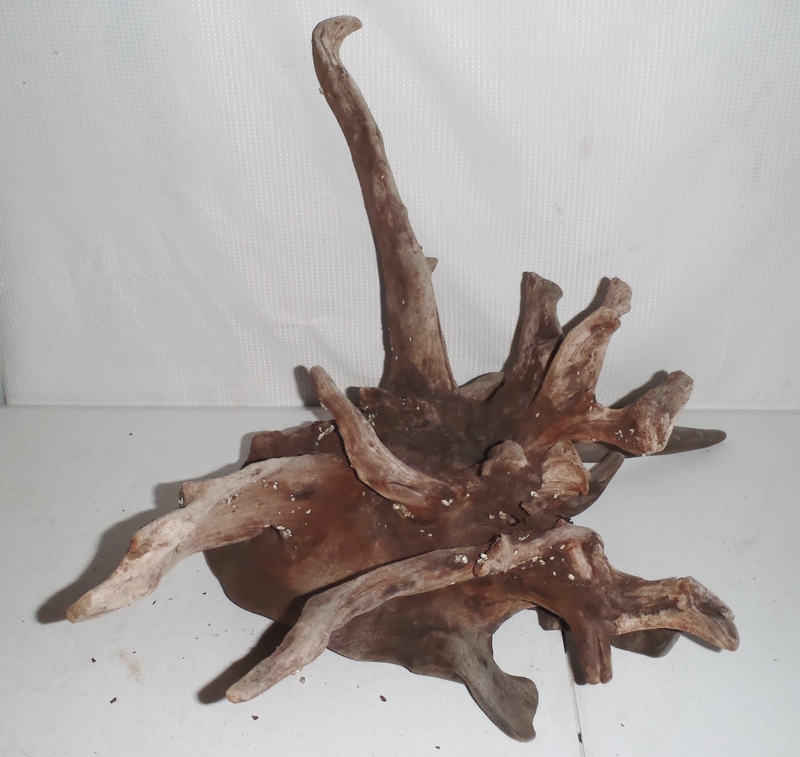 Planter Piece. 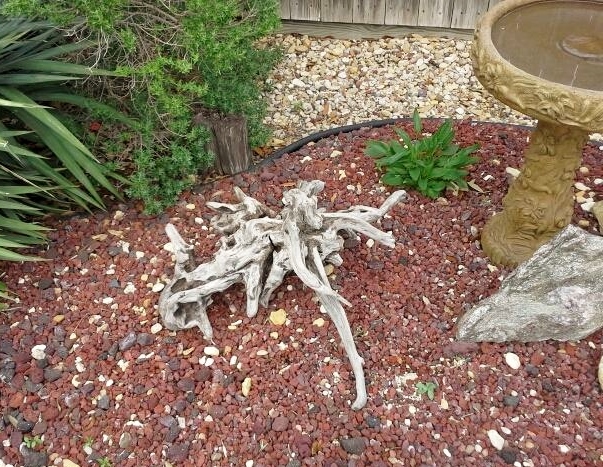 Landscaping Piece. 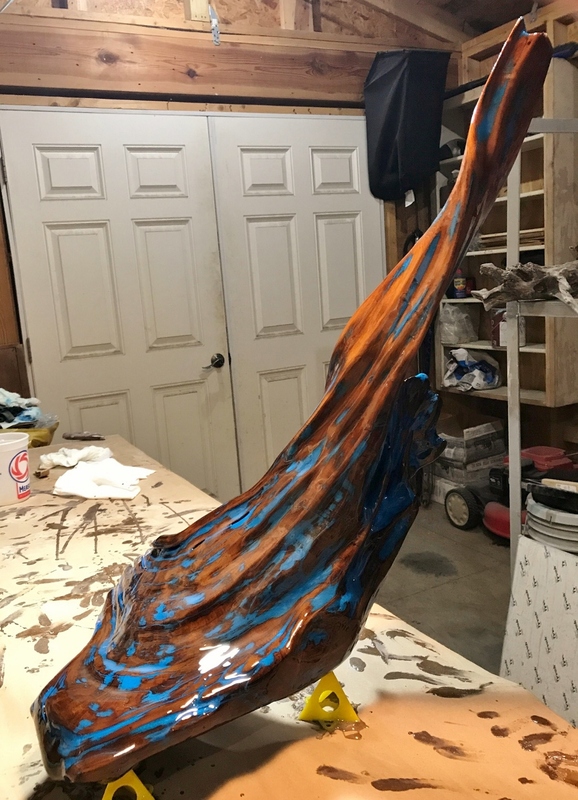 Aquarium/Terrarium Piece. 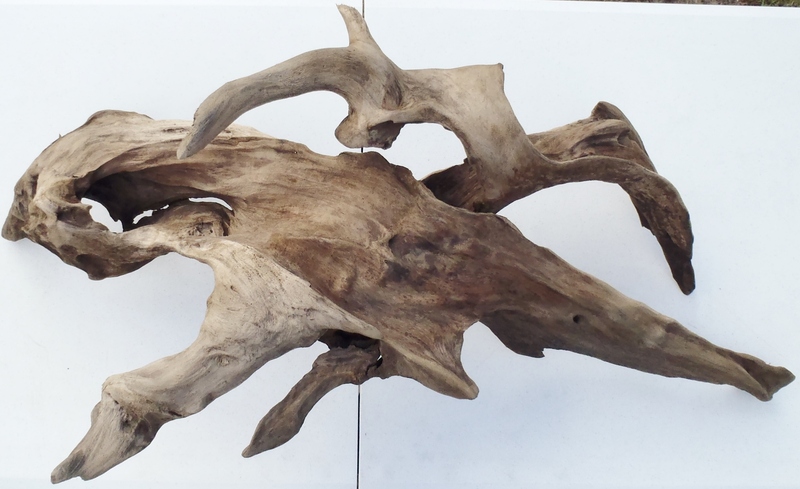 Taxidermy Piece. 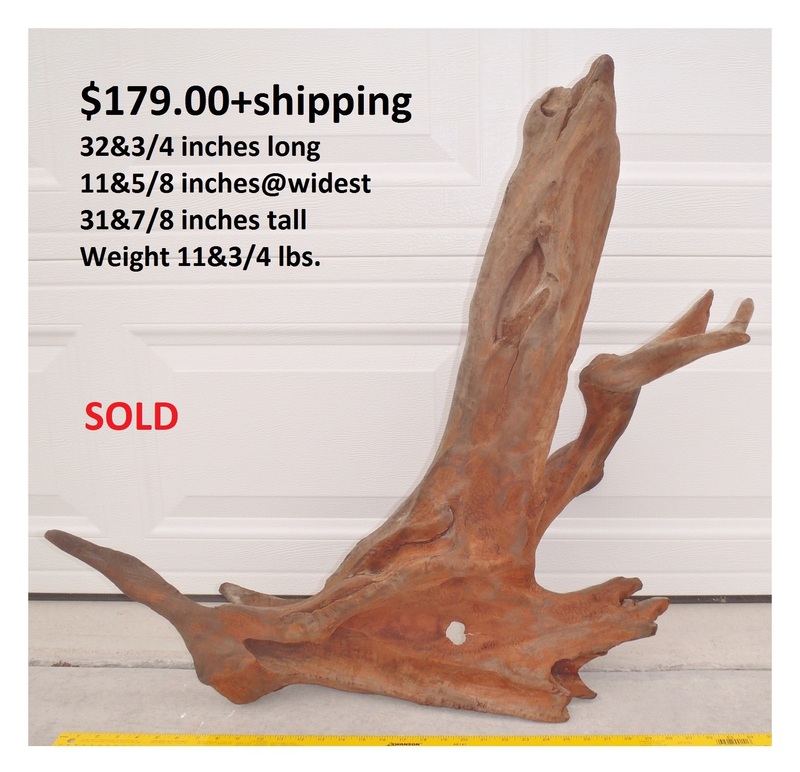 A heavy-duty upright decorative piece. 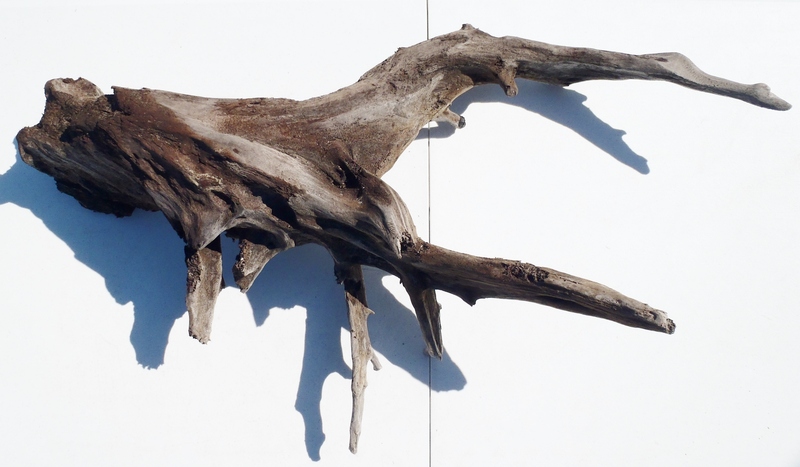 A knockout piece to lean on or mount on the wall. 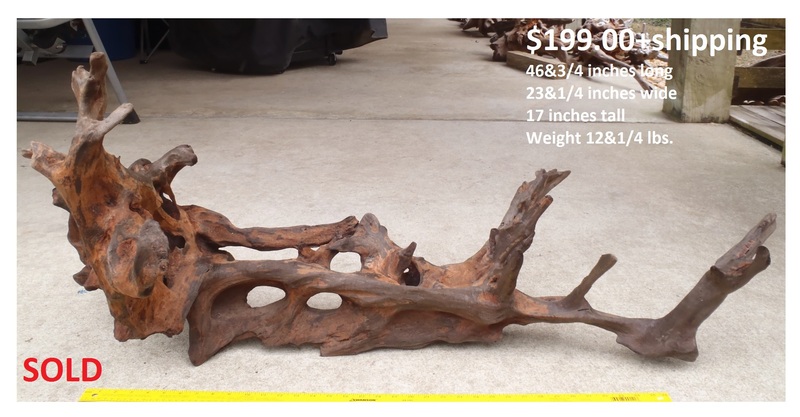 Uses: Decorative Piece. 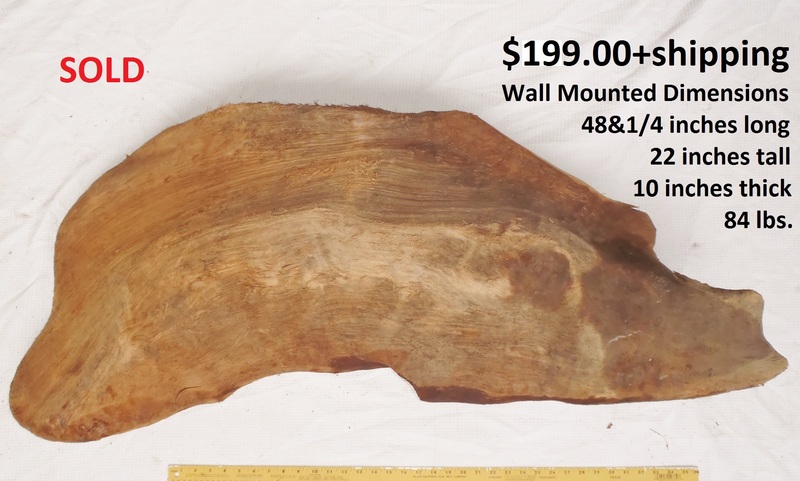 Wall Mounted Piece. 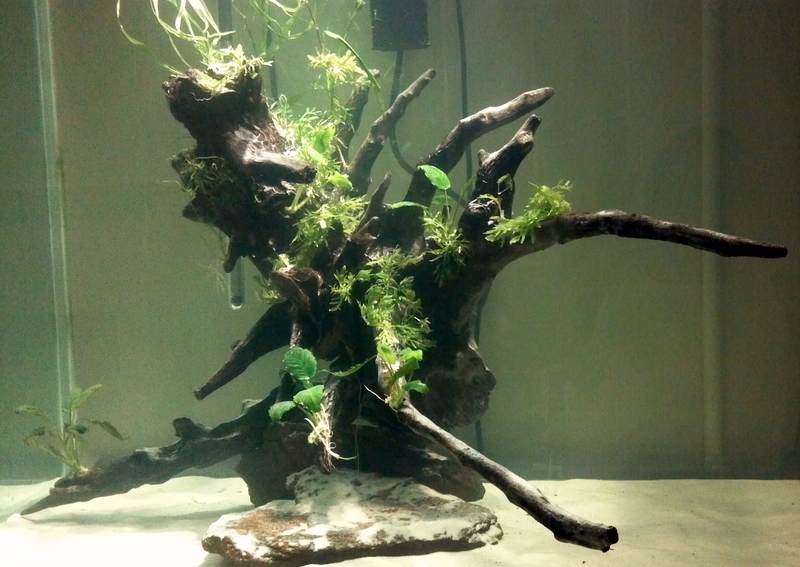 Aquarium/Terrarium Piece. 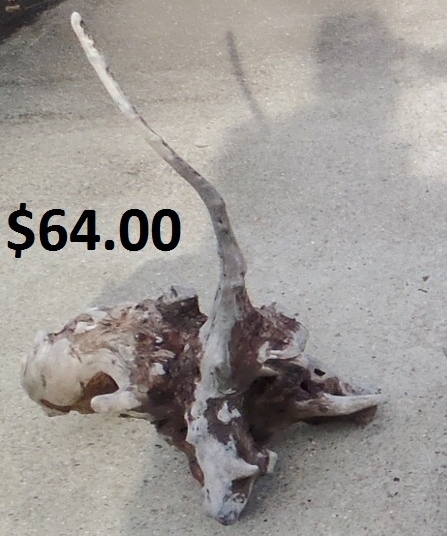 Taxidermy Piece. 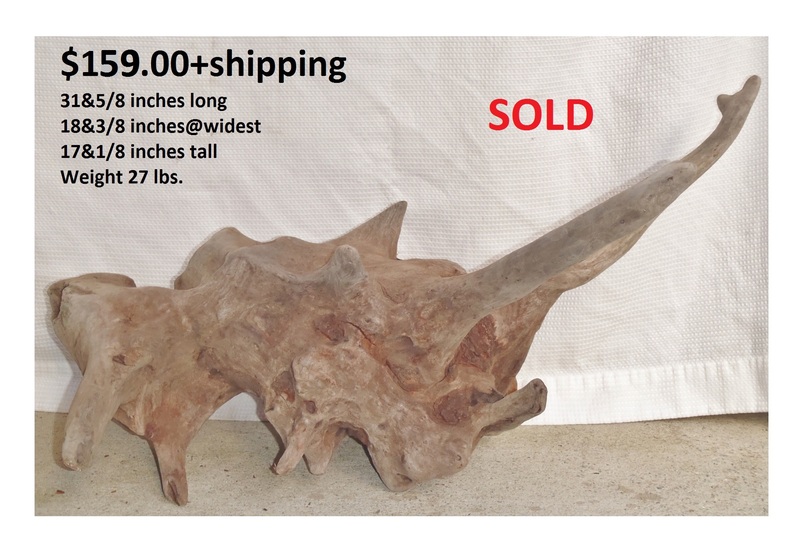 Approximate Dimensions: 30 inches long - 31&3/8 inches at widest - 21 inches tall - Weight 17&1/2 lbs. 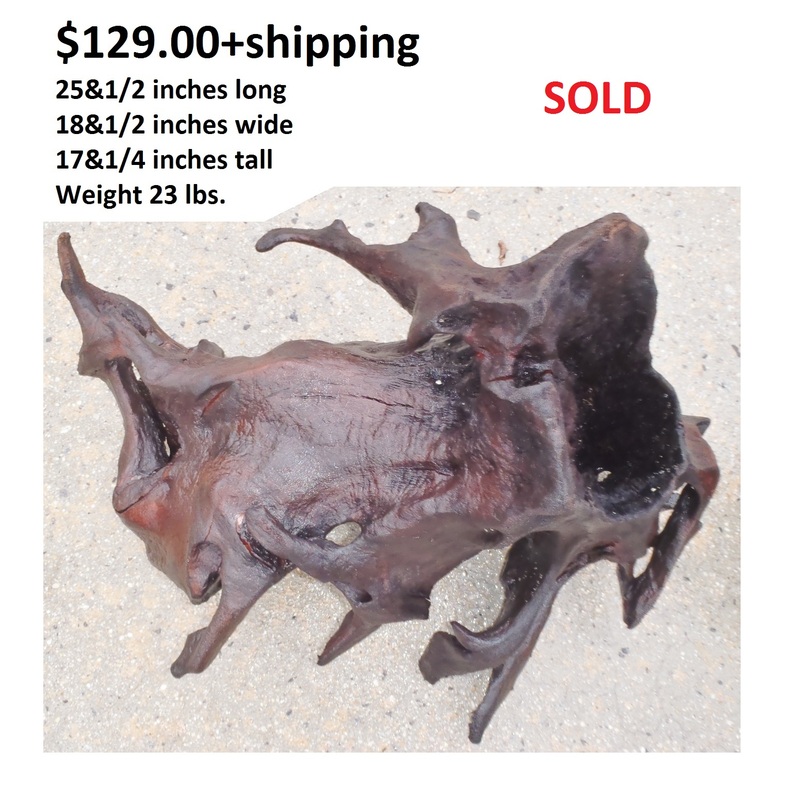 Approximate Dimensions: 29&1/2 inches long - 23 inches at widest - 16&1/2 inches tall - Weight 24&1/4 lbs. 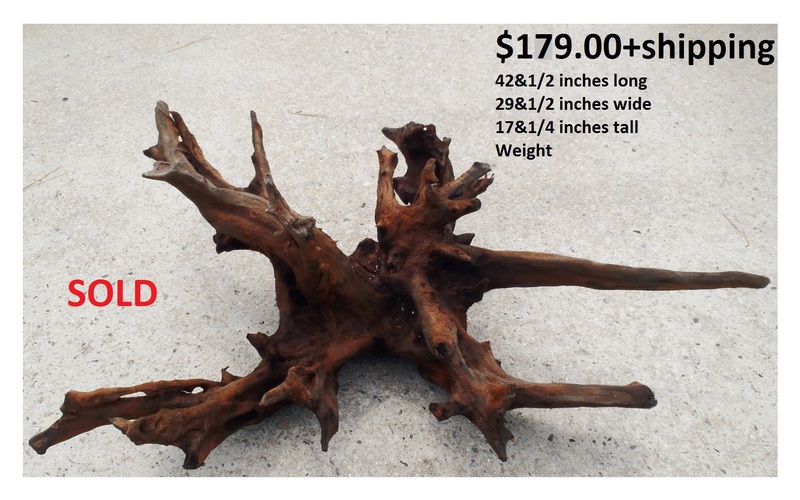 Approximate Dimensions: 27&1/2 inches long - 20&3/4 inches at widest - 17 inches tall - Weight 18&1/4 lbs. 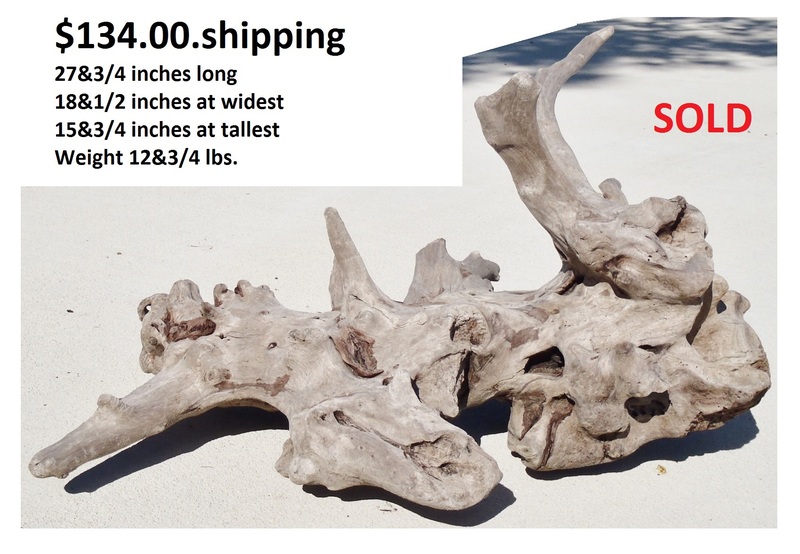 Approximate Dimensions: 41&3/4 inches long - 14 inches at widest - 14&1/2 inches tall - Weight 19&1/4 lbs. 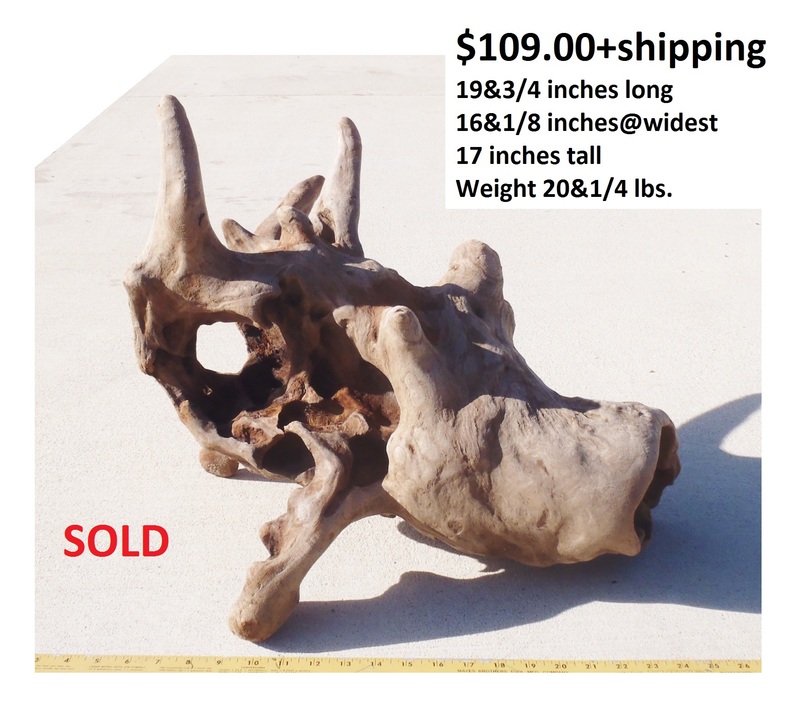 Approximate Dimensions: 24&1/2 inches long - 12&1/4 inches at widest - 15&1/8 inches tall - Weight 18 lbs. 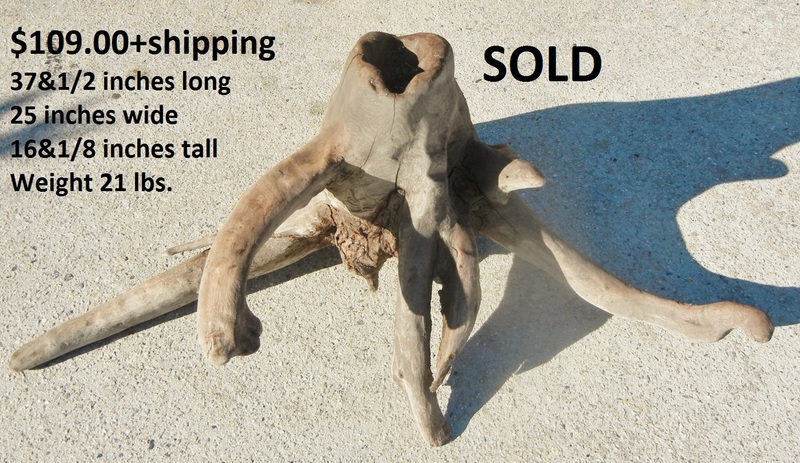 Approximate Dimensions: 44&1/2 inches long - 14&1/8 inches at widest - 17&1/2 inches tall - Weight 24 lbs. 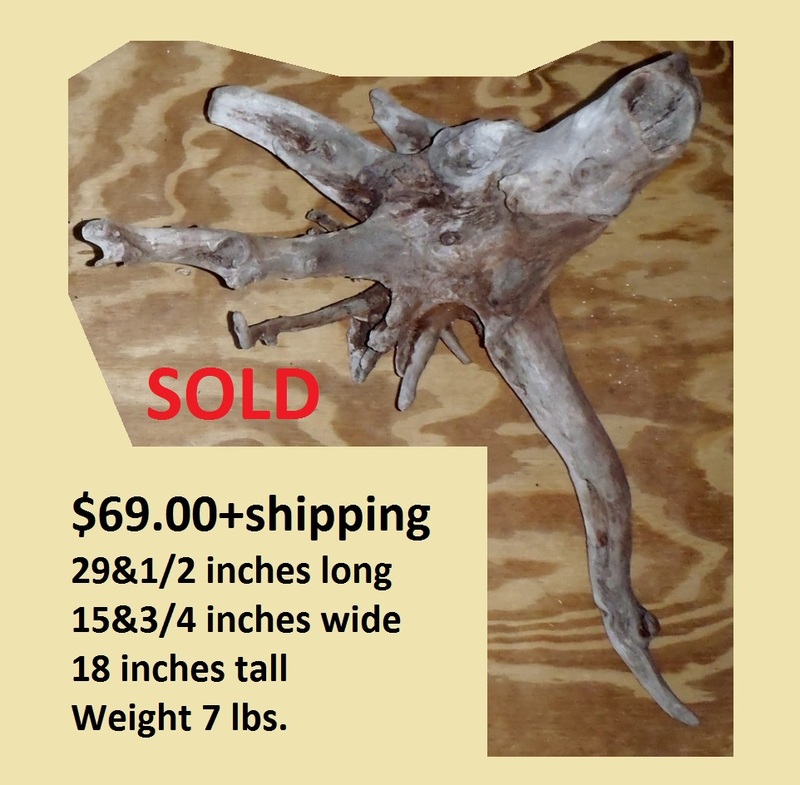 Approximate Dimensions: 30&1/2 inches long - 16&7/8 inches at widest - 16&5/8 inches tall - Weight 19 lbs. 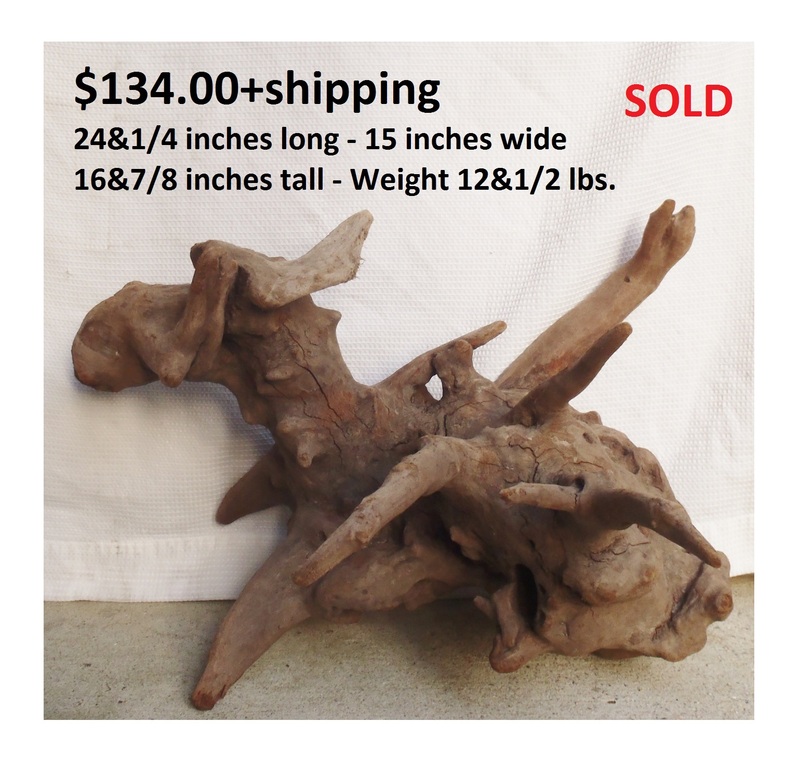 Approximate Dimensions: 33&5/8 inches long - 14&5/8 inches at widest - 14&1/2 inches tall - Weight 19 lbs. 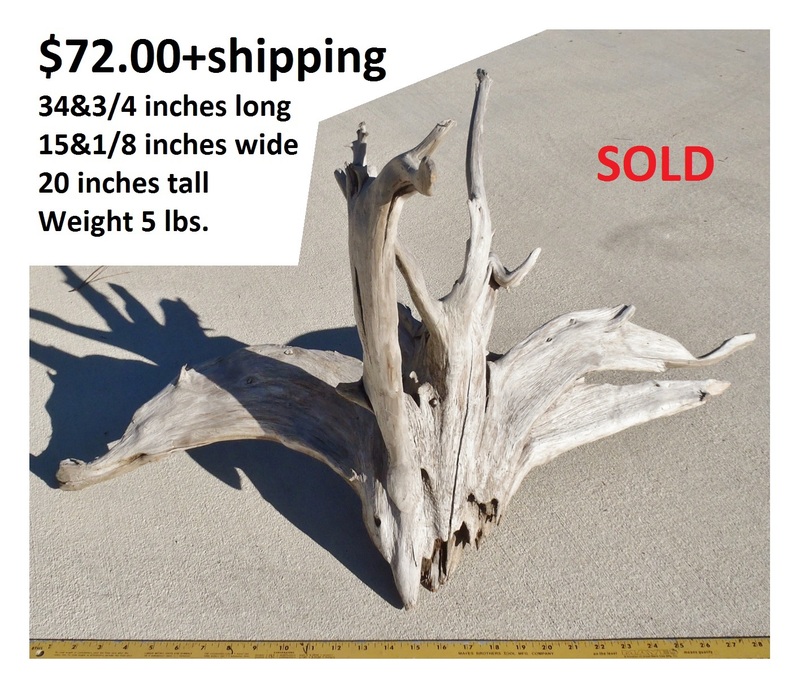 Approximate Dimensions: __ inches long - __ inches at widest - inches tall - Weight 11&1/4 lbs. 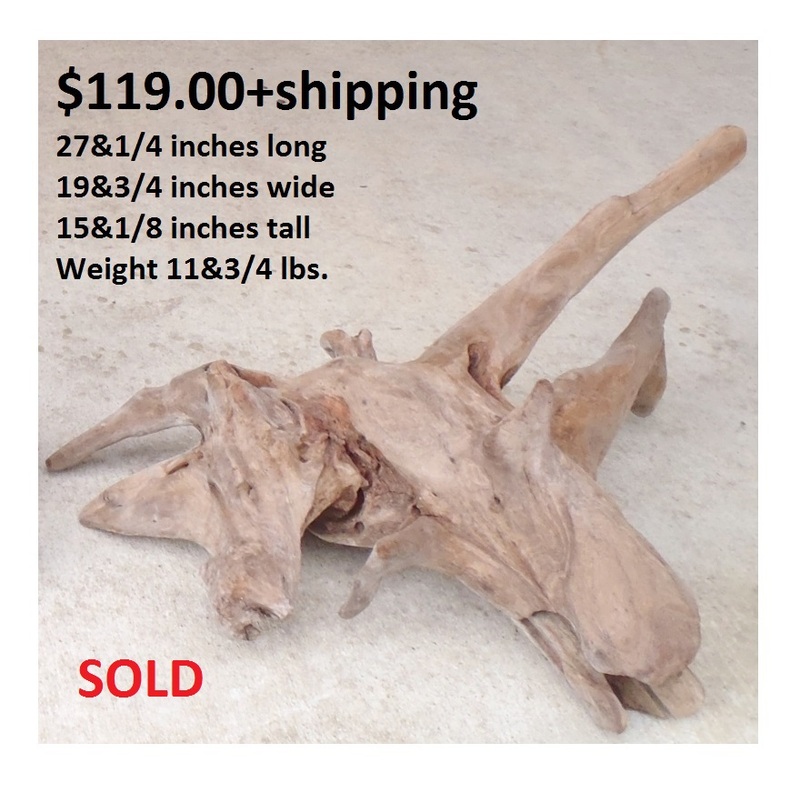 Approximate Dimensions: __ inches long - __ inches at widest - __ inches tall - Weight 16 lbs. 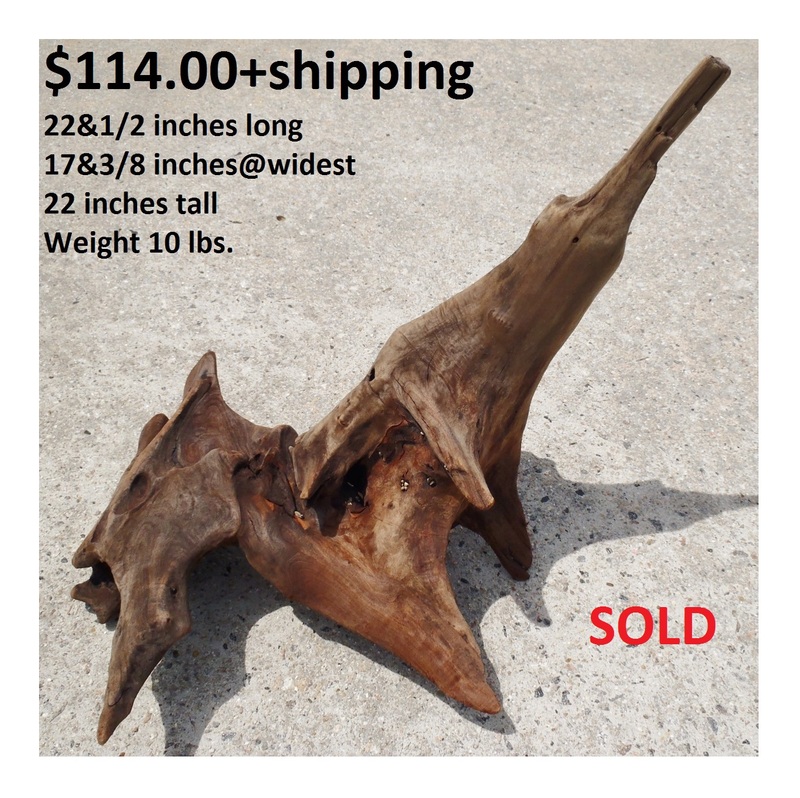 Approximate Dimensions: 38&1/2 inches long - 13&1/4 inches at widest - 15&7/8 inches tall - Weight 18&1/4 lbs. 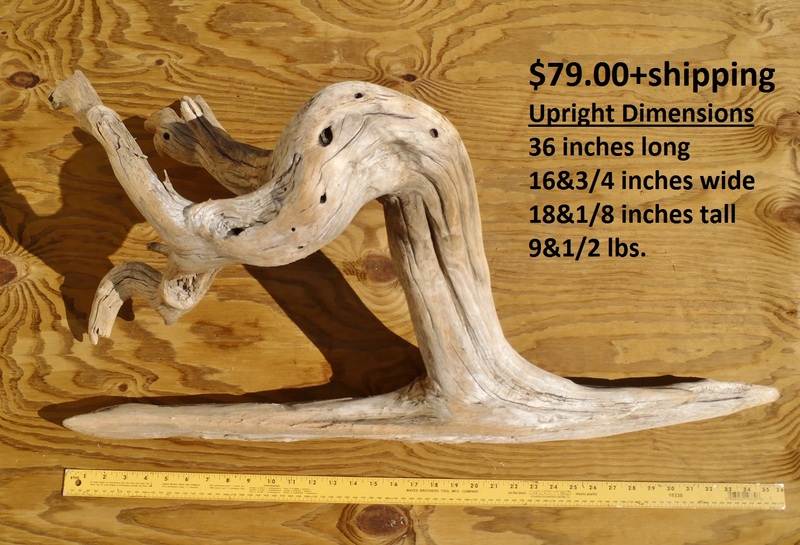 Approximate Dimensions: 29&3/8 inches long - 15&1/4 inches at widest - 22 inches tall - Weight 14&1/2 lbs. 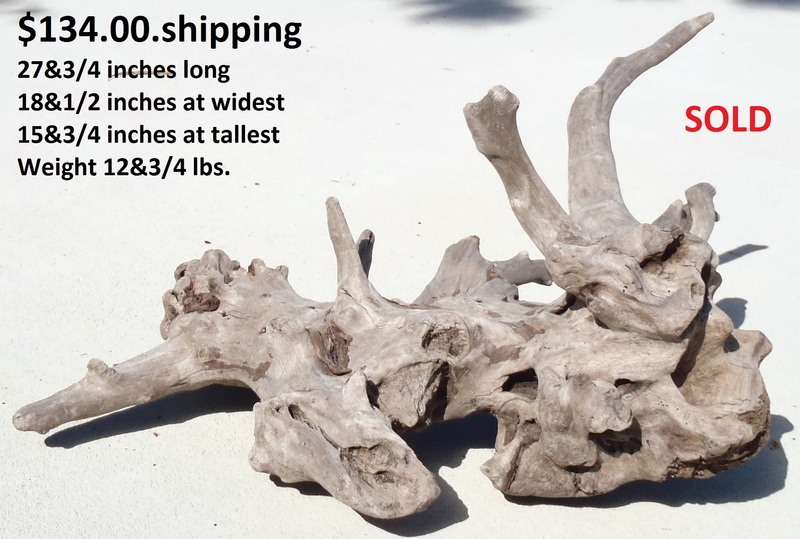 Approximate Dimensions: 29&1/4inches long - 14&7/8 inches at widest - 9&1/8 inches tall - Weight 7&1/2 lbs. 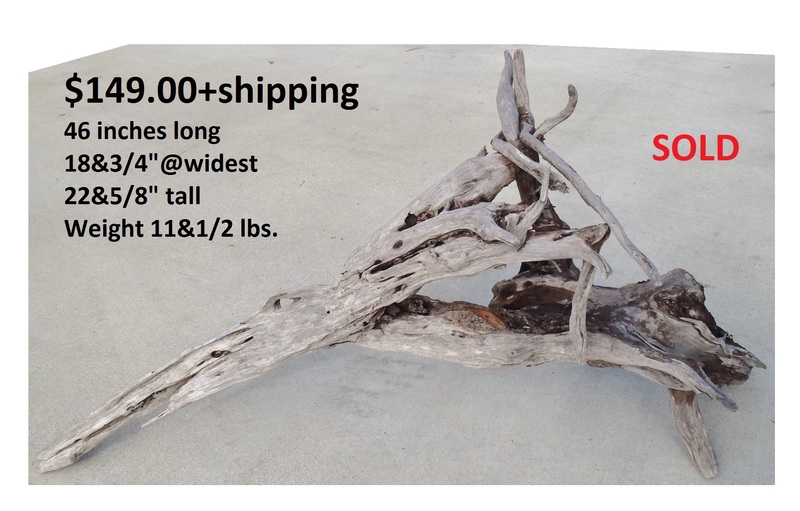 Approximate Dimensions PHOTO#1: 29&5/8 inches long - 14 inches at widest - 17&1/8 inches tall - Weight 10 lbs. 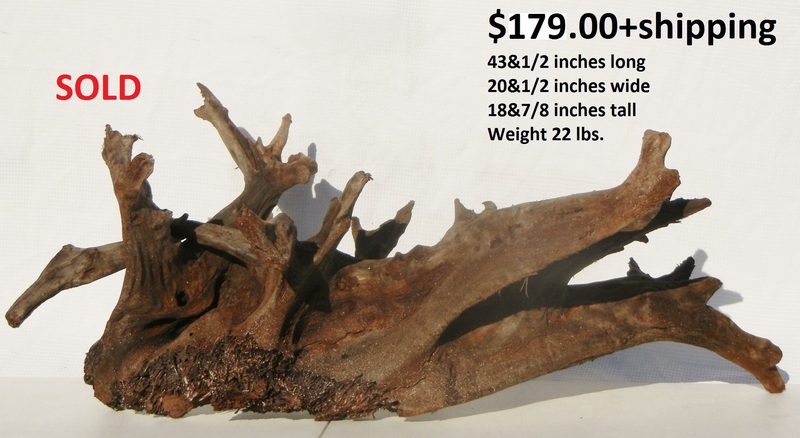 Approximate Dimensions PHOTO#2: 22&1/2 inches long - 17&3/8 inches at widest - 22 inches tall - Weight 10 lbs. 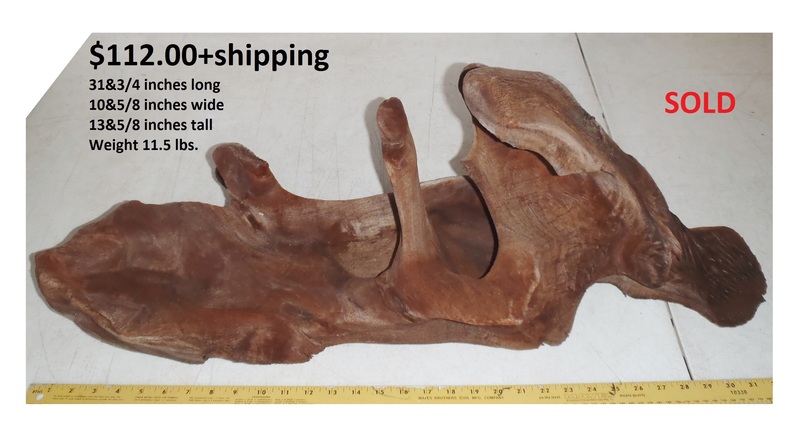 Approximate Dimensions: 25&1/2 inches long - 18&1/2 inches at widest - 17&1/4 inches tall - Weight 23 lbs. 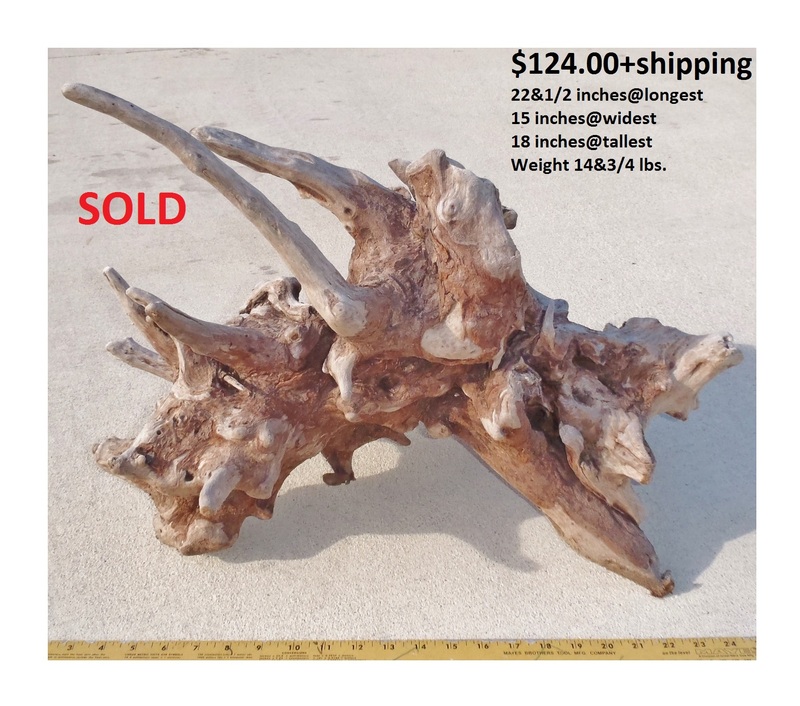 Approximate Dimensions PHOTOS#1&2: 26&1/2 inches long - 13&3/8 inches at widest - 14&1/2 inches tall - Weight 17&1/4 lbs. 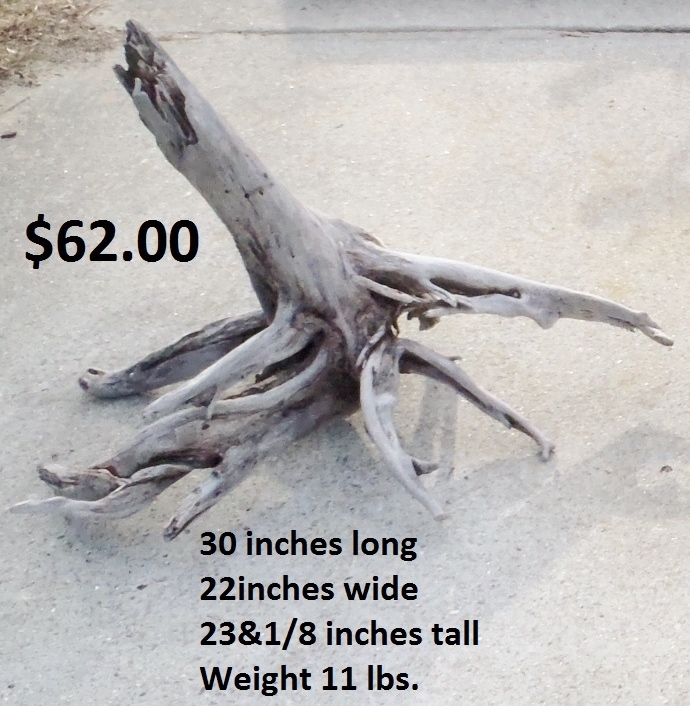 Approximate Dimensions PHOTOS#3&4: 26&1/2 inches long - 14&7/8 inches at widest - 13&7/8 inches tall - Weight 17&1/4 lbs. 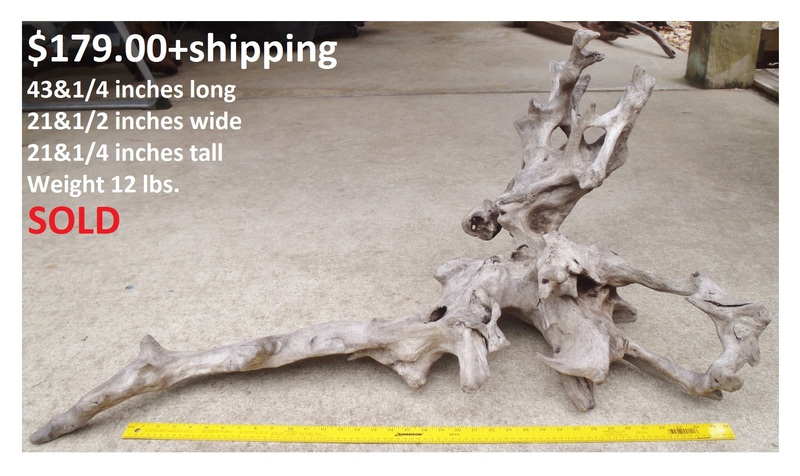 Approximate Dimensions PHOTOS #3&4: 27&1/2 inches long - 16&3/4 inches at widest - 18&5/8 inches tall - Weight 13&1/4 lbs. 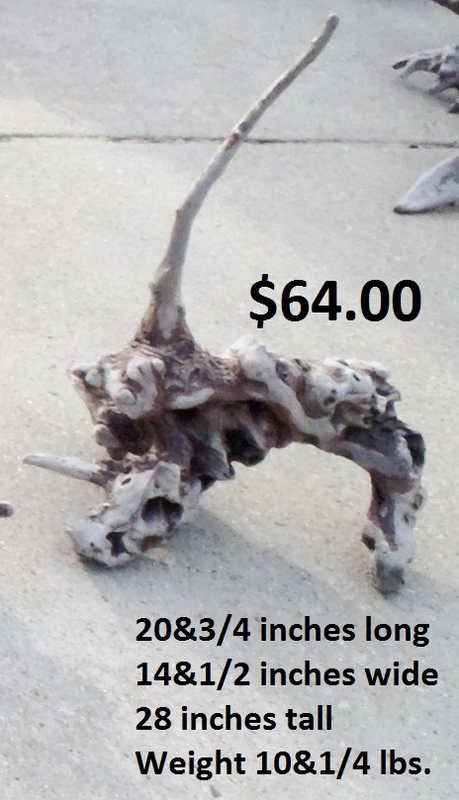 Approximate Dimensions PHOTO #5: 23&1/2 inches long - 17&5/8 inches at widest - 14&5/8 inches tall - Weight 13&1/4 lbs. 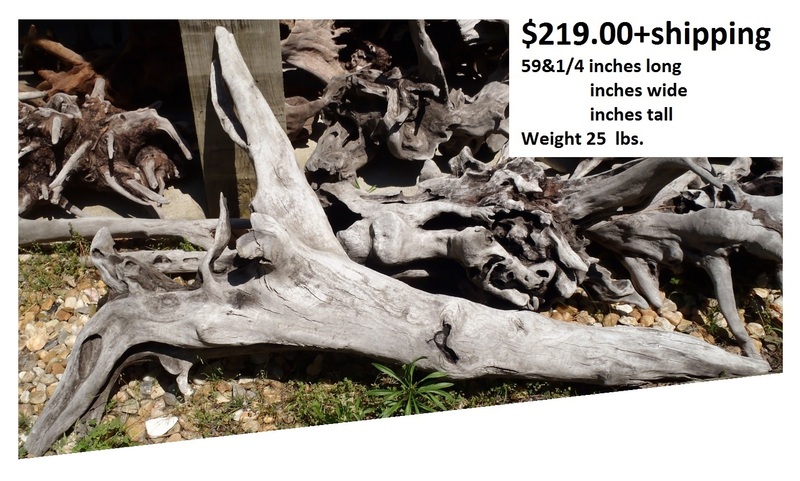 Approximate Dimensions: 27 inches long - 23&3/4 inches at widest - 20 inches tall - Weight 12&3/4 lbs. 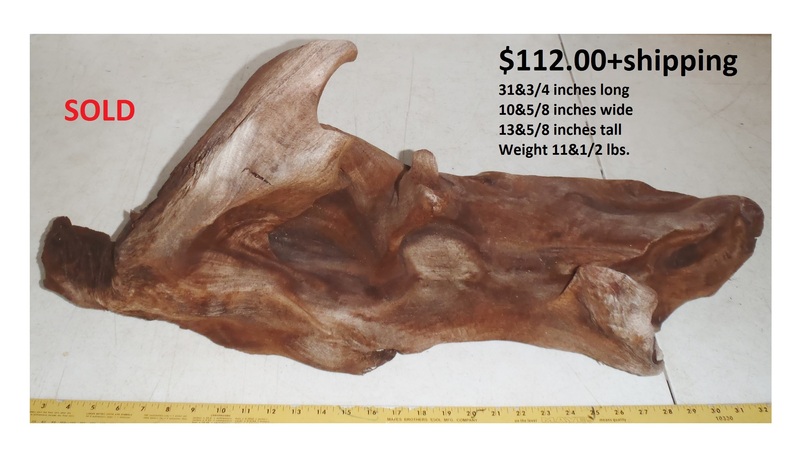 Approximate Dimensions PHOTOS#1-5: 30 inches long - 17&3/4 inches at widest - 12&3/4 inches tall - Weight 17&1/2 lbs. 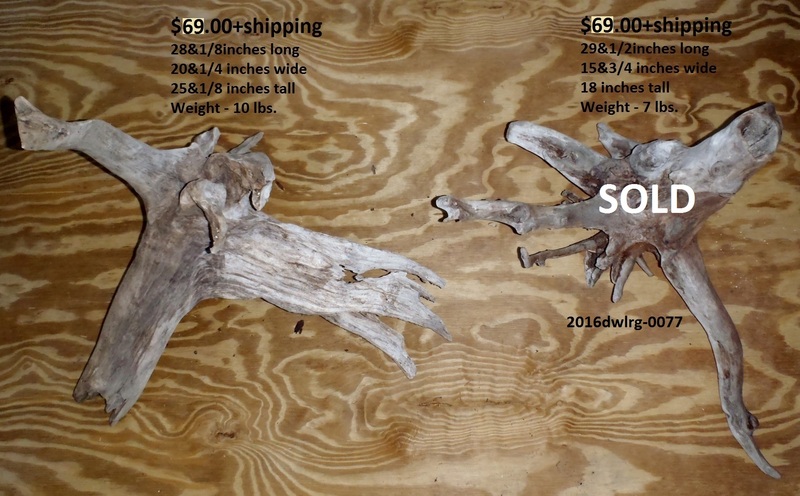 Approximate Dimensions PHOTOS#6-8: 28&7/8 inches long - 17&3/4 inches at widest - 14&7/8 inches tall - Weight 17&1/2 lbs. 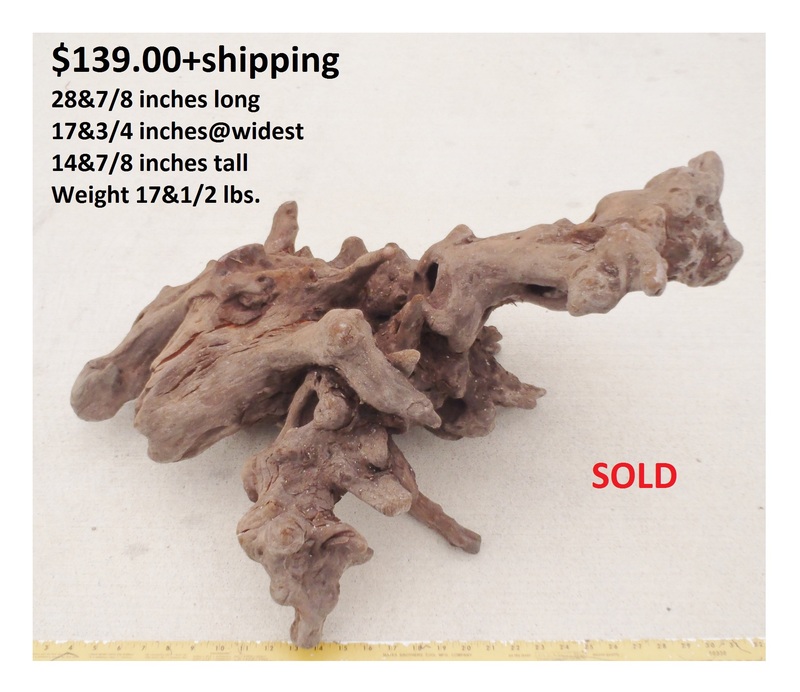 Approximate Dimensions: __ inches long - __ inches at widest - __ inches tall - Weight 15&3/4 lbs. 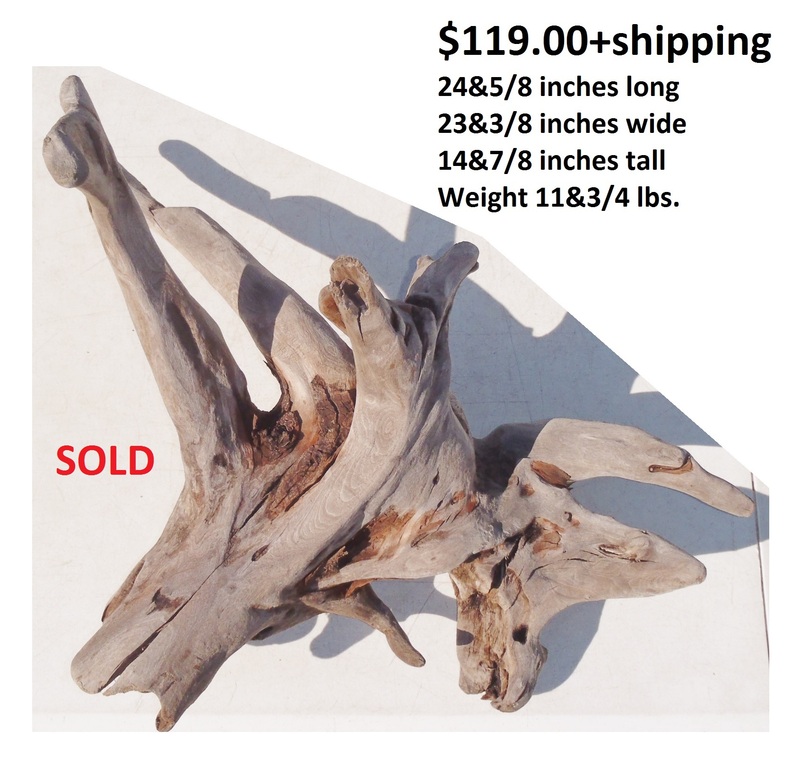 Approximate Dimensions: __ inches long - __ inches at widest - __ inches tall - Weight 21 lbs. 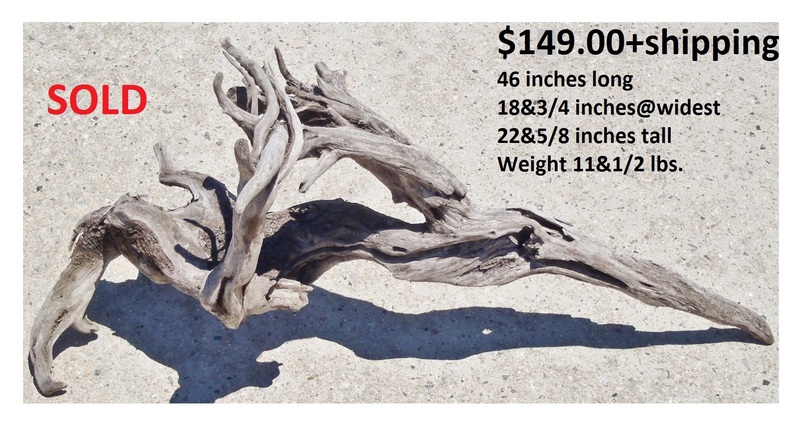 Approximate Dimensions PHOTOS #1&2: 23&5/8 inches long - 17&1/2 inches at widest - 16 inches tall - Weight 8&1/2 lbs. 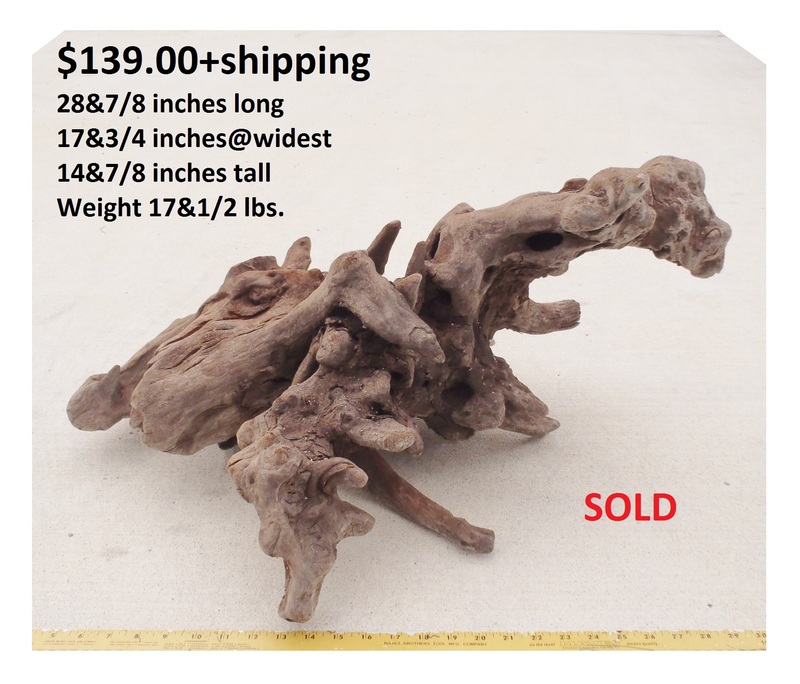 Approximate Dimensions PHOTOS #3&4: 23&3/4 inches long - 13&1/4 inches at widest - 18&1/4 inches tall - Weight 8&1/2 lbs. 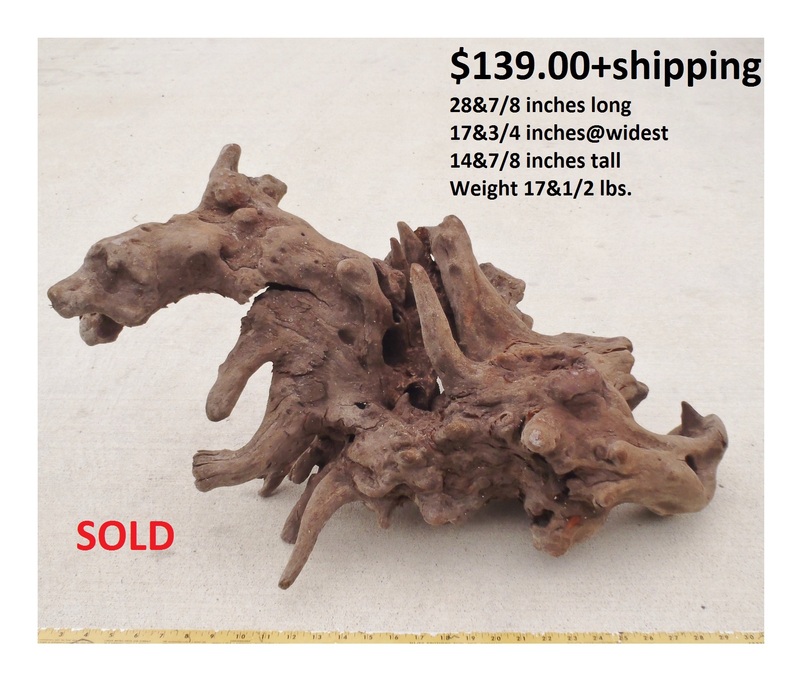 Approximate Dimensions PHOTOS#1-3: 30&5/8 inches long - 21&3/4 inches at widest - 15&5/8 inches tall - Weight 8&1/4 lbs. 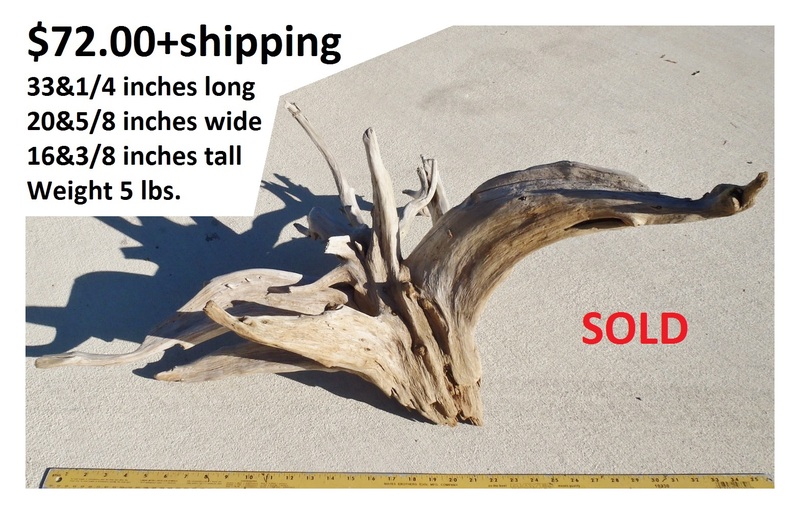 Approximate Dimensions PHOTOS#4&5: 30&3/4 inches long - 22&1/8 inches at widest - 15&1/2 inches tall - Weight 8&1/4 lbs. 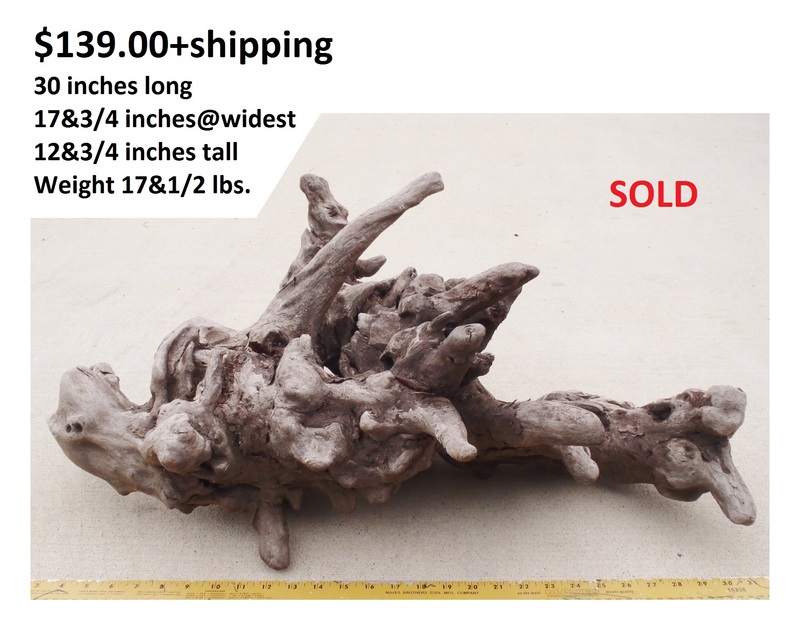 Approximate Dimensions PHOTOS#6&7: 30&1/8 inches long - 26&1/4 inches at widest - 22&1/4 inches tall - Weight 8&1/4 lbs. 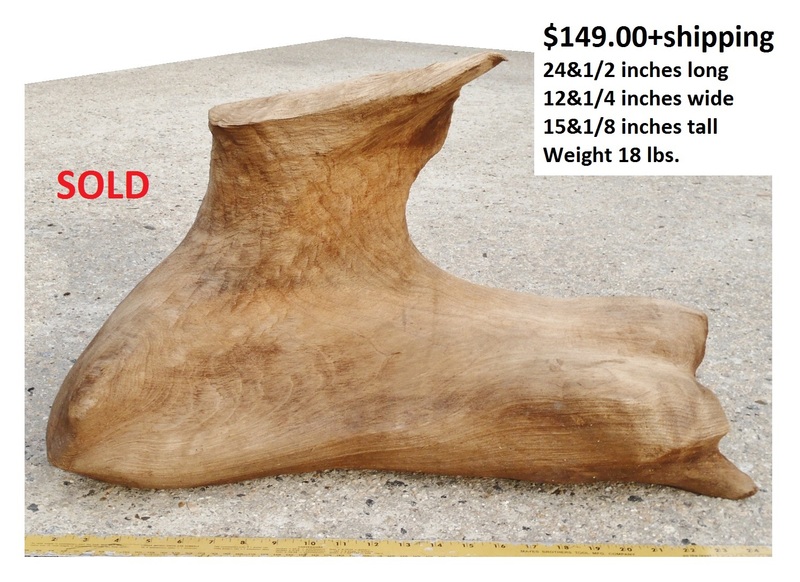 Approximate Dimensions: 31&5/8 inches long - 18&3/8 inches at widest - 17&1/8 inches tall - Weight 27 lbs. 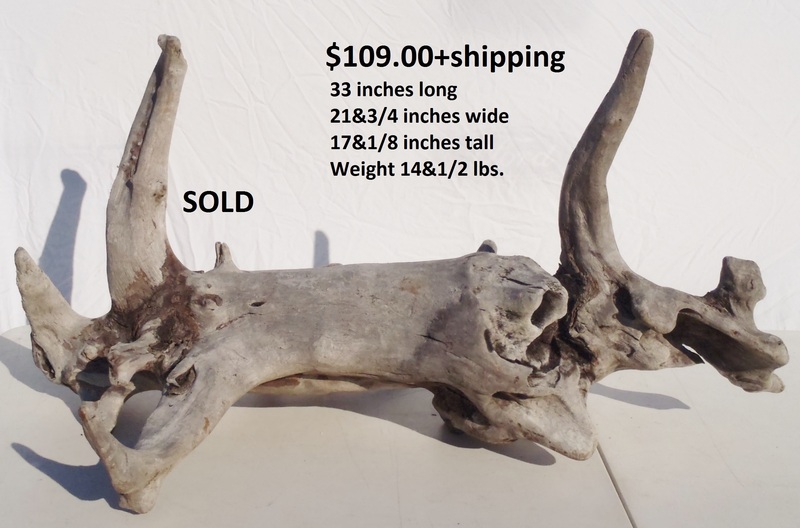 "The Moose" - Approximate Dimensions: 24&1/4 inches long - 15 inches at widest - 16&7/8 inches tall - Weight 12&1/2 lbs. 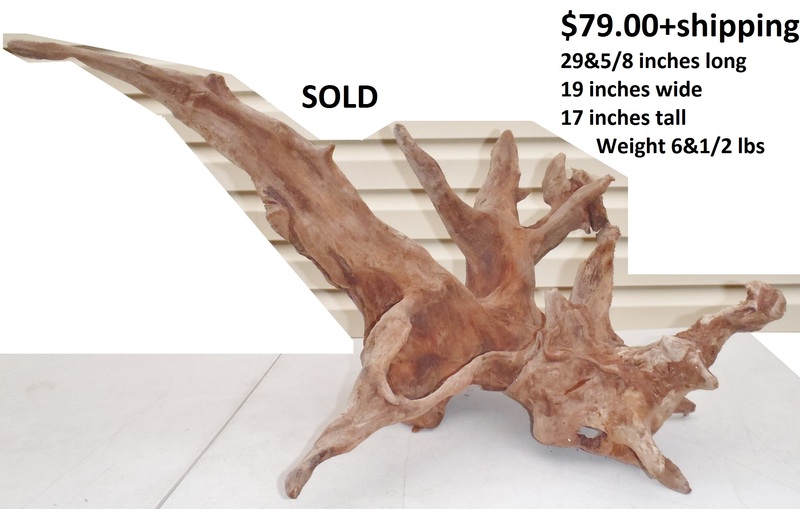 Approximate Dimensions: 26 inches long - 22&1/8 inches wide - 21&5/8 inches tall - Weight 8&1/4 lbs. 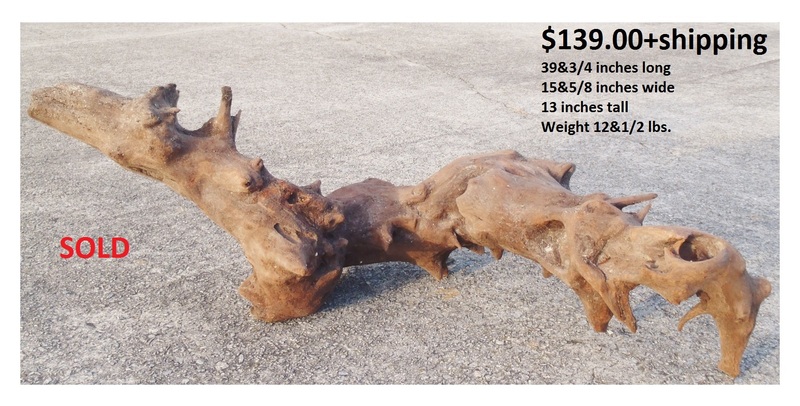 Approximate Dimensions PHOTOS#1-3: 46 inches long - 18&3/4 inches at widest - 22&5/8 inches tall - Weight 11&1/2 lbs. 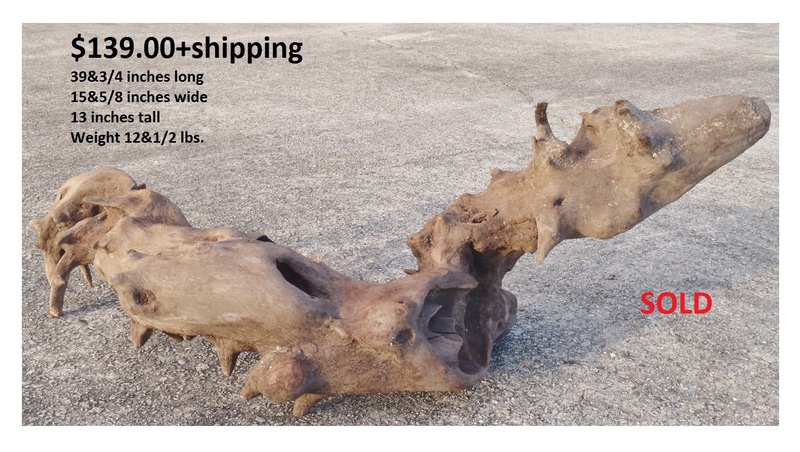 Approximate Dimensions PHOTOS#4&5: 46 inches long - 24&3/8 inches at widest - 17&1/4 inches tall - Weight 11&1/2 lbs. 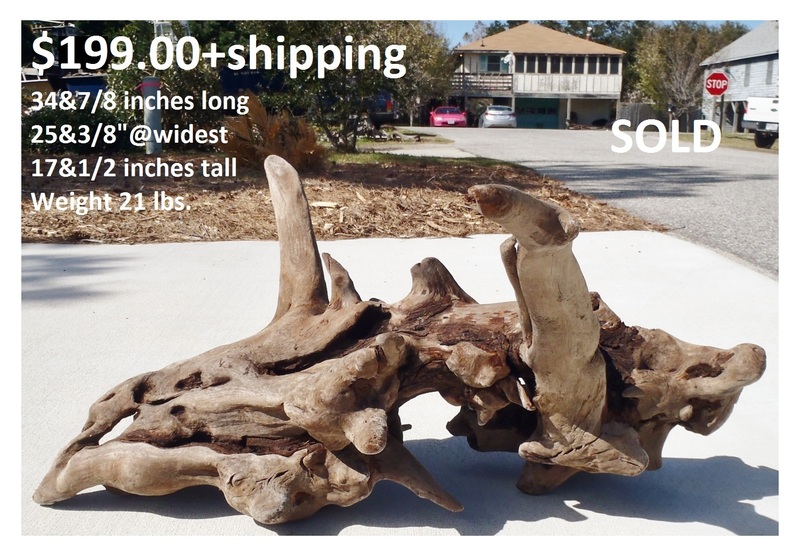 Approximate Dimensions PHOTO#1&2: 23 inches long - 20&1/8 inches wide - 15&5/8 inches tall - Weight 12 lbs. 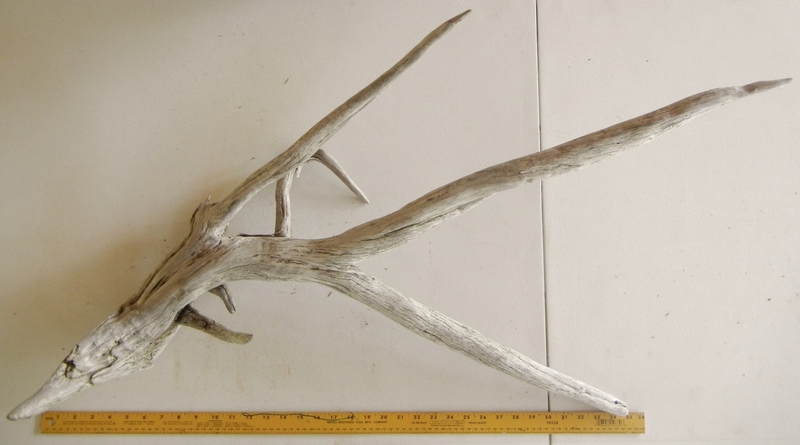 Approximate Dimensions PHOTO#3: 25&5/8 inches long - 22&1/4 inches wide - 15&5/8 inches tall - Weight 12 lbs. 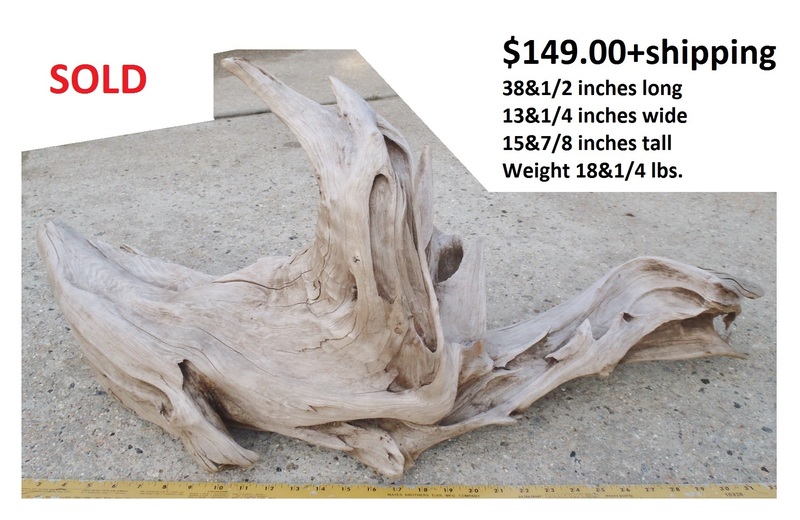 Approximate Dimensions PHOTOS #1-3: 19&3/4 inches long - 16&1/8 inches at widest - 17 inches tall - Weight 20&1/4 lbs. 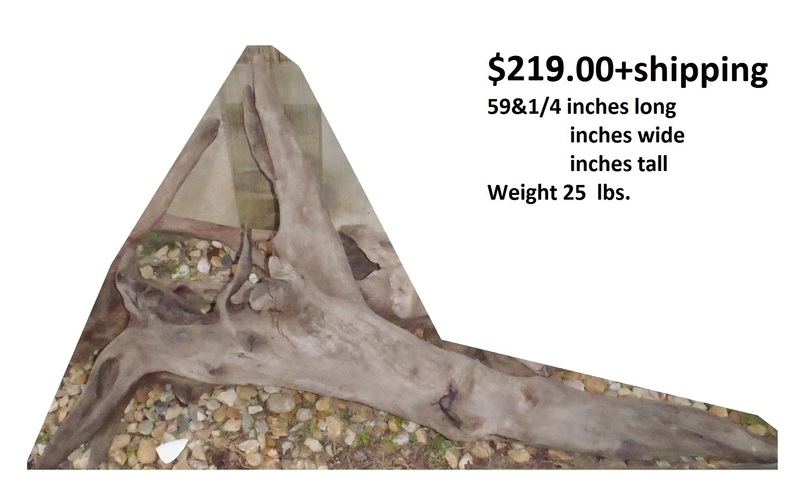 Approximate Dimensions PHOTOS #3-6: 19 inches long - 13&1/2 inches at widest - 19 inches tall - Weight 20&1/4 lbs. 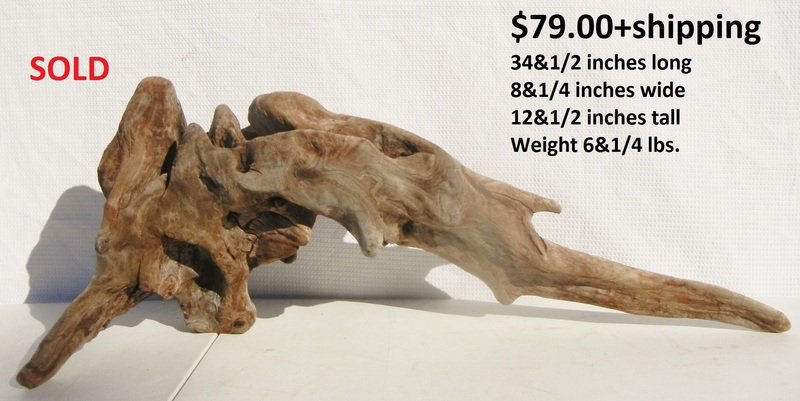 Approximate Dimensions: 22&1/2 inches long - 15 inches at widest - 18 inches tall - Weight 14&3/4 lbs. 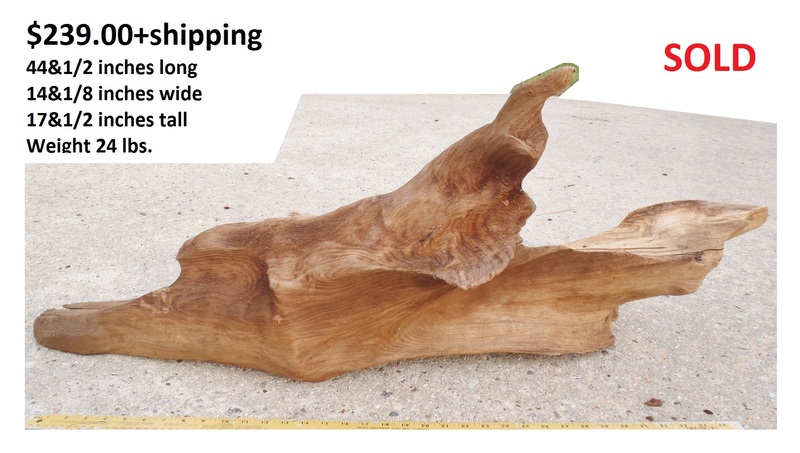 Approximate Dimensions PHOTOS#1&#2: 39&3/4 inches long - 15&5/8 inches at widest - 13 inches tall - Weight 12&1/2 lbs. 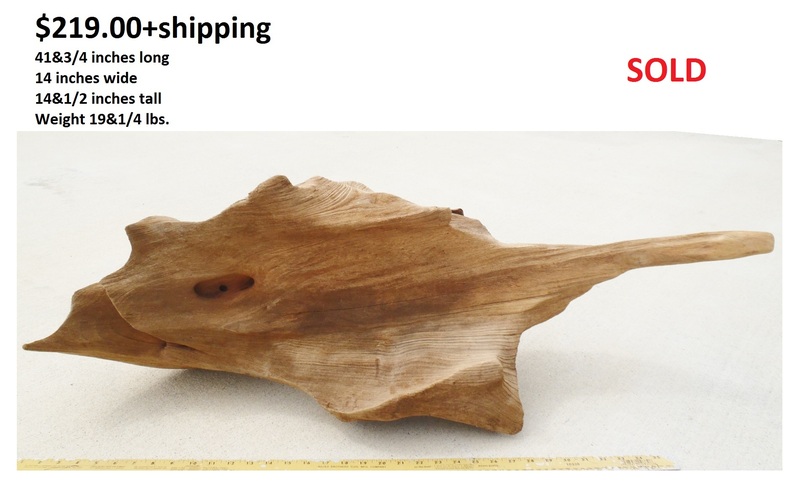 Approximate Dimensions: 27&3/4 inches long - 18&1/2 inches at widest - 13&5/8 inches tall - Weight 15&3/4 lbs. 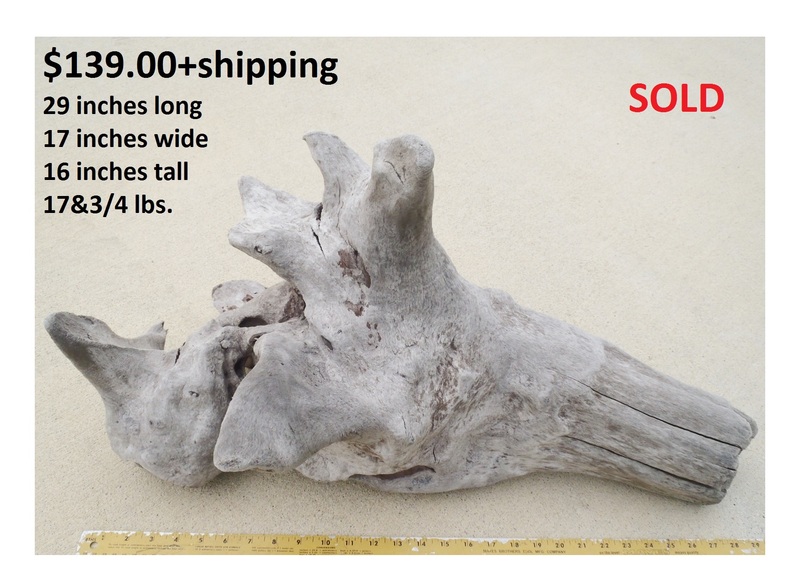 Approximate Dimensions: 24&3/8 inches long - 13 inches wide - 19&1/8 inches tall - Weight 7&1/2 lbs. 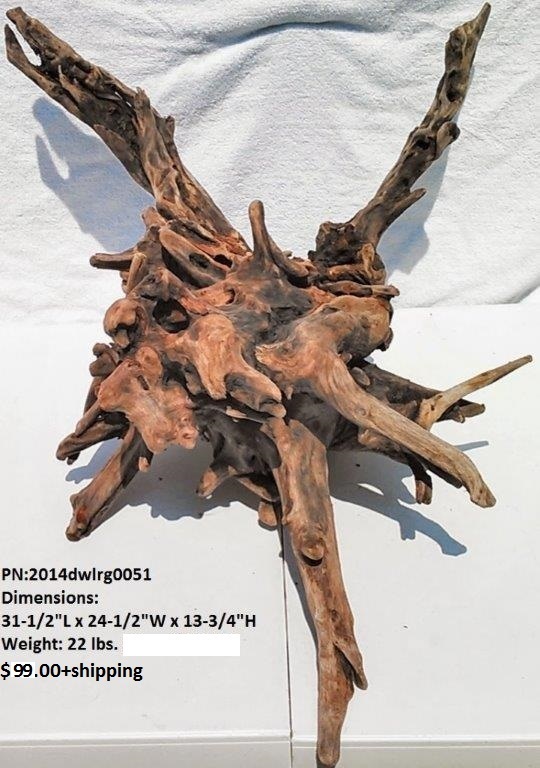 Approximate Dimensions PHOTO#1: 34&3/4 inches long - 15&1/8 inches wide - 20 inches tall - Weight 5 lbs. 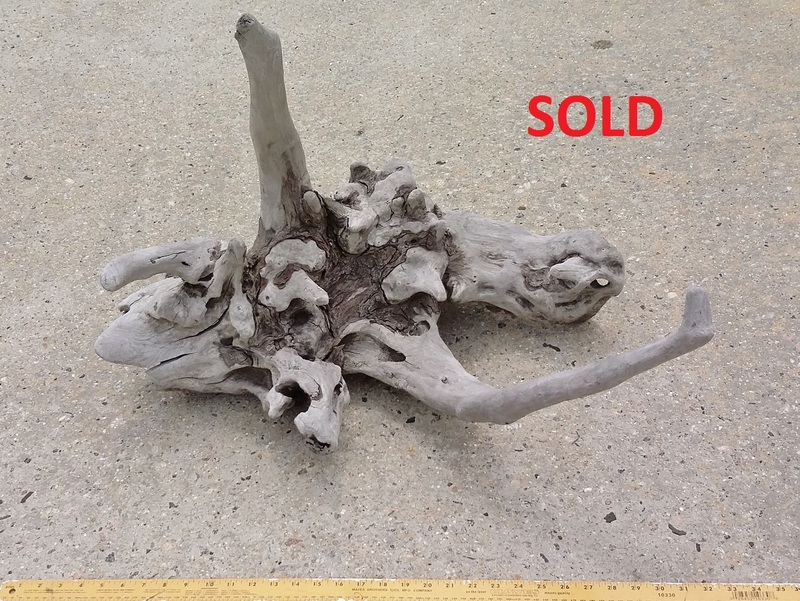 Approximate Dimensions PHOTO#2: 33&1/4 inches long - 20&5/8 inches wide - 16&3/8 inches tall - Weight 5 lbs. 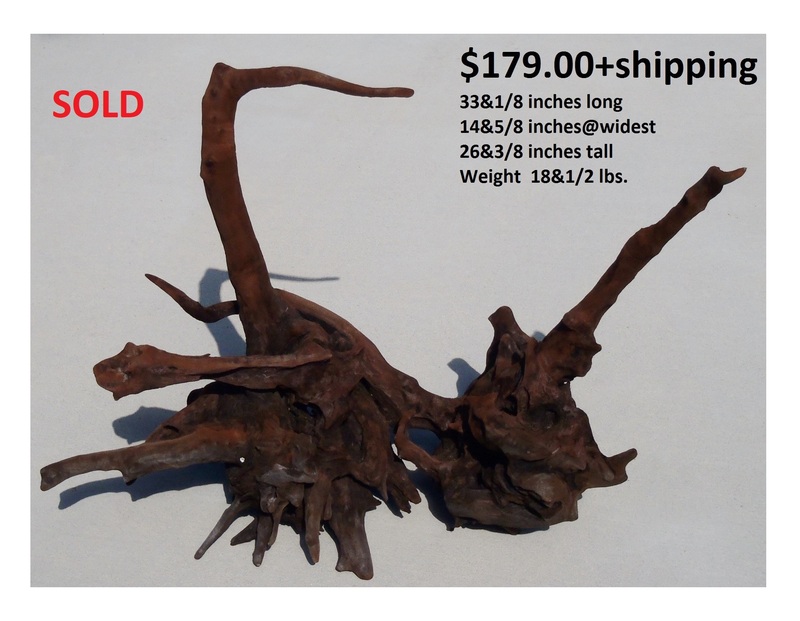 Approximate Dimensions PHOTO#1: 30&3/4 inches long - 27&7/8 inches wide - 20 inches tall - Weight 18&1/2 lbs. 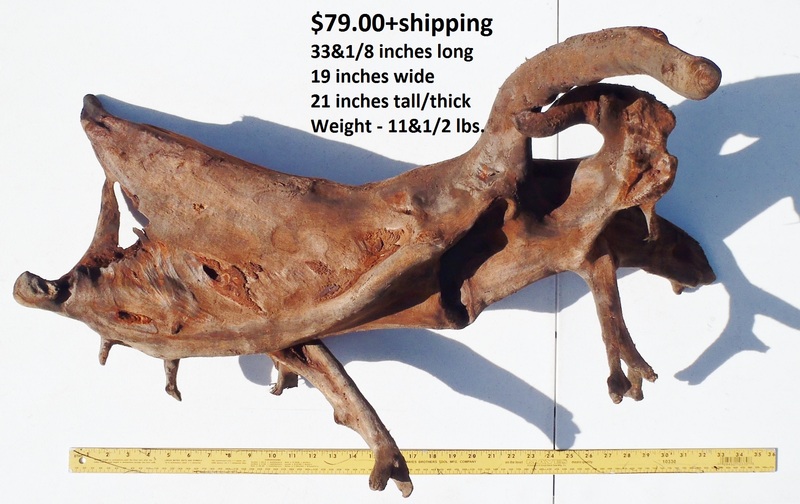 Approximate Dimensions PHOTO#7: 29 inches long - 21 inches wide - 20 inches tall - Weight 18&1/2 lbs. 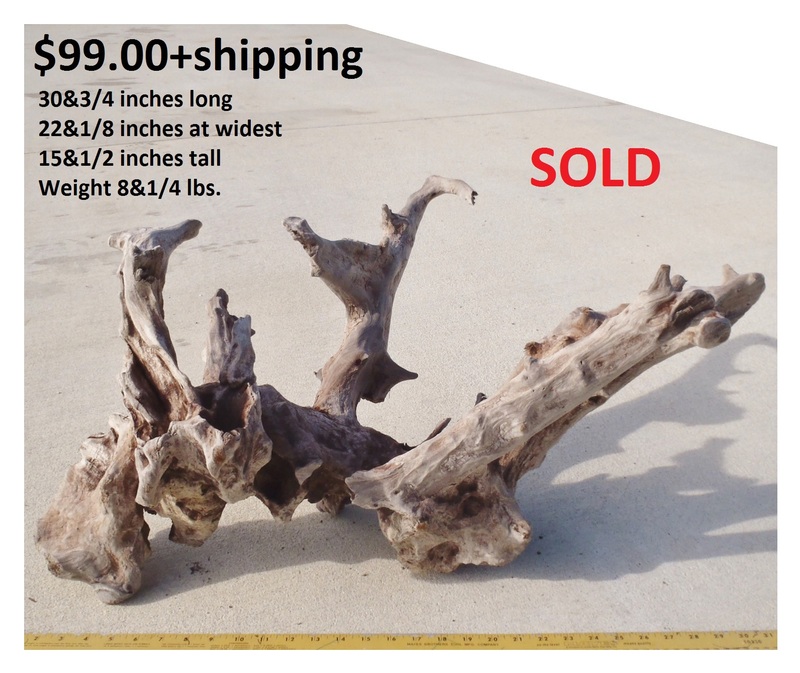 Approximate Dimensions PHOTOS #5-8: 34&7/8 inches long - 25&3/8 inches wide - 17&1/2 inches tall - Weight 21 lbs. 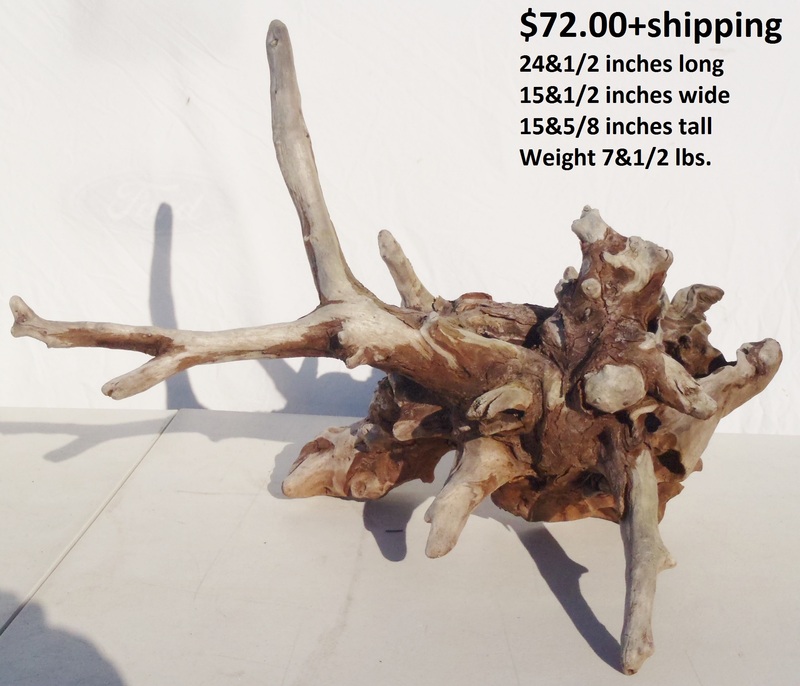 Approximate Dimensions: 26&1/4 inches long - 24 inches wide - 20&1/8 inches tall - Weight 25 lbs. 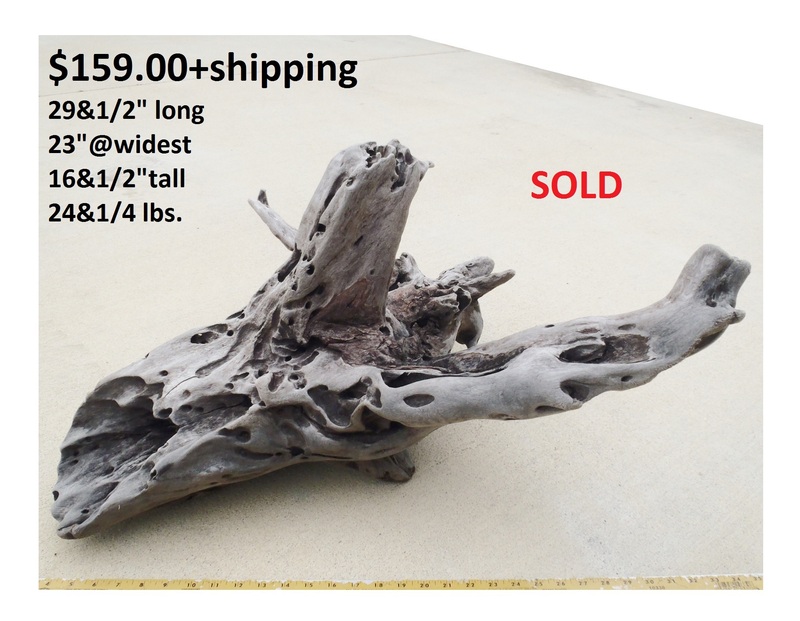 Approximate Dimensions PHOTOS#1&#2: 24&5/8 inches long - 23&3/8 inches wide - 14&7/8 inches tall - Weight 11&3/4 lbs. 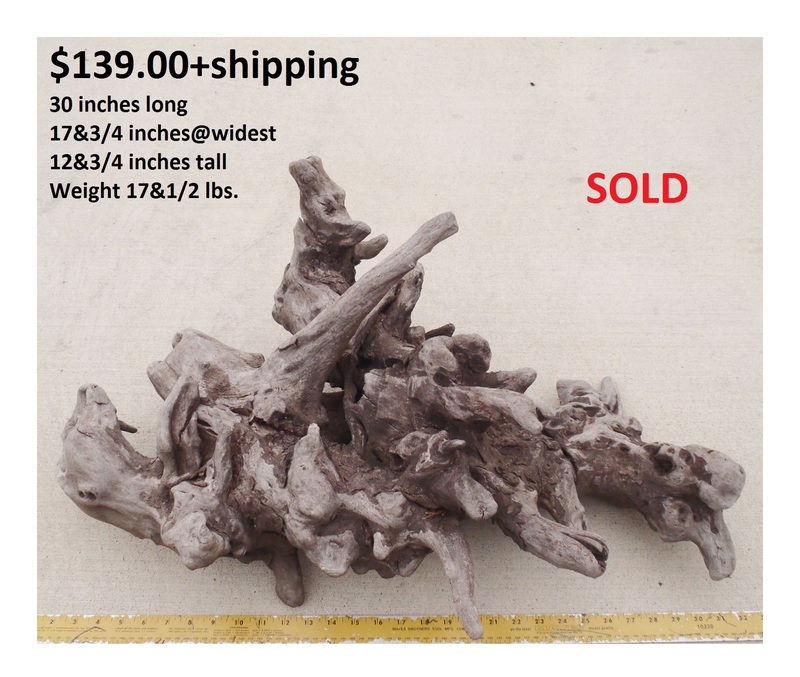 Approximate Dimensions PHOTOS#3: 27&1/4 inches long - 19&3/4 inches wide - 15&1/8 inches tall - Weight 11&3/4 lbs. 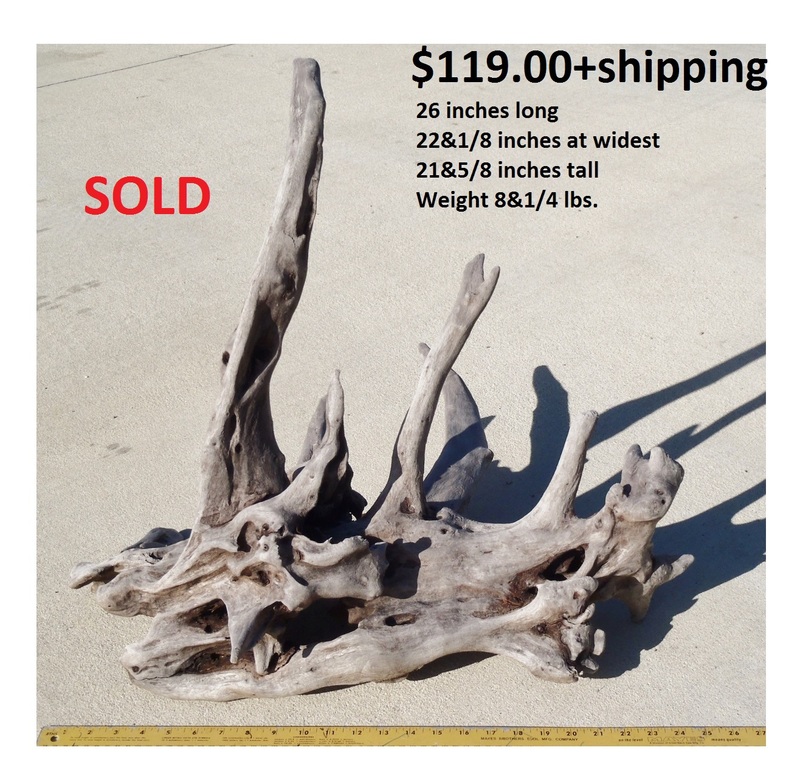 Approximate Dimensions: 31&3/4 inches long - 10&5/8 inches wide - 13&5/8 inches tall - Weight 11&1/2 lbs. 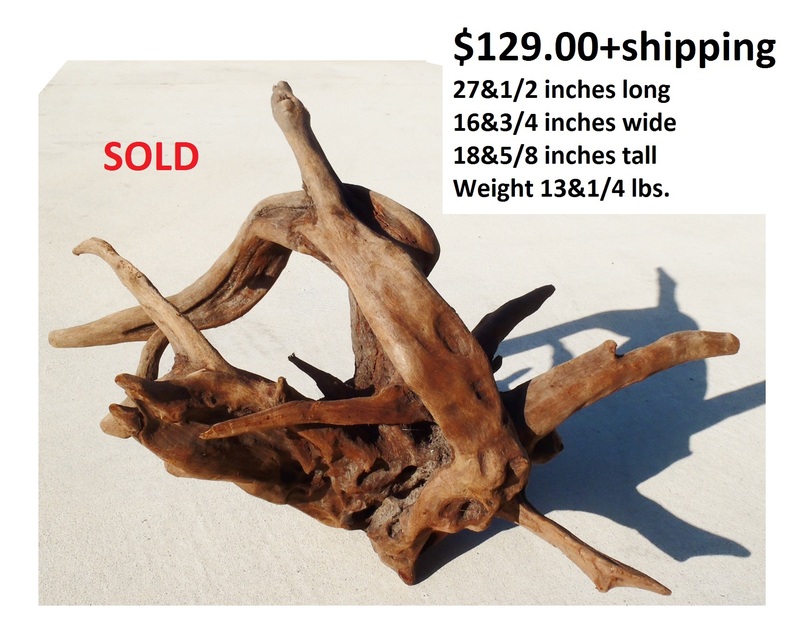 Approximate Dimensions: 42&1/2 inches long - 29&1/2 inches wide - 17&1/4 inches tall - Weight 18&3/4 lbs. 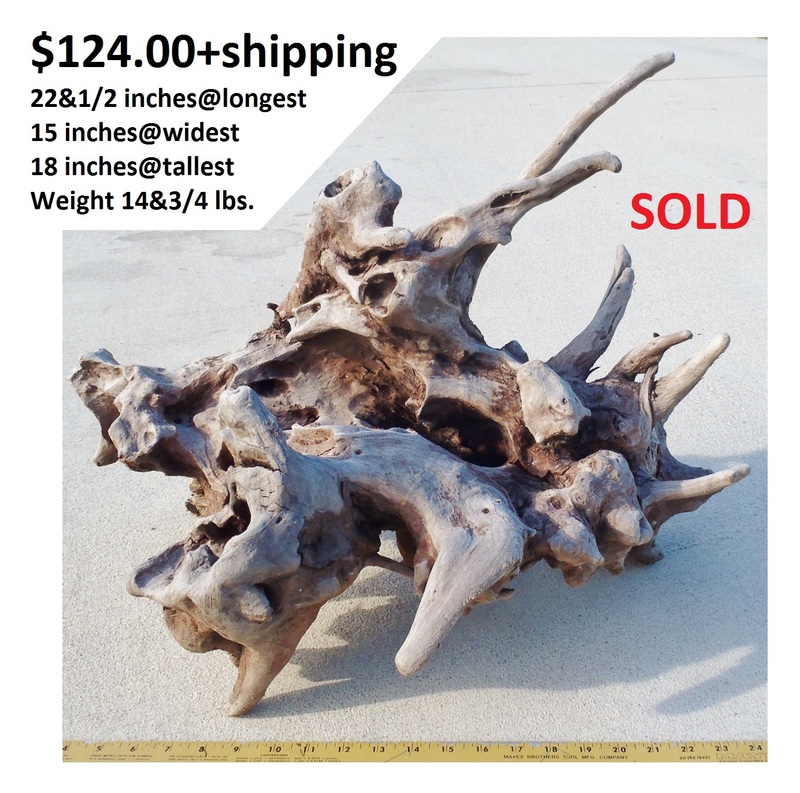 Approximate Dimensions: 31&3/4 inches long - 13&1/2 inches wide - 16&1/8 inches tall - Weight 14&3/4 lbs. 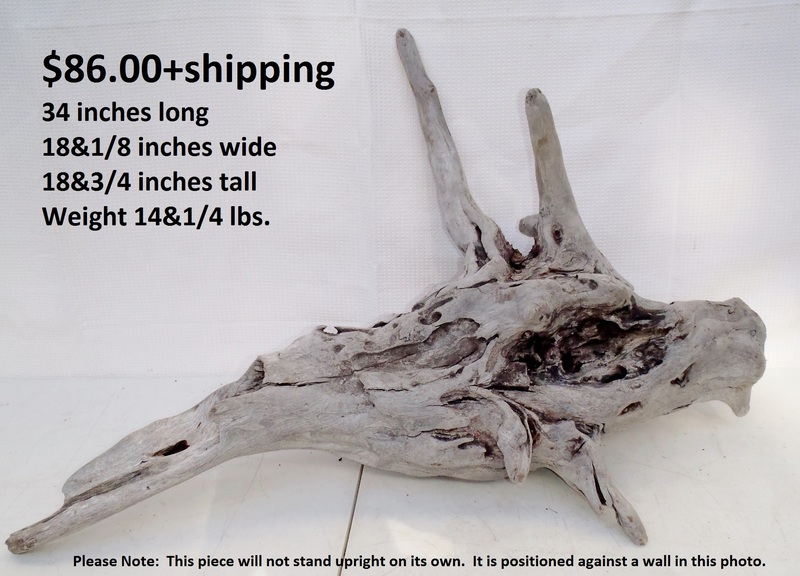 Approximate Wall Mounted Dimensions: 48&1/4 inches long - 22 inches tall/wide - 10 inches thick - Weight 84 lbs. 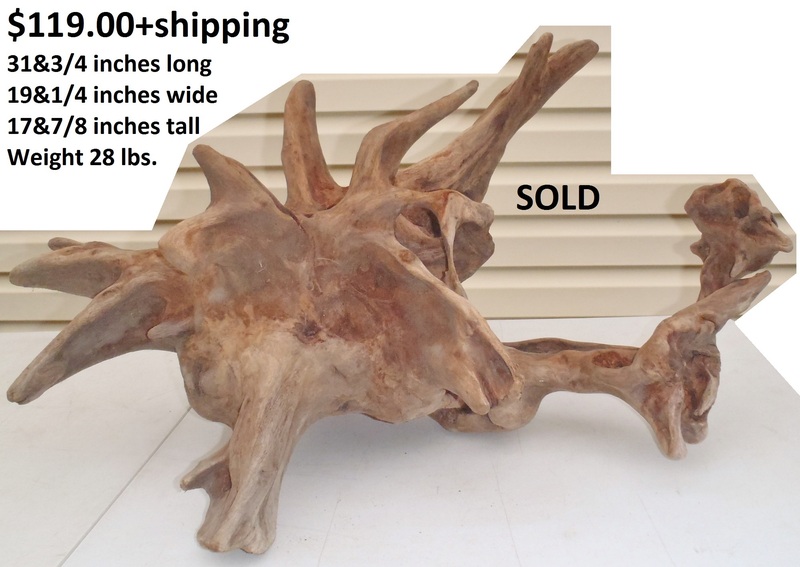 Approximate Dimensions: 51&1/2 inches long - Weight 25 lbs. 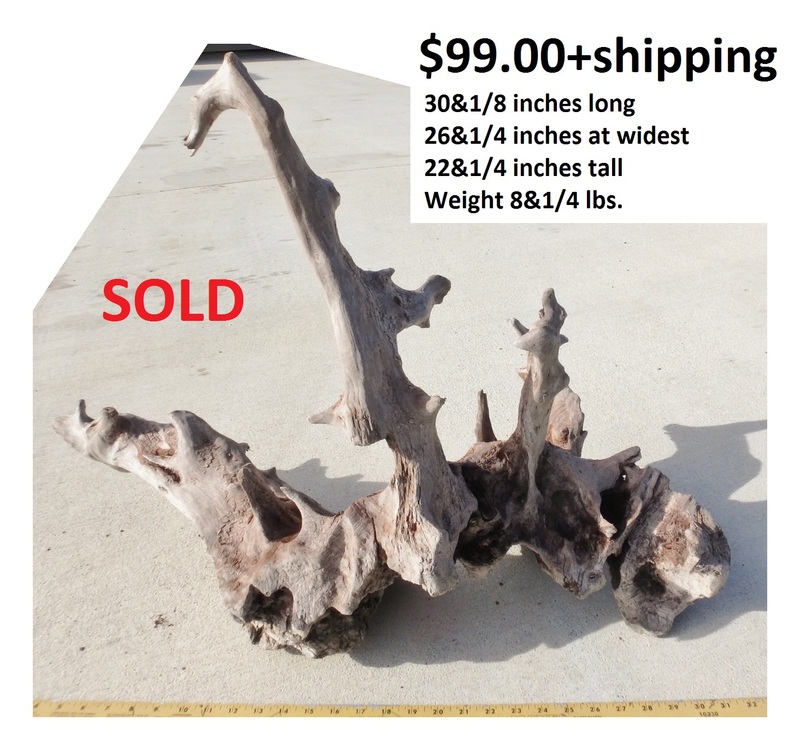 Approximate Dimensions: 38&3/4 inches long - 18&3/4 inches wide - 31&7/8 inches tall - Weight 17&1/2 lbs. 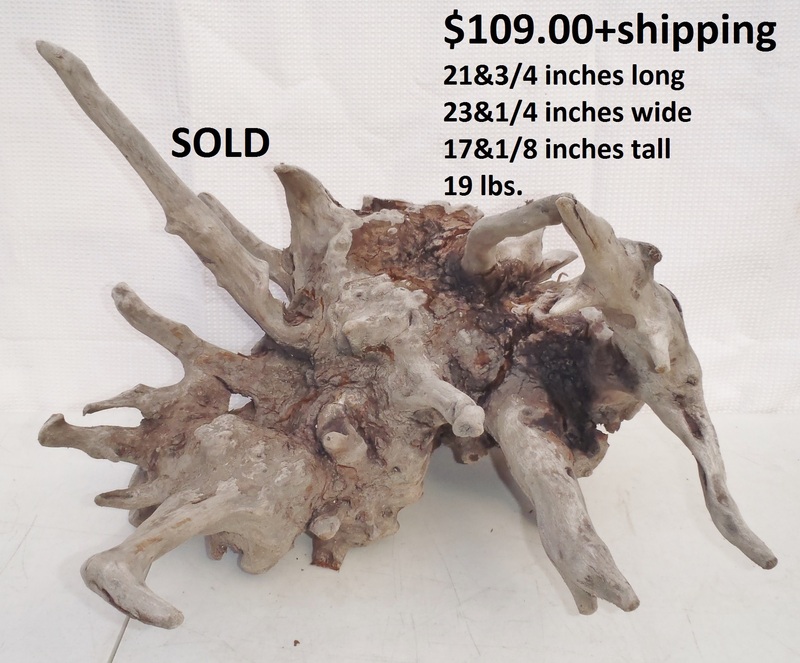 Approximate Dimensions: 37&1/4 inches long - 13&3/4 inches wide - 28 inches tall - Weight 10 lbs. 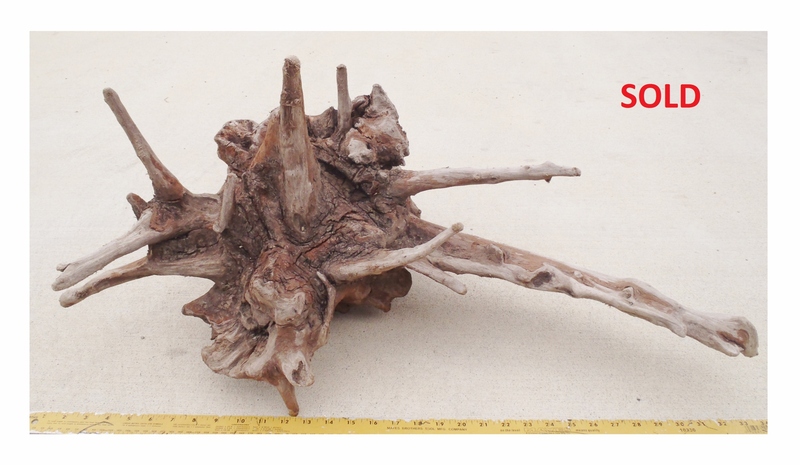 Approximate Dimensions PHOTO1: 26&3/4 inches long - 14&1/8 inches wide - 15&3/4 inches tall - Weight 5&3/4 lbs. 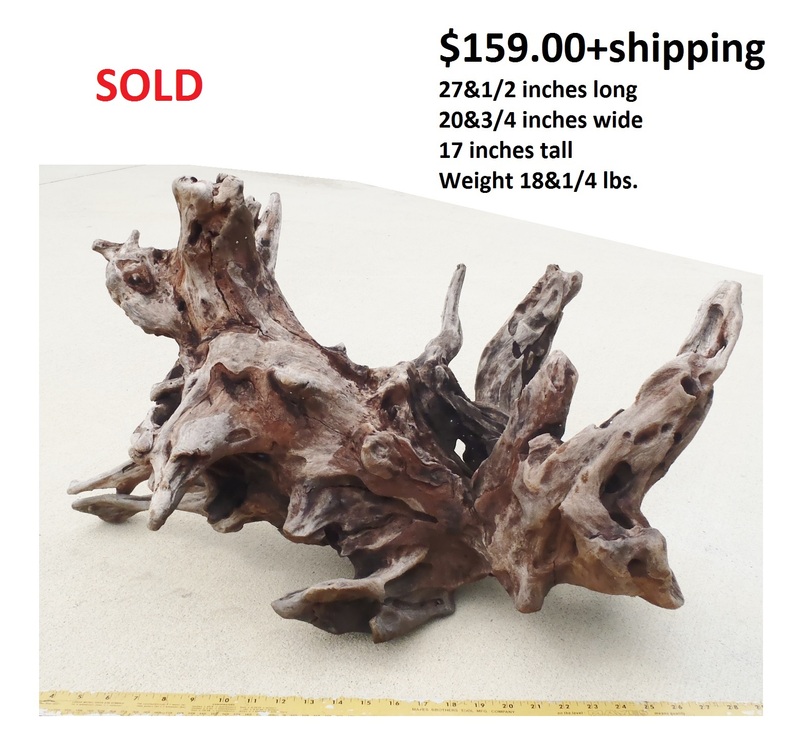 Approximate Dimensions: 34&1/2 inches long - 8&1/4 inches wide - 12&1/2 inches tall - Weight 6&1/4 lbs. 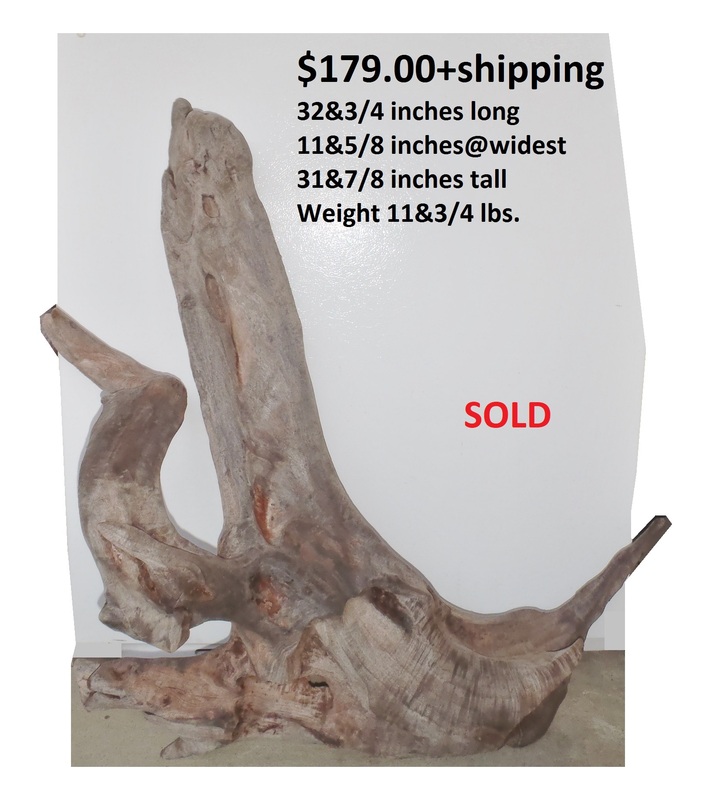 Approximate Upright Dimensions: 23 inches long - 10&1/2 inches wide - 12 inches tall - Weight 9 lbs. 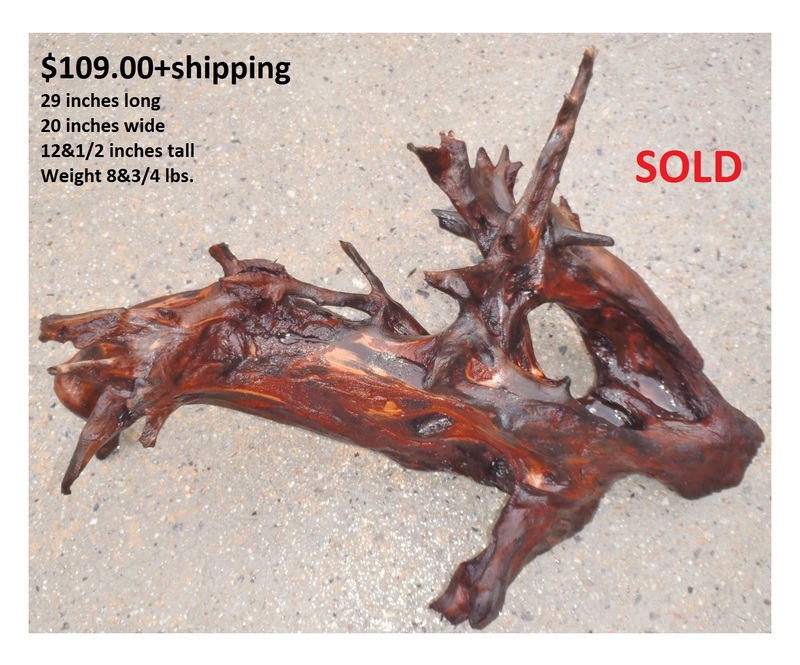 Approximate Dimensions: 16&5/8 inches long - 16&3/8 inches wide - 20&1/8 inches tall - Weight 6 lbs. 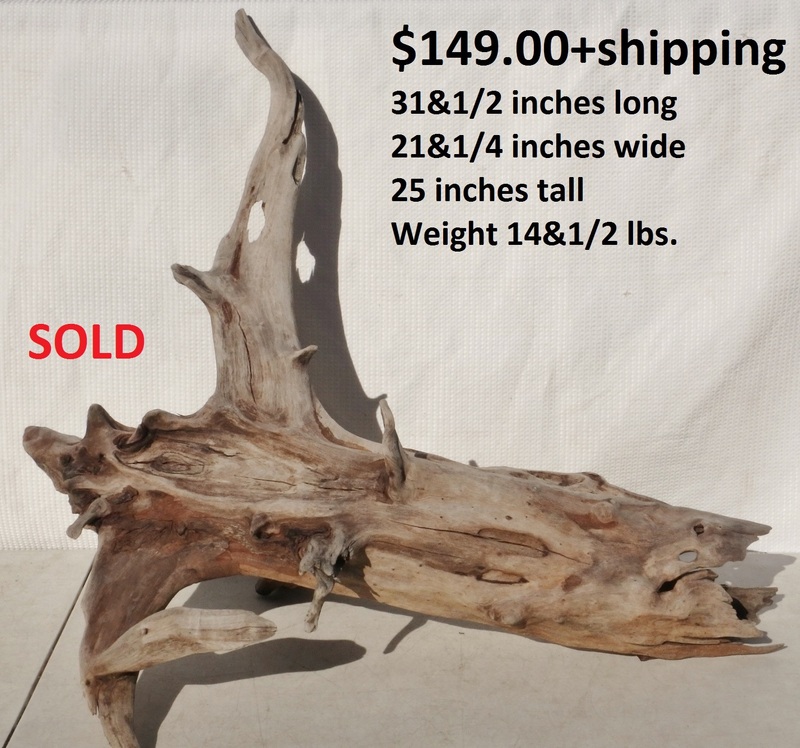 Approximate Dimensions: 36 inches long - 14 inches wide - 15 inches tall - Weight 8&3/4 lbs. 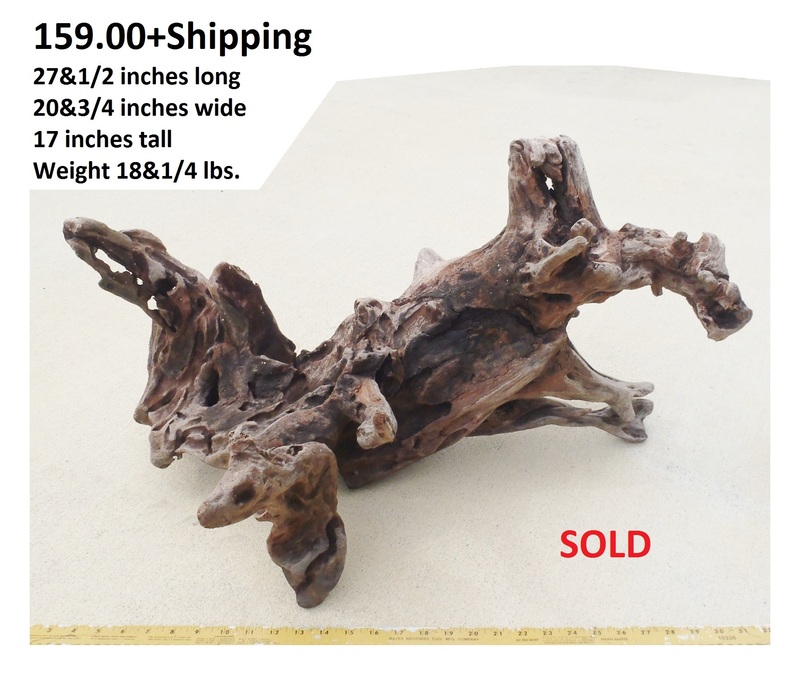 Approximate Dimensions: 29&1/4 inches long - 14&7/8 inches wide - 20&1/4 inches tall - Weight 6&1/4 lbs. 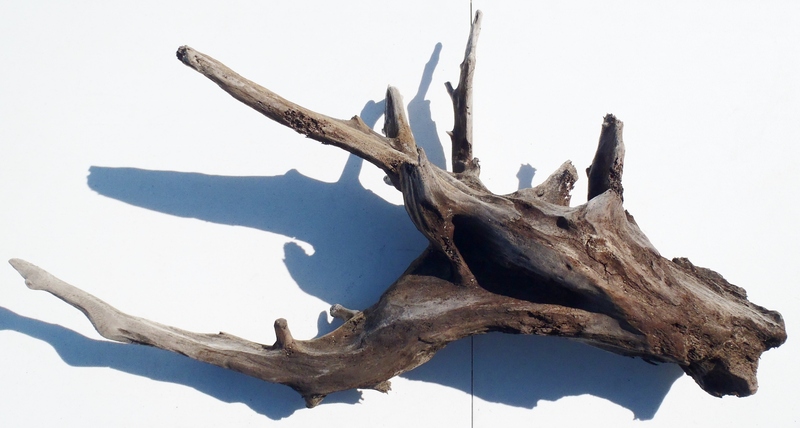 "The Moose." 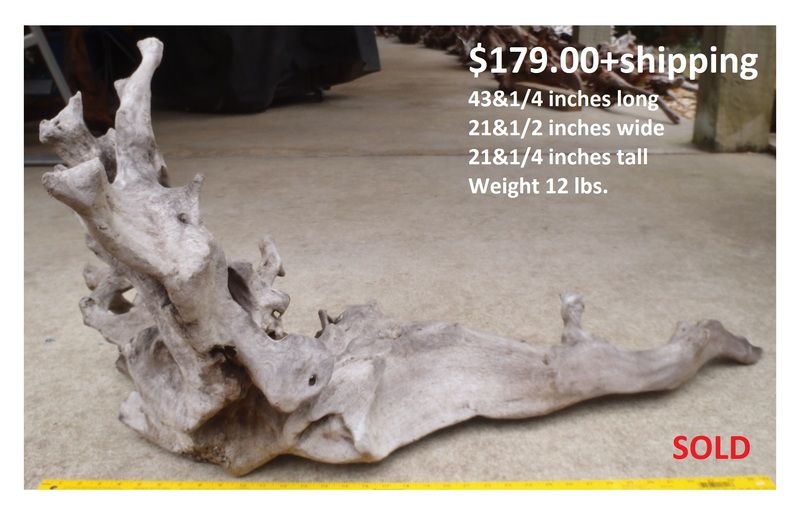 - Approximate Dimensions: 43&1/2 inches long - 20&1/2 inches wide - 18&7/8 inches tall - Weight 22 lbs. 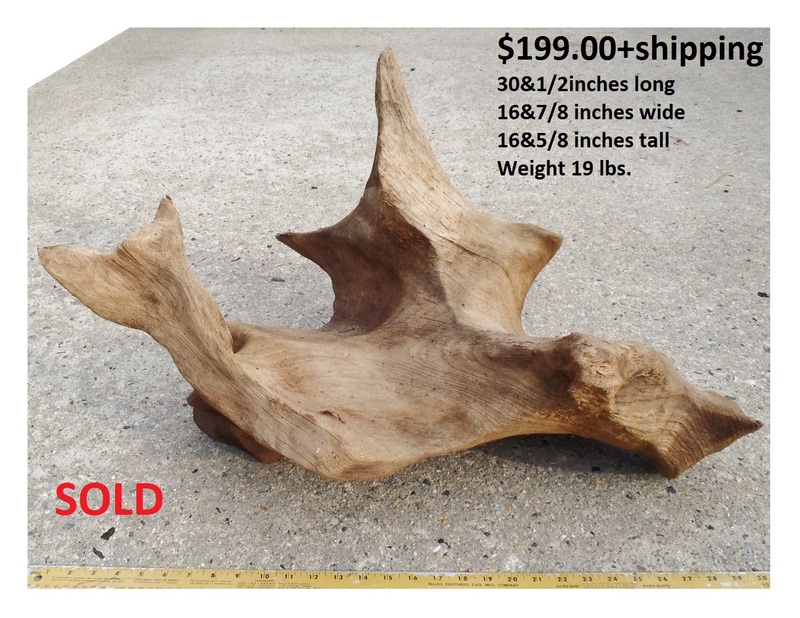 Approximate Dimensions: 30&3/8 inches long - 22&1/4 inches wide - 11&1/2 inches tall - Weight 12 lbs. 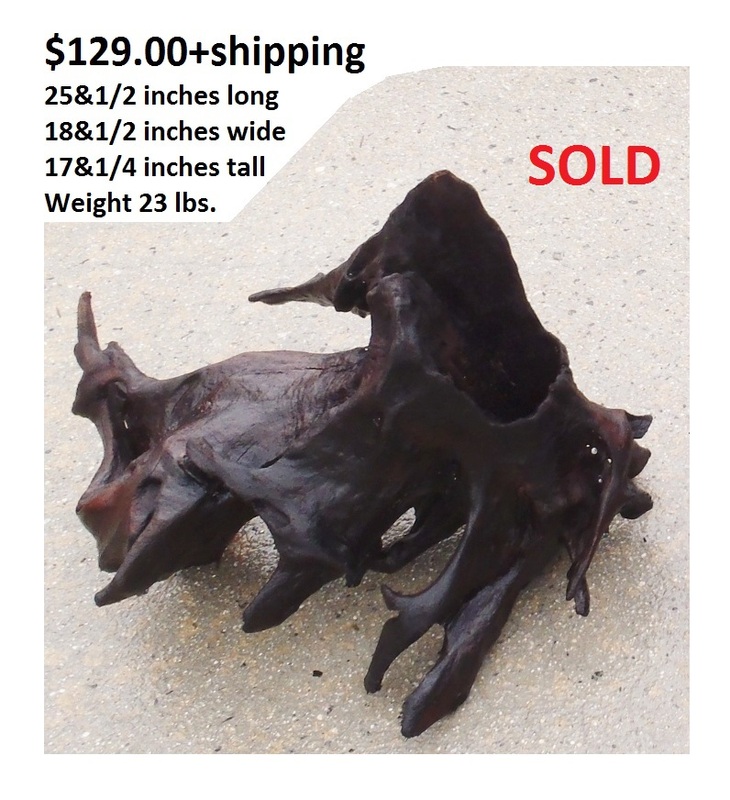 Approximate Dimensions: 31&1/2 inches long - 21&1/4 inches wide - 25 inches tall - Weight 14&1/2 lbs. 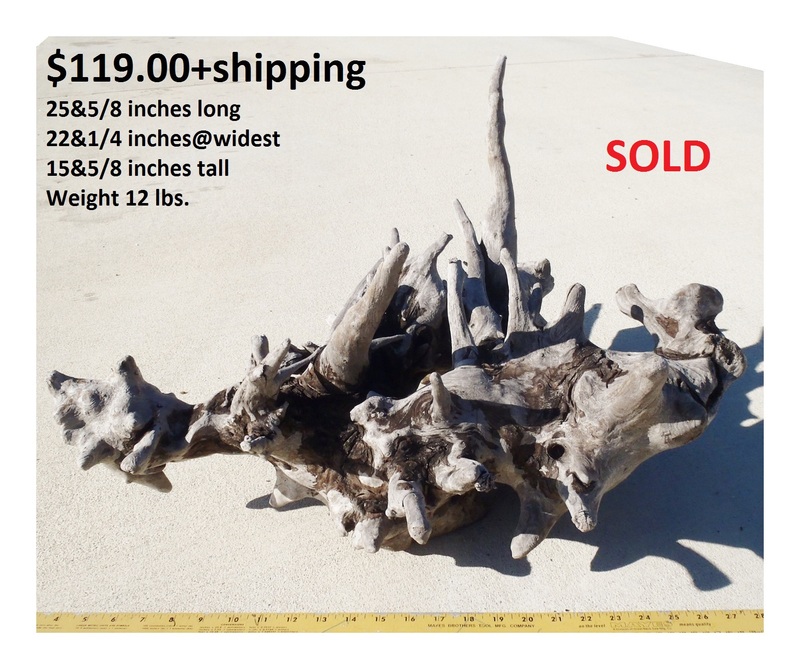 Approximate Dimensions PHOTO1: 39&1/2 inches long - 33&3/4 inches wide - 14&1/4 inches tall - Weight 7&1/2 lbs. 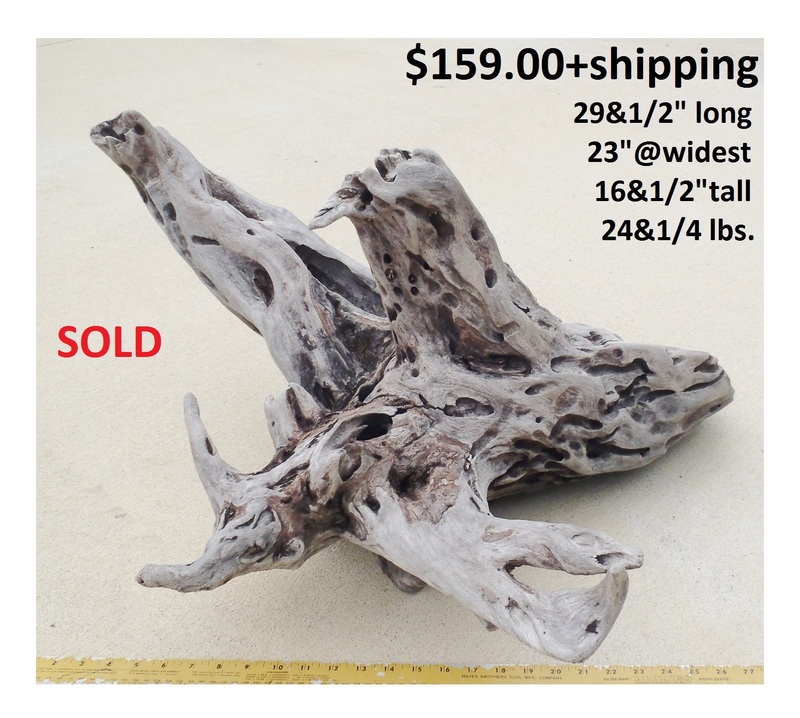 Approximate Dimensions PHOTOS 2&3: 34&1/2 inches long - 15&3/4 inches wide - 20&1/8 inches tall - Weight 7&1/2 lbs. 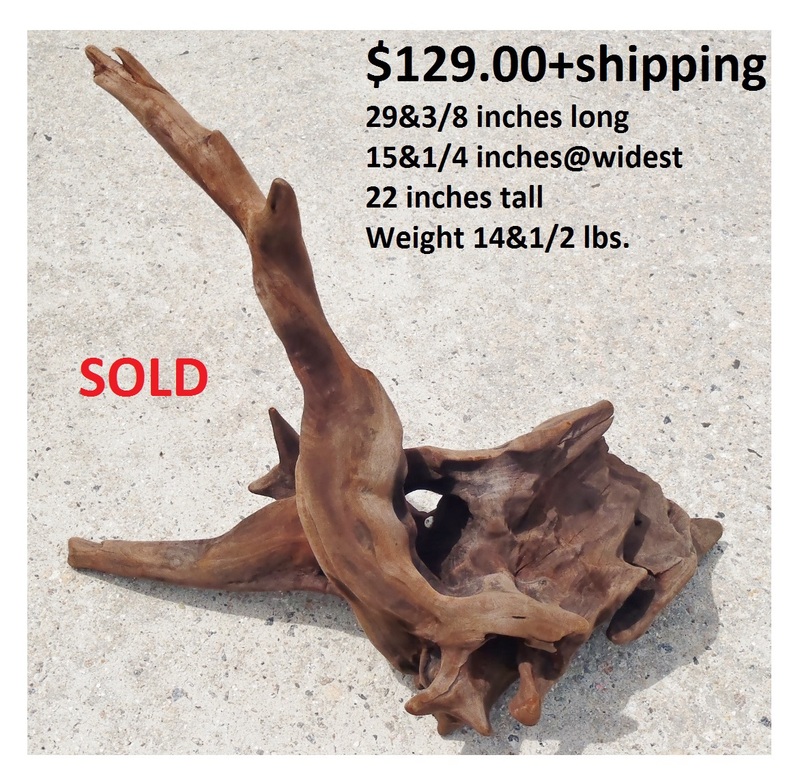 Approximate Dimensions: 28&1/4 inches long - 21&1/4 inches wide - 14&3/4 inches tall - Weight 9&1/4 lbs. 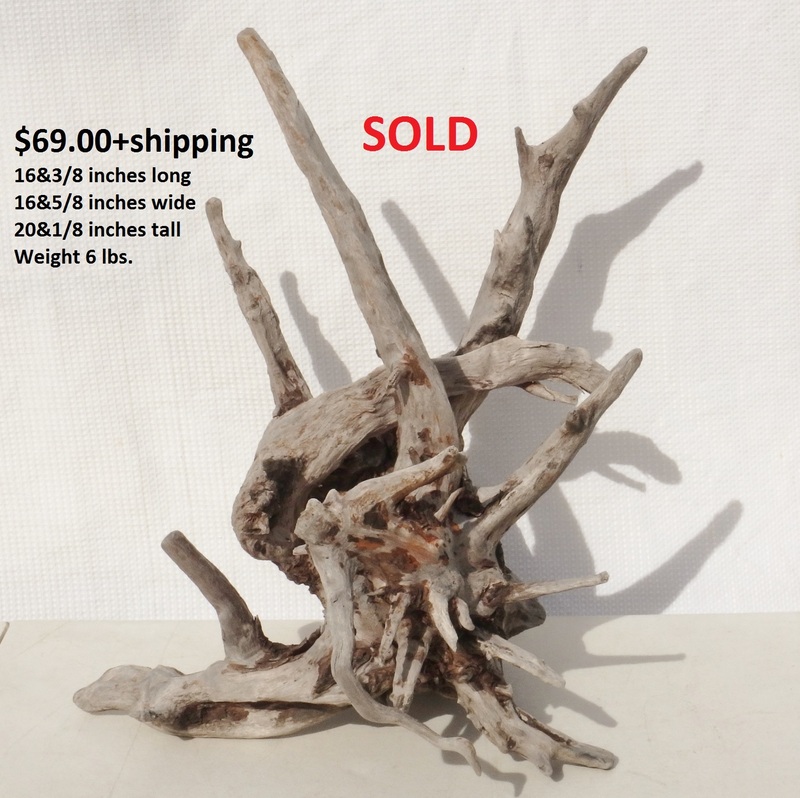 Approximate Dimensions: 29&1/2 inches long - 15&3/4 inches wide - 18 inches tall - Weight 7 lbs. 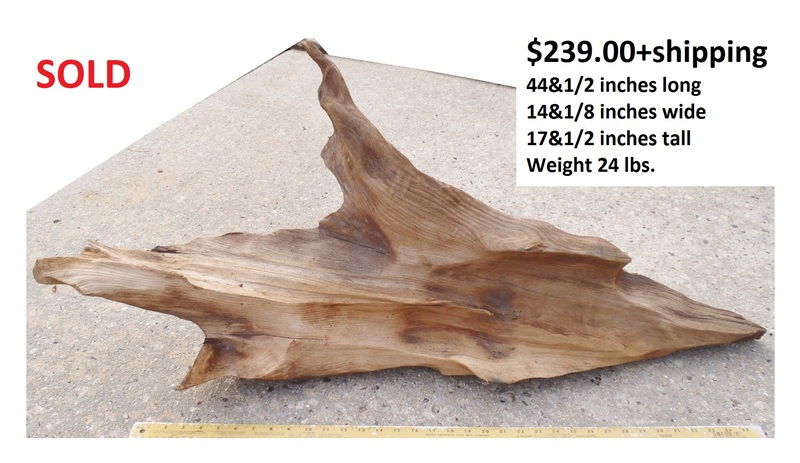 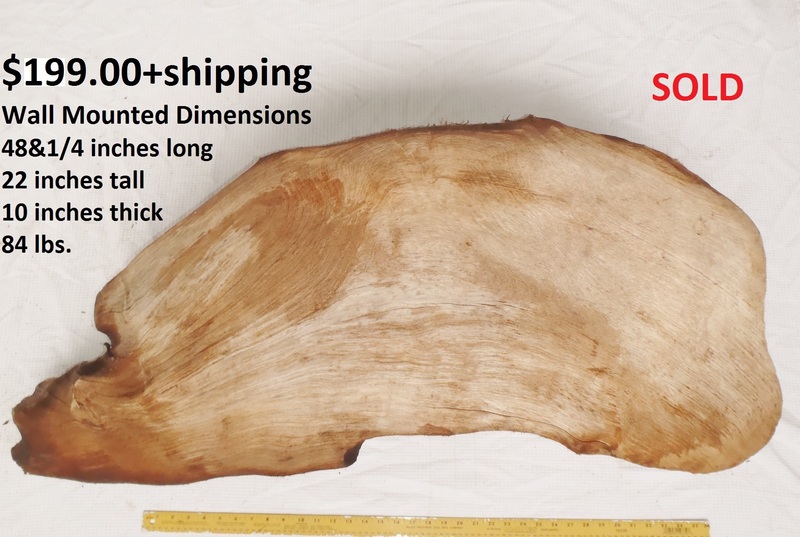 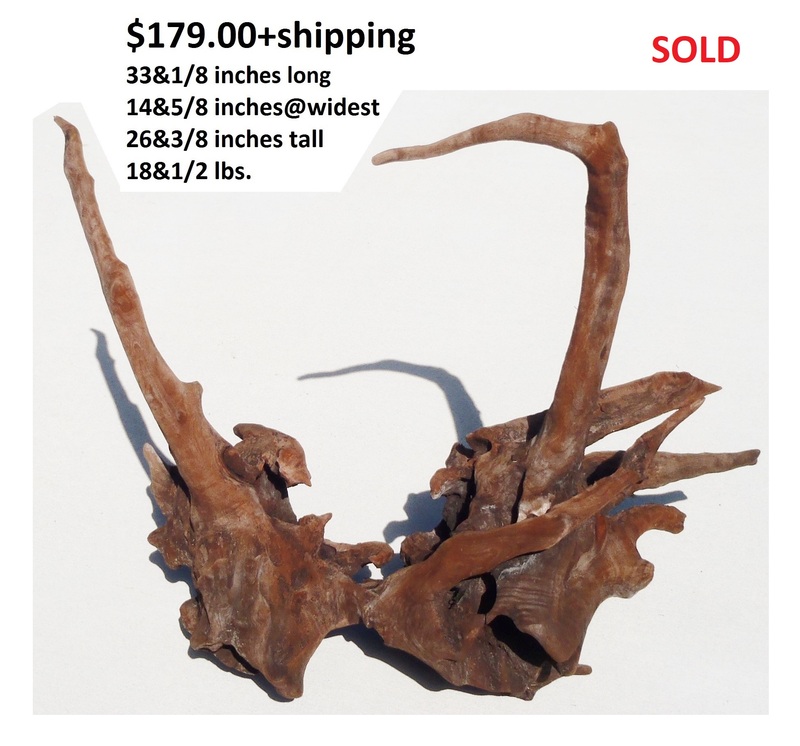 Approximate Dimensions(Photo 1): 37&1/2 inches long - 25 inches wide - 16&1/8 inches tall - Weight 21 lbs. 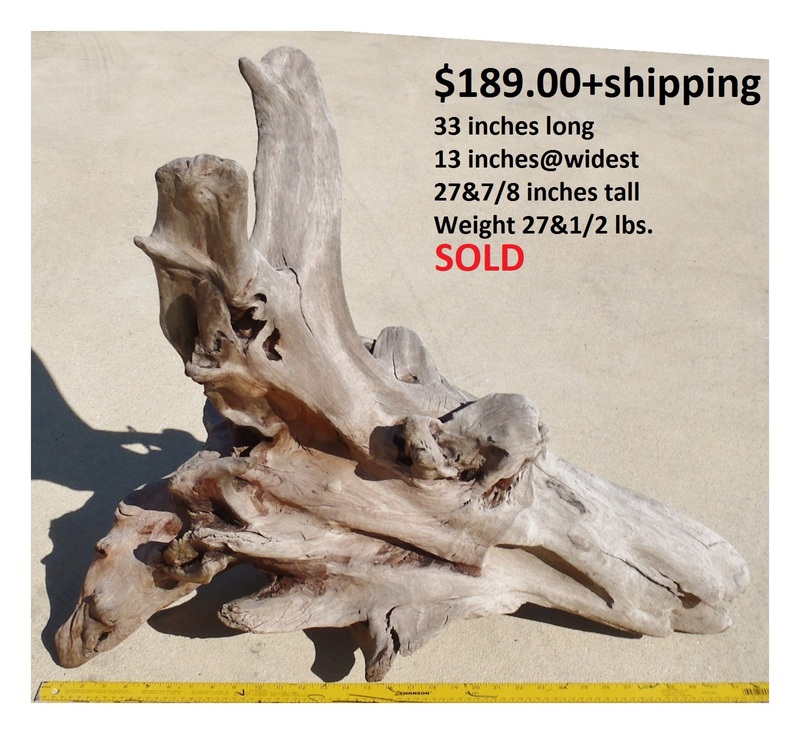 Approximate Dimensions: 24 inches long - 22&1/8 inches wide - 18&1/8 inches tall - Weight 28 lbs. 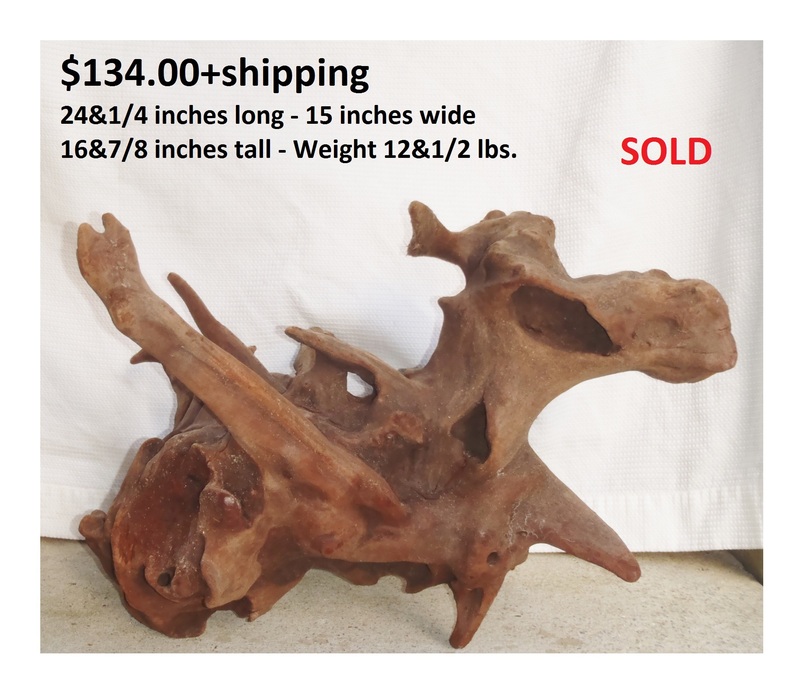 Approximate Dimensions: 24&1/4 inches long - 15&1/2 inches wide - 15&5/8 inches tall - Weight 7&7/2 lbs. 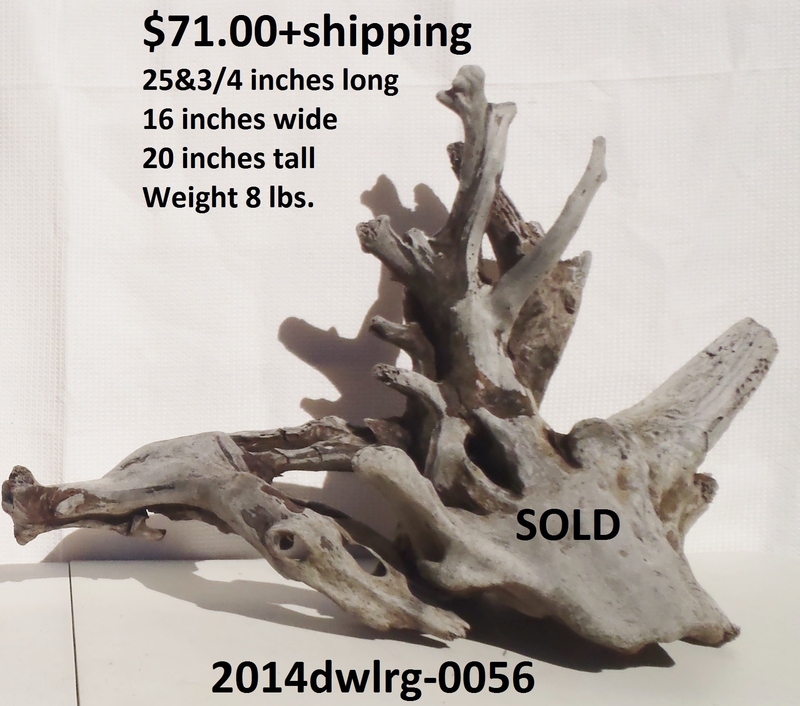 Approximate Dimensions(Photos 1&2): 25&1/8 inches long - 27 inches wide - 17&3/4 inches tall - Weight 7&1/4 lbs. 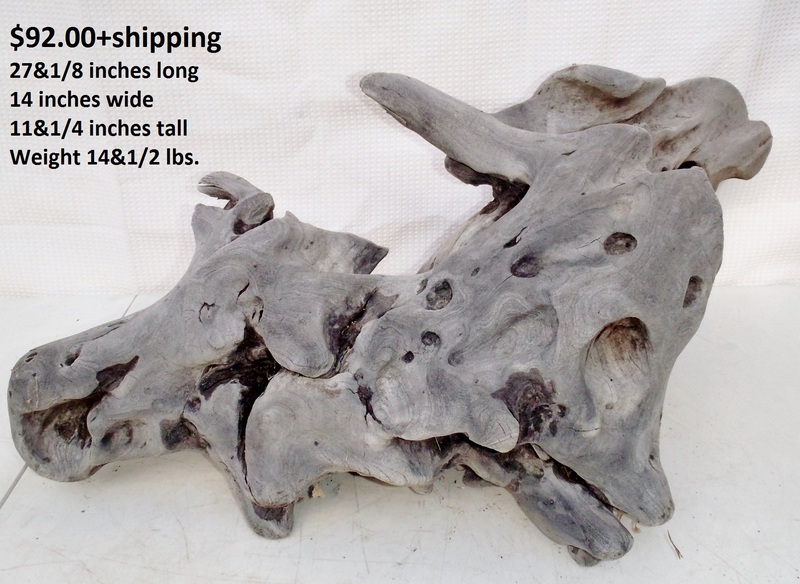 Approximate Dimensions: 22&1/2 inches long - 19 inches wide - 19 inches tall - Weight 7&3/4 lbs. 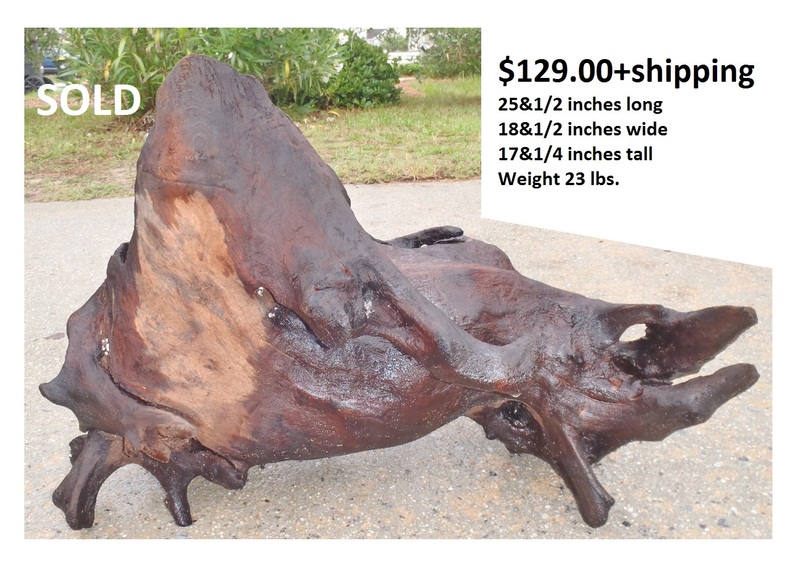 Approximate Dimensions: 24 inches long - 19 inches wide - 18&3/4 inches tall - Weight 39 lbs. 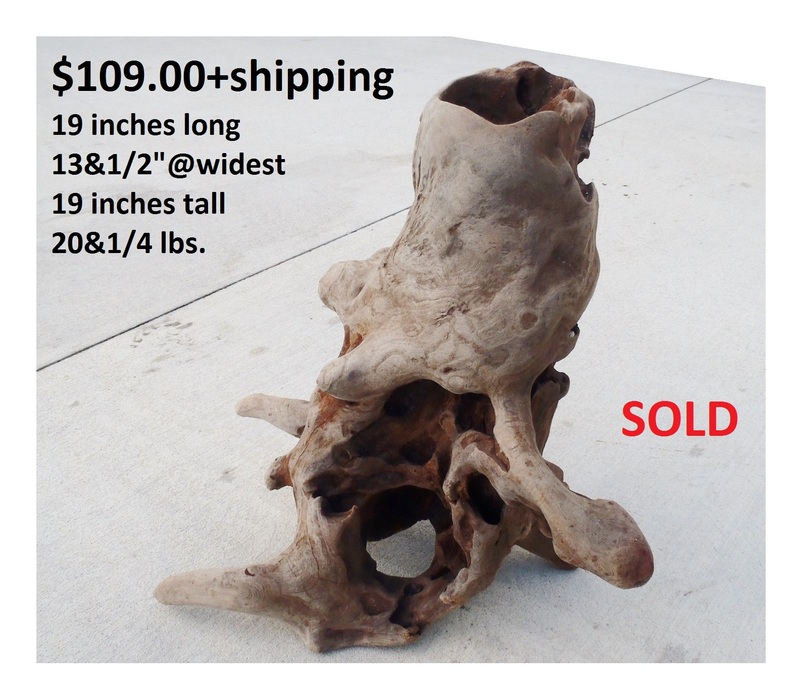 Approximate Dimensions: 24&1/2 inches long - 18&1/2 inches wide - 20&3/8 inches tall - Weight 17 lbs. 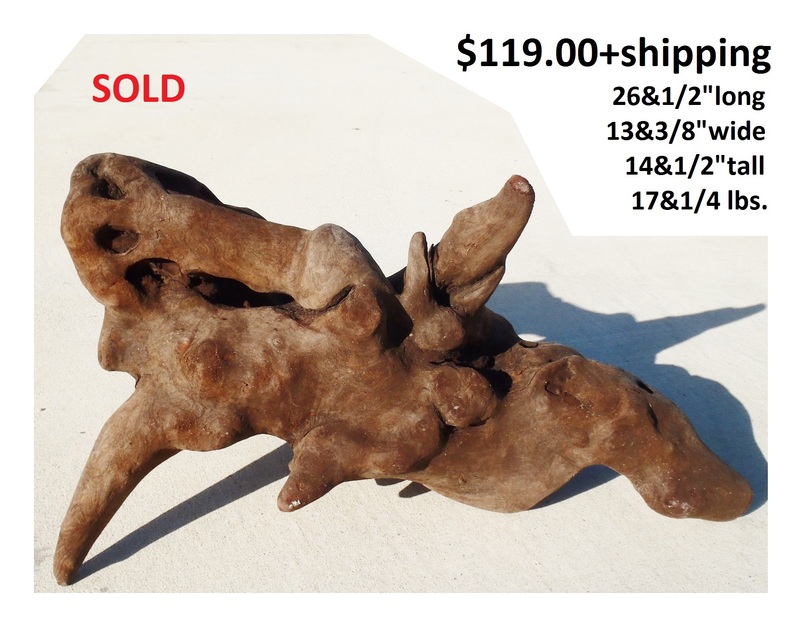 Approximate Dimensions: 25&3/4 inches long - 25&1/4 inches wide - 21&1/4 inches tall - Weight 18&1/2 lbs. 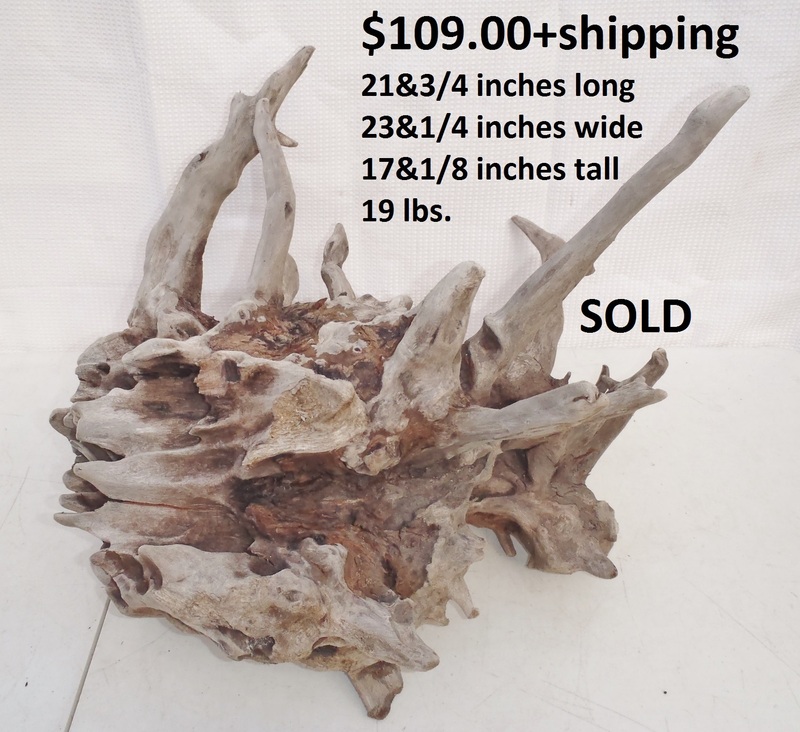 Approximate Dimensions: 30&1/2 inches long - 18&7/8 inches wide - 20 inches tall - Weight 30 lbs. 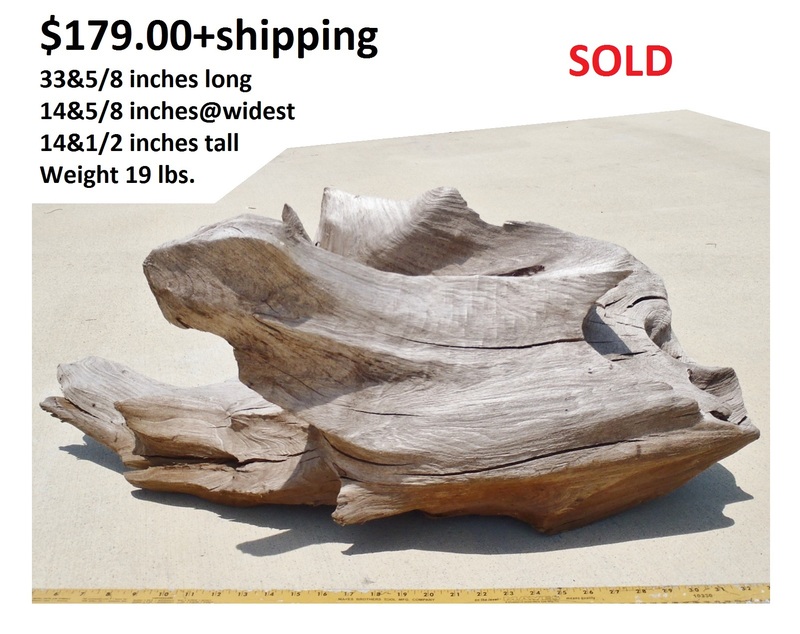 Approximate Dimensions: 29&5/8 inches long - 19 inches wide - 17 inches tall - Weight 6&1/2 lbs. 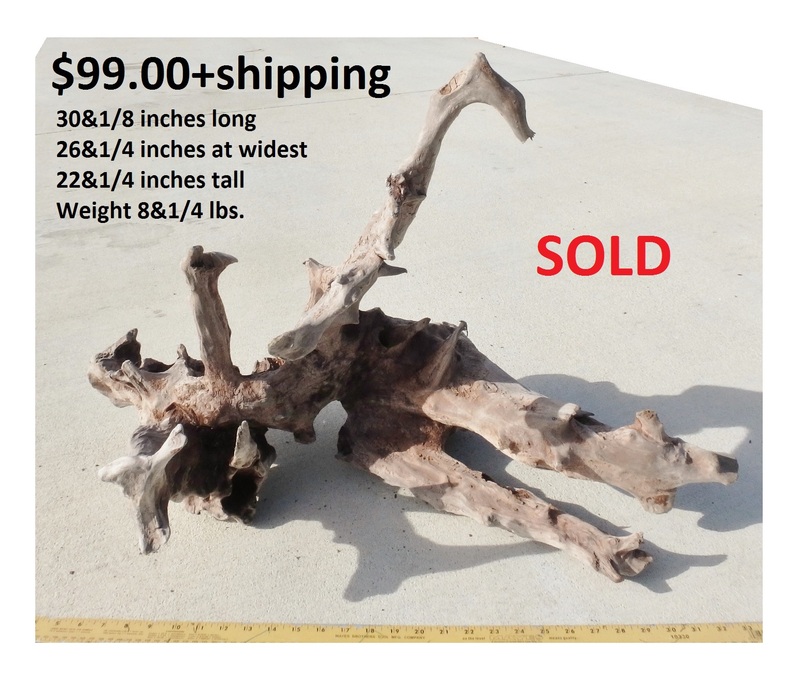 Approximate Dimensions: 38 inches long - 11 inches wide - 13&5/8 inches tall - Weight 6&3/4 lbs. 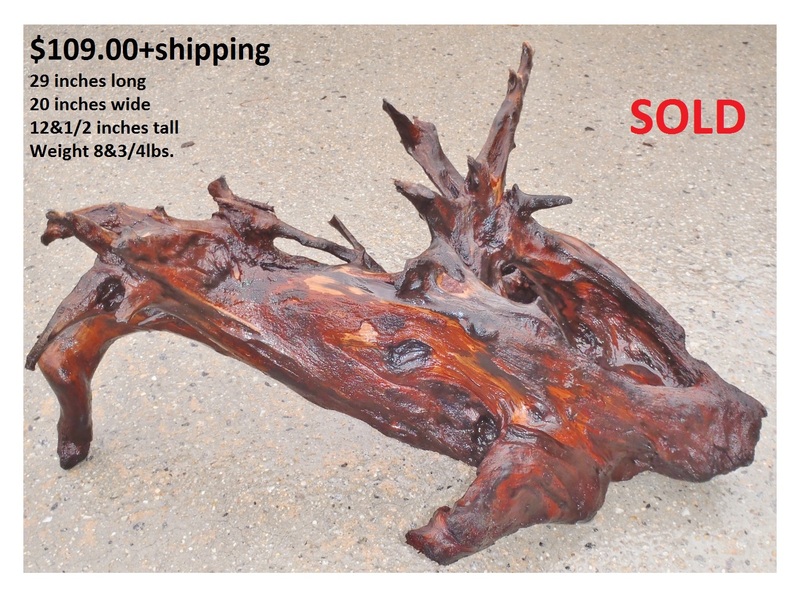 Approximate Dimensions: 26 inches long - 23&1/8 inches wide - 11&3/4 inches tall - Weight 4&3/4 lbs. 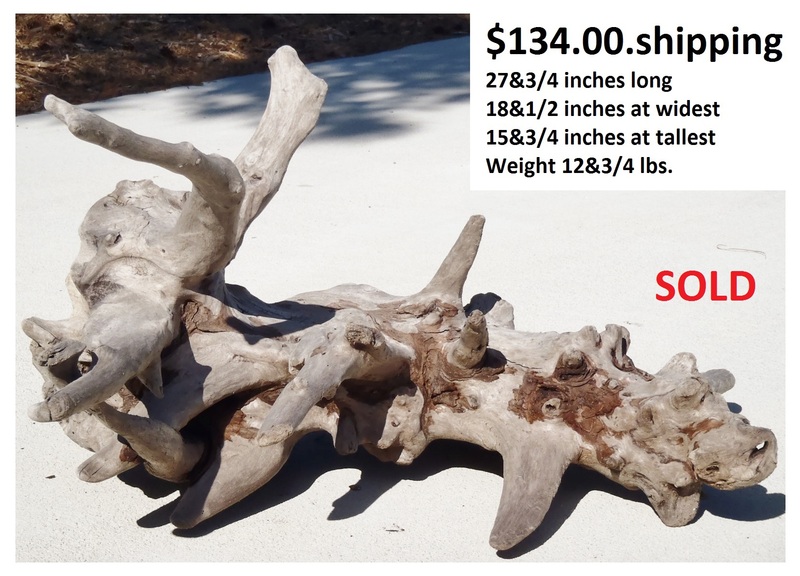 Approximate Dimensions: 33 inches long - 21&3/4 inches wide - 17&18 inches tall - Weight 14&1/2 lbs. 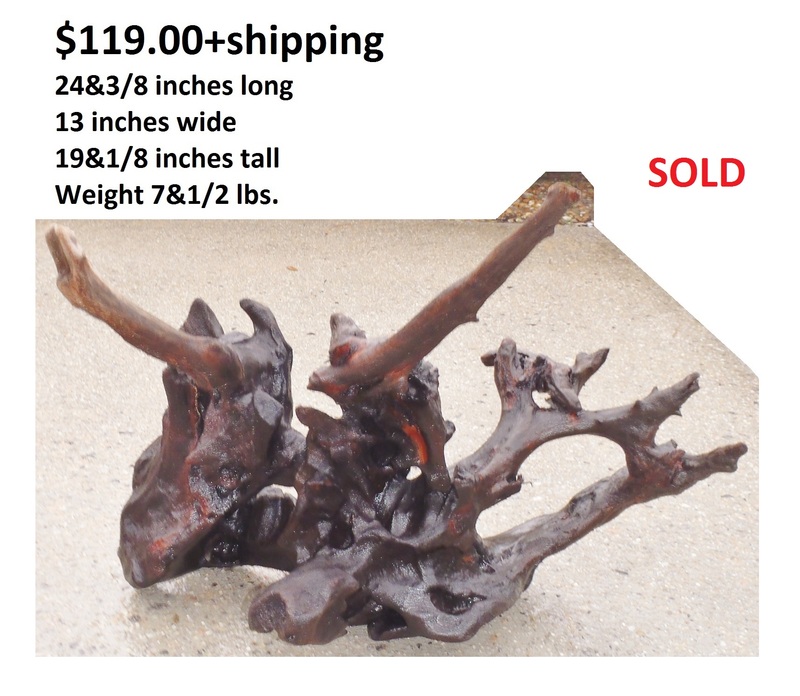 Approximate Dimensions: 21&3/4 inches long - 23&1/4 inches wide - 17&1/8 inches tall - Weight 19 lbs. 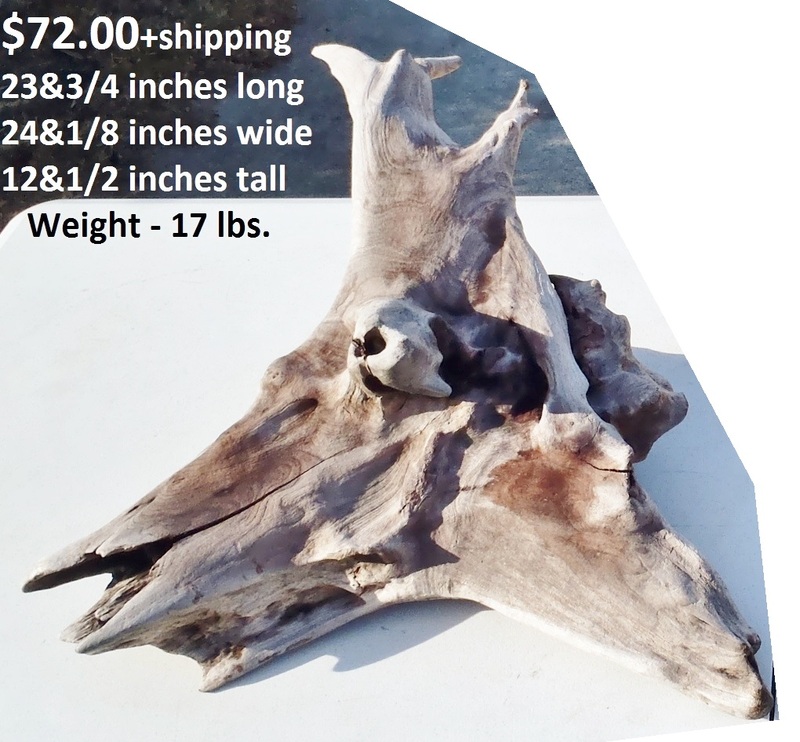 Dimensions: 36&1/4 inches long - 12&1/2 inches wide - 22&1/2 inches tall - Weight 7 lbs. 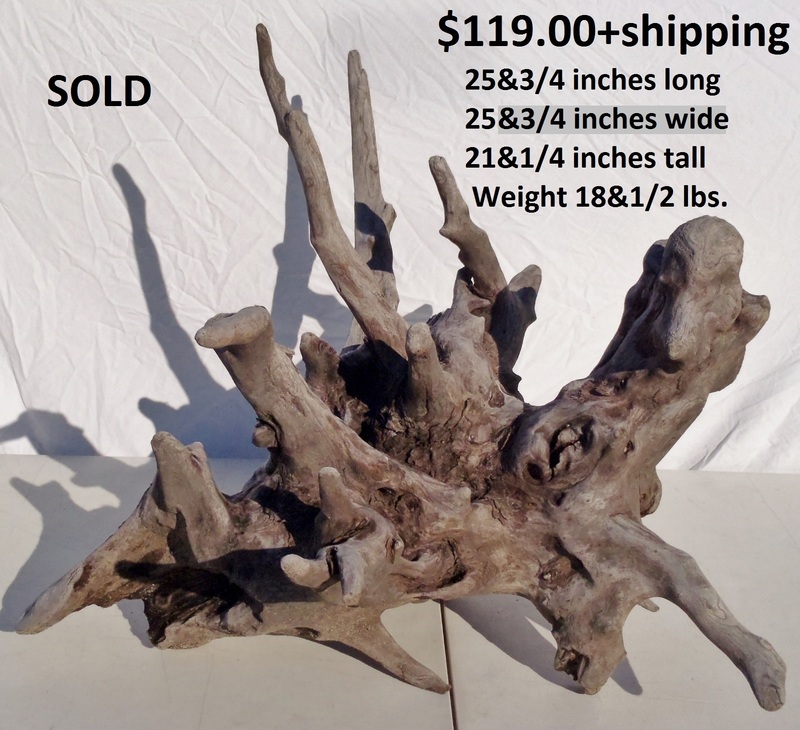 Dimensions: 34 inches long - 18&1/8 inches wide - 18&3/4 inches tall - Weight 14&1/4 lbs. 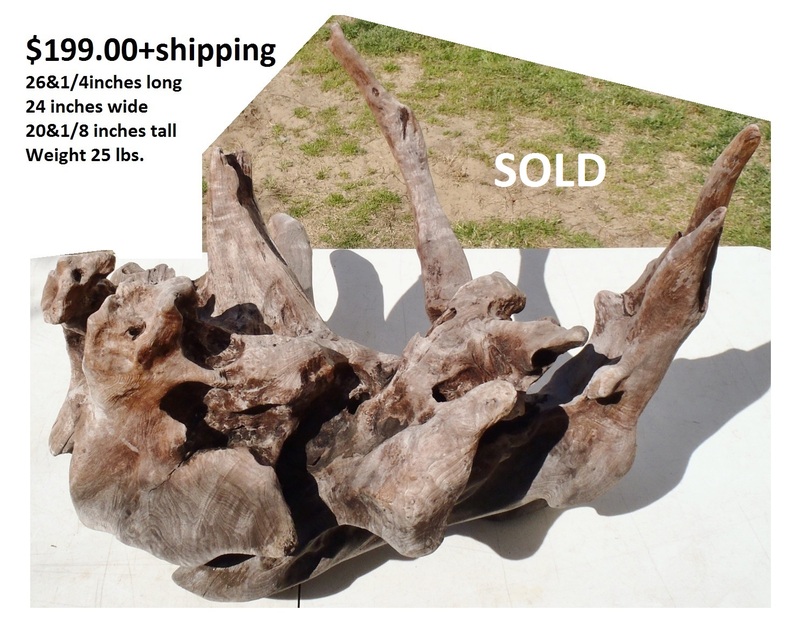 Approximate Dimensions: 33 inches long - 13 inches wide - 12&3/4 inches tall - Weight 15&1/2 lbs. 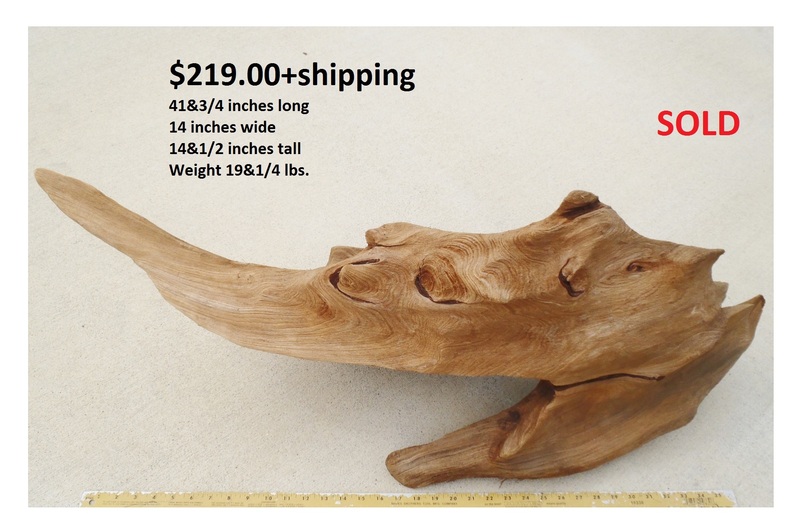 Dimensions: 27&1/8 inches long - 14 inches wide - 11&1/4 inches tall - Weight 14&1/2 lbs. 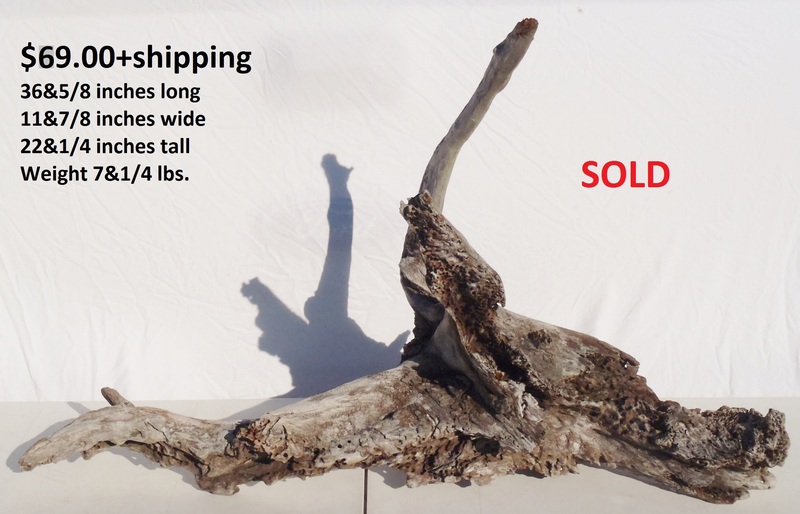 Dimensions: 25&3/4 inches long - 16 inches wide - 20 inches tall - Weight 8 lbs. 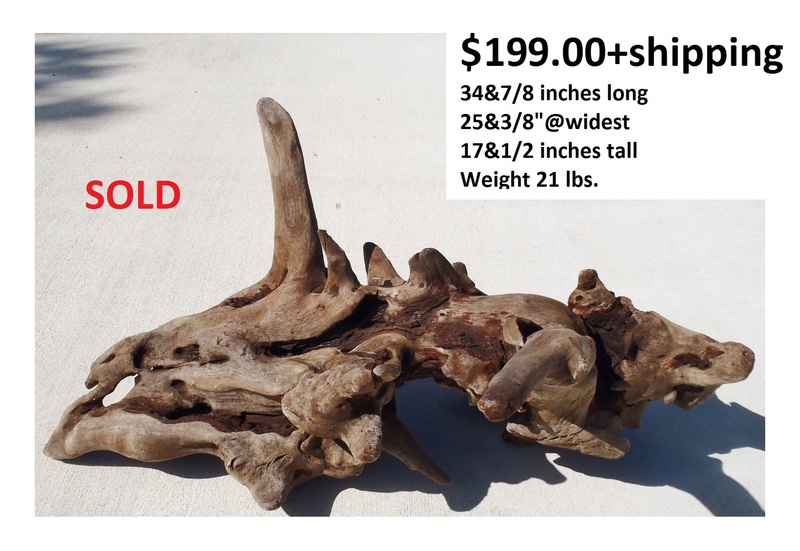 Approximate Dimensions: 31&1/2 inches long - 24&1/2 inches wide - 13&3/4 inches tall - Weight 22 lbs. 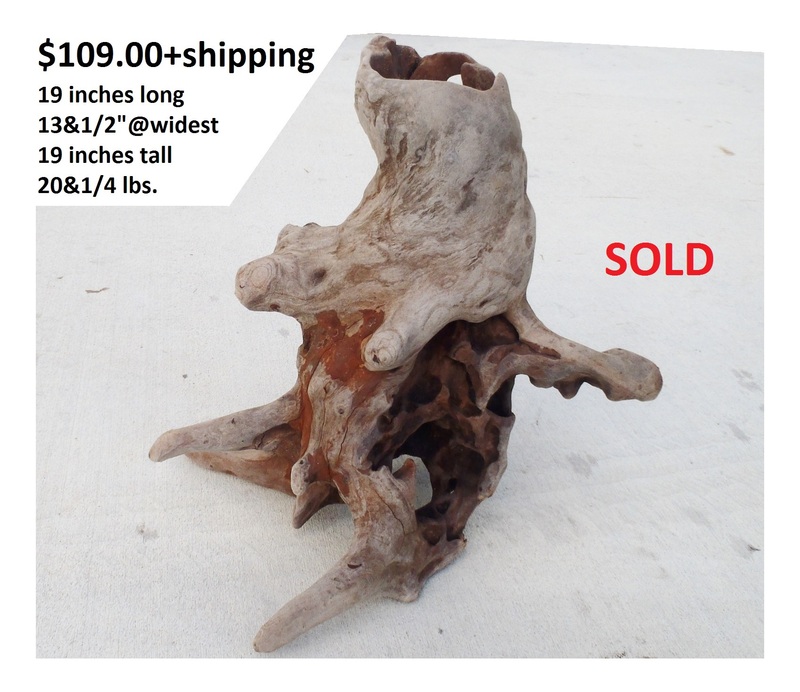 Approximate Dimensions: 20&3/4 inches long - 14&1/2 inches wide - 28 inches tall - Weight 10&1/4 lbs. 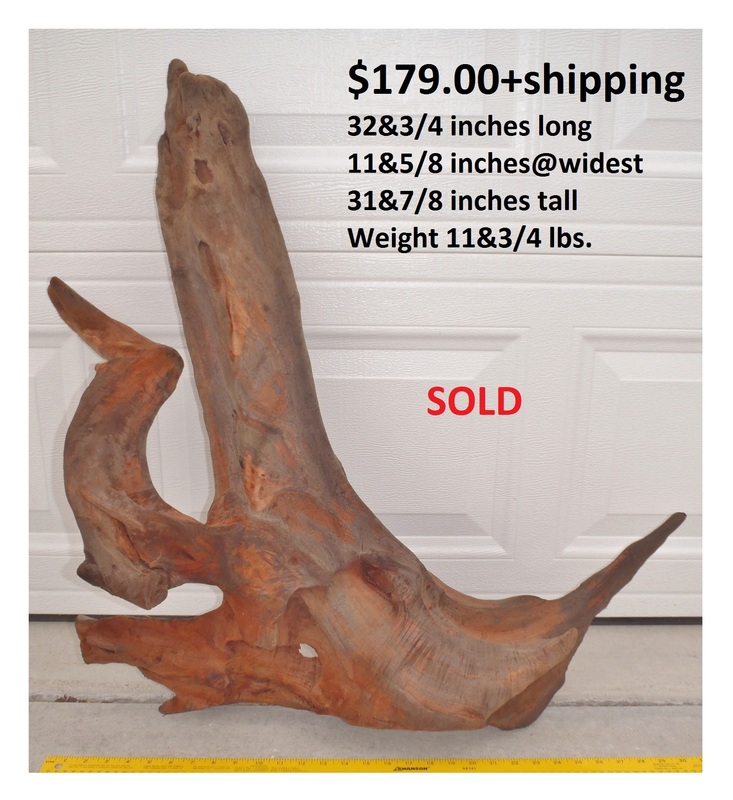 Dimensions: 30 inches long - 22 inches wide - 23&1/8 inches tall - Weight 11 lbs. 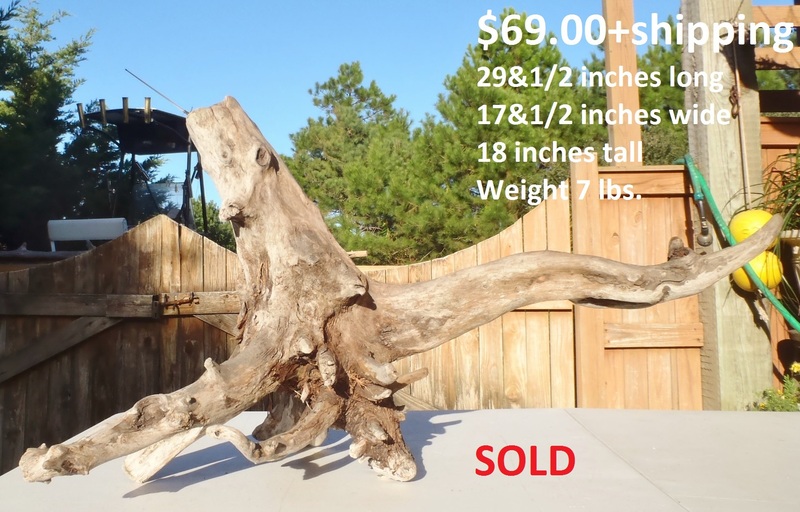 Dimensions: 33 inches long - 26 inches wide - 16 inches tall - Weight 10 lbs. 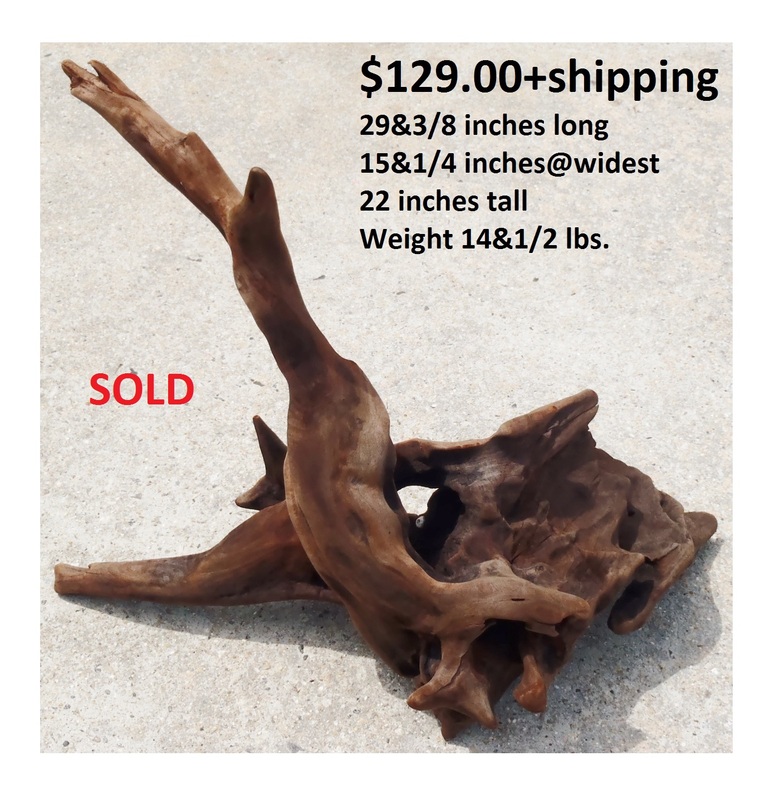 Approximate Dimensions: 23&3/4 inches long - 24&1/8 inches wide - 12&1/2 inches tall - Weight 17 lbs. 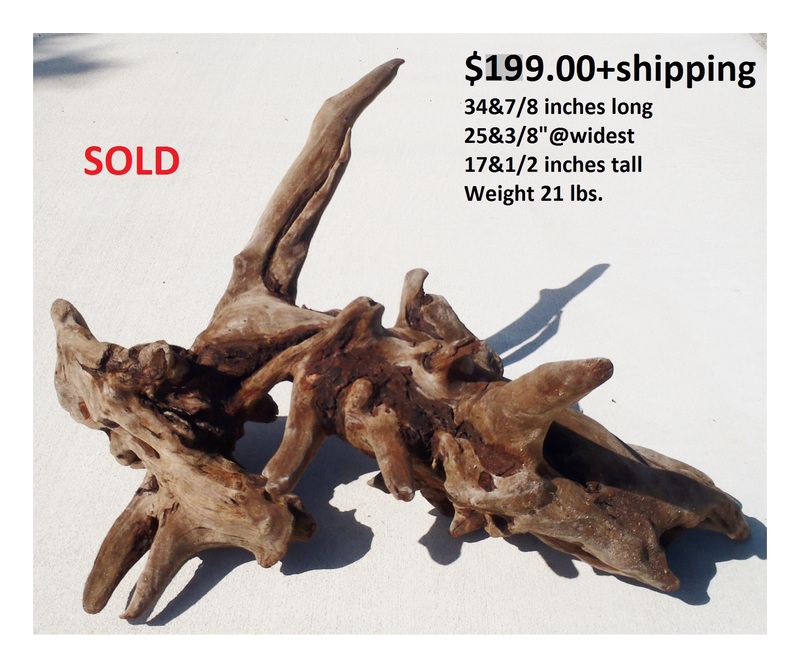 Approximate Dimensions: 25&1/4 inches long - 18&3/4 inches wide - 22&5/8 inches tall - Weight 9&3/4 lbs. 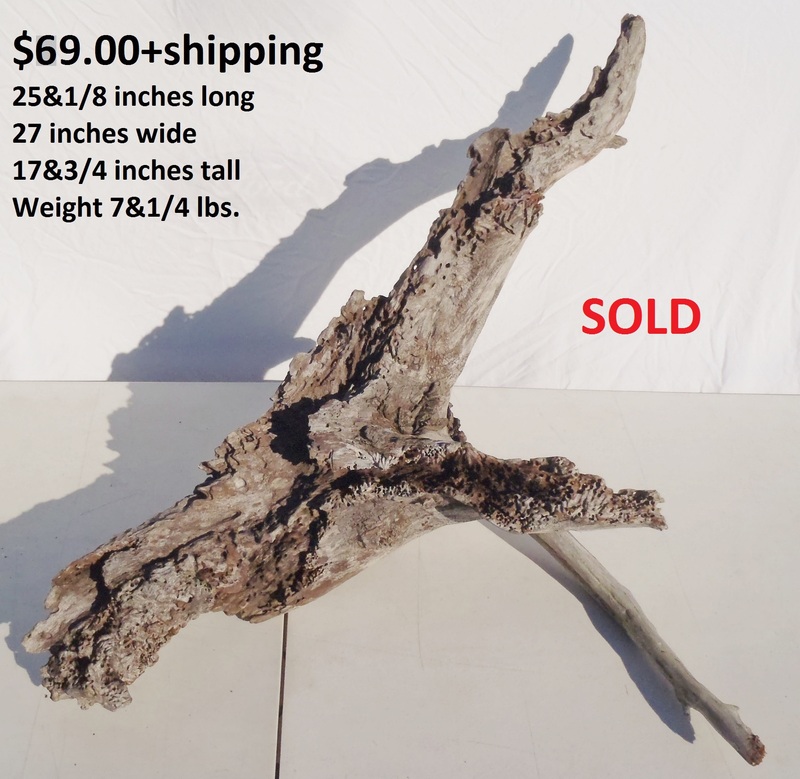 Approximate Dimensions: 36 inches long - 12 inches wide - 18 inches tall - Weight 20 lbs. 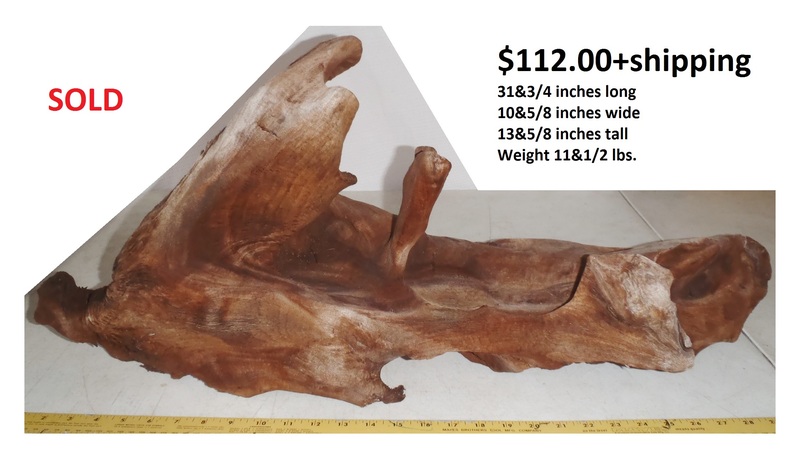 Approximate Upright Dimensions: 33&1/2 inches long - 19 inches wide - 21 inches tall/thick - Weight 11&1/2 lbs. 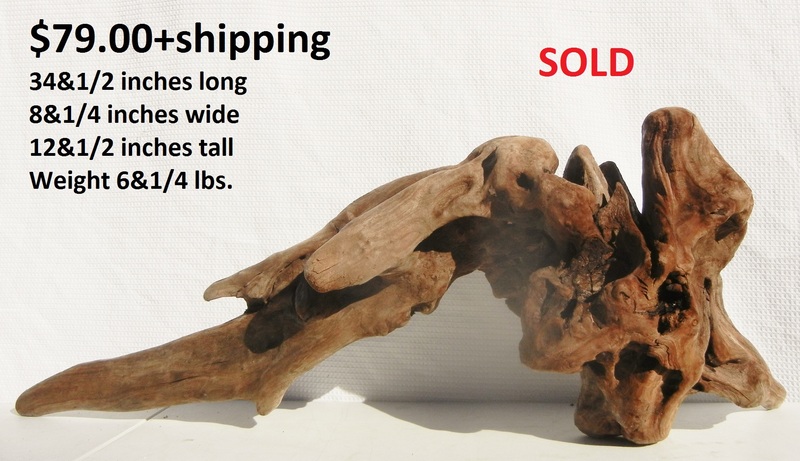 Approximate Upright Dimensions: 41&5/8 inches long - 14&1/4 inches wide - 25&3/4 inches tall - Weight 5&1/2 lbs. 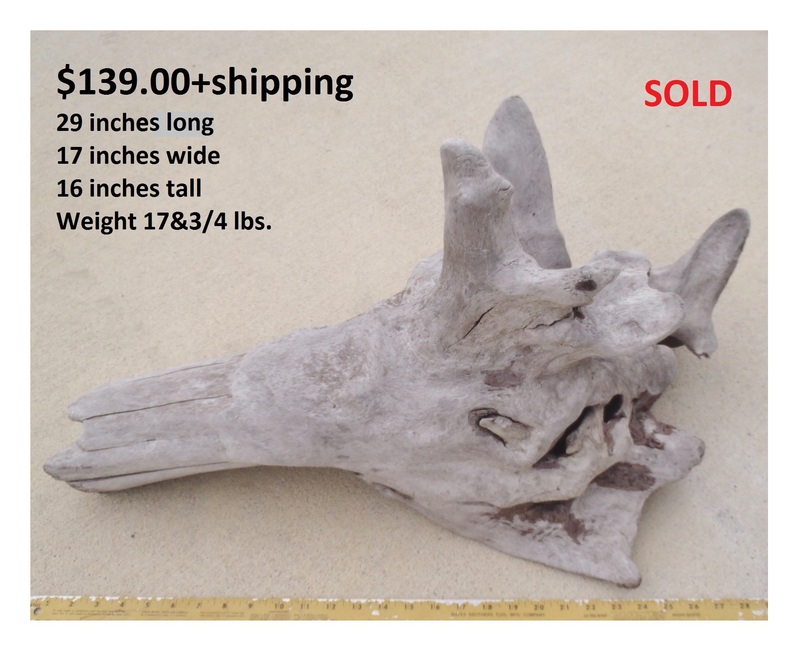 Approximate Dimensions: 31&3/8 inches long - 24&1/4 inches wide - 13&1/2 inches tall - Weight 13&3/4 lbs. 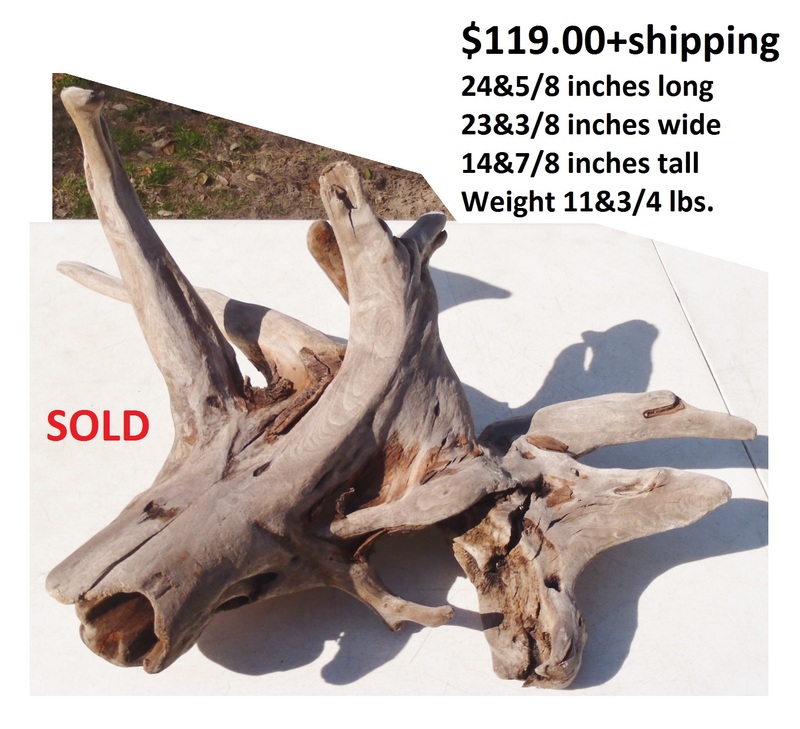 Approximate Dimensions: 30&5/8 inches long - 20 inches wide - 20&1/8 inches tall - Weight 16&1/4 lbs. 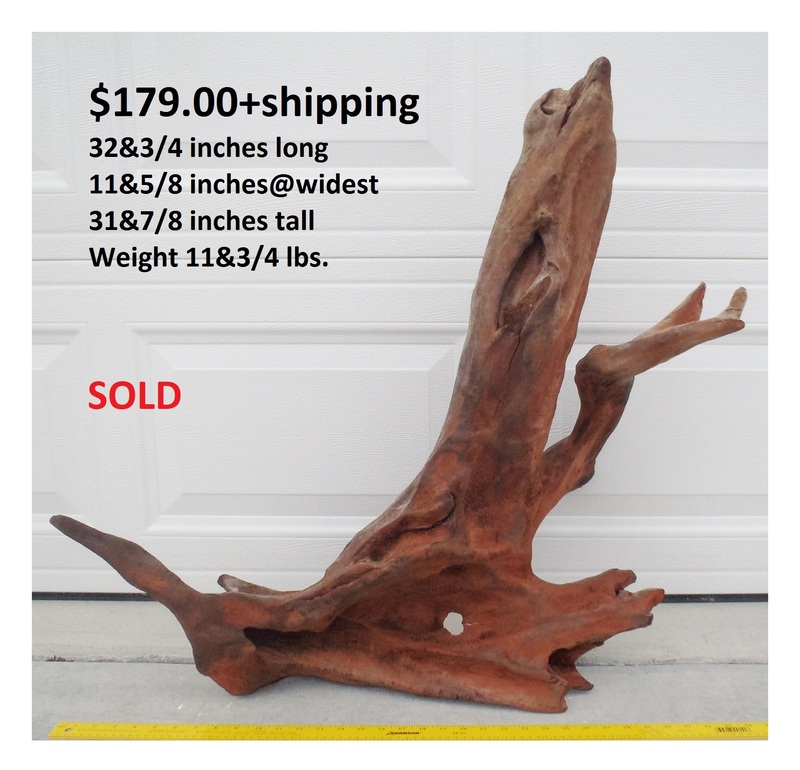 Approximate Upright Dimensions: 36 inches long - 16&3/4 inches wide - 18&1/8 inches tall - Weight 9&1/2 lbs. 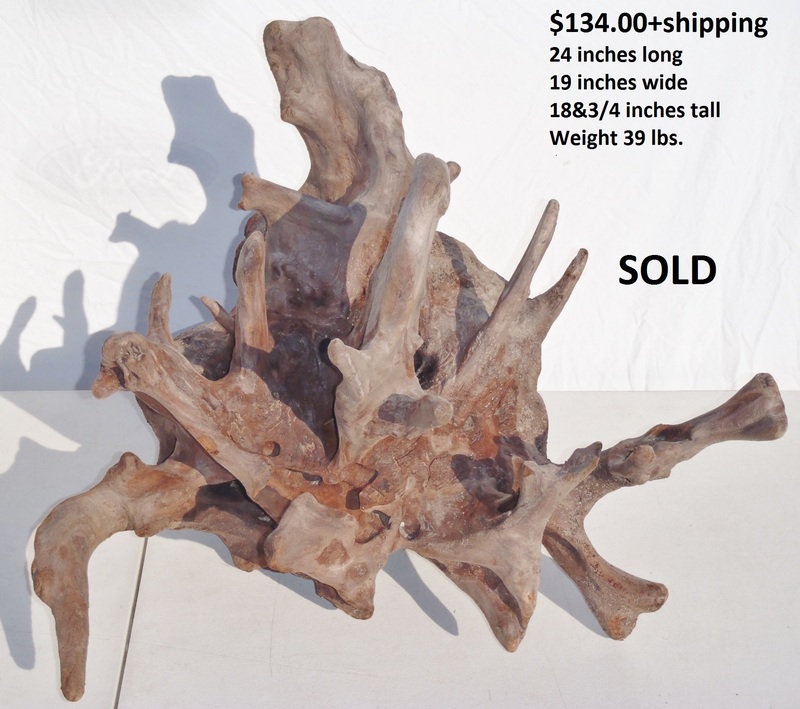 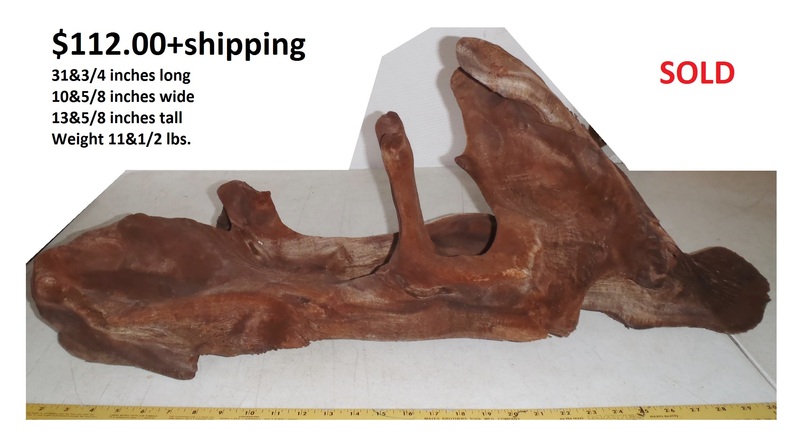 Approximate Upright Dimensions: 41&1/4 inches long - 20&1/4 inches wide - 13&7/8 inches tall - Weight: 12 lbs. 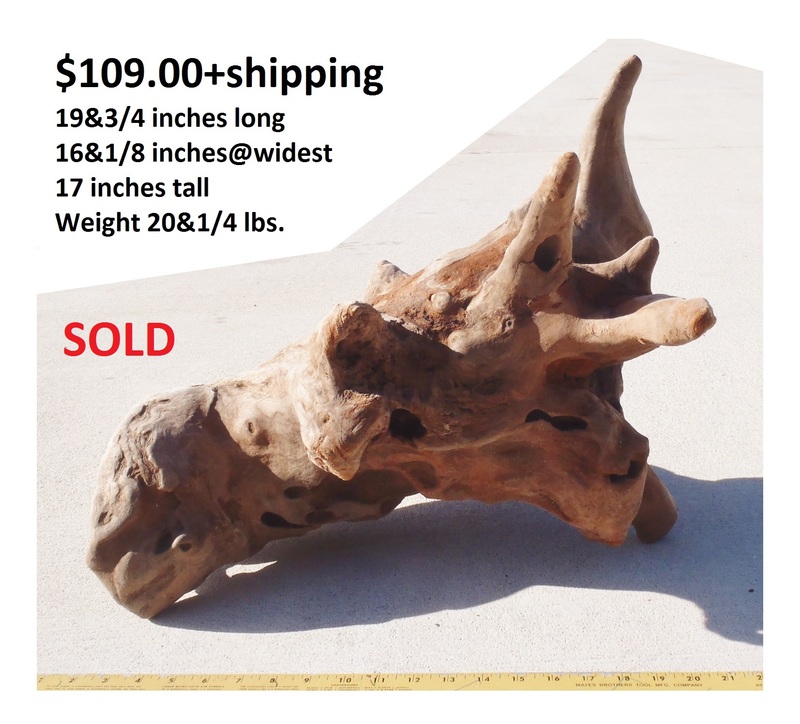 Approximate Upright Dimensions: 46&3/8 inches long - 18&7/8 inches wide - 18&1/4 inches tall - Weight 10 lbs. 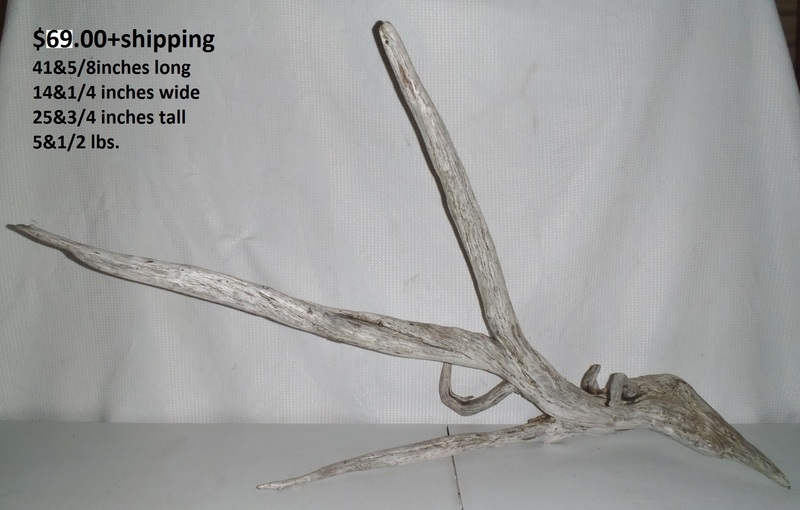 Approximate Dimensions: 28&1/4 inches long - 22 inches wide - 19 inches tall - Weight 34 lbs. 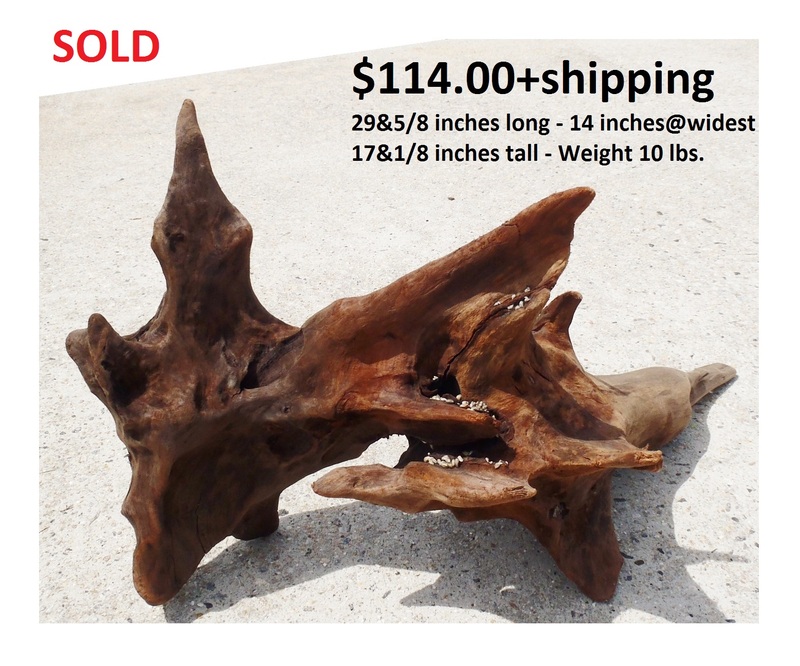 Approximate Dimensions: 26&1/2 inches long - 18&1/2 inches wide - 25&7/8 inches tall Weight 8 lbs. 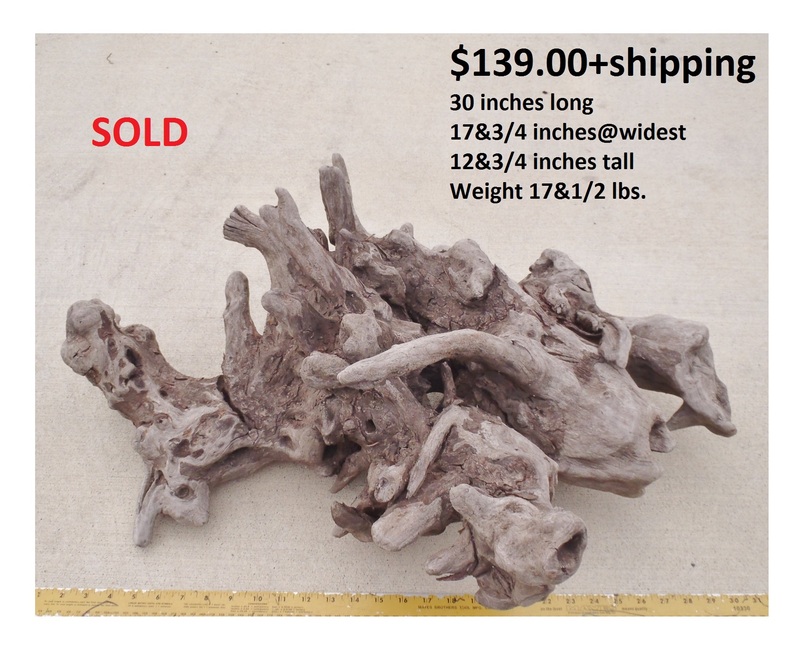 Dimensions: 29&1/2 inches long - 14&1/2 inches wide - 25&5/8 inches tall - Weight 13&1/4 lbs. 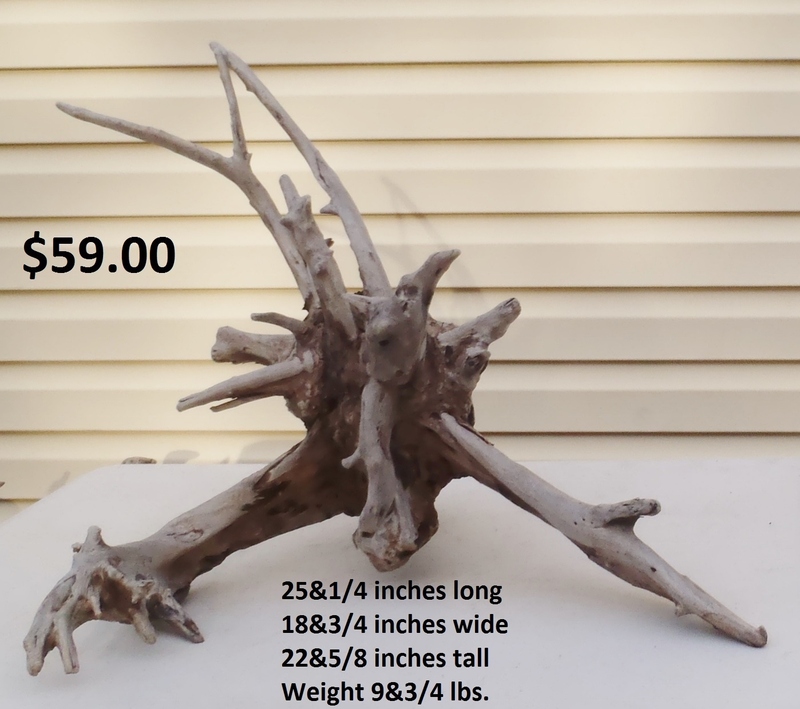 Dimensions: 28&3/4 inches long - 22&1/2 inches wide - 21 inches tall - Weight 15 lbs. 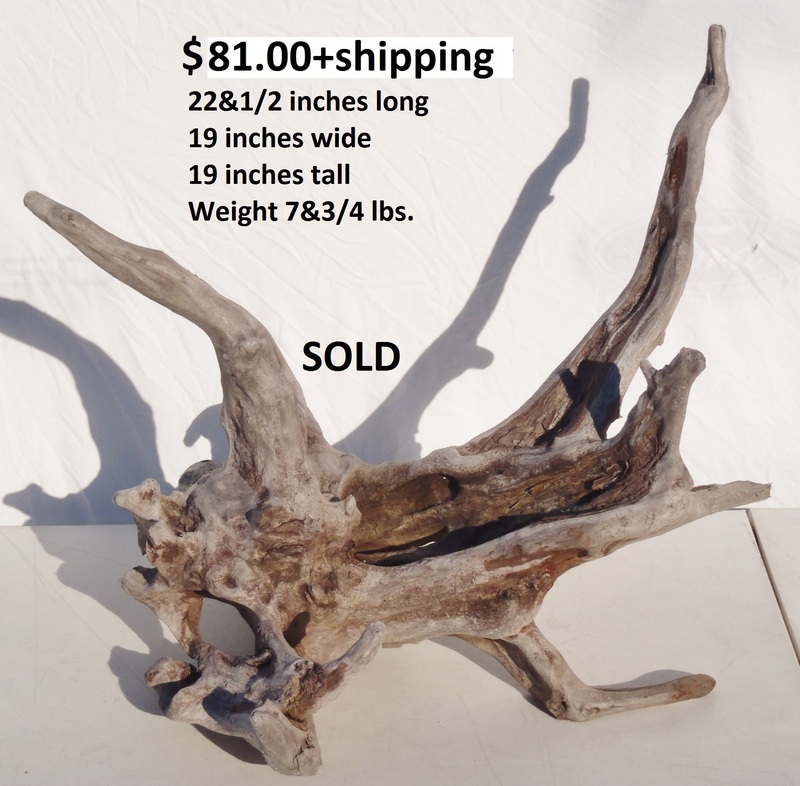 Dimensions: 23&3/4 inches long - 23 inches wide - 25&1/4 inches tall - Weight 14 lbs. 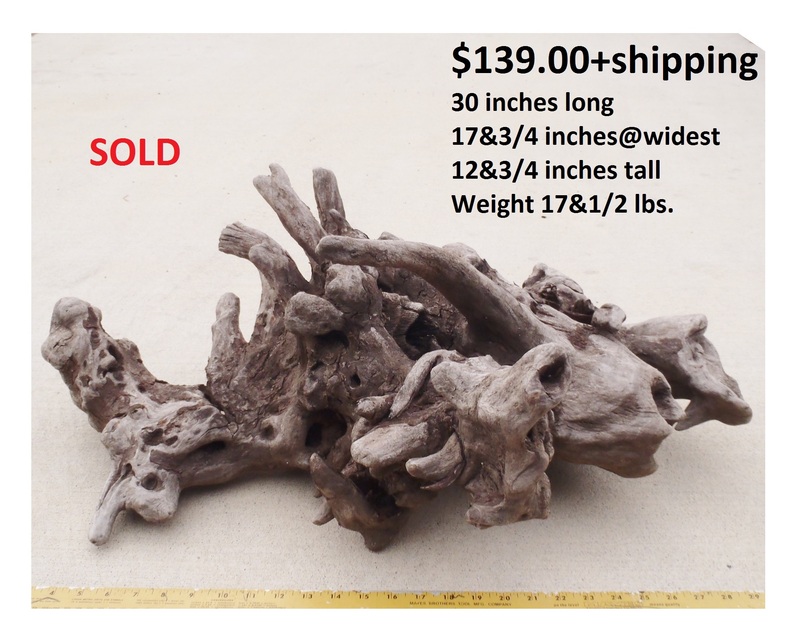 Approximate Dimensions: 34&1/4 inches long - 23&1/8 inches wide - 13&3/4 inches tall - Weight 9&1/4 lbs. 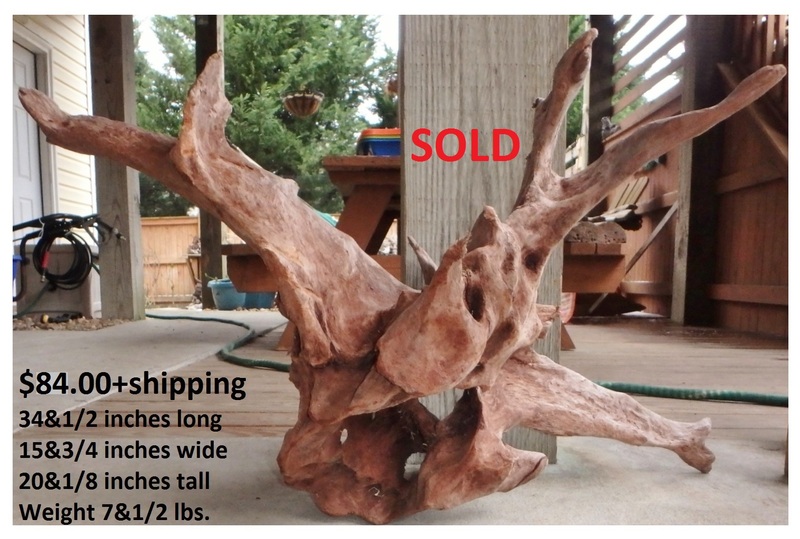 Approximate Dimensions: 37&7/8 inches long - 18&3/8 inches wide - 16 inches tall - Weight 7&3/4 lbs. 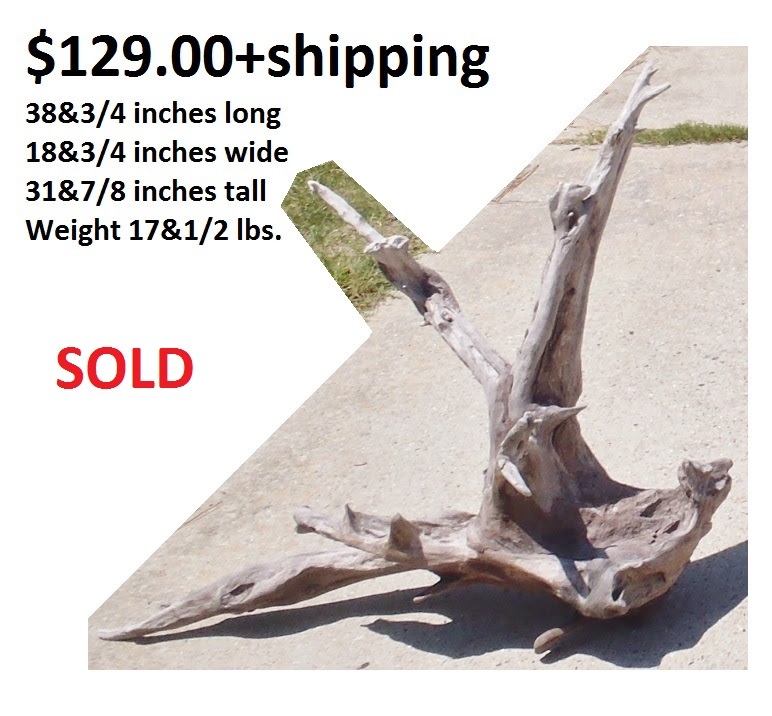 Approximate Dimensions: 27 inches long - 21 inches wide - 20&1/8 inches tall - Weight 12 lbs. 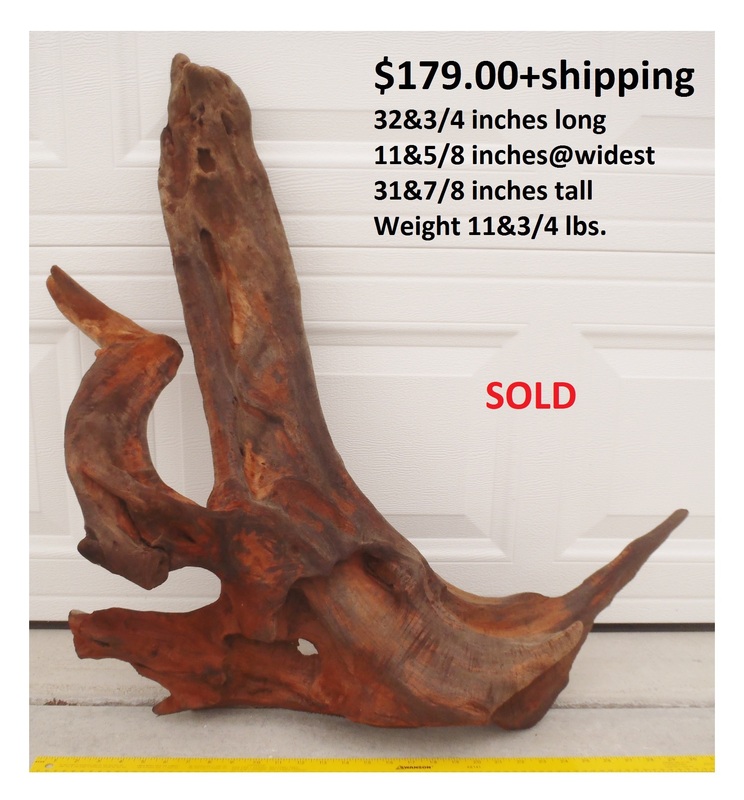 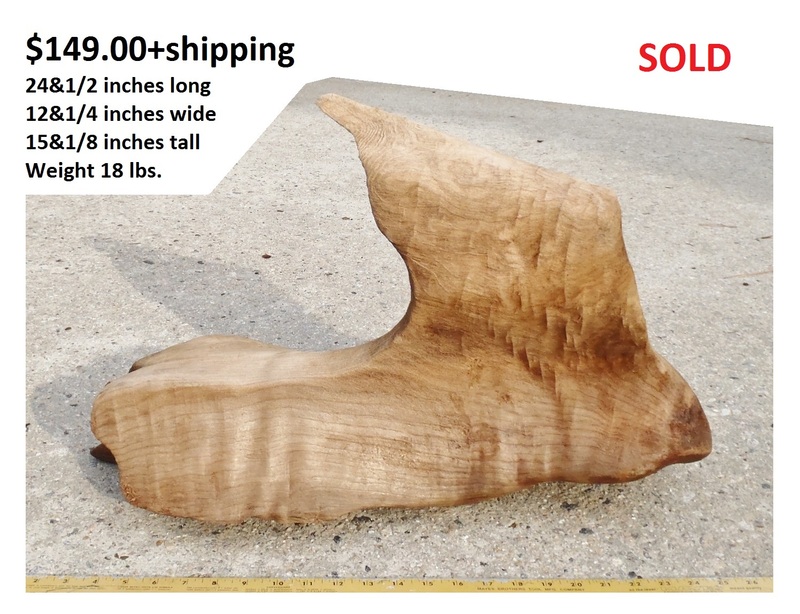 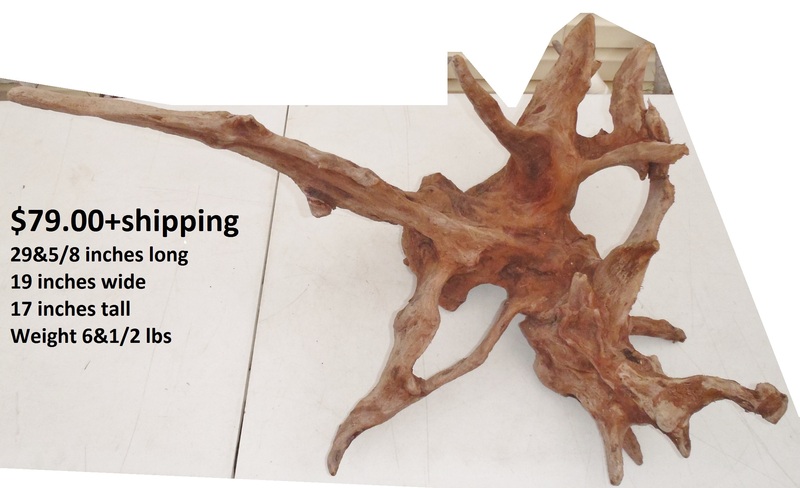 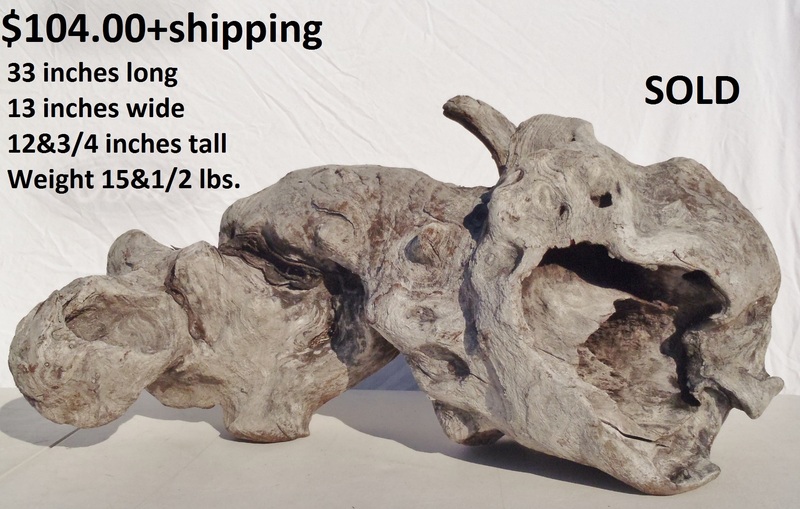 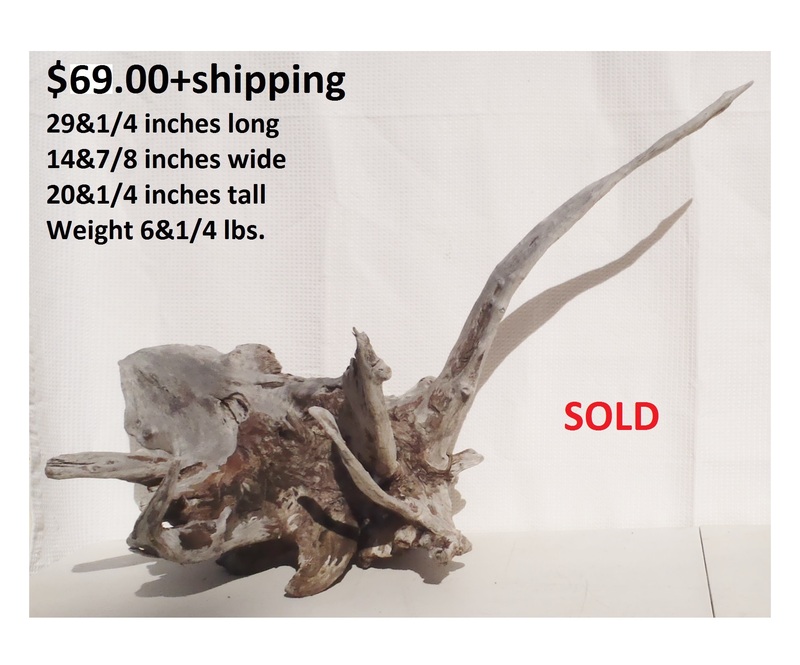 "THE BUFFALO" Dimensions: 40 inches long - 27 inches wide - 13&1/2 inches tall - Weight: 15 lbs.